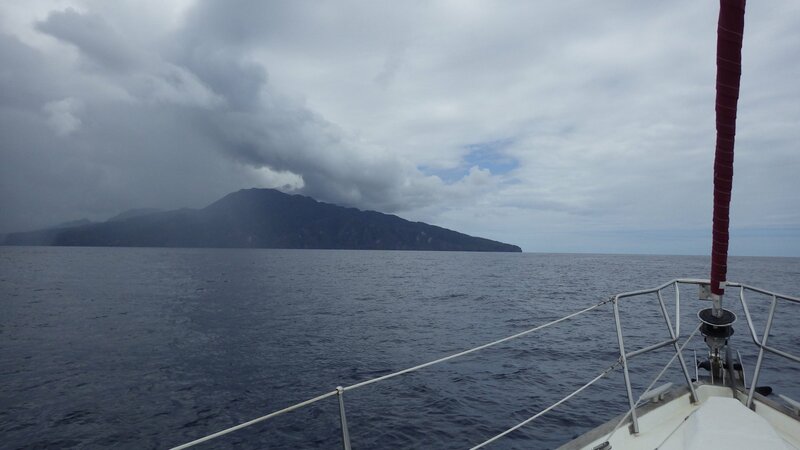 Moving south along the Leeward Islands chain. 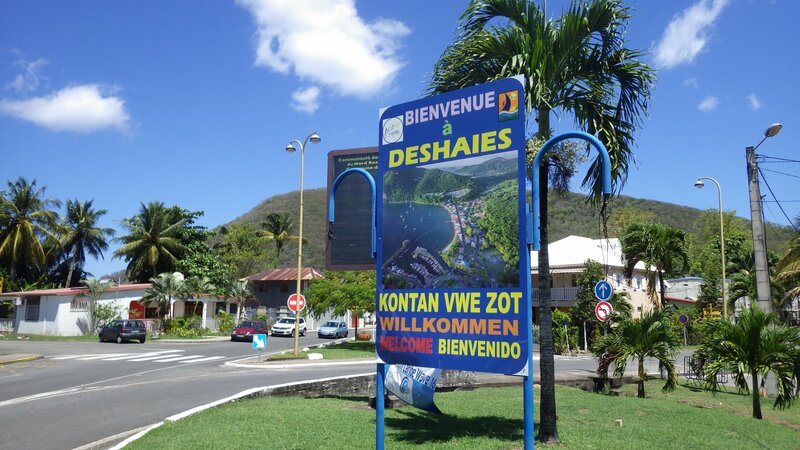 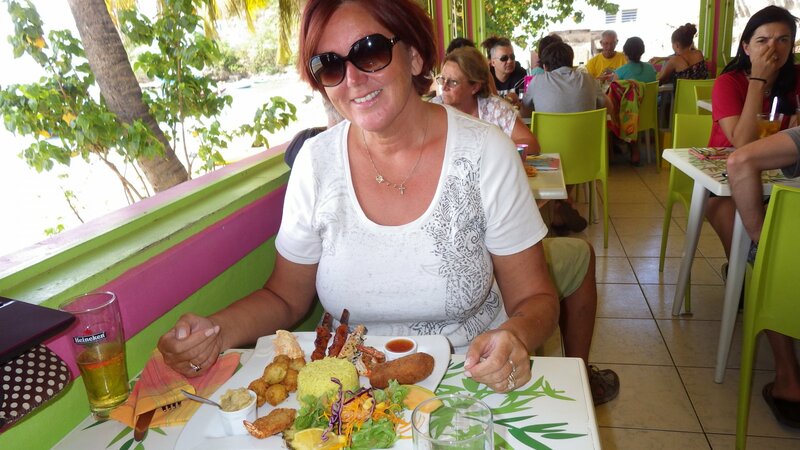 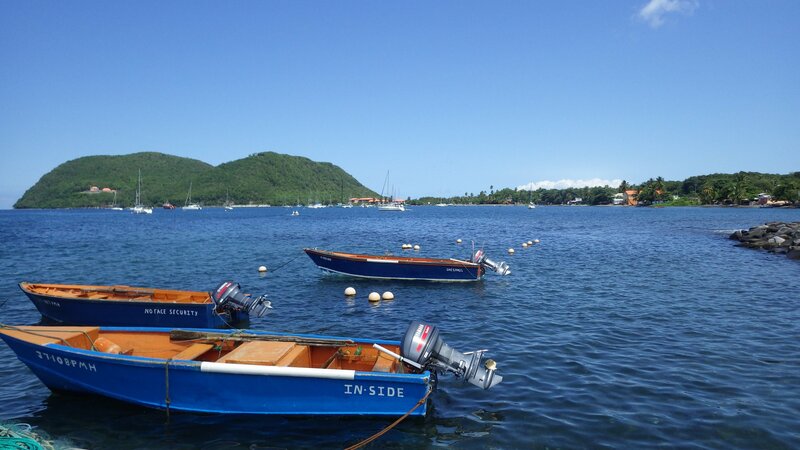 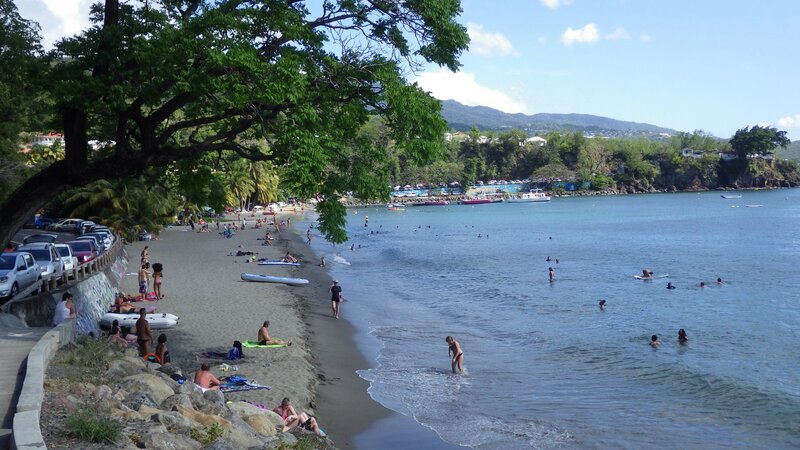 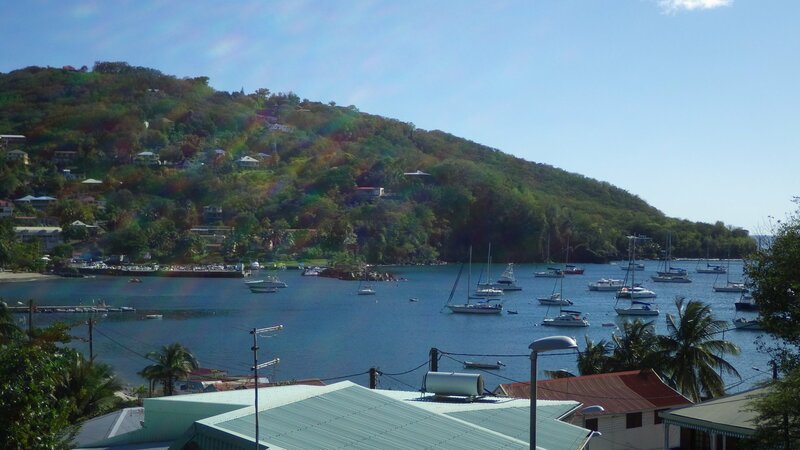 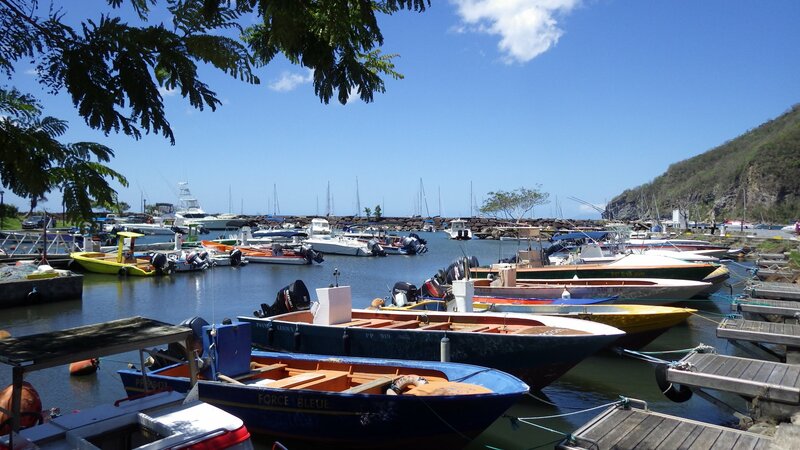 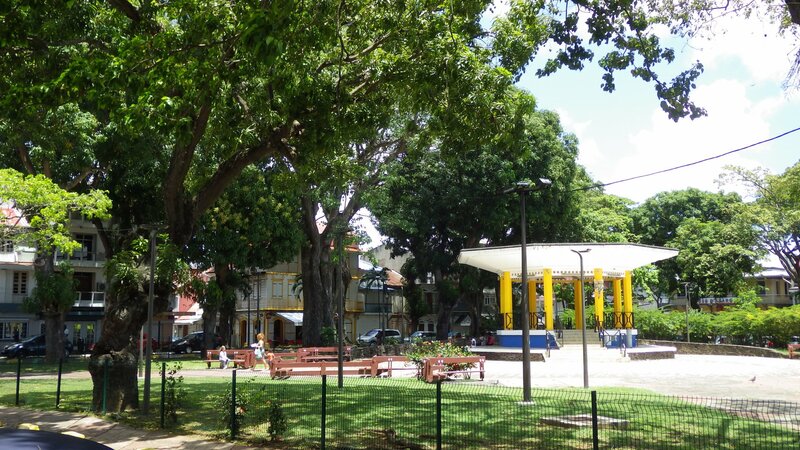 Our first port of call in French speaking Guadeloupe was Deshaies, on the island's northwest shore. 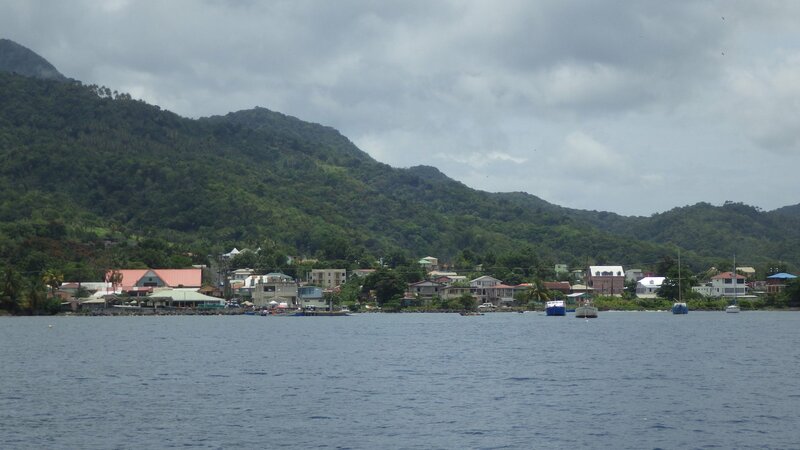 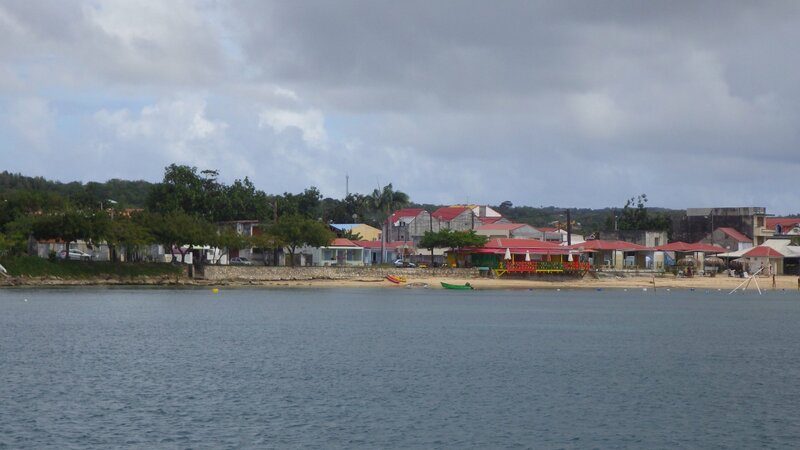 The bay is very picturesque and the village is pretty and inviting. 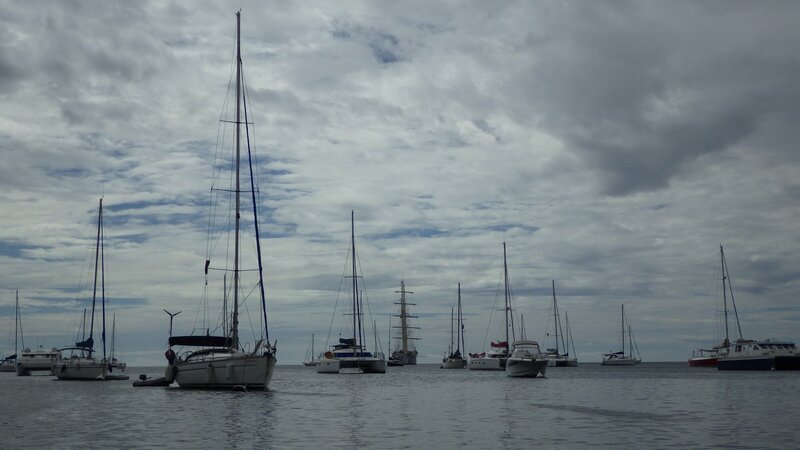 Although the anchorage is very crowded. 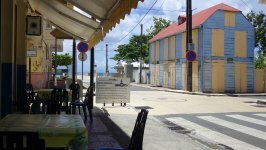 We stayed several days here, resting from the passage, strolling the town streets, hiking nearby areas and tasting French cuisine. 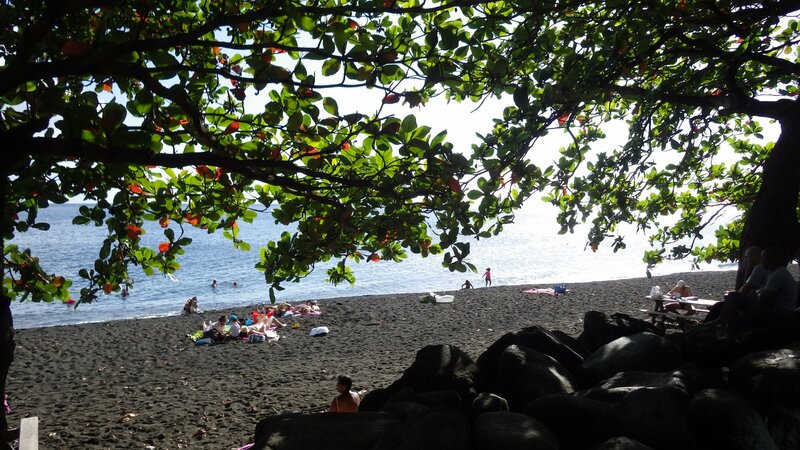 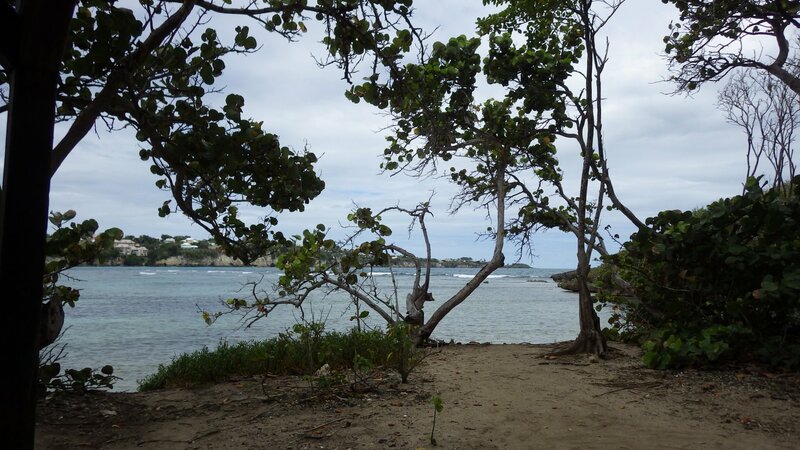 We had a pleasant brief stop on the black sand beach near Pigeon Island Bay. 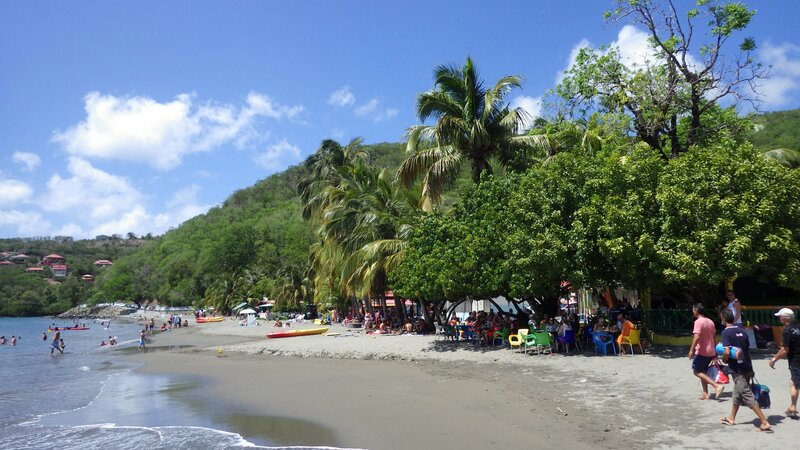 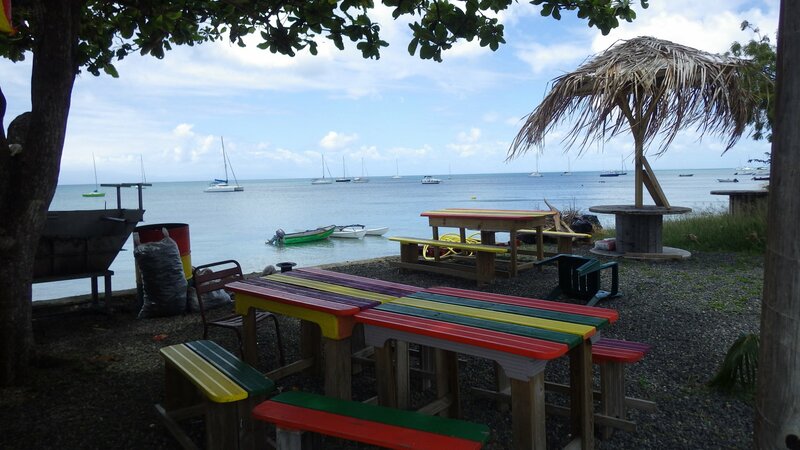 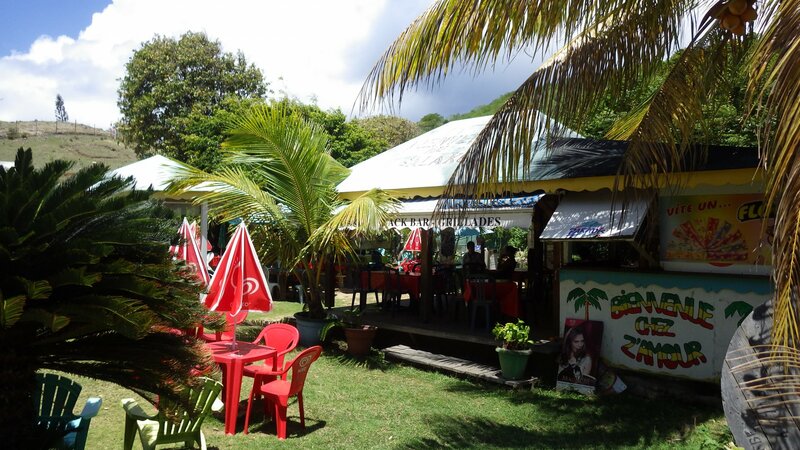 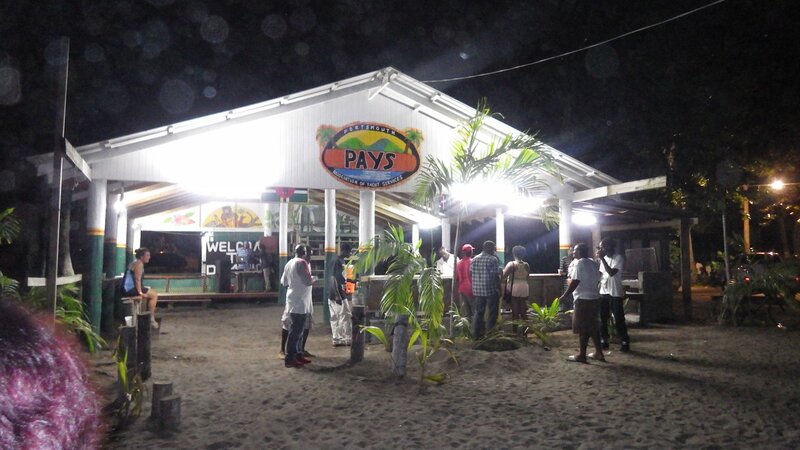 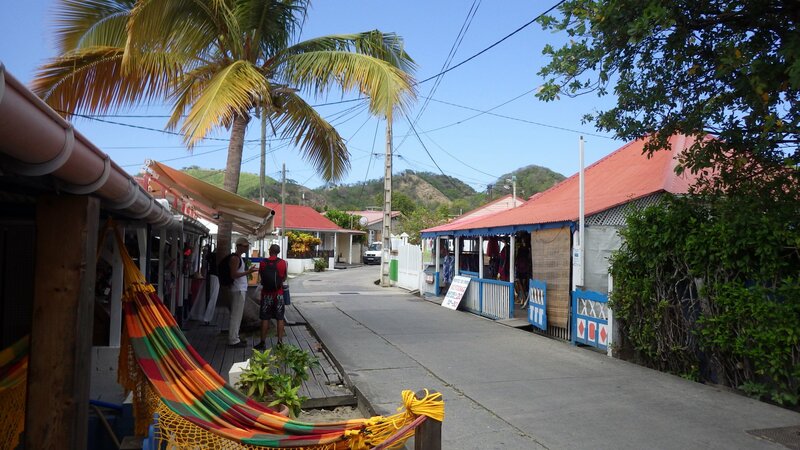 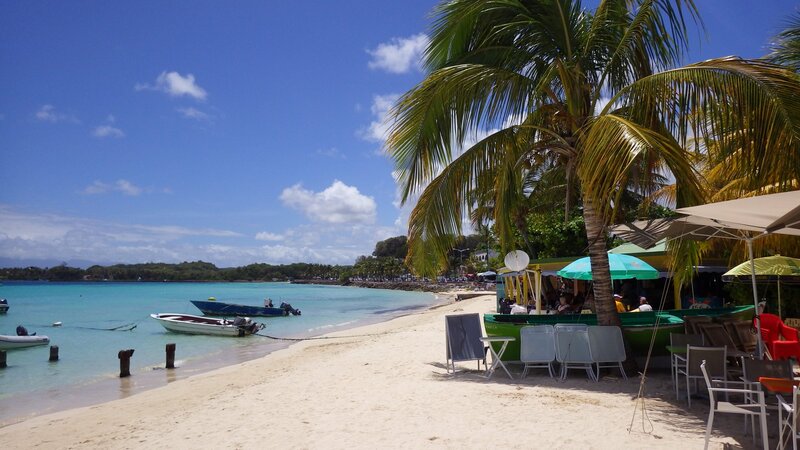 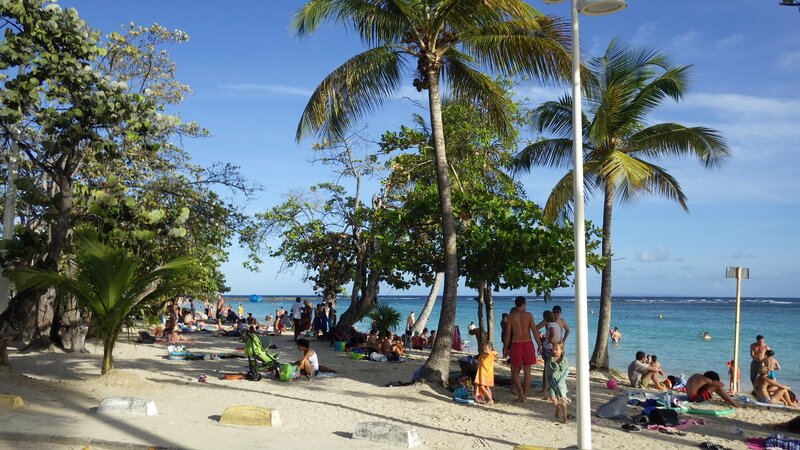 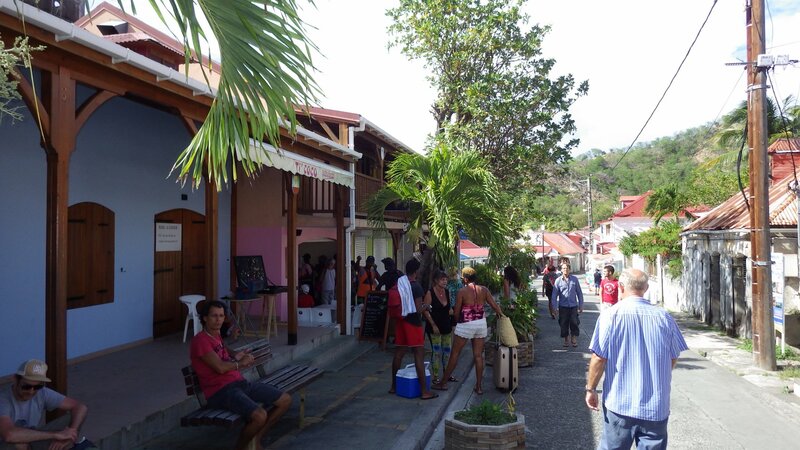 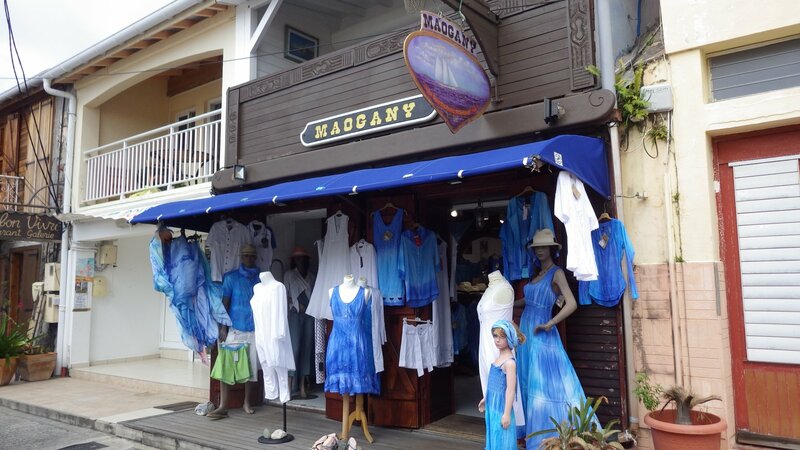 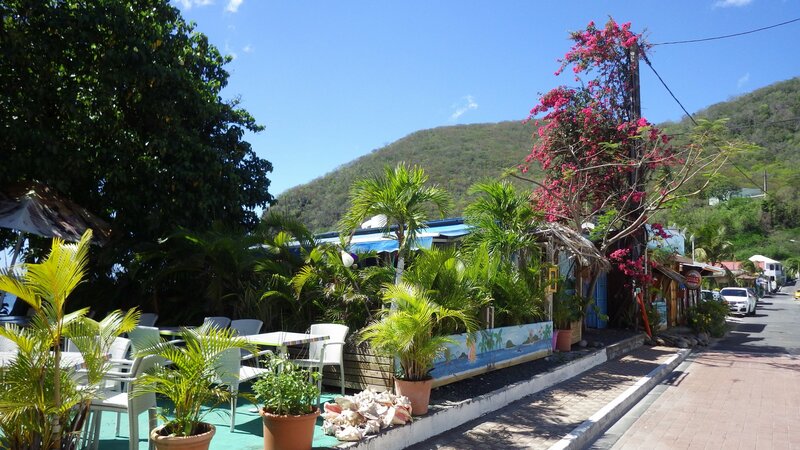 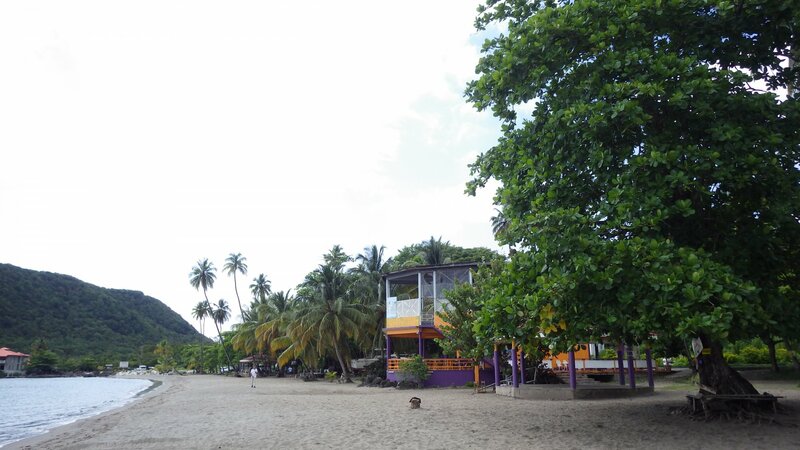 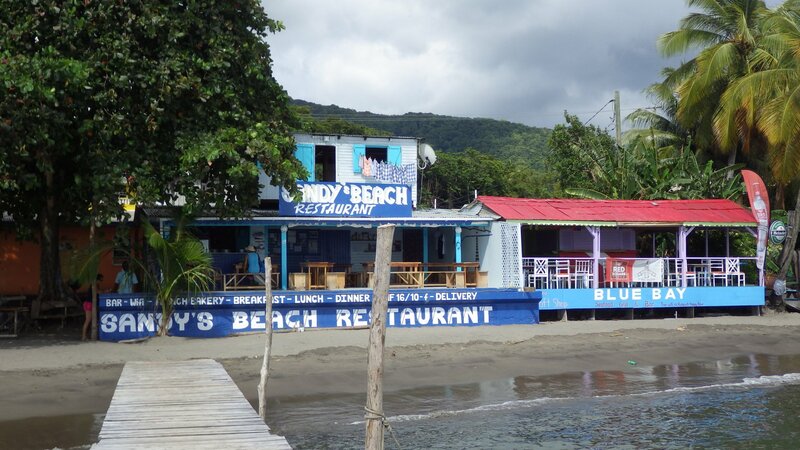 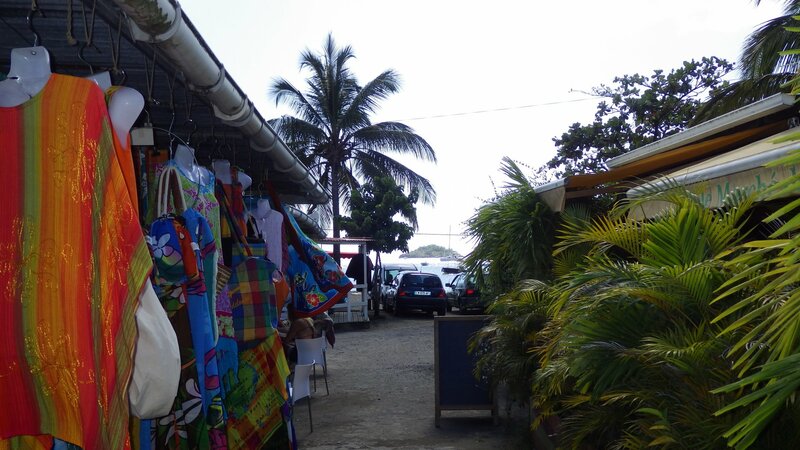 The bay is lively and popular, with lots of small beach side restaurants and shops. 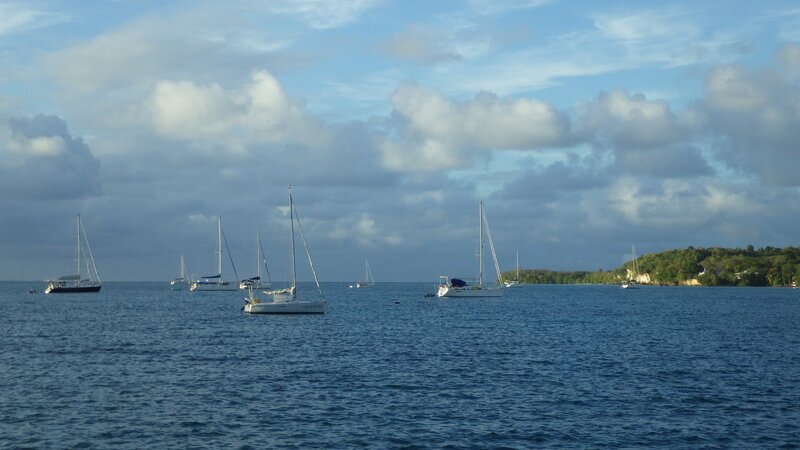 Unfortunately, the anchorage here is very rolly and our yacht was rocking badly. 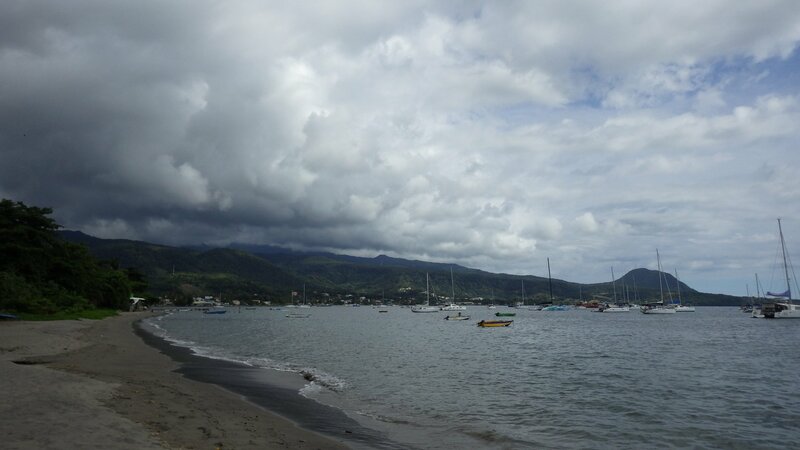 So after having a tasty lunch and walking the beach, we have decided not to stay overnight and move on. 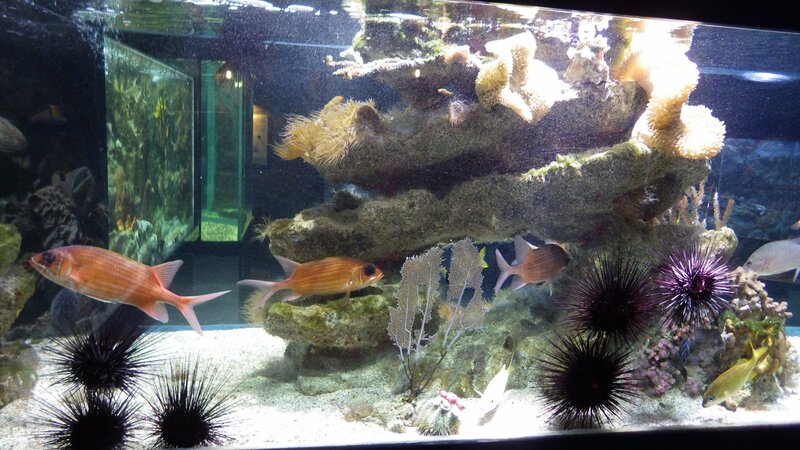 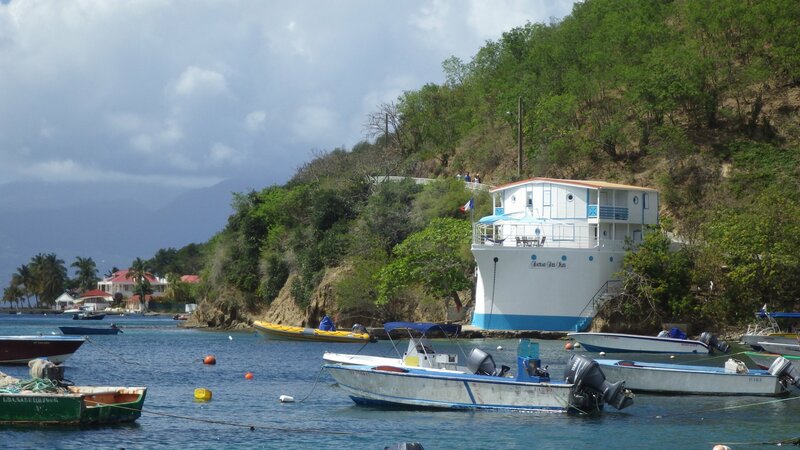 We wished to take an excursion to the nearby Pigeon Island Marine Reserve inside a glass bottom boat, but I hope we will do it next time we visit this place. 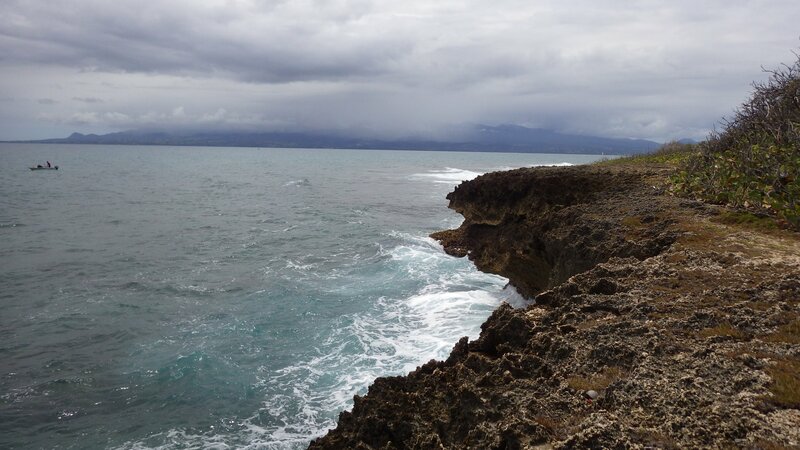 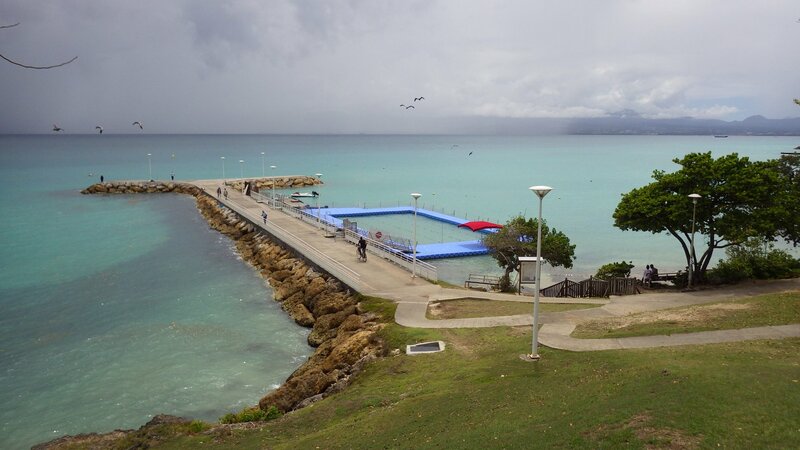 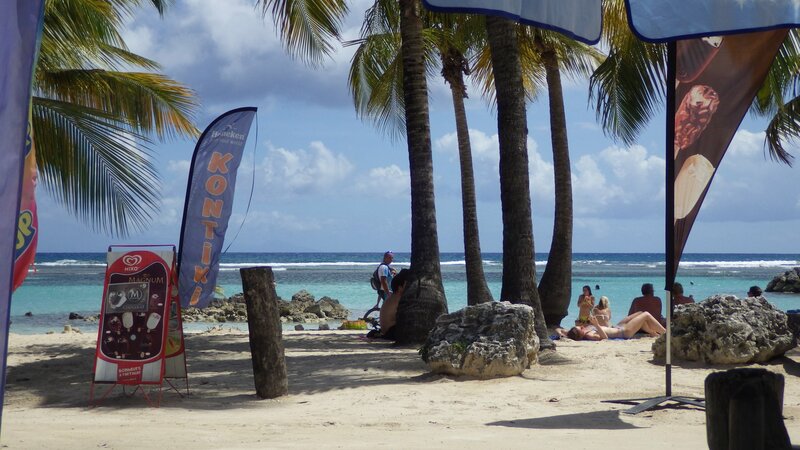 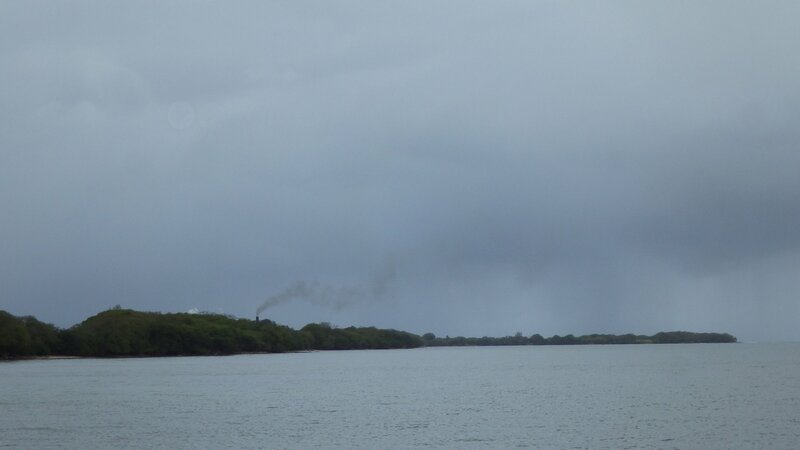 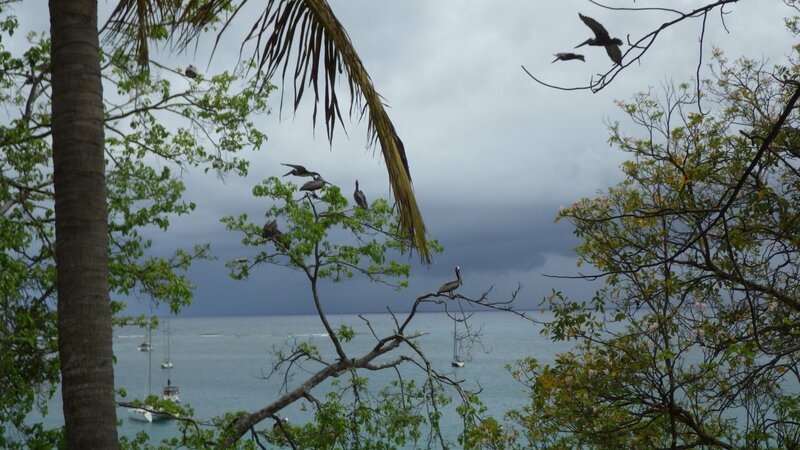 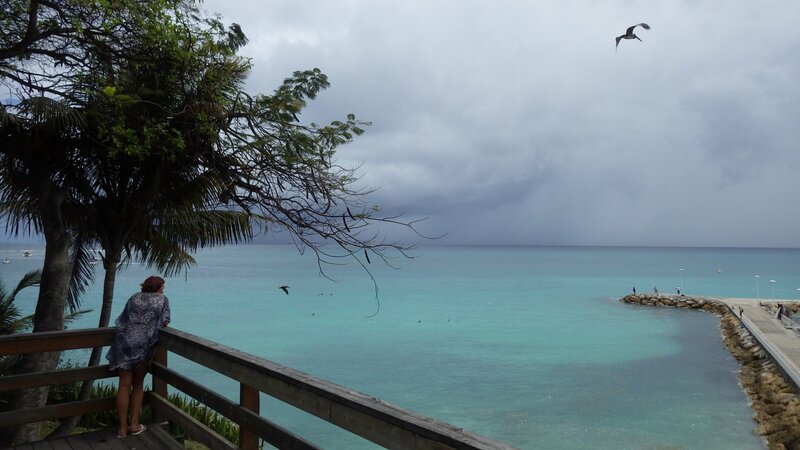 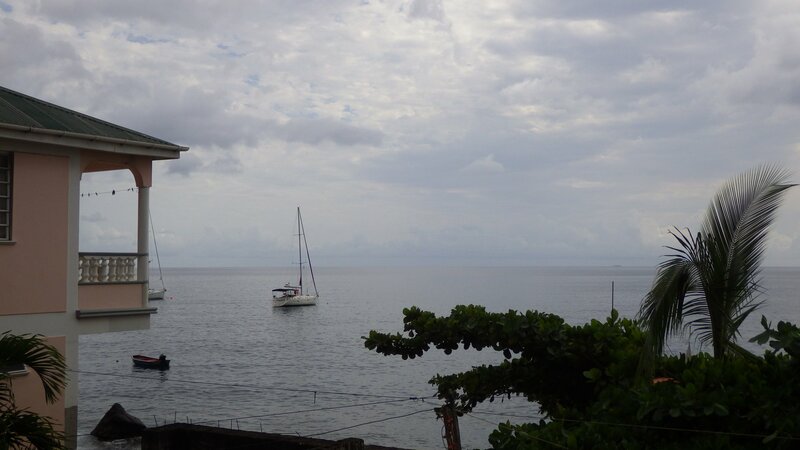 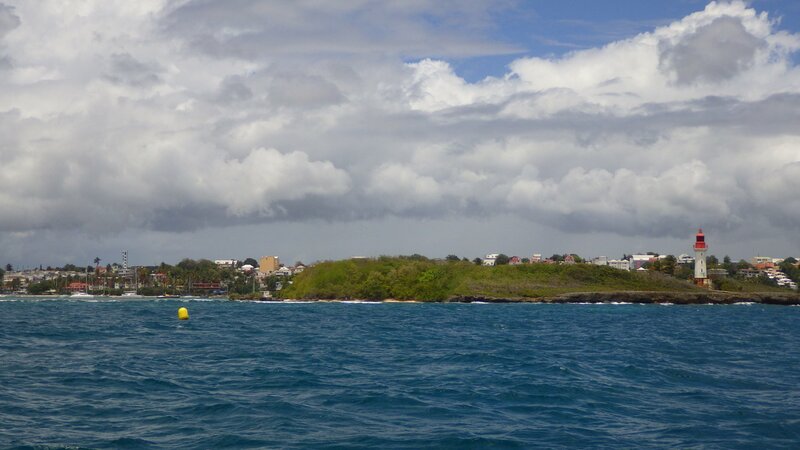 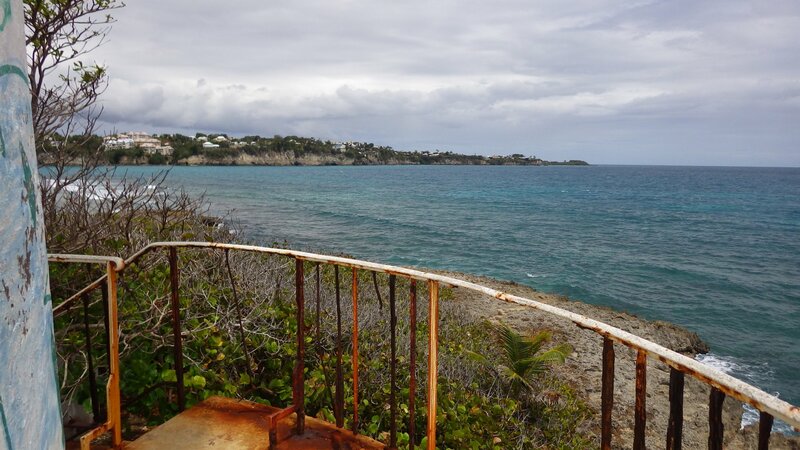 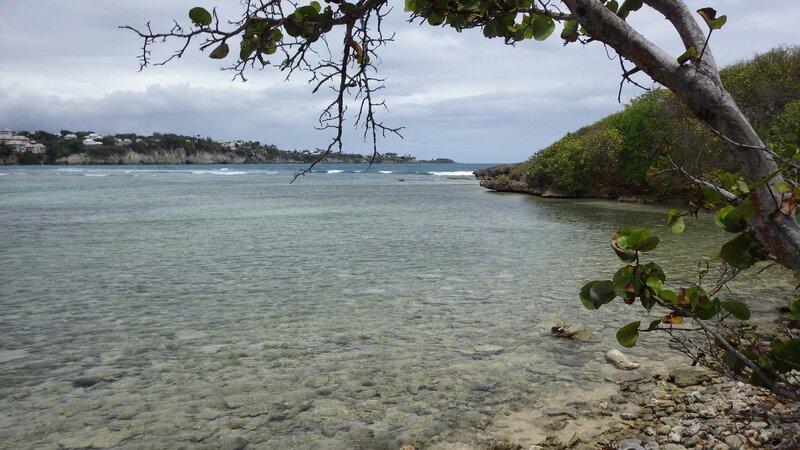 This is supposed to be a small sheltered bay to anchor when the swell is coming around the west coast of Guadeloupe. 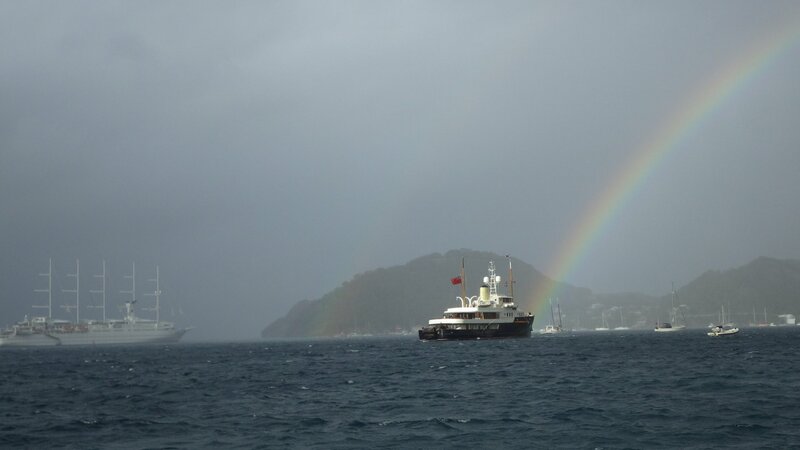 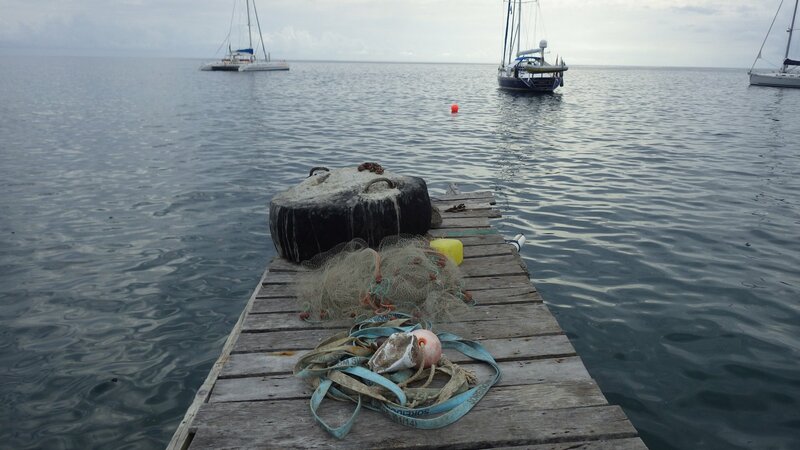 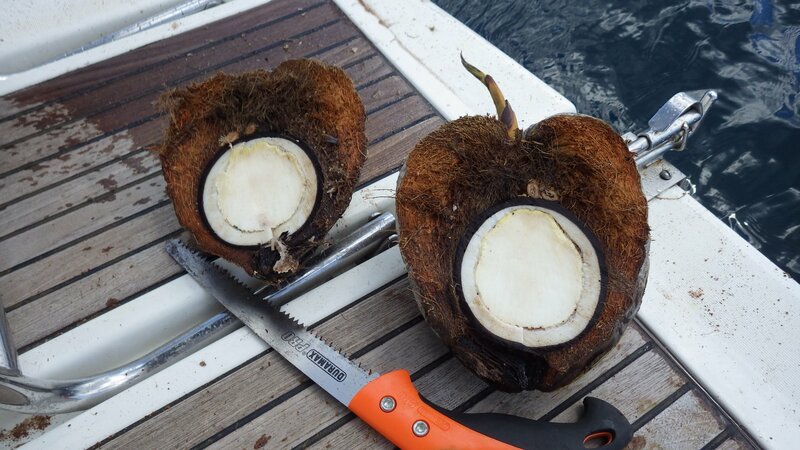 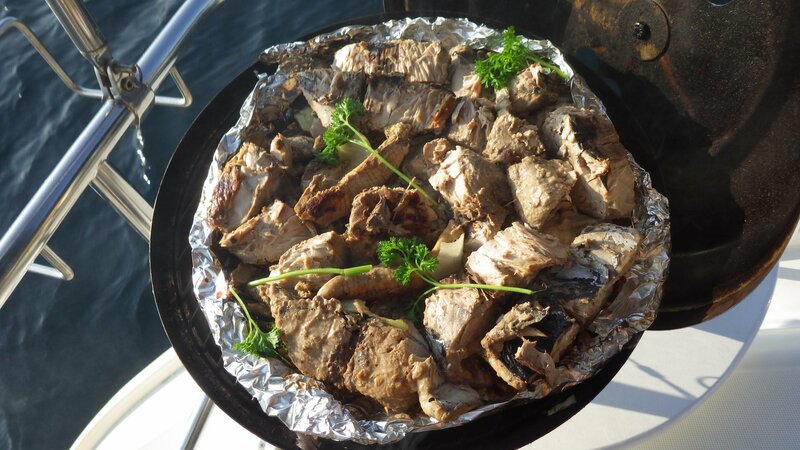 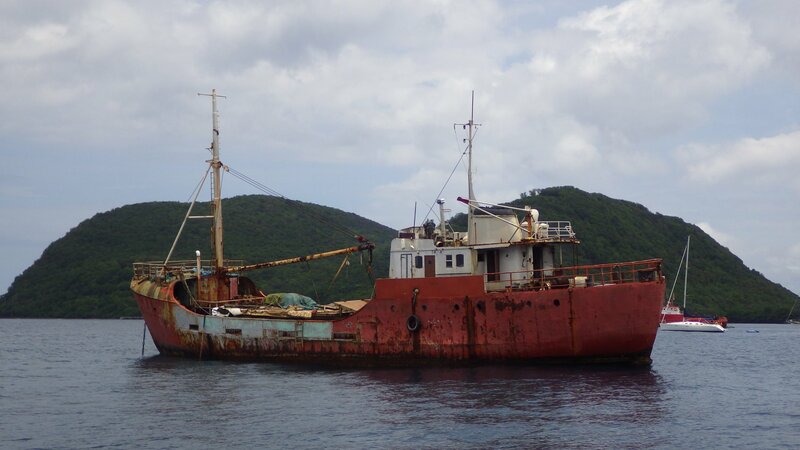 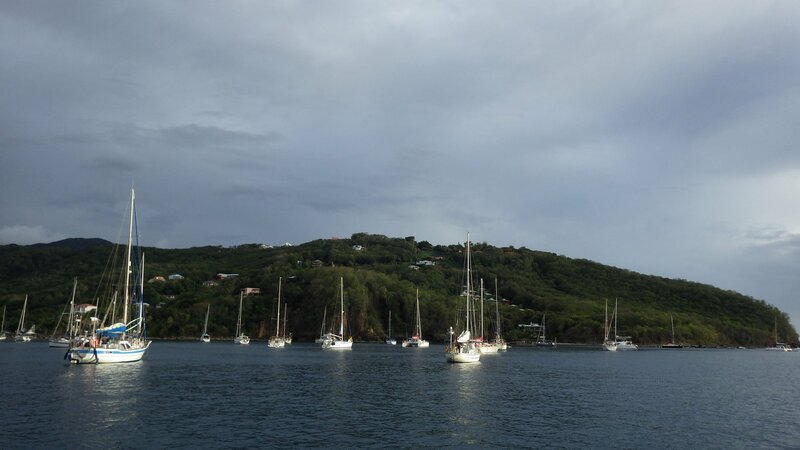 When we arrived, it was full with local and cruising boats, private mooring buoys and fishing traps. 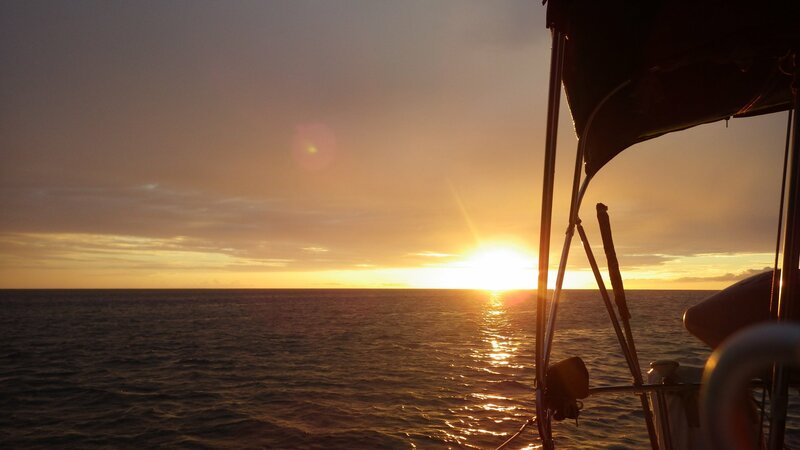 With sunset approaching, we had no time to move to a better place and had to anchor outside of the bay in the open, exposed to wind and swell. 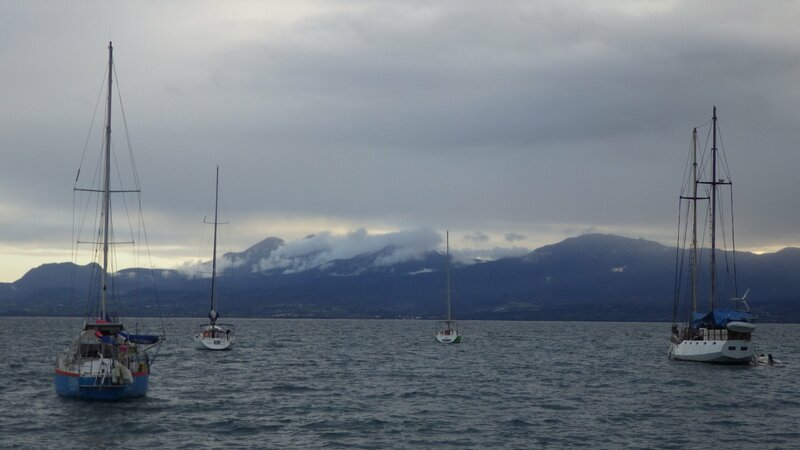 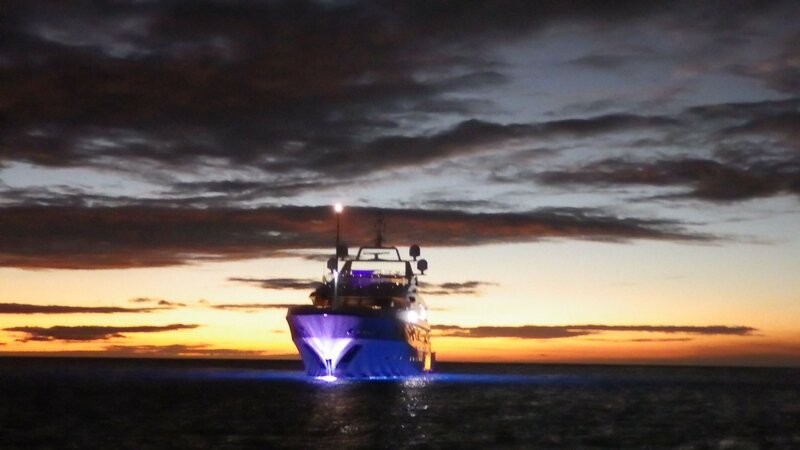 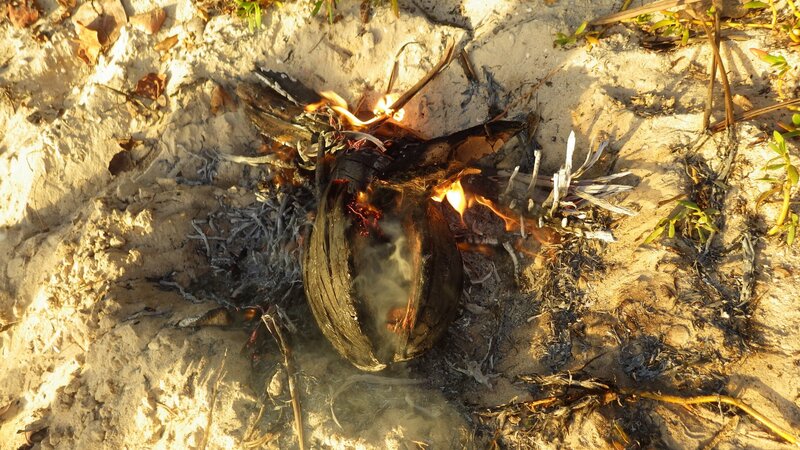 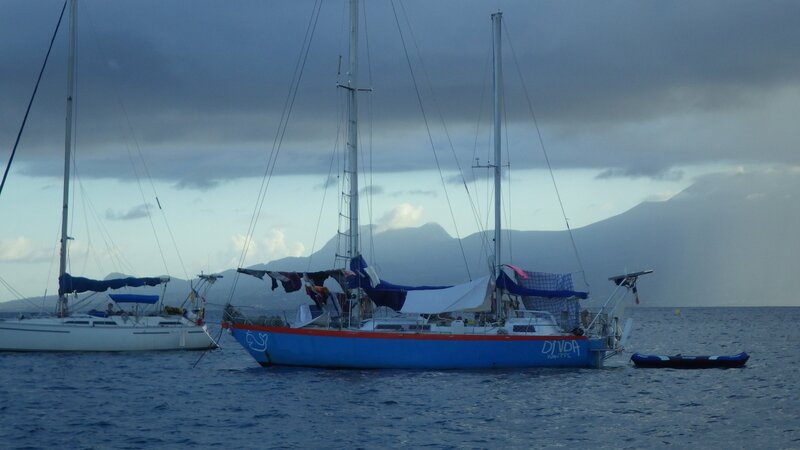 Because the wind coming from the mountains swirls in wild gusts from different directions, and because the water was deep, we would not be able to successfully deploy an anchor bridle or a secondary stern anchor to deal with the rolly conditions � so we had an unpleasant night. 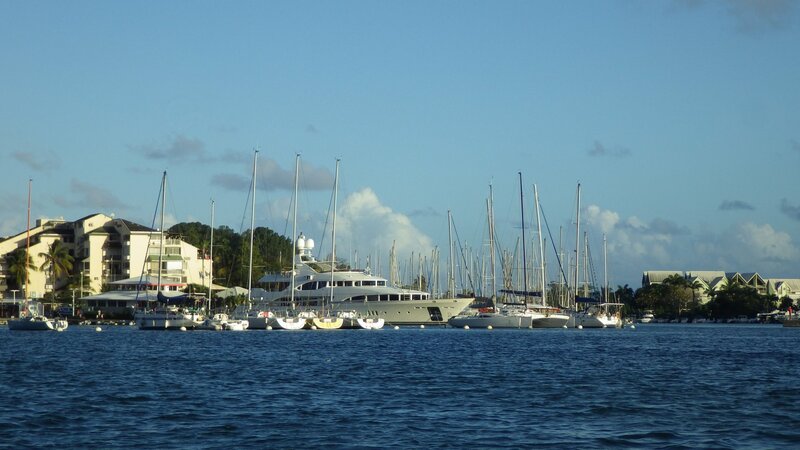 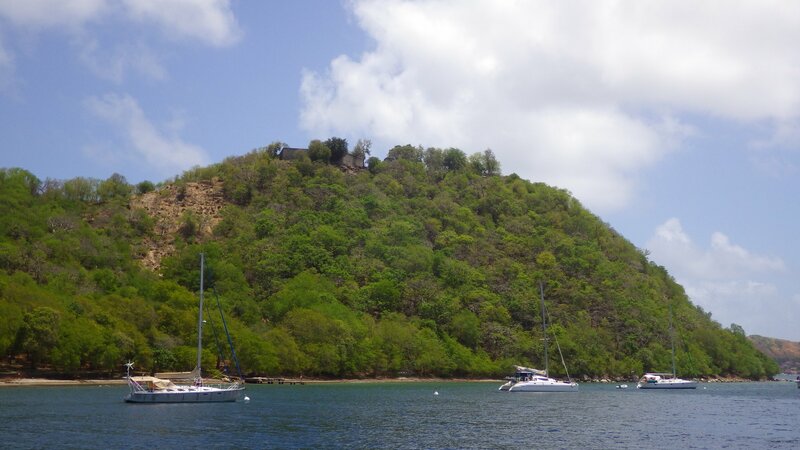 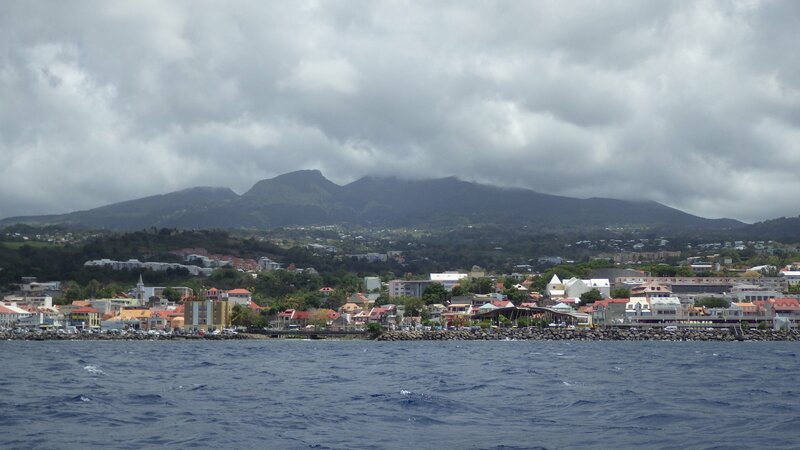 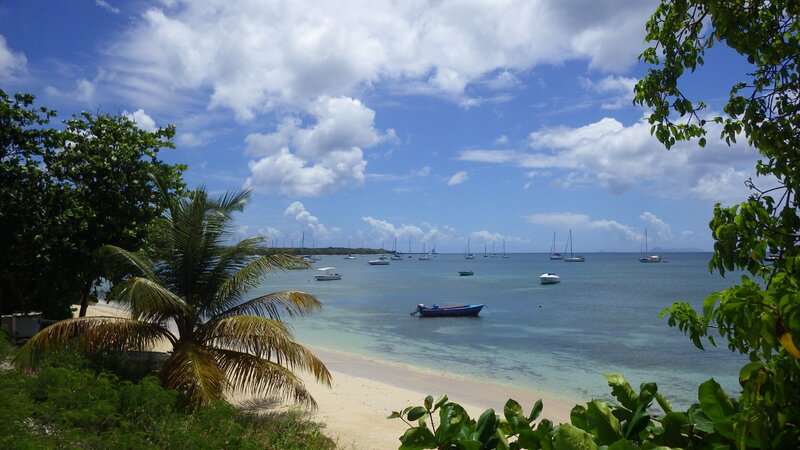 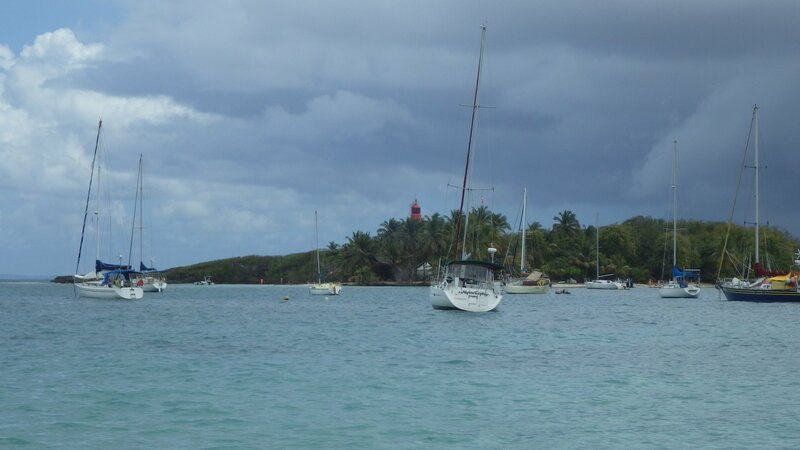 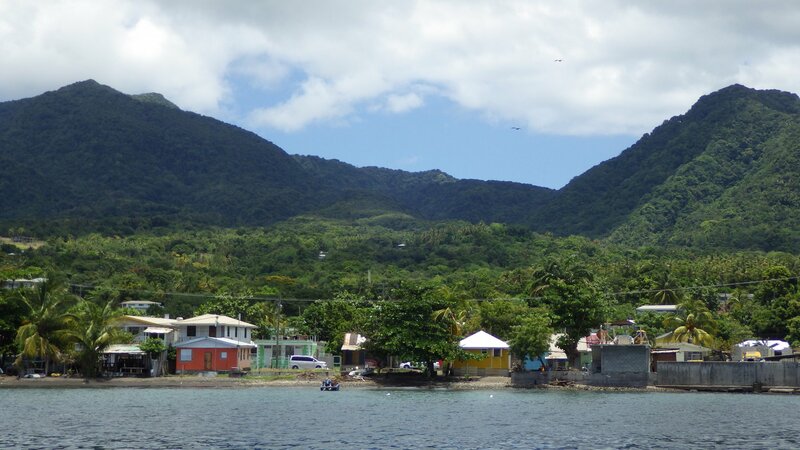 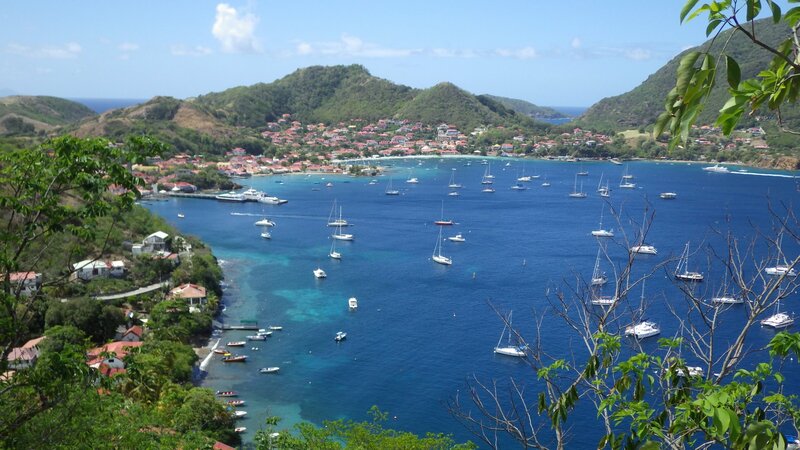 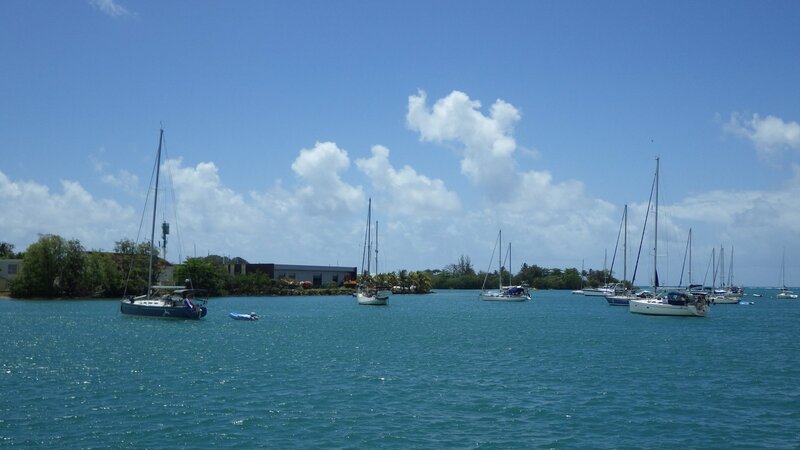 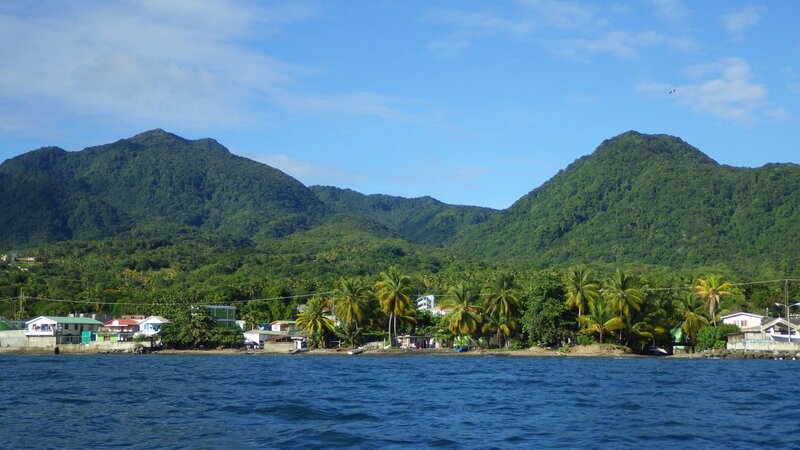 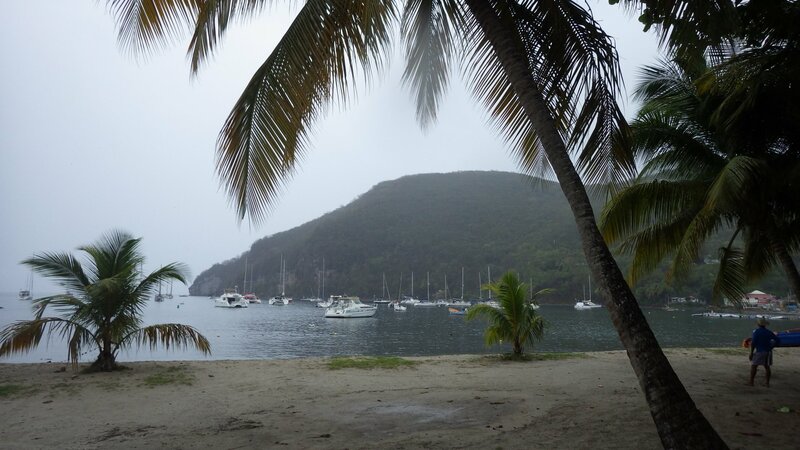 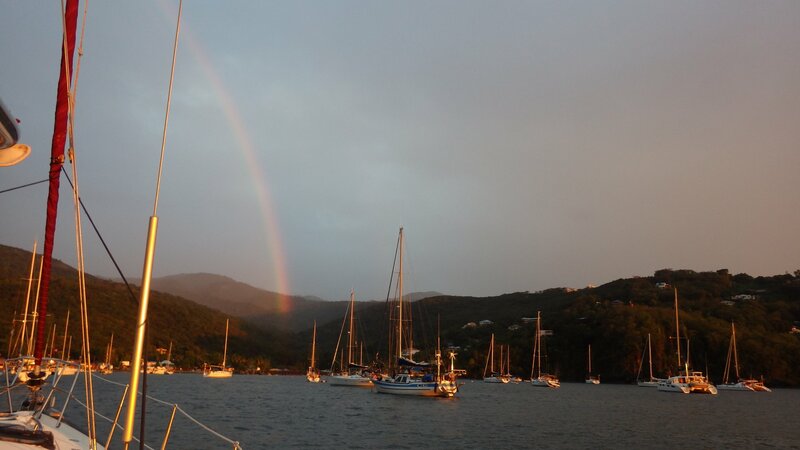 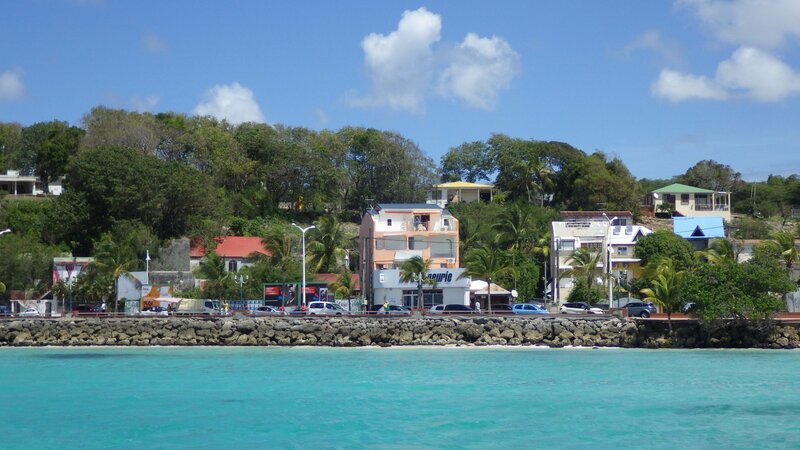 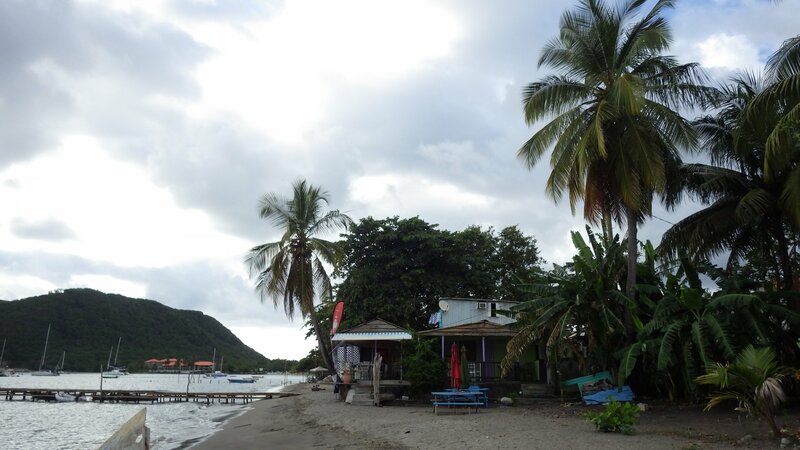 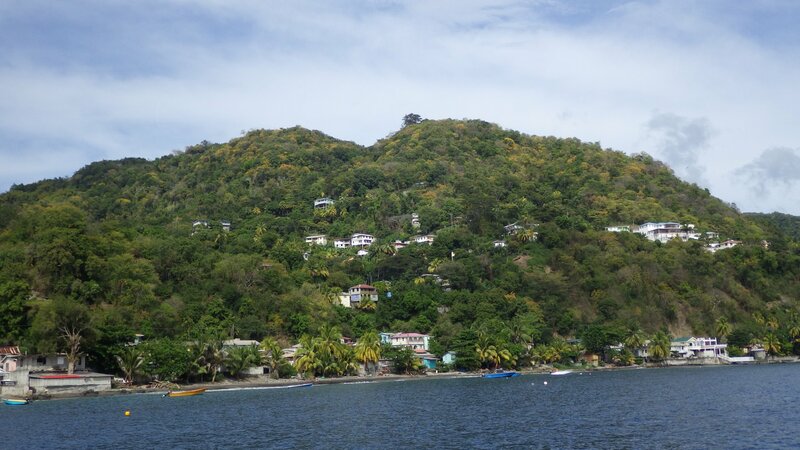 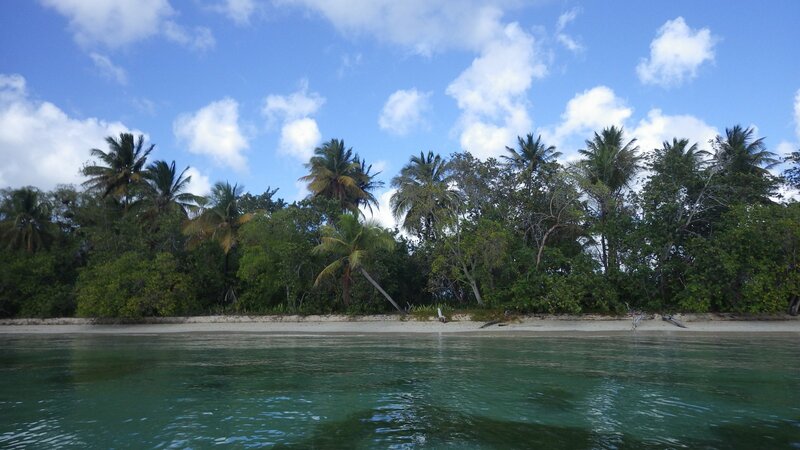 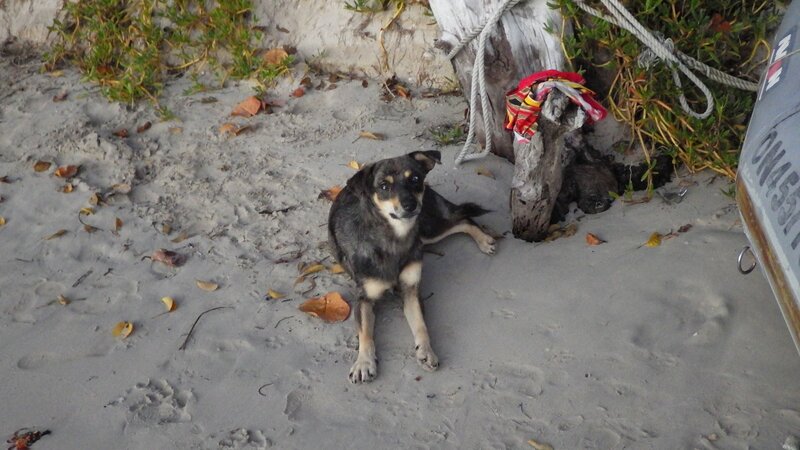 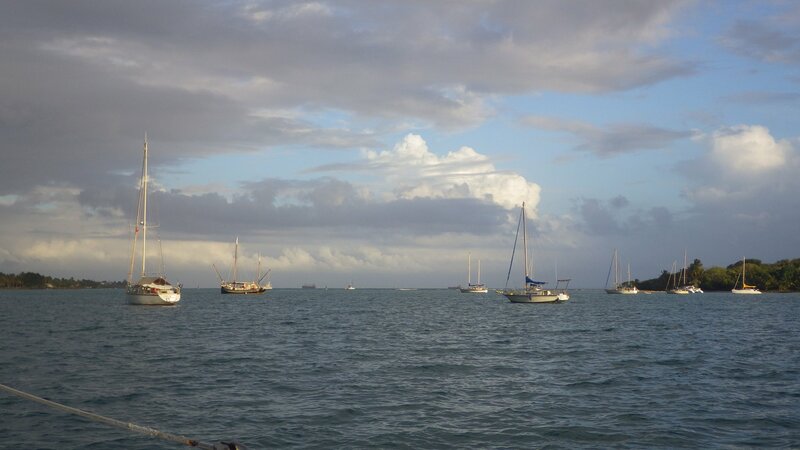 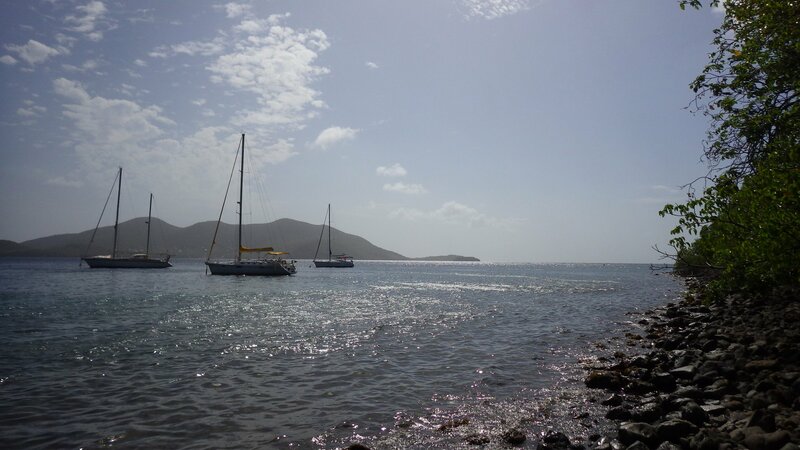 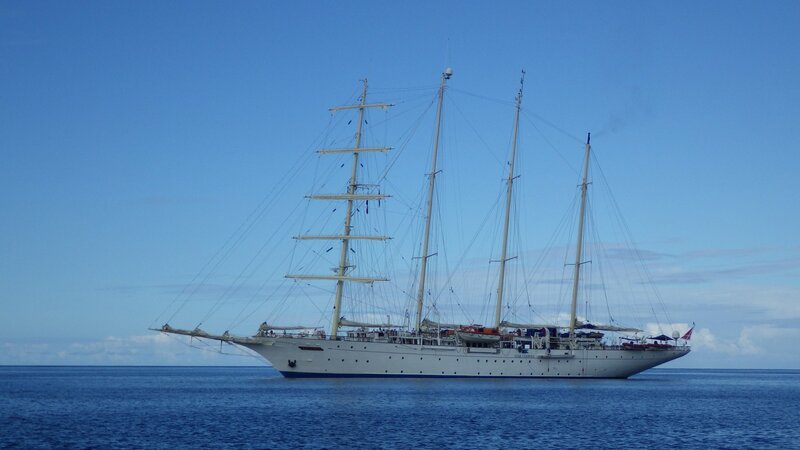 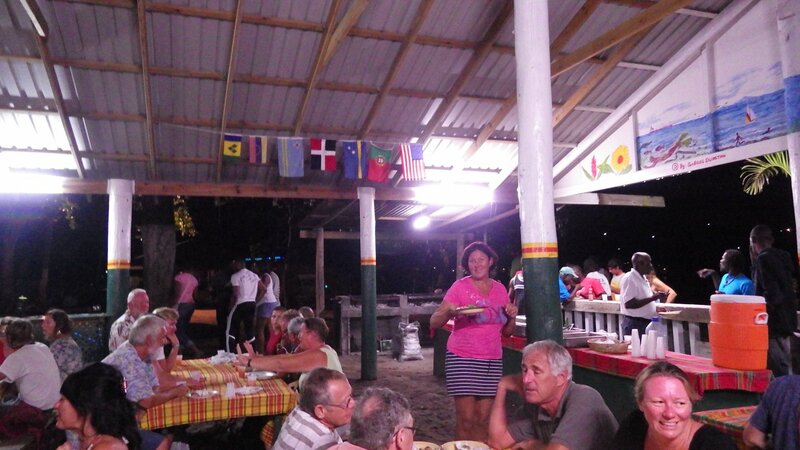 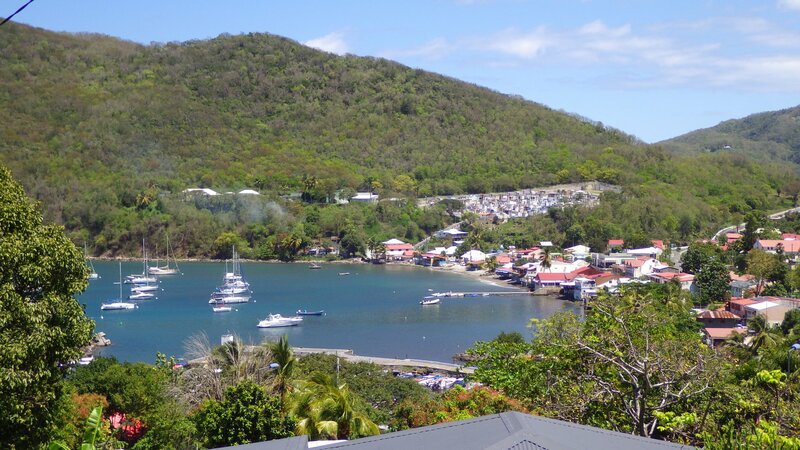 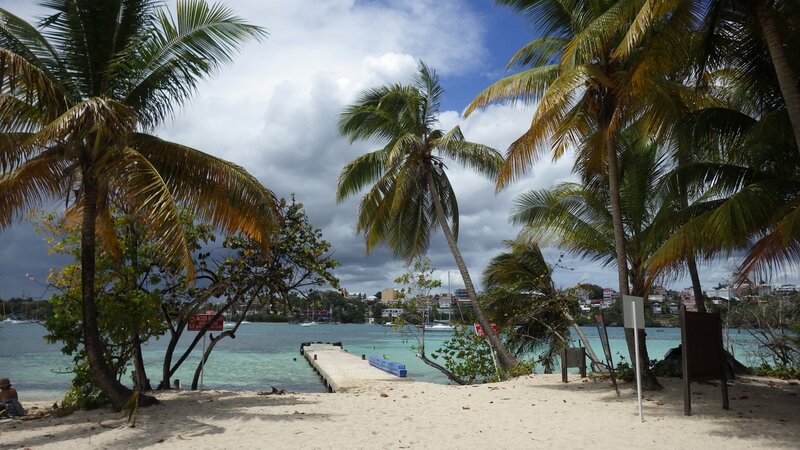 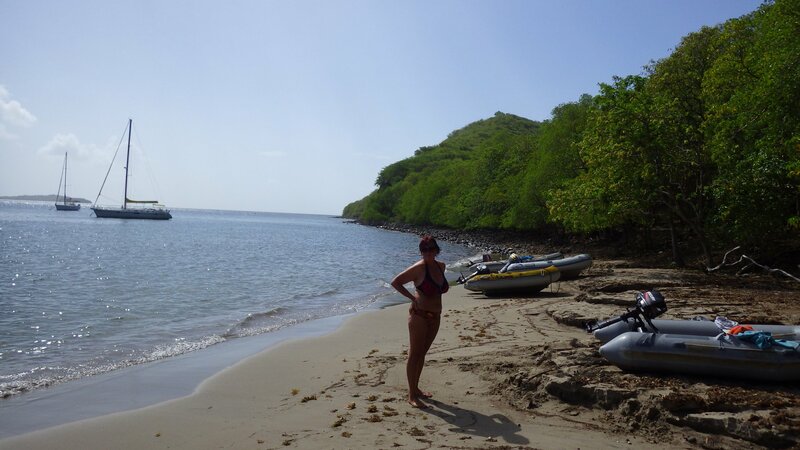 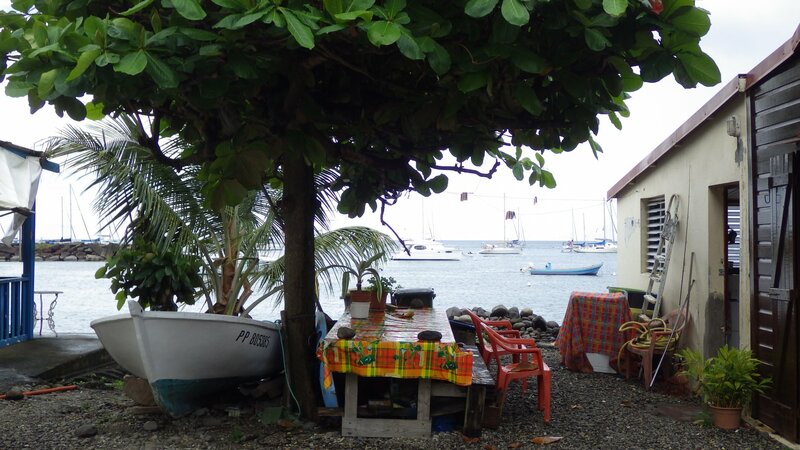 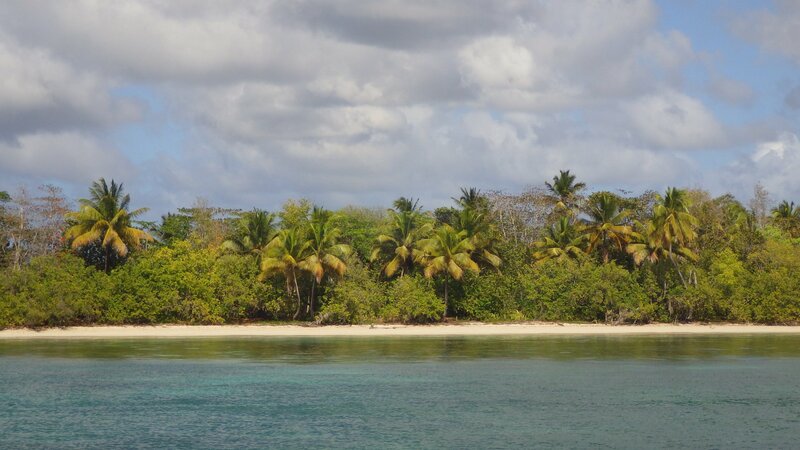 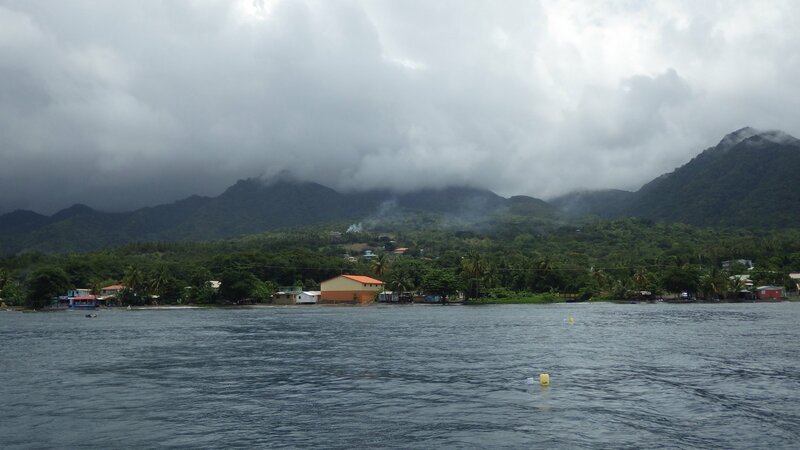 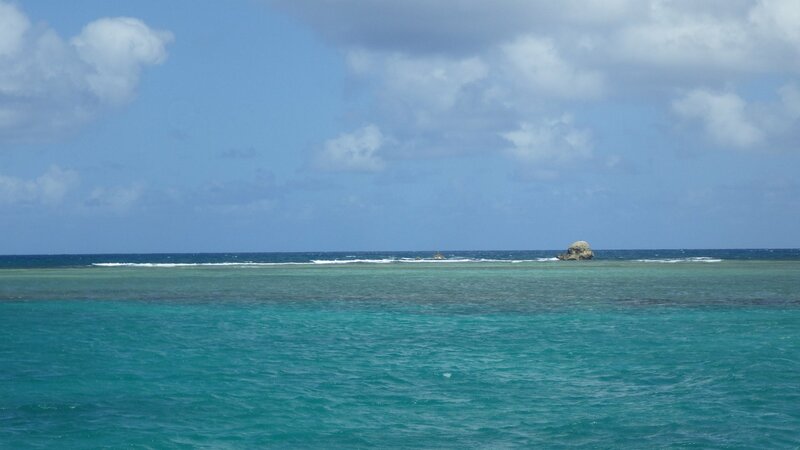 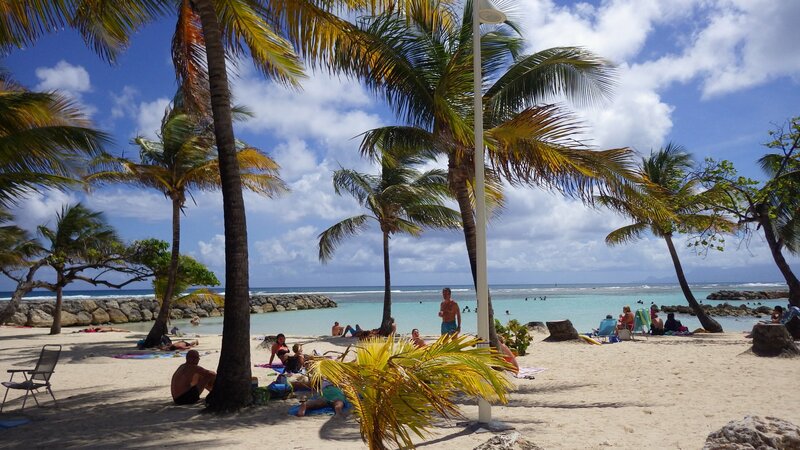 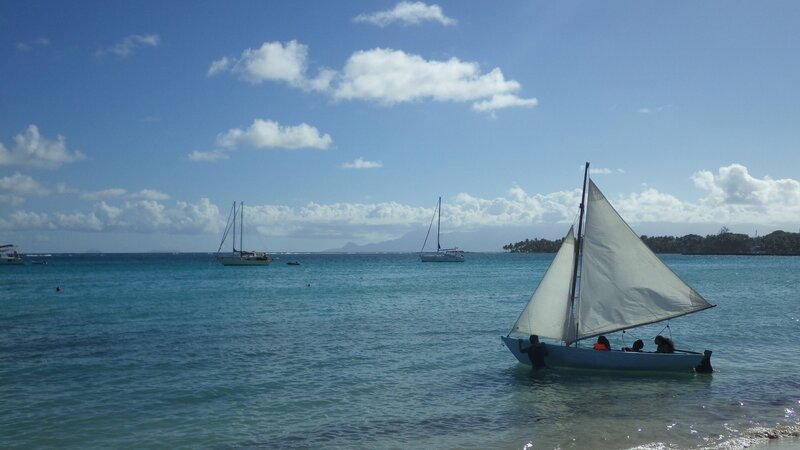 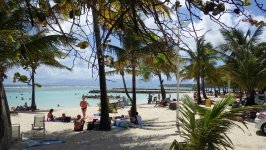 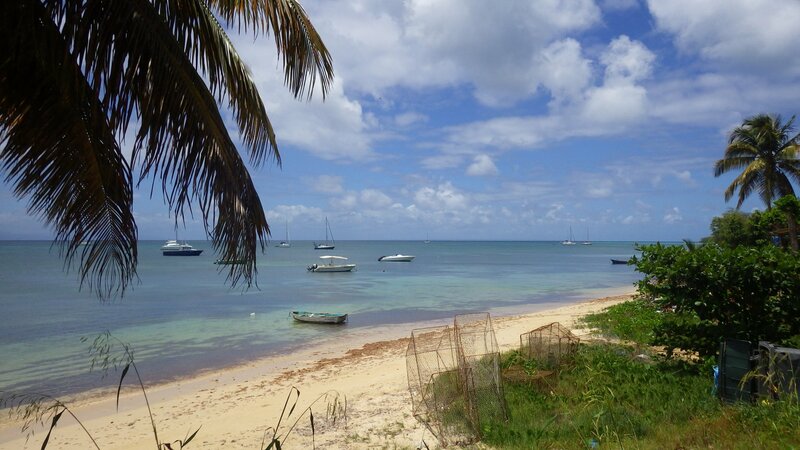 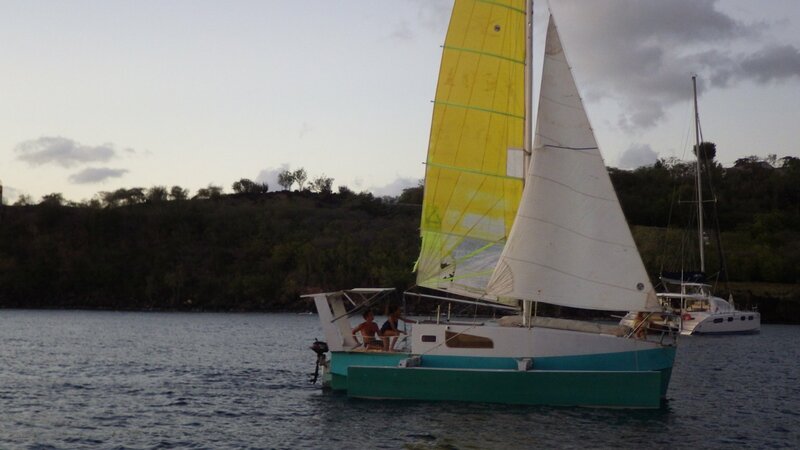 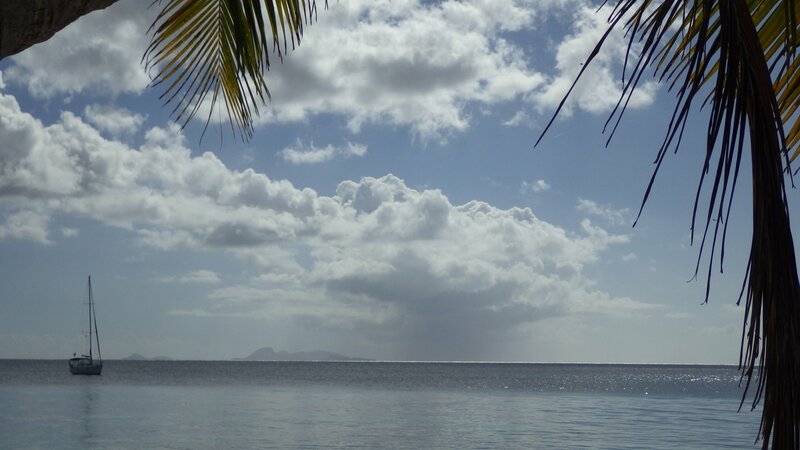 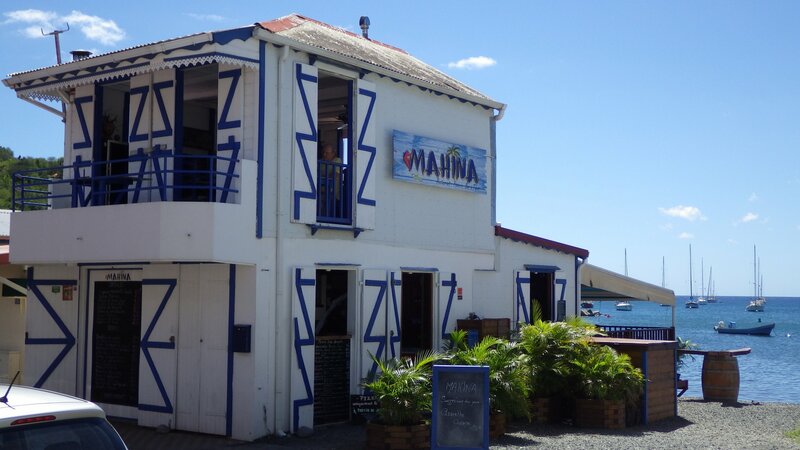 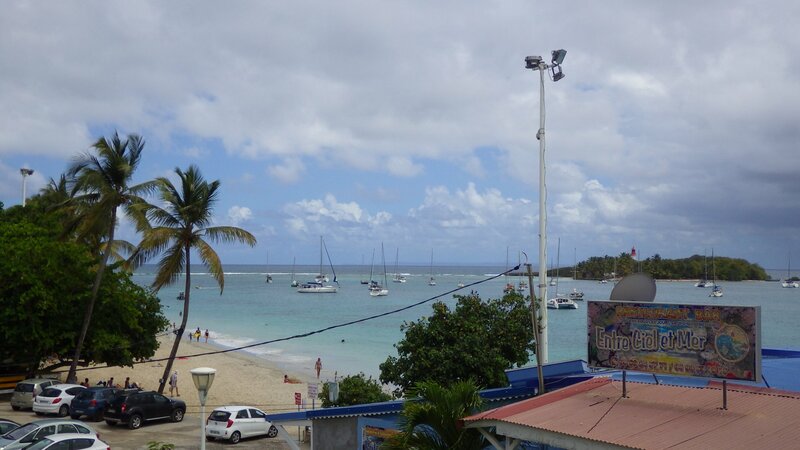 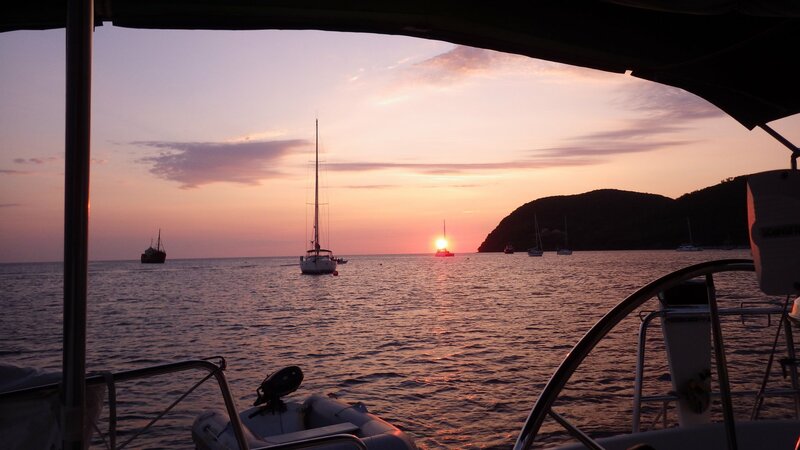 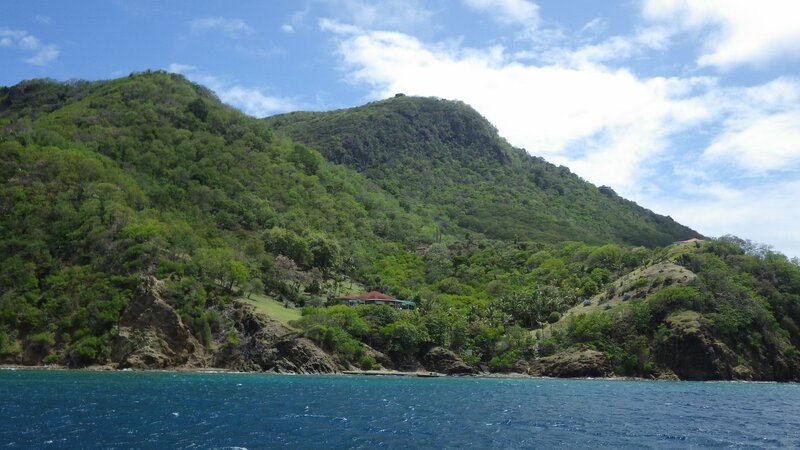 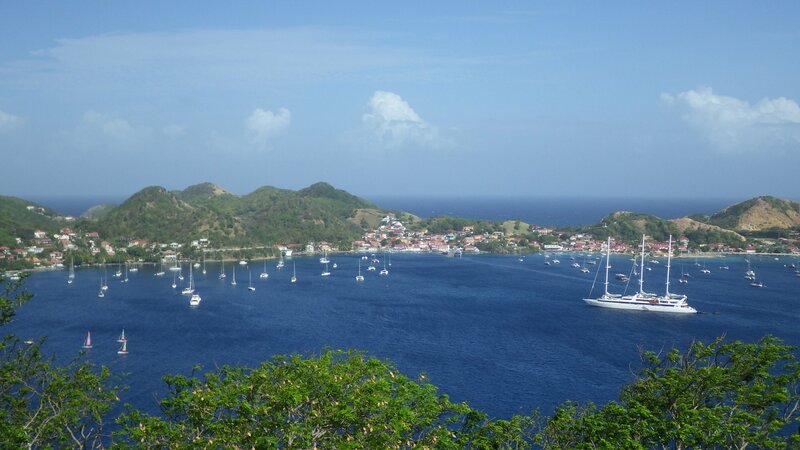 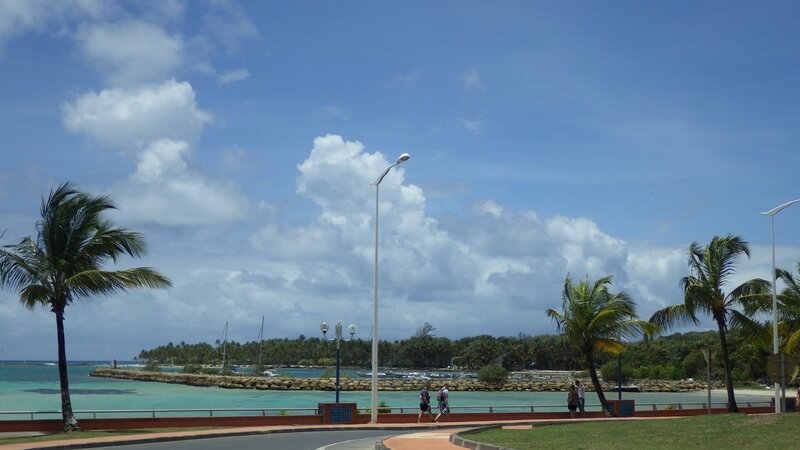 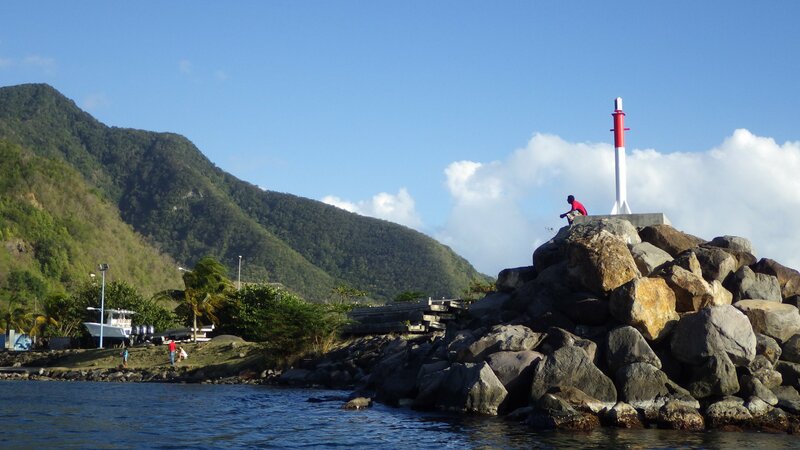 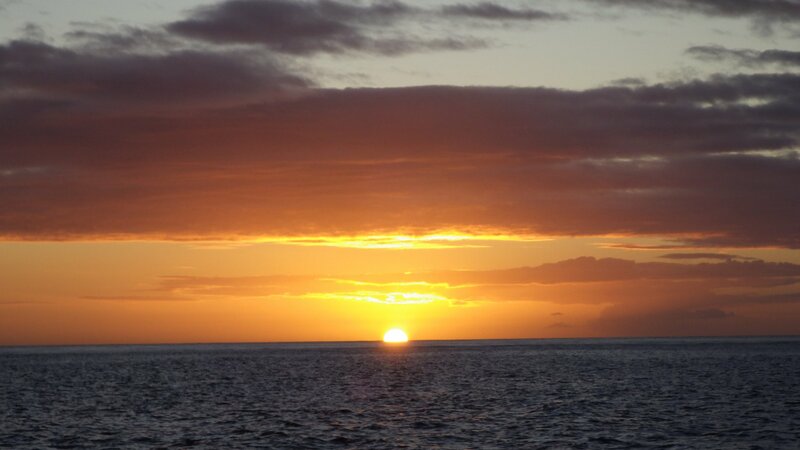 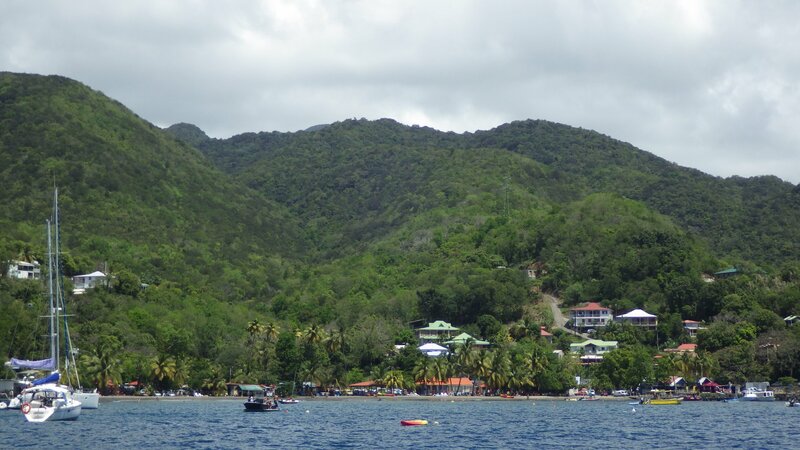 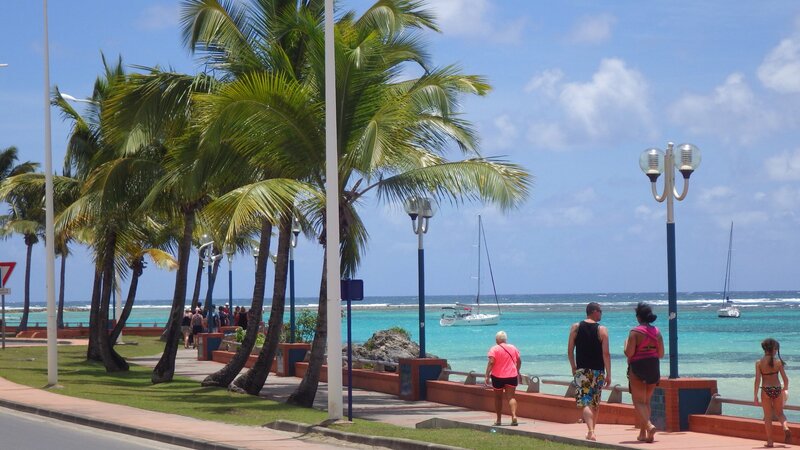 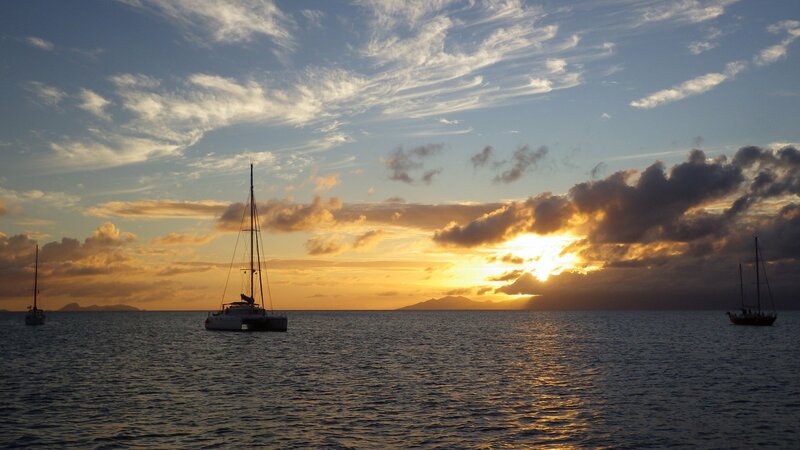 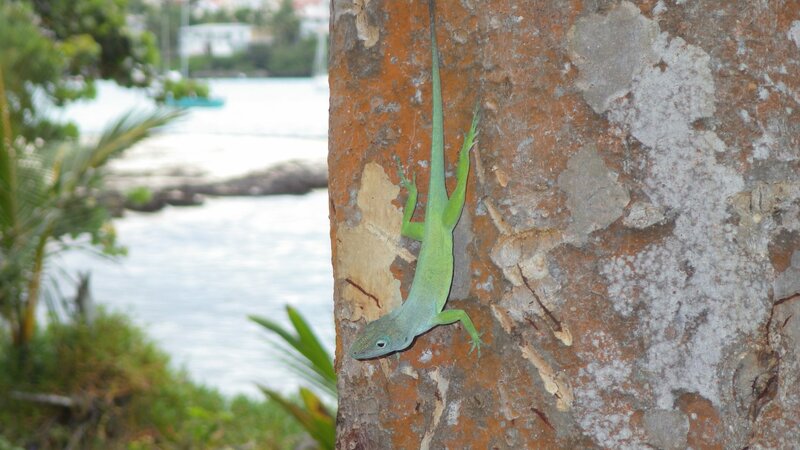 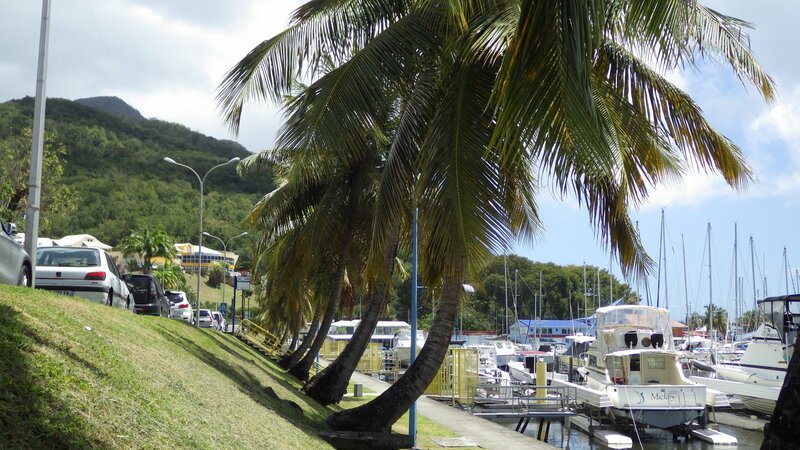 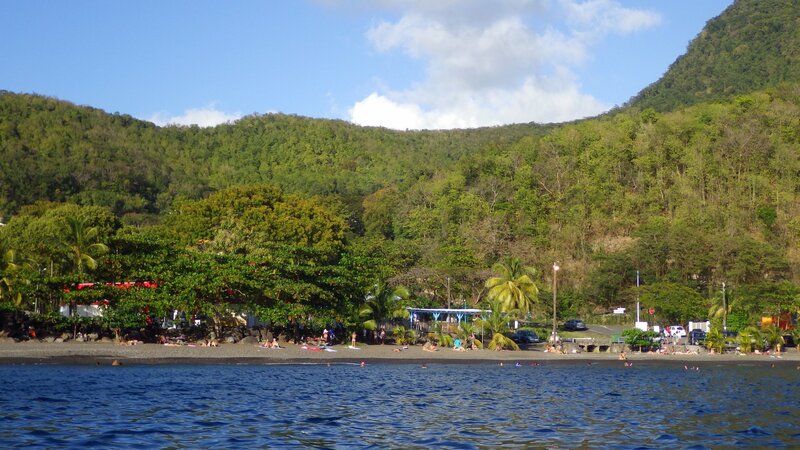 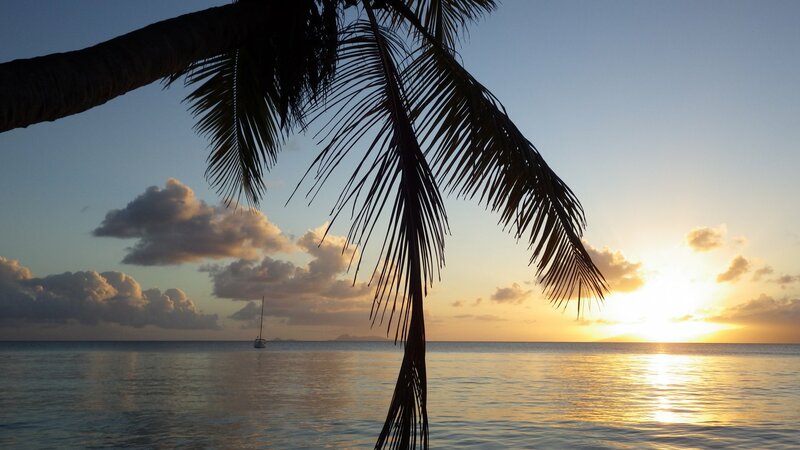 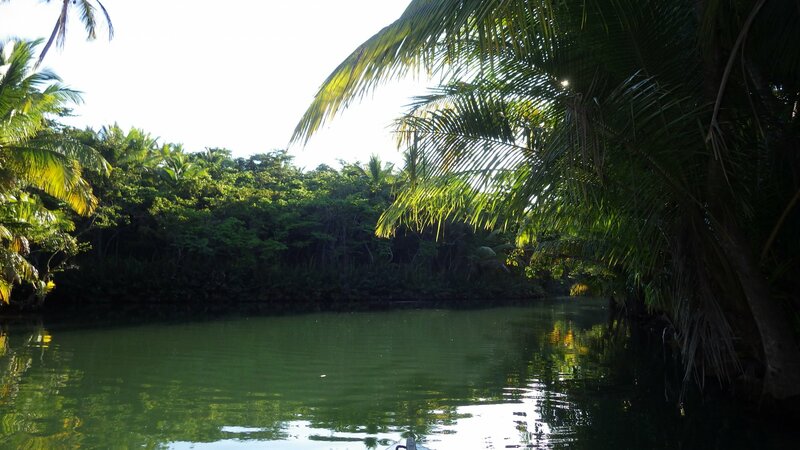 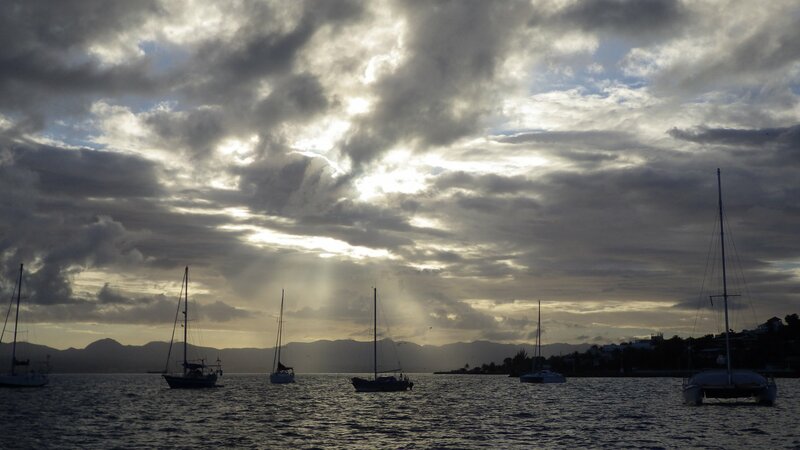 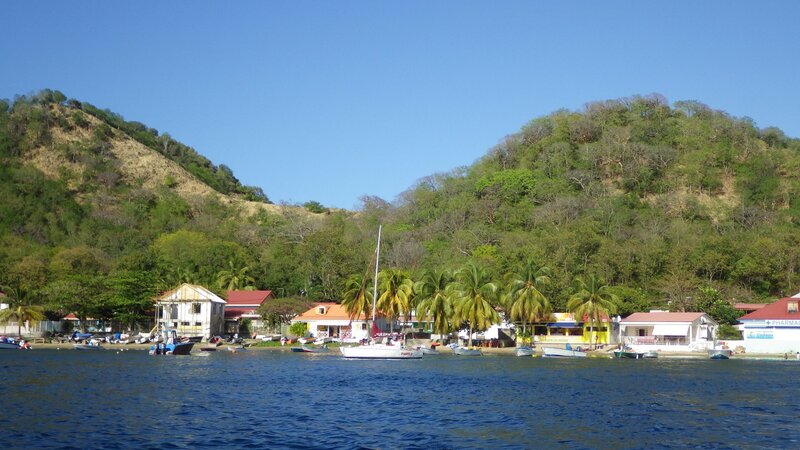 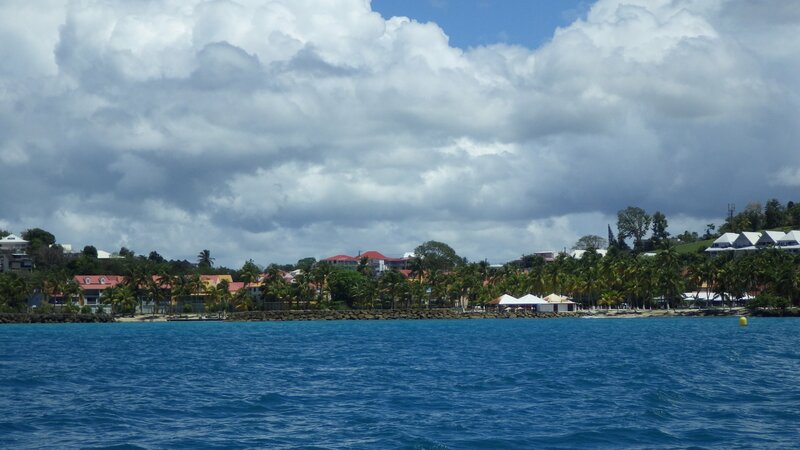 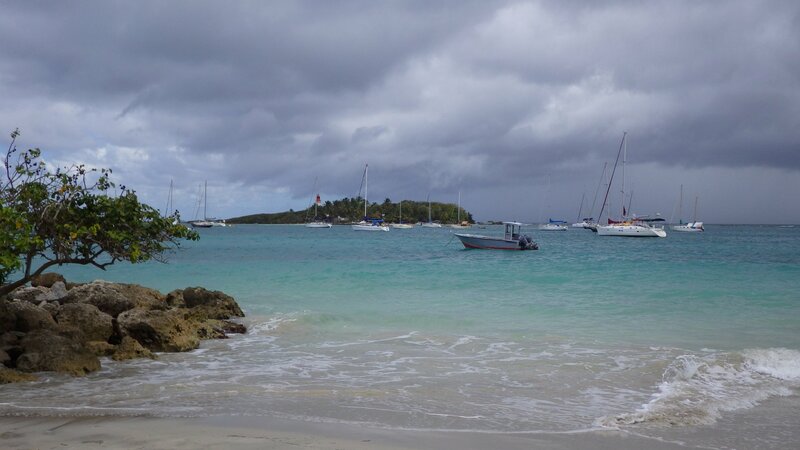 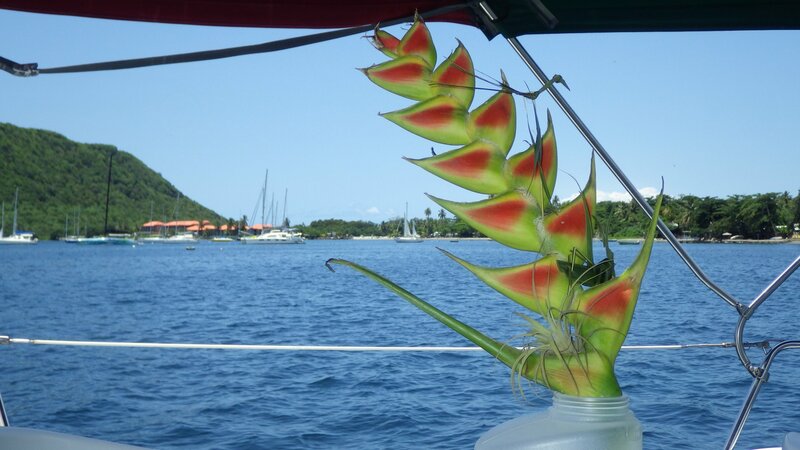 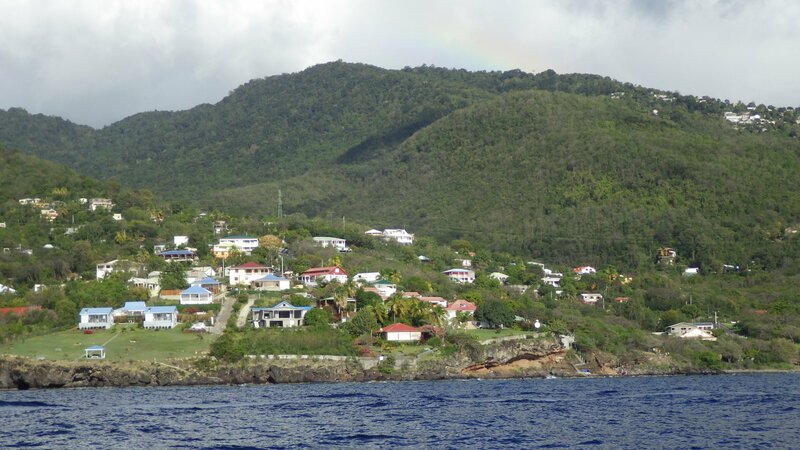 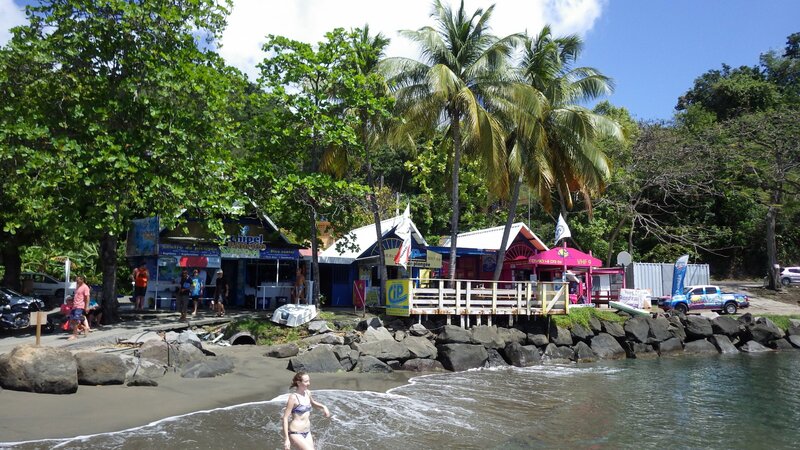 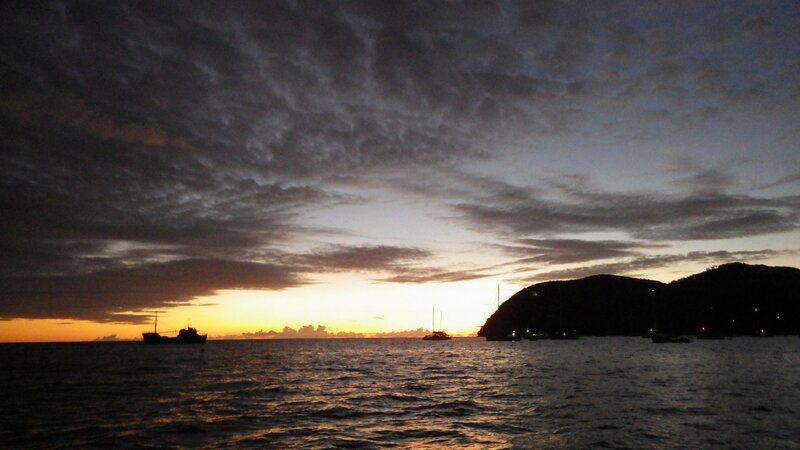 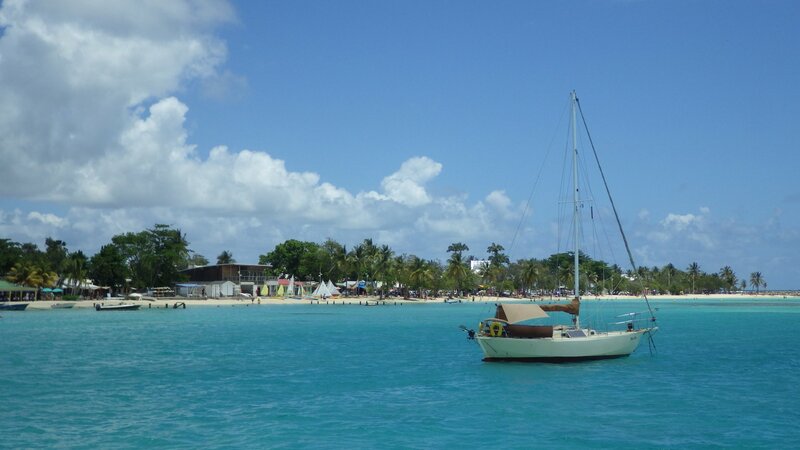 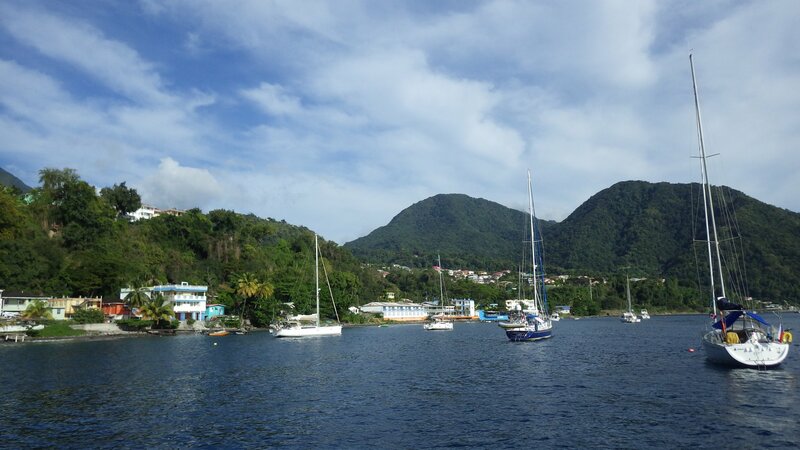 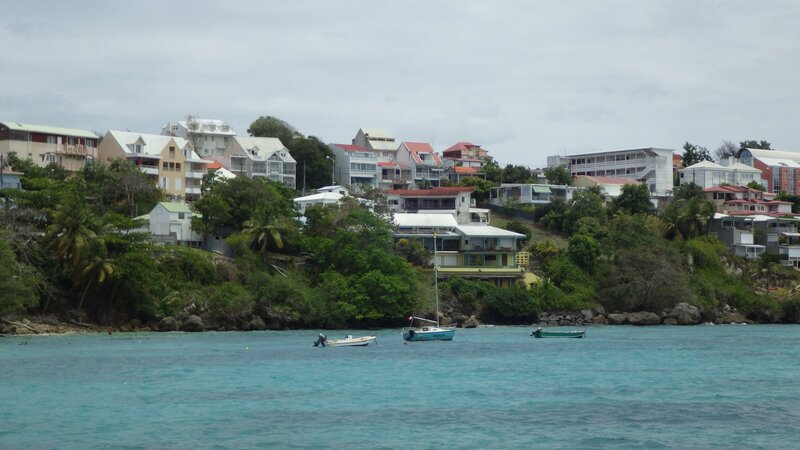 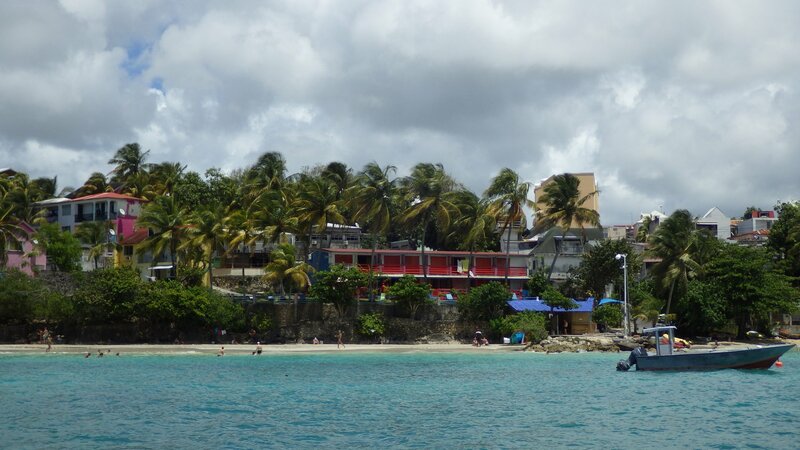 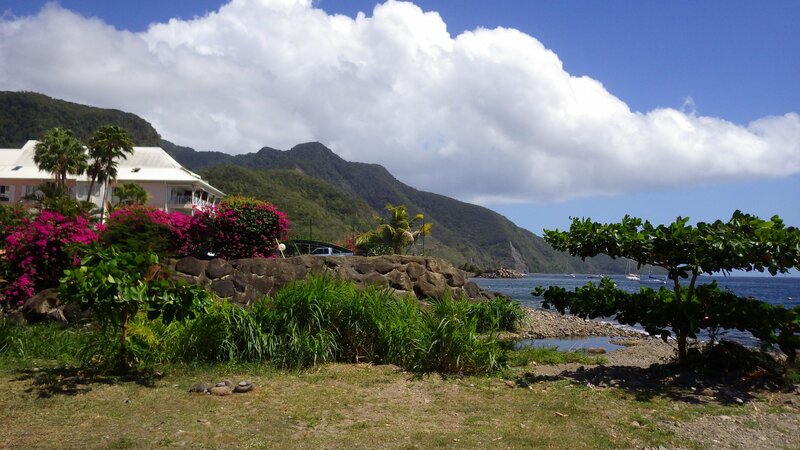 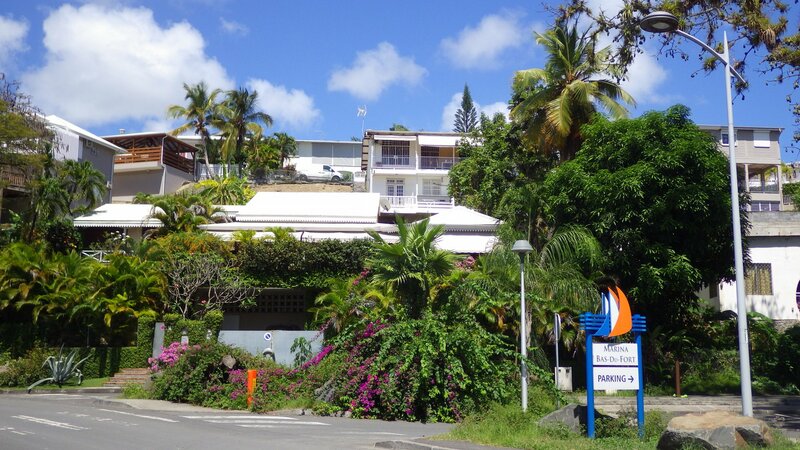 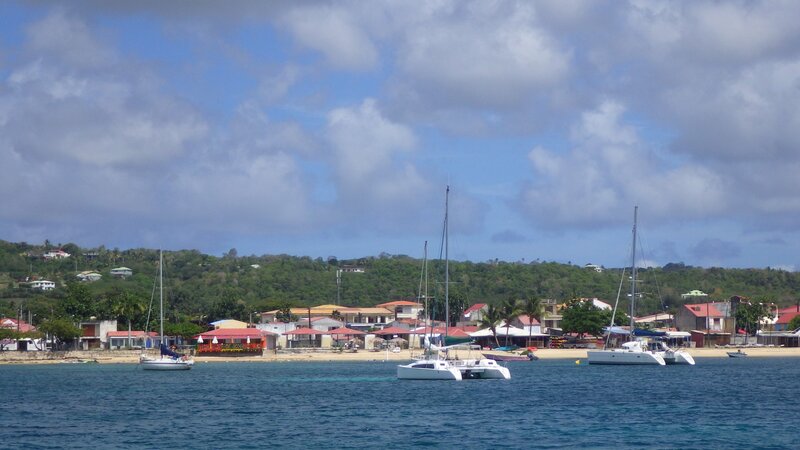 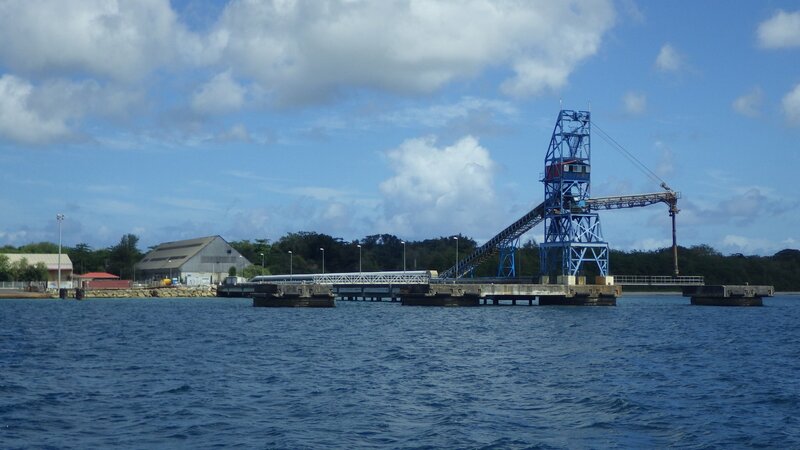 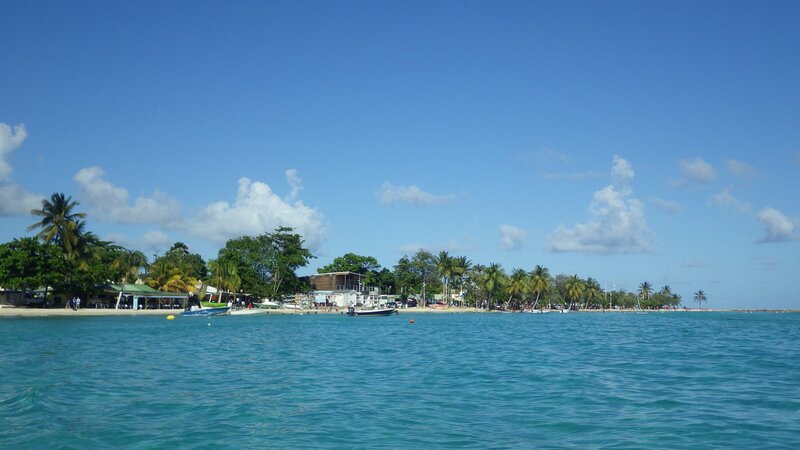 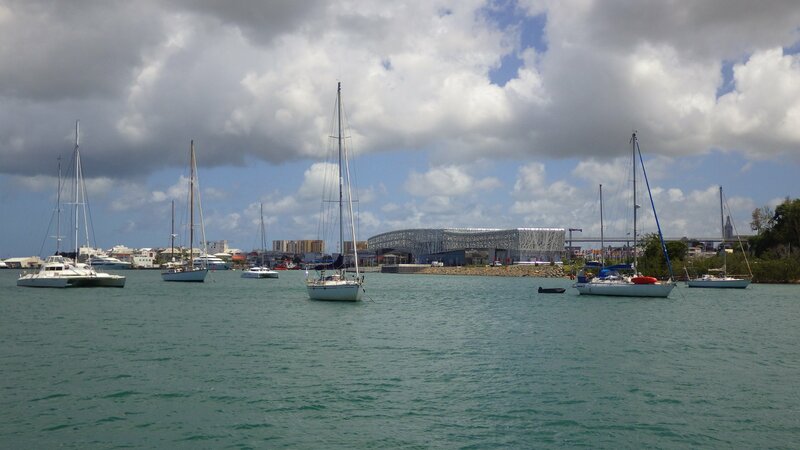 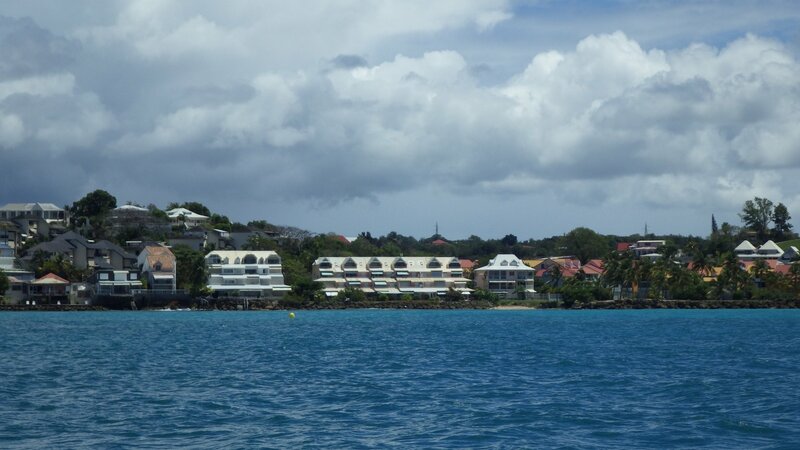 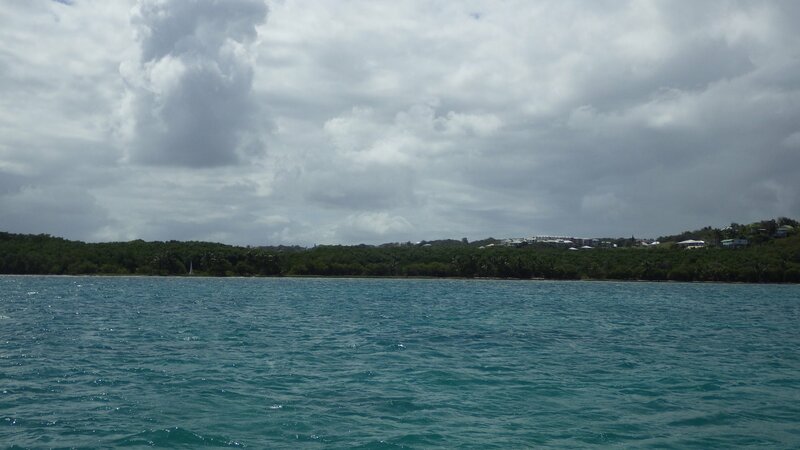 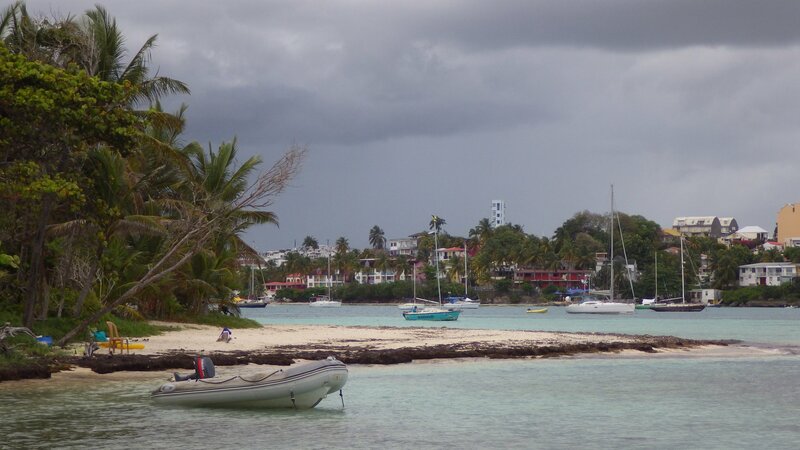 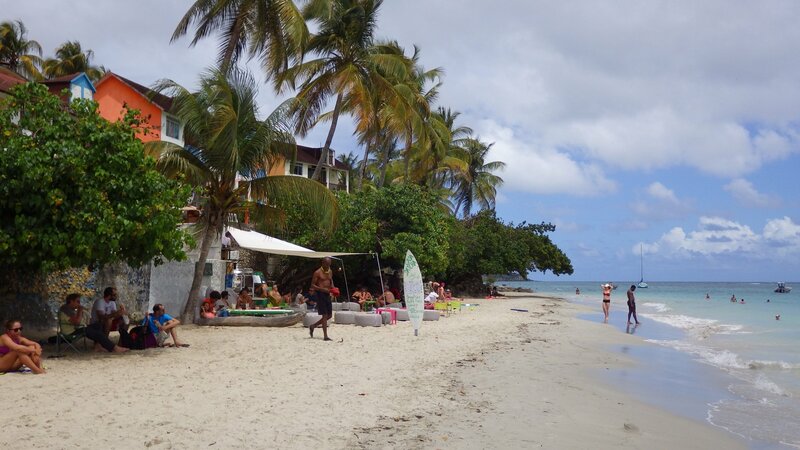 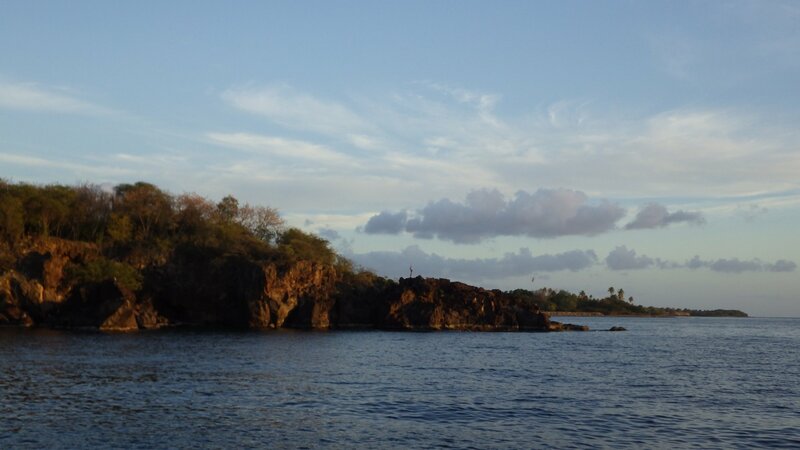 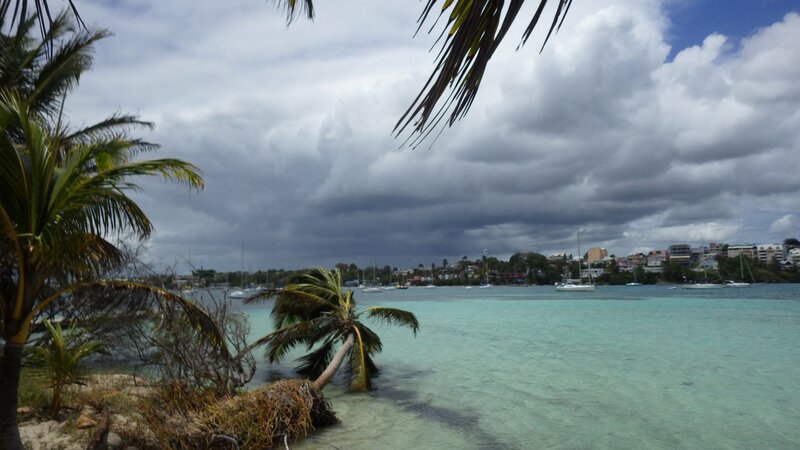 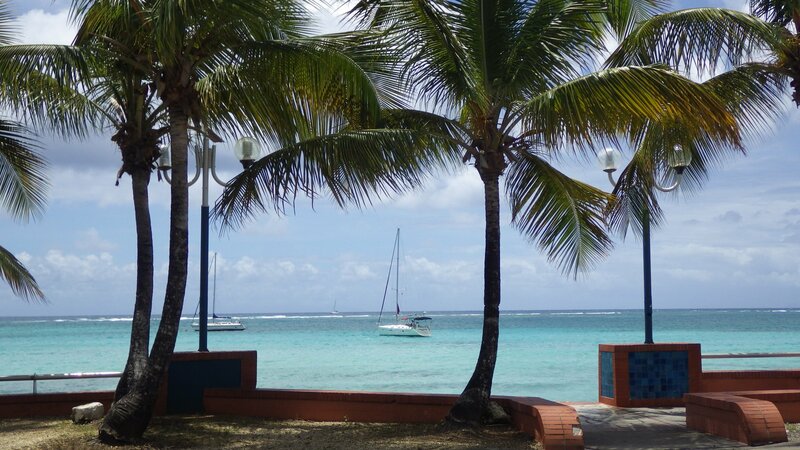 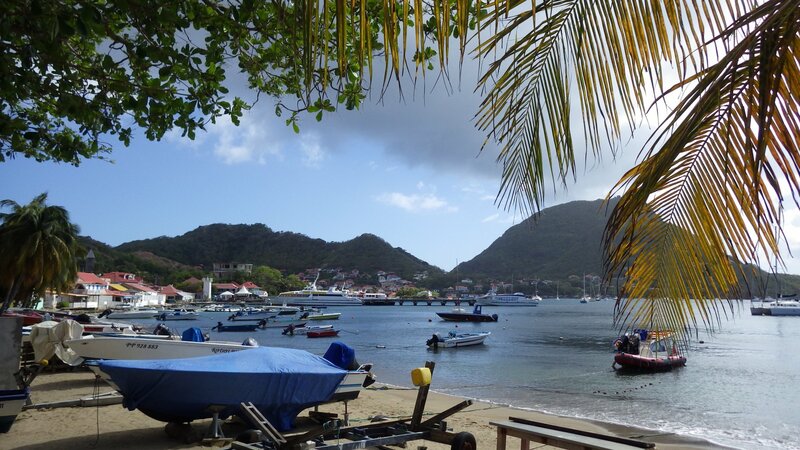 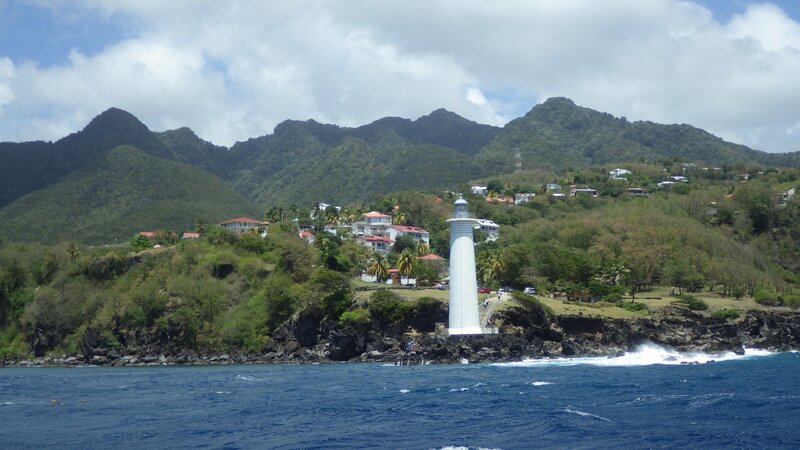 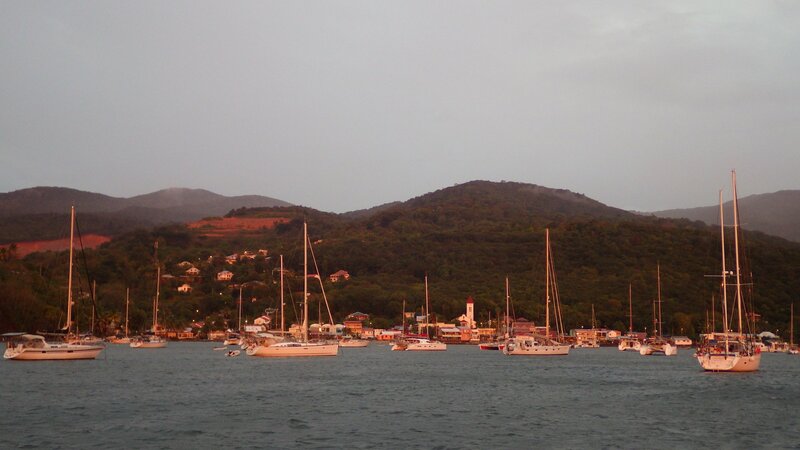 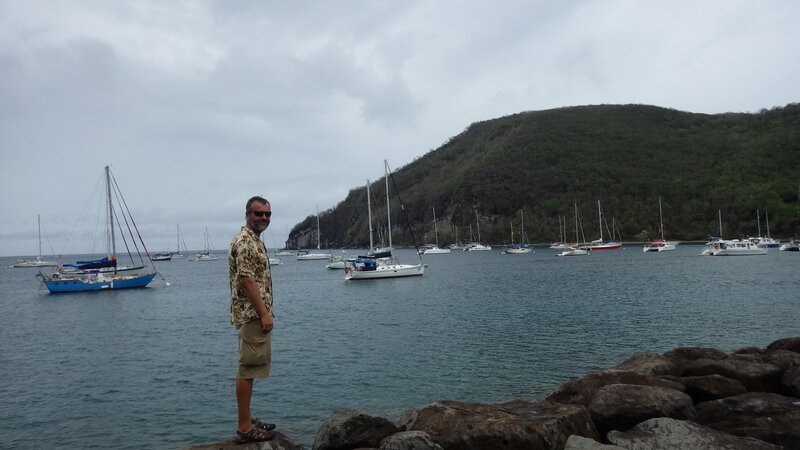 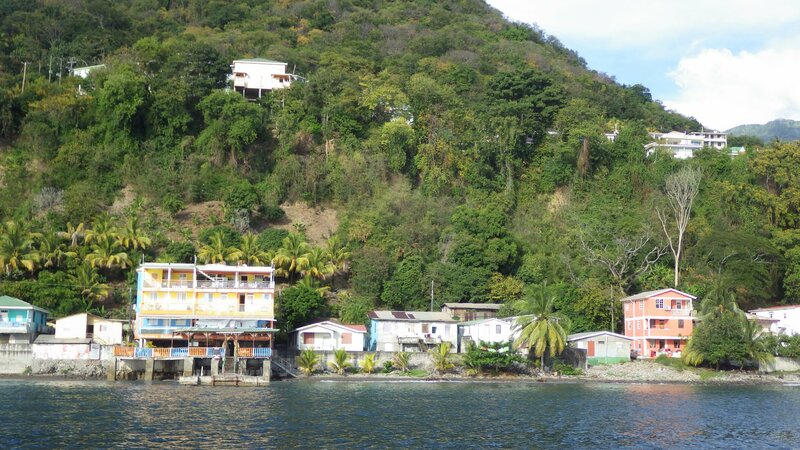 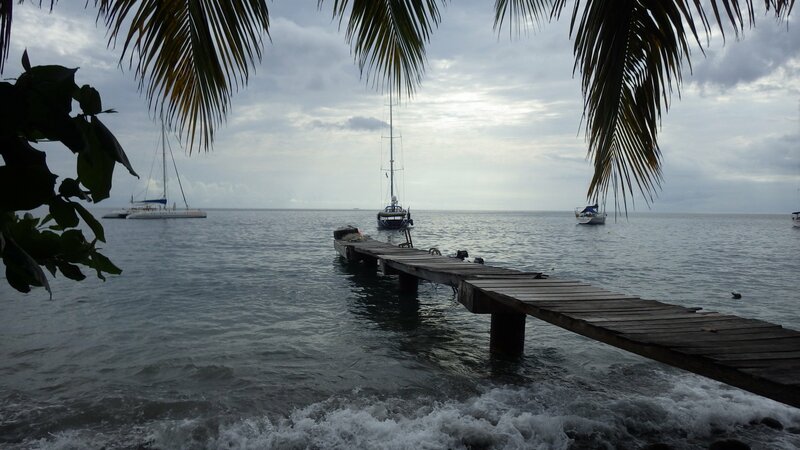 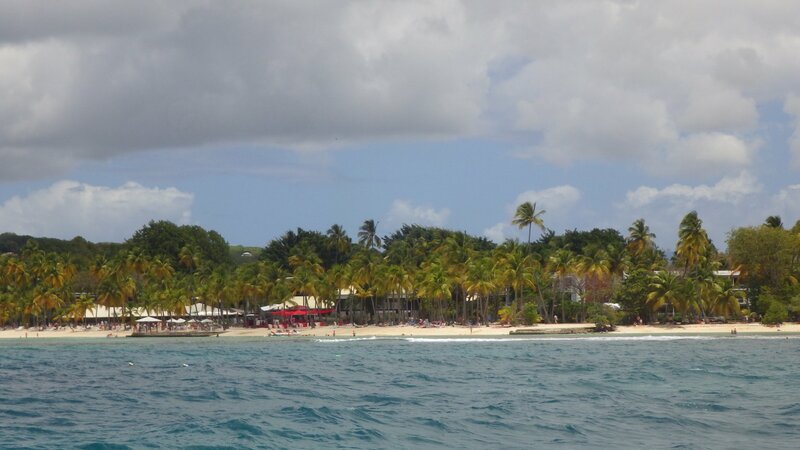 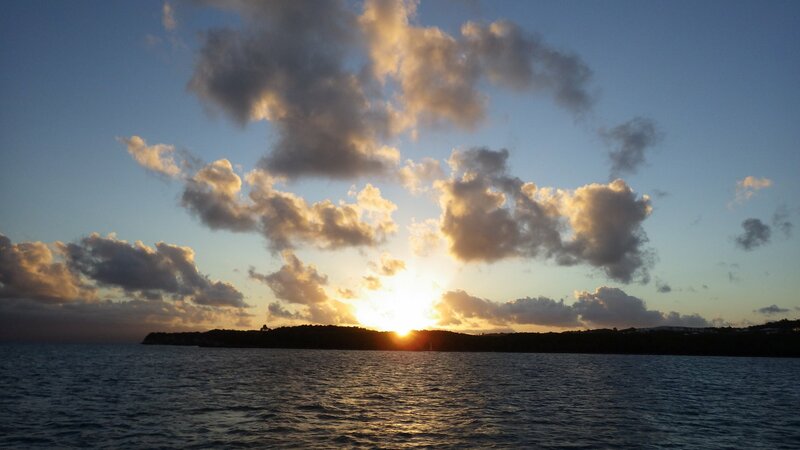 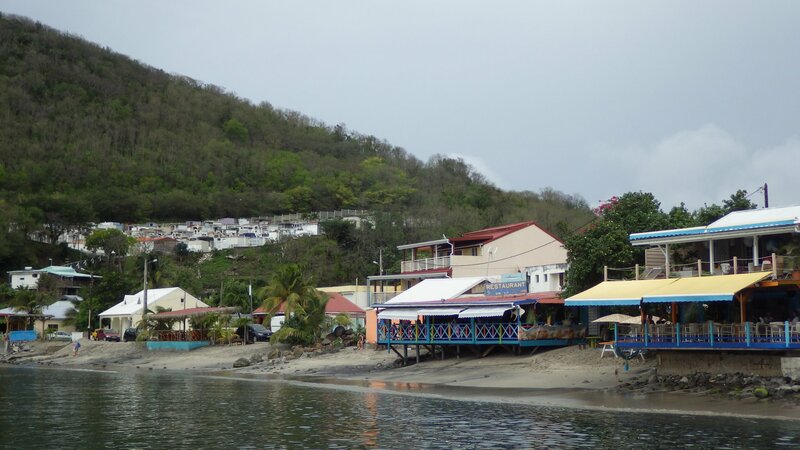 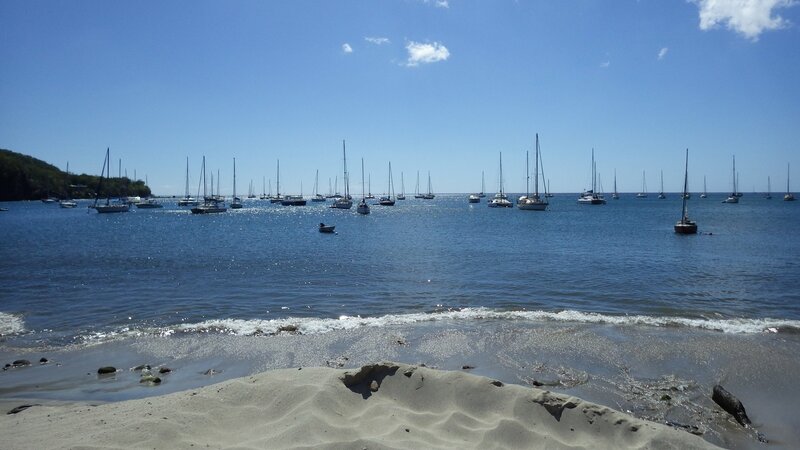 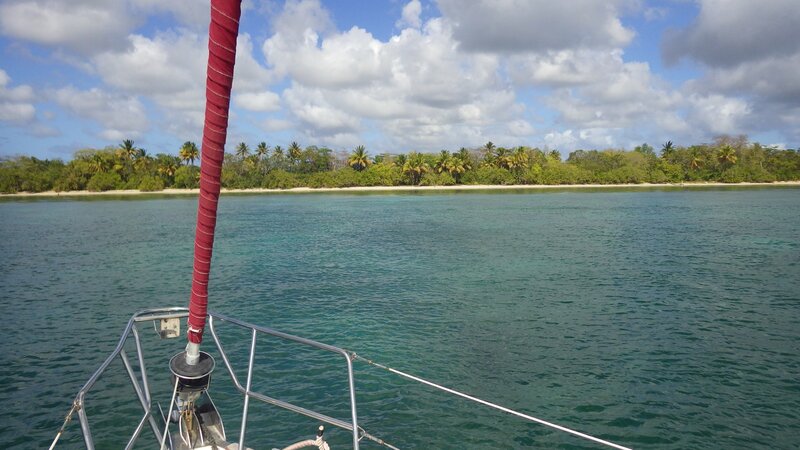 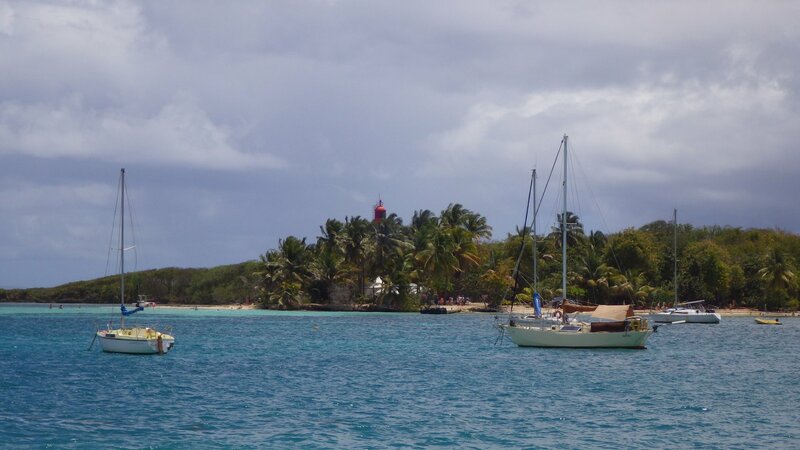 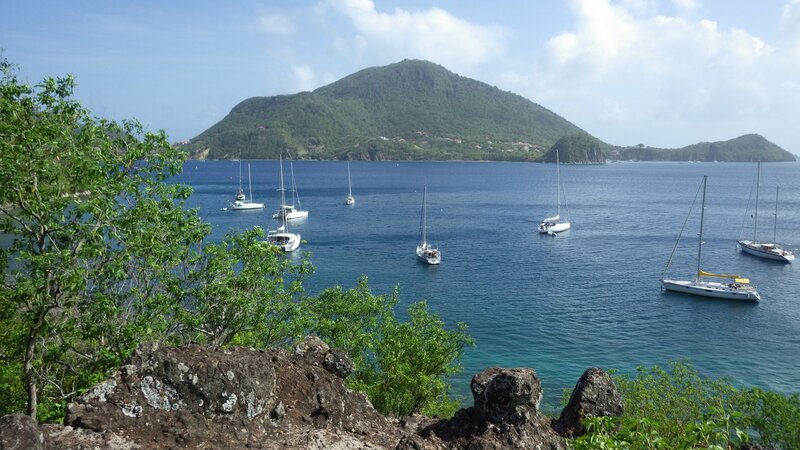 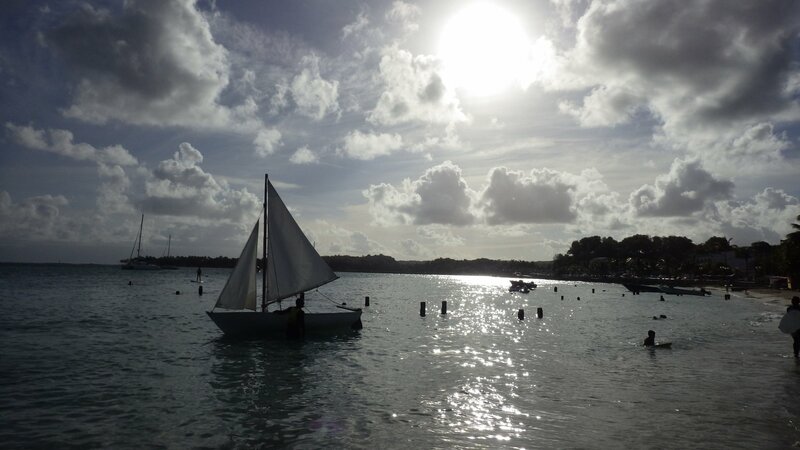 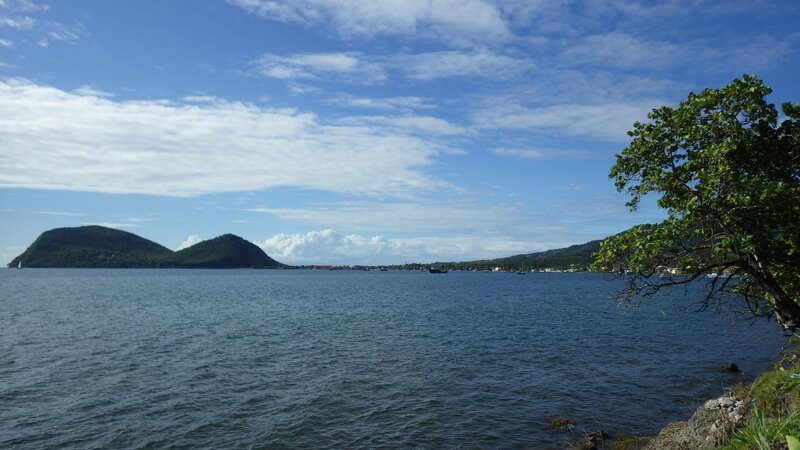 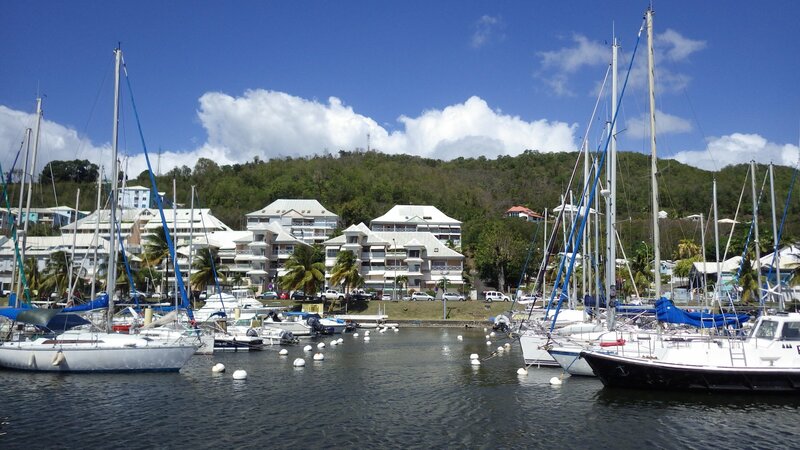 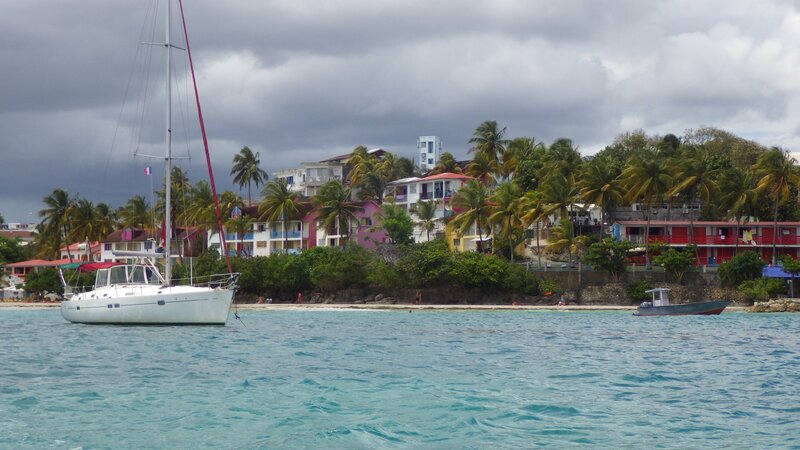 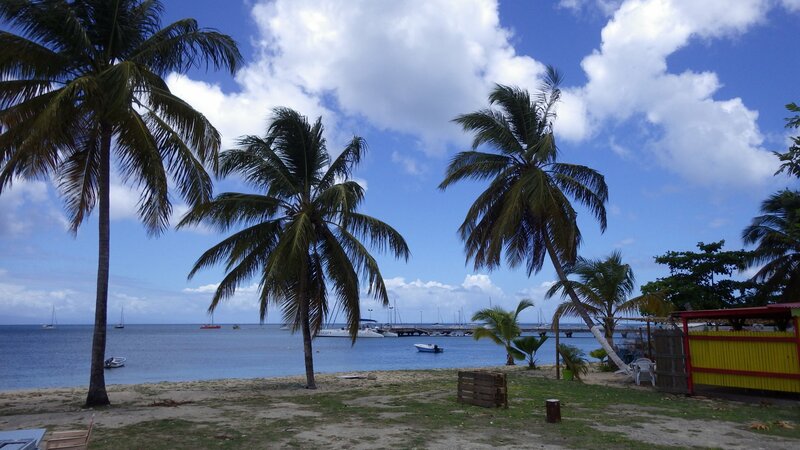 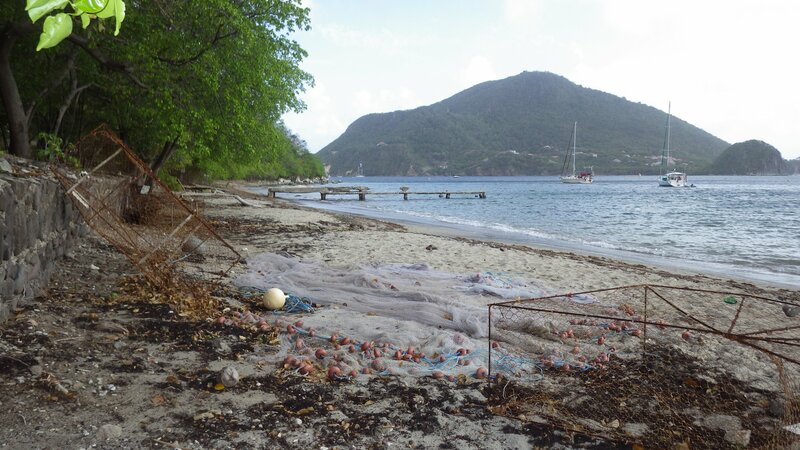 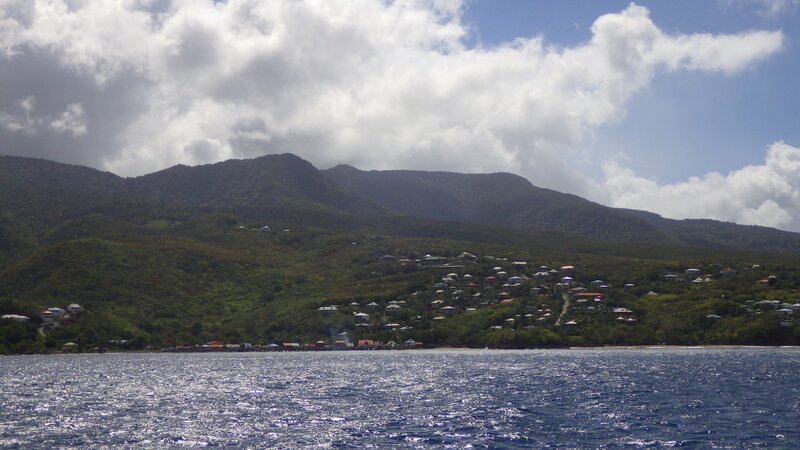 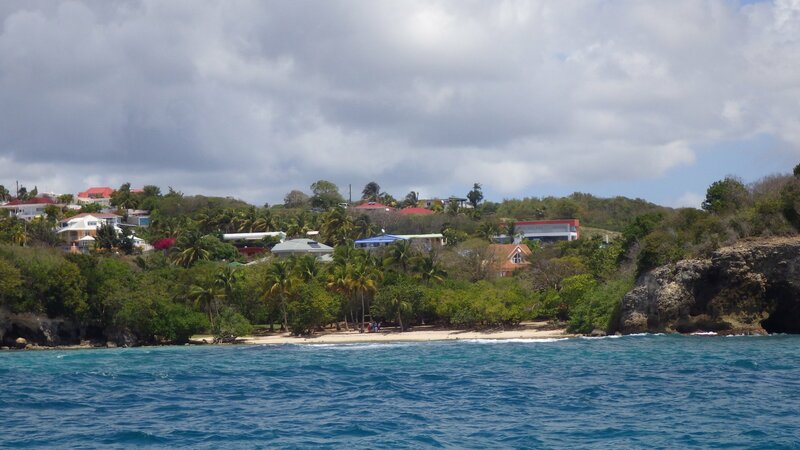 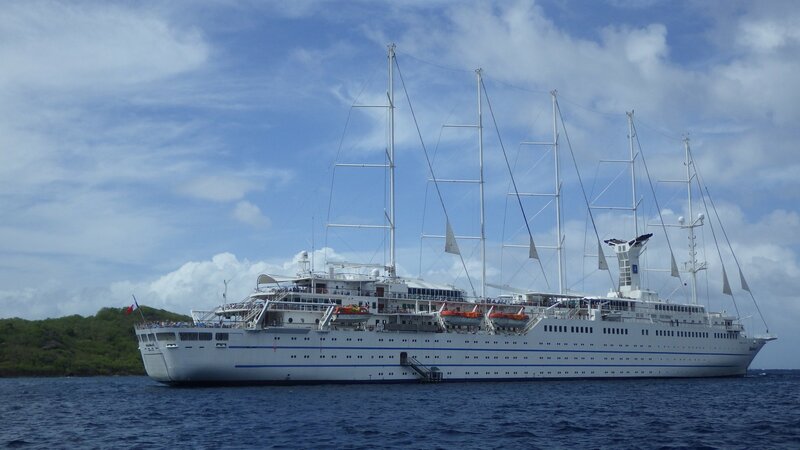 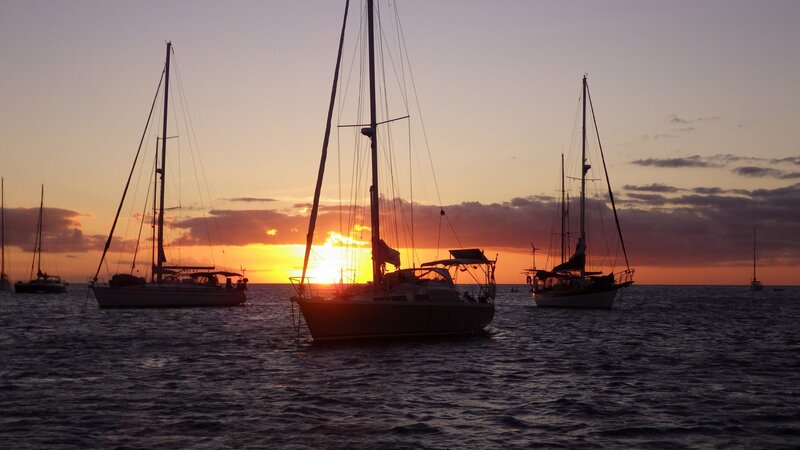 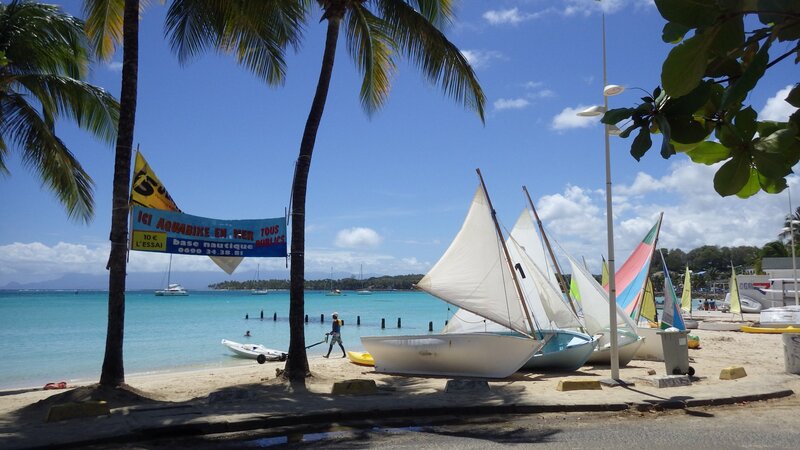 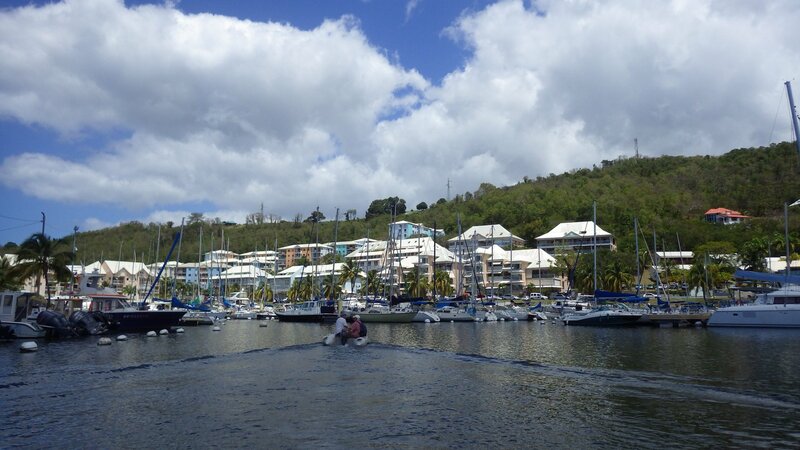 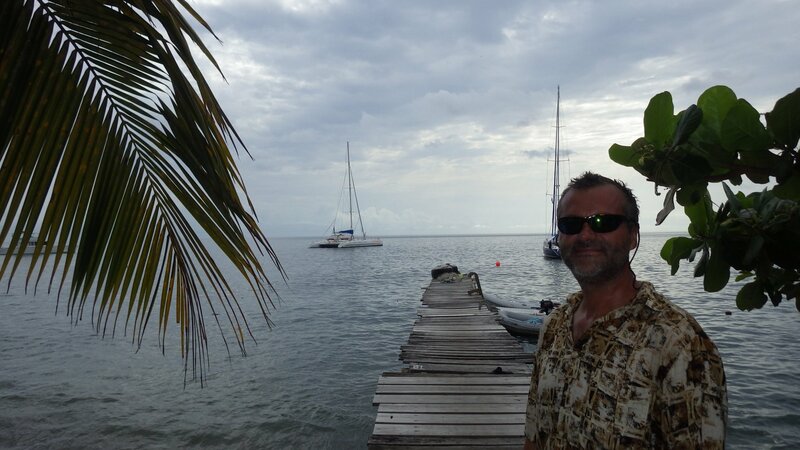 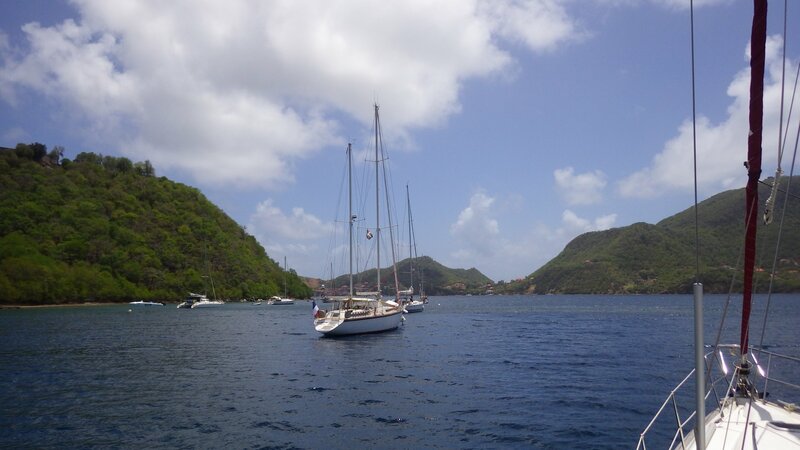 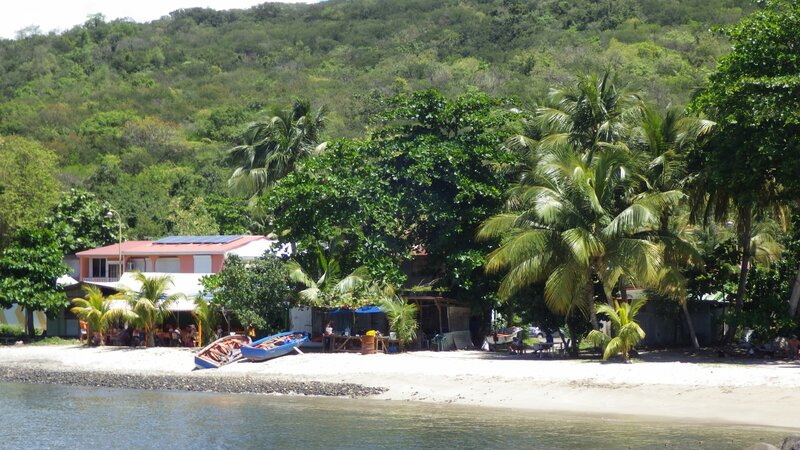 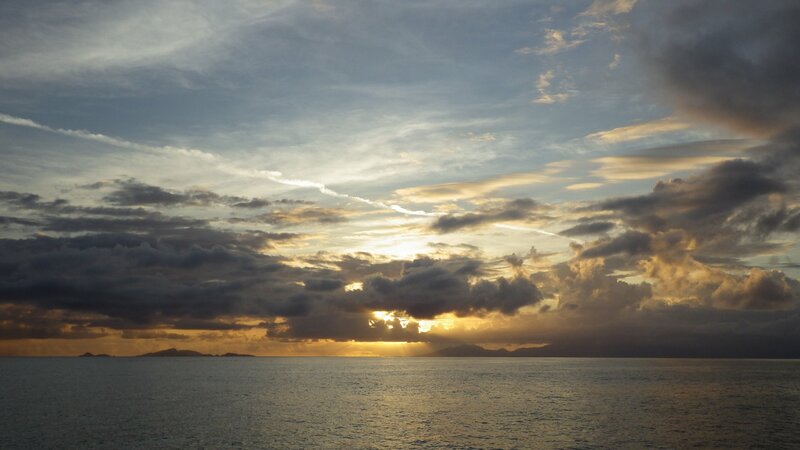 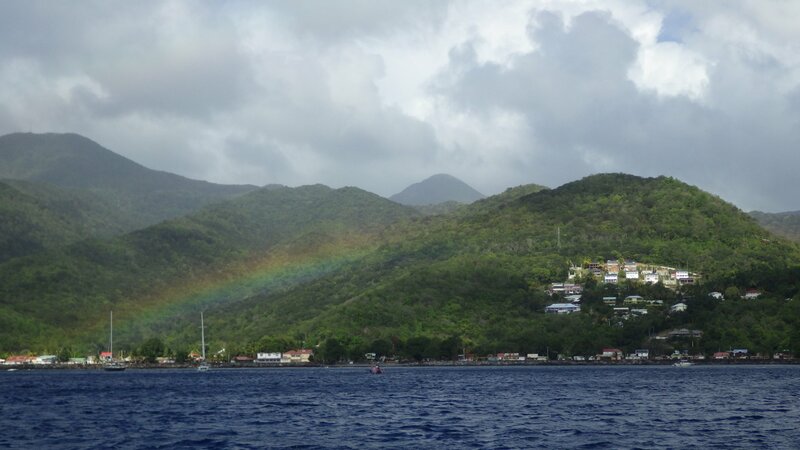 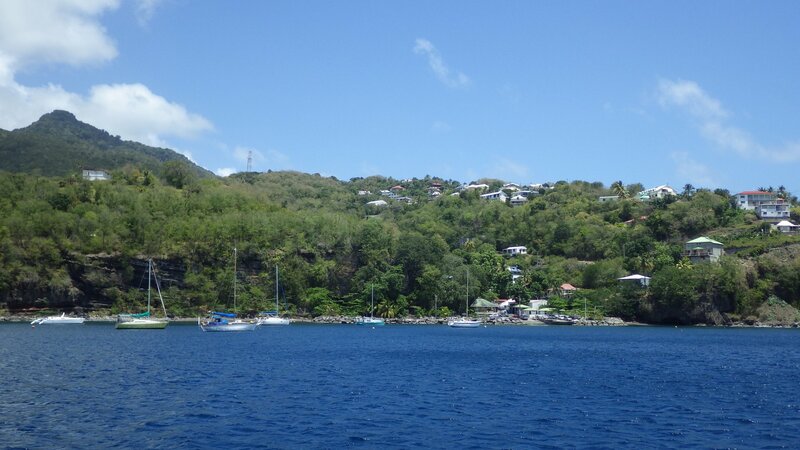 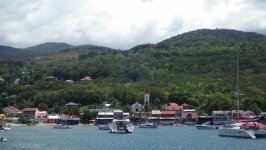 We anchored near the town of Basse-Terre, close to the Marina Riviere Sens. 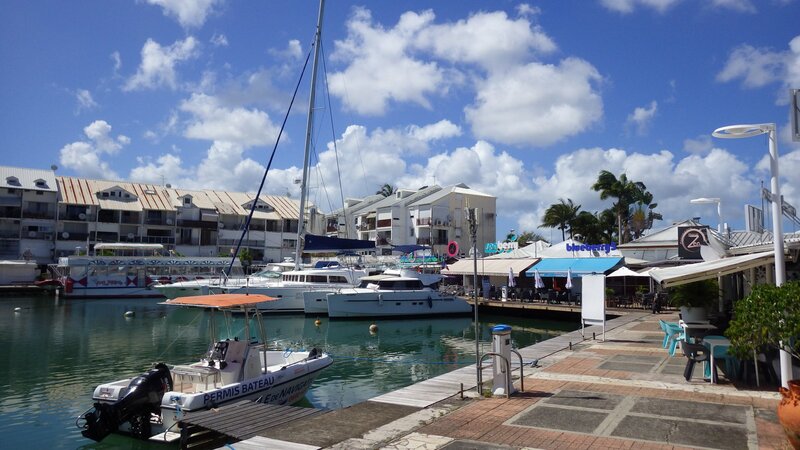 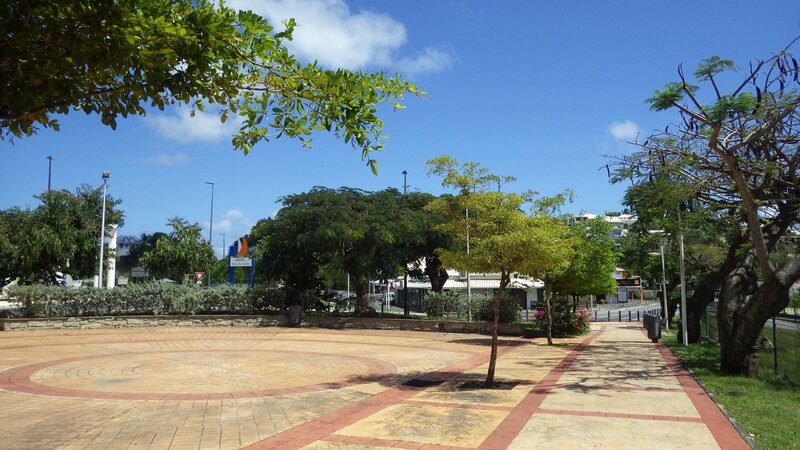 The area around the marina is quite pleasant, with low-rise buildings, several restaurants, shops and services. 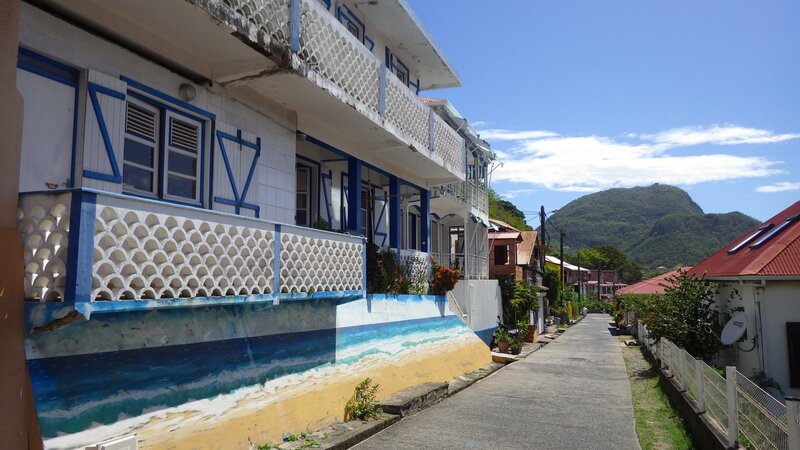 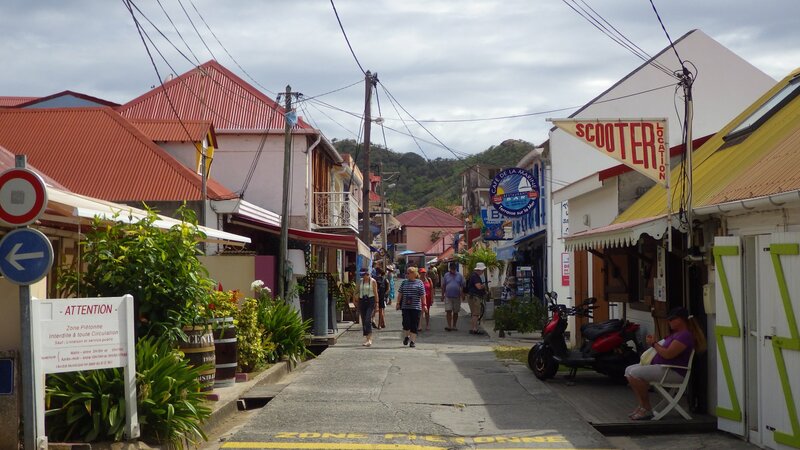 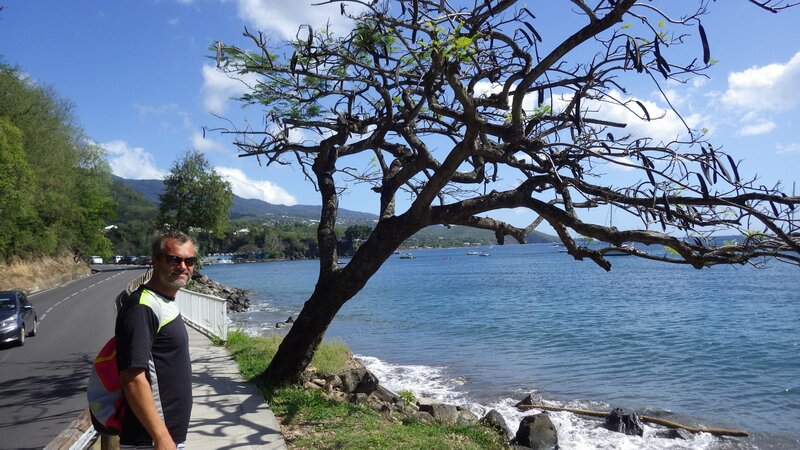 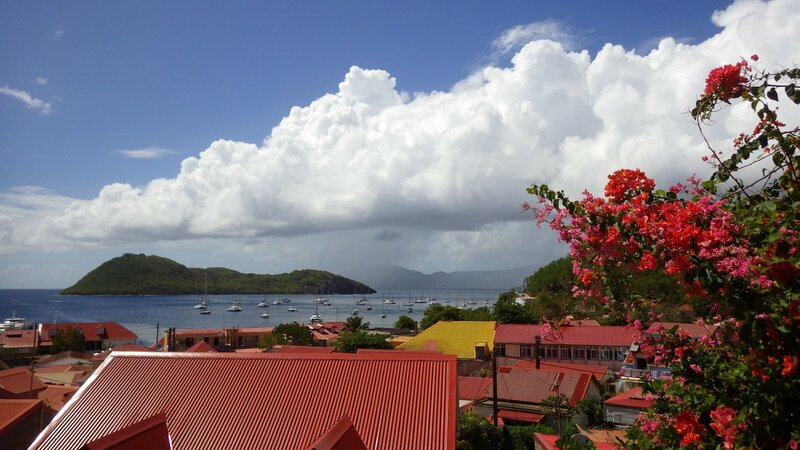 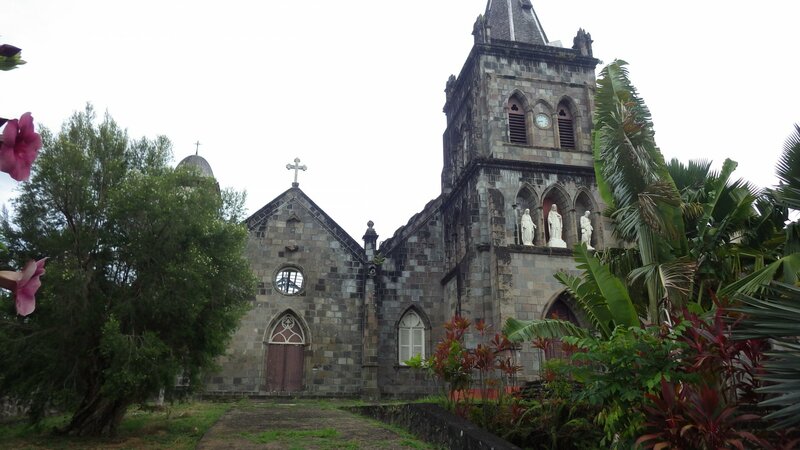 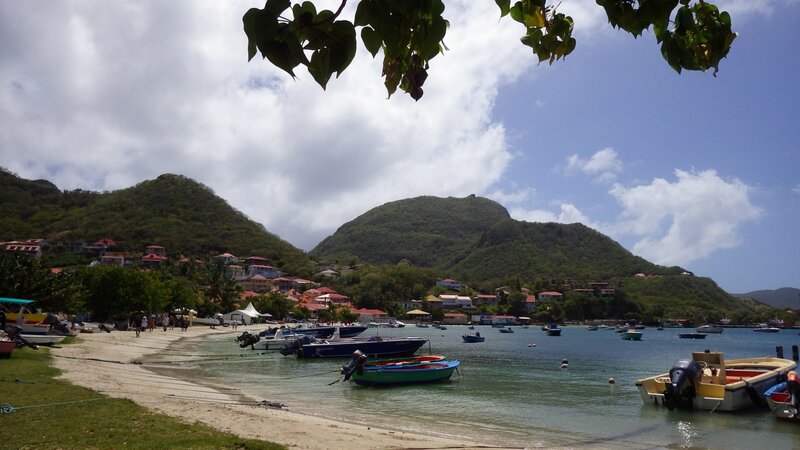 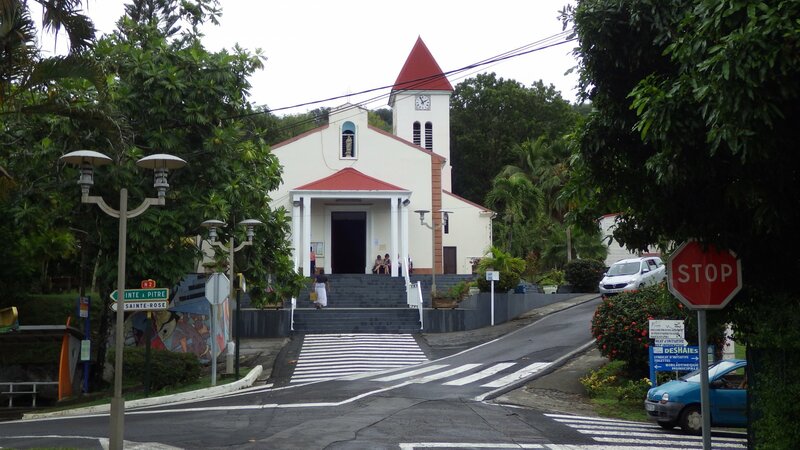 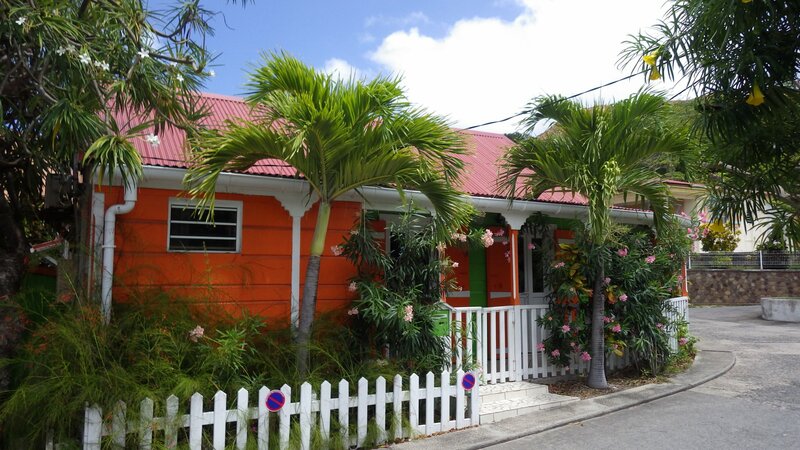 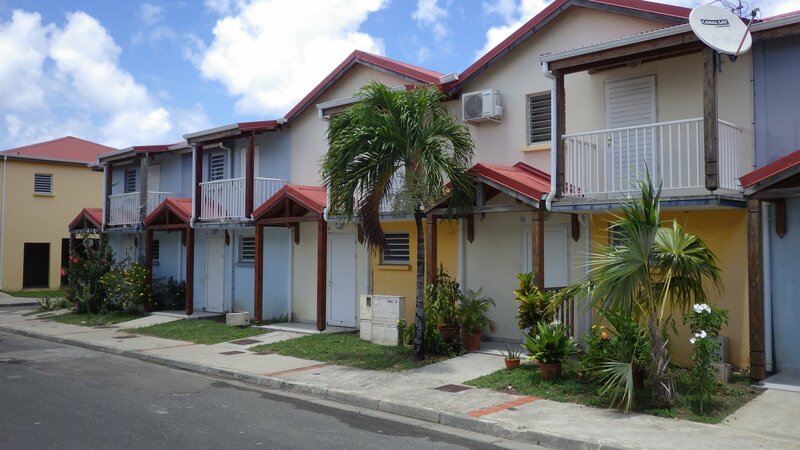 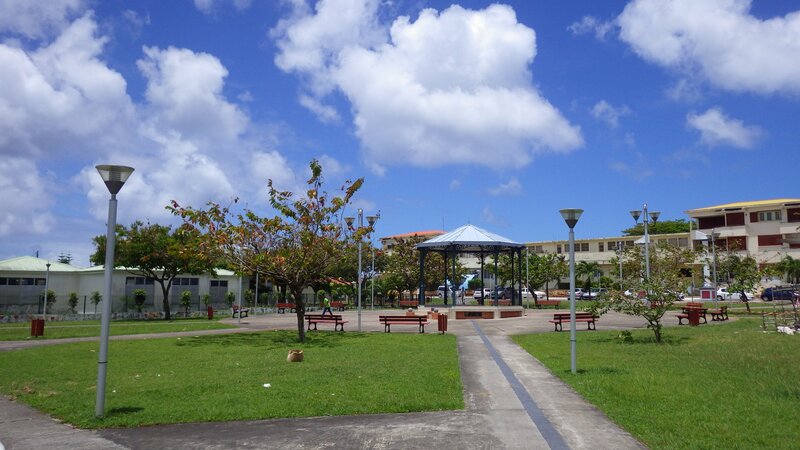 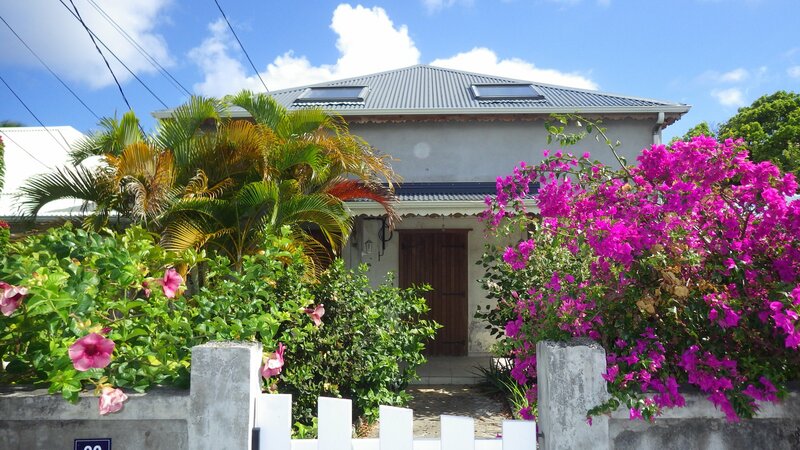 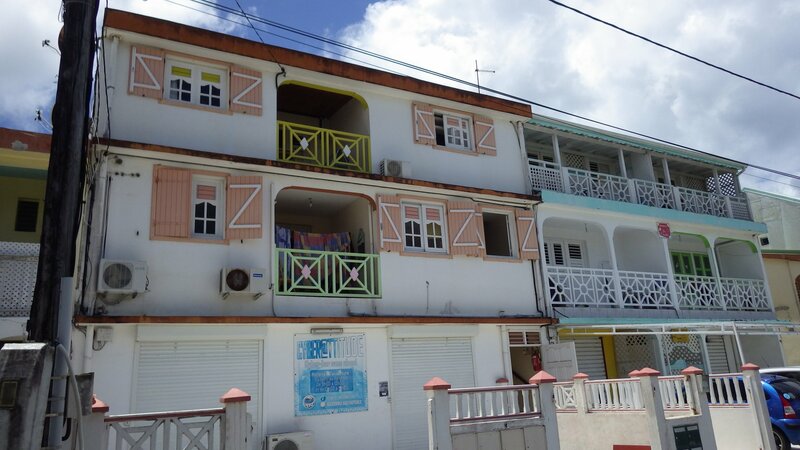 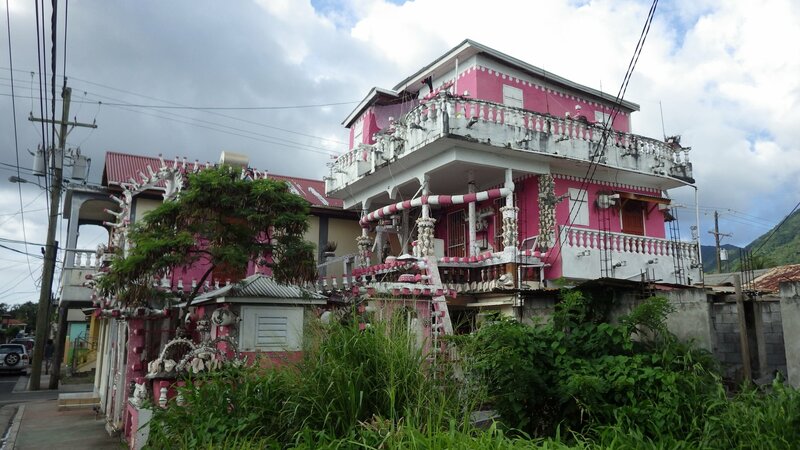 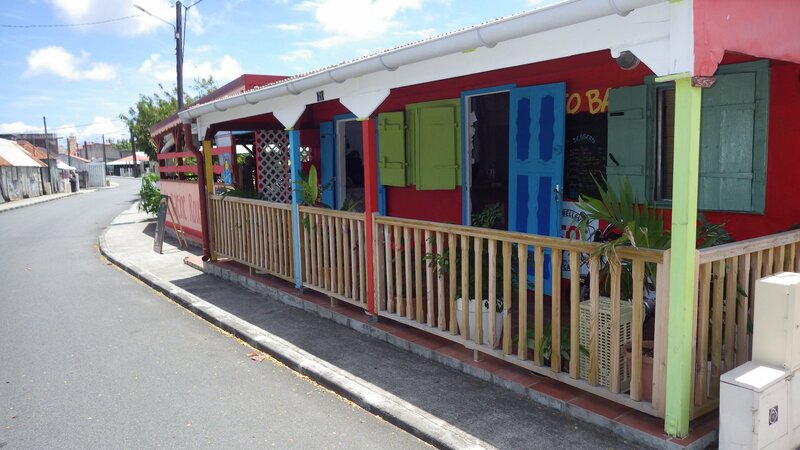 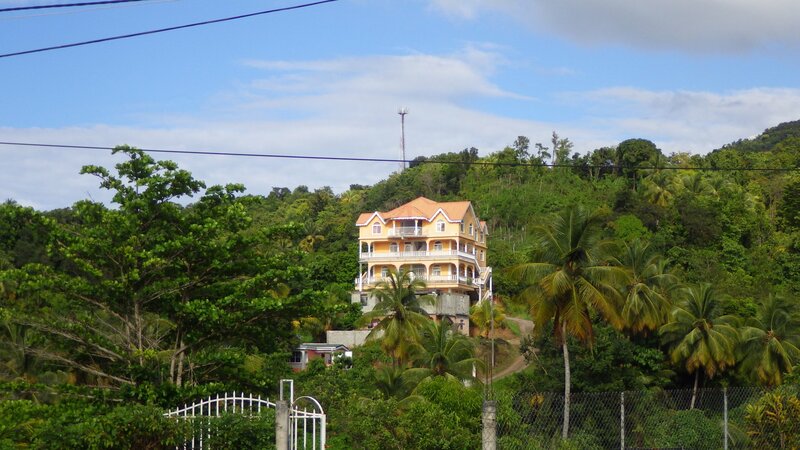 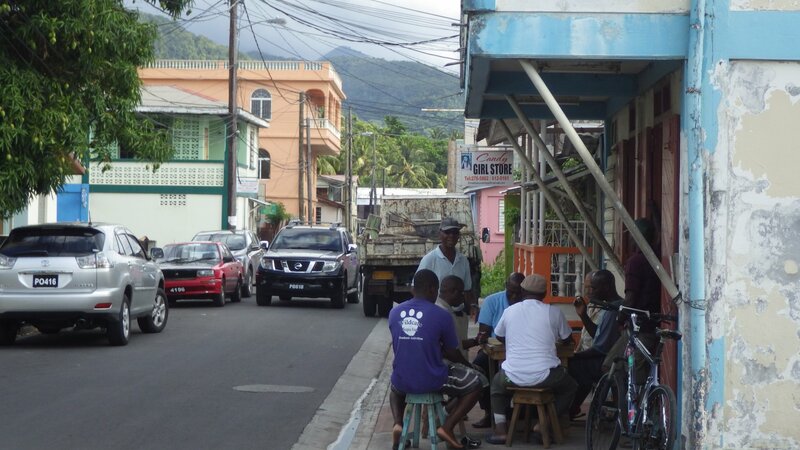 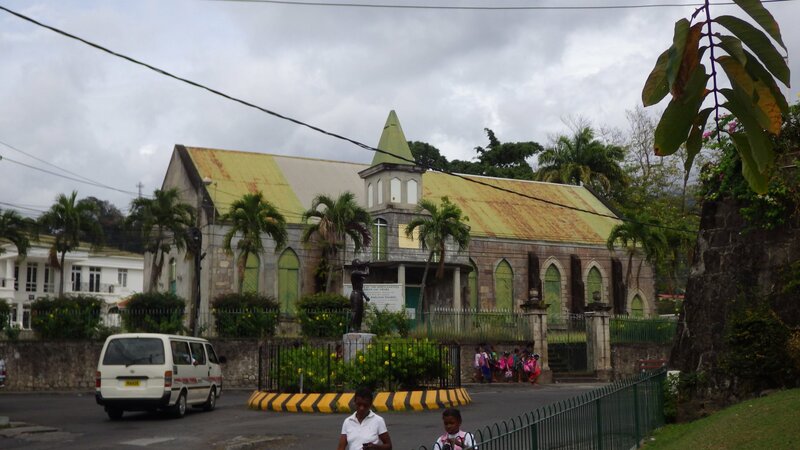 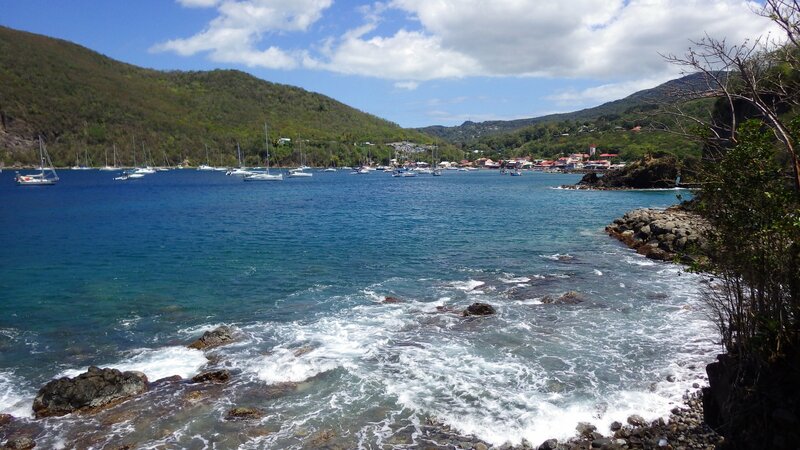 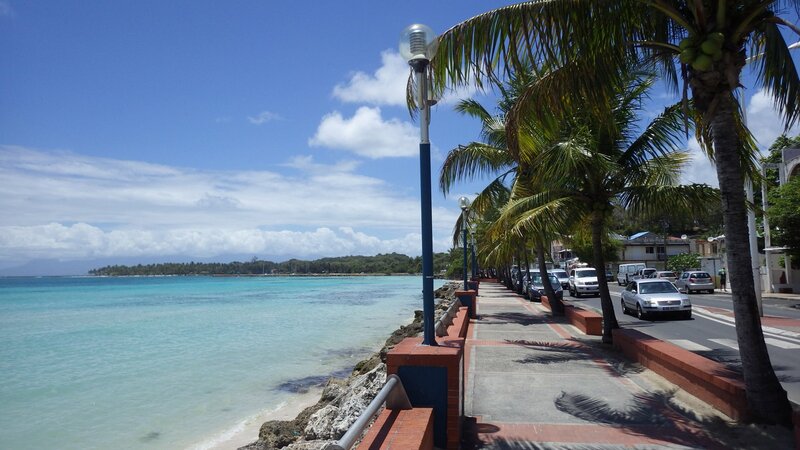 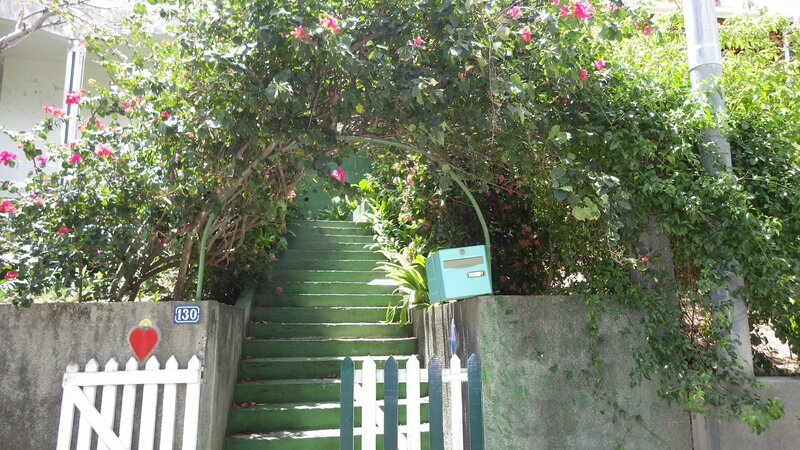 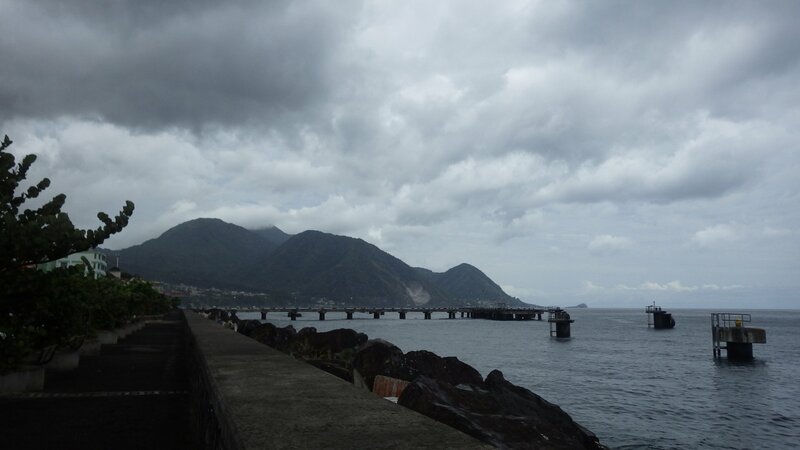 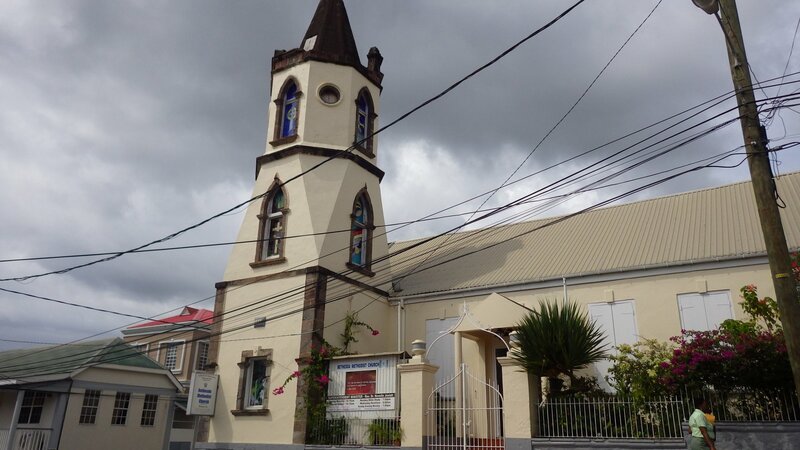 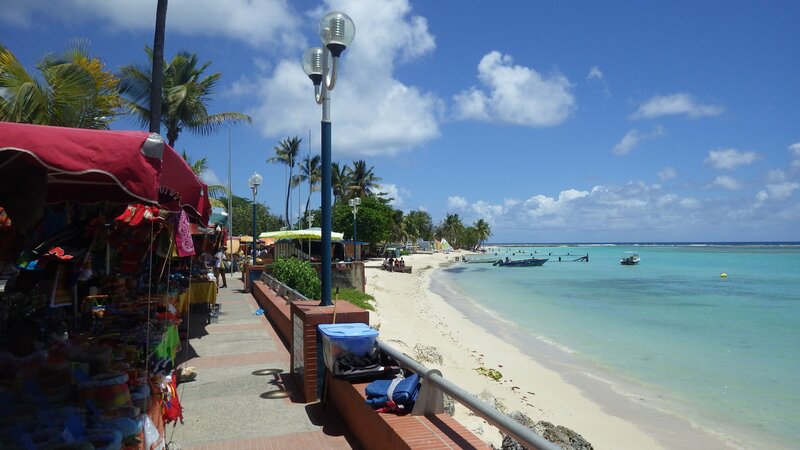 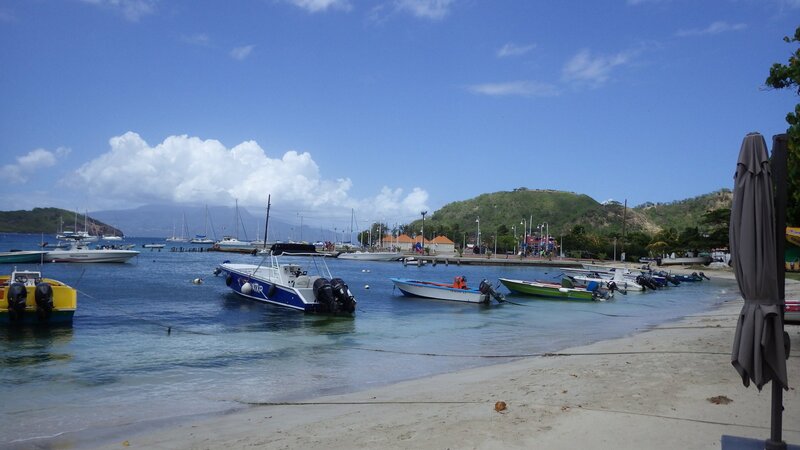 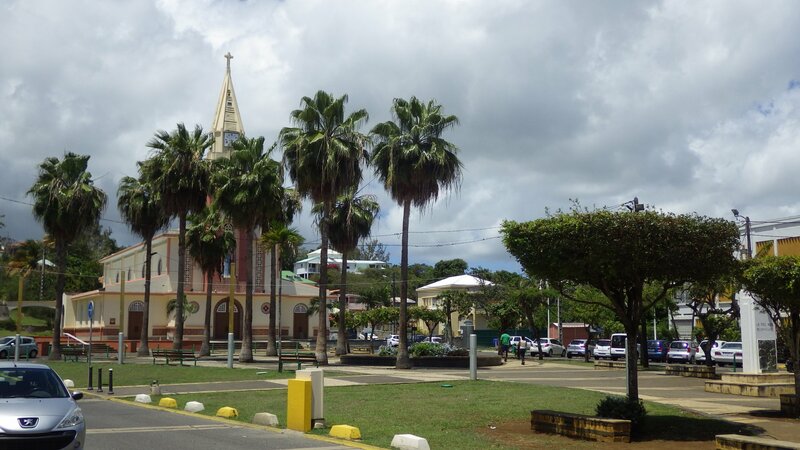 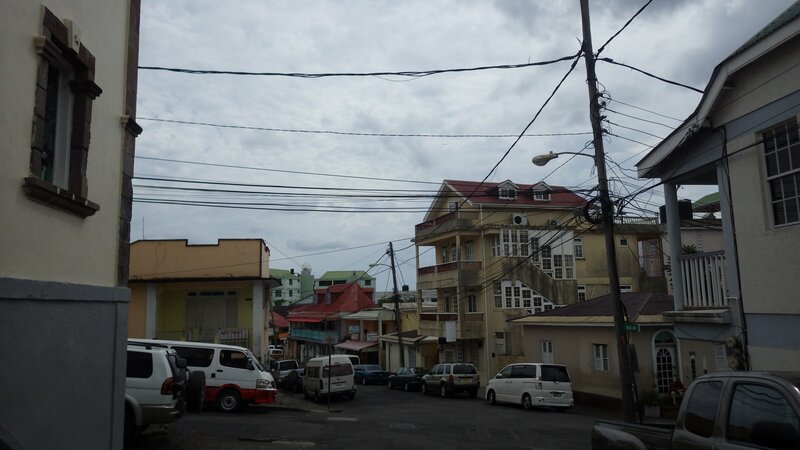 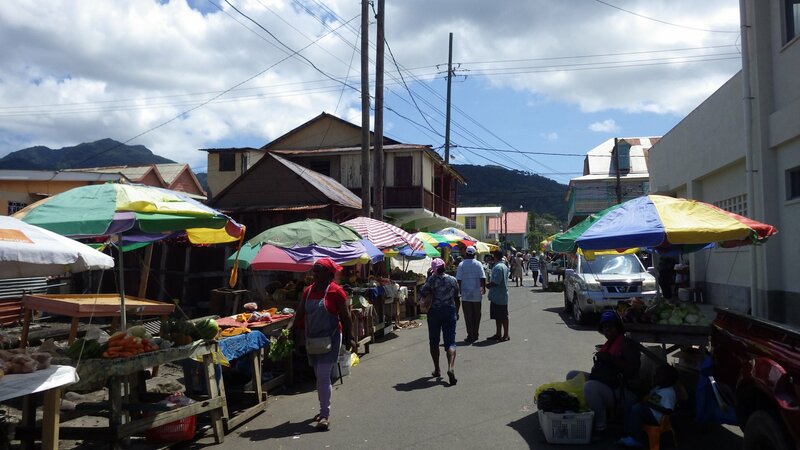 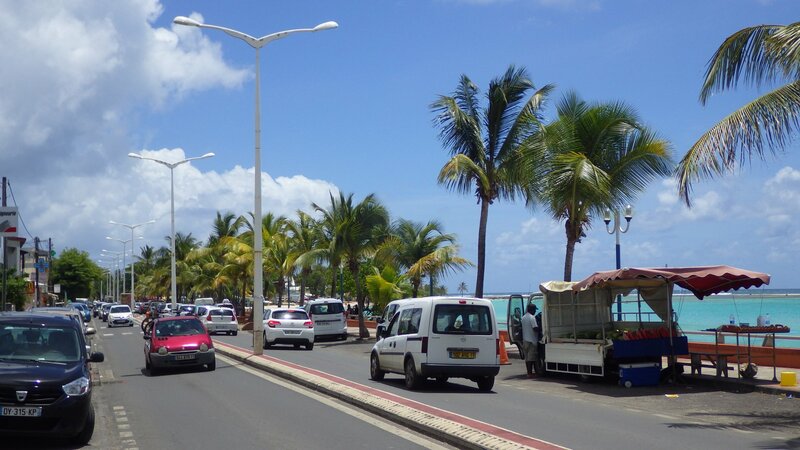 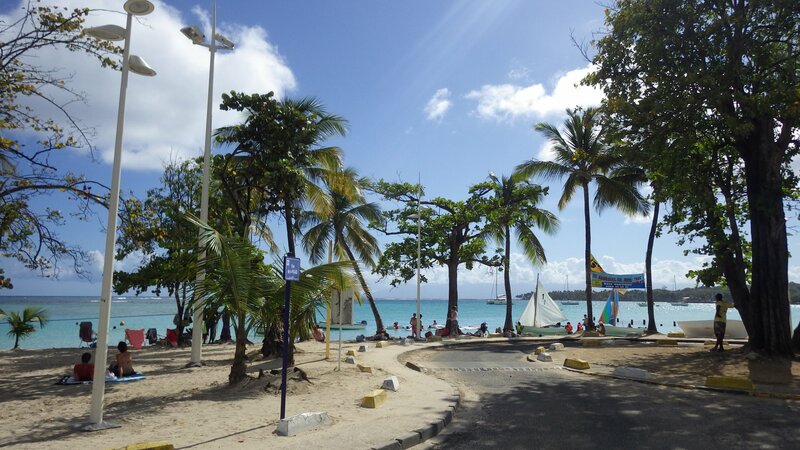 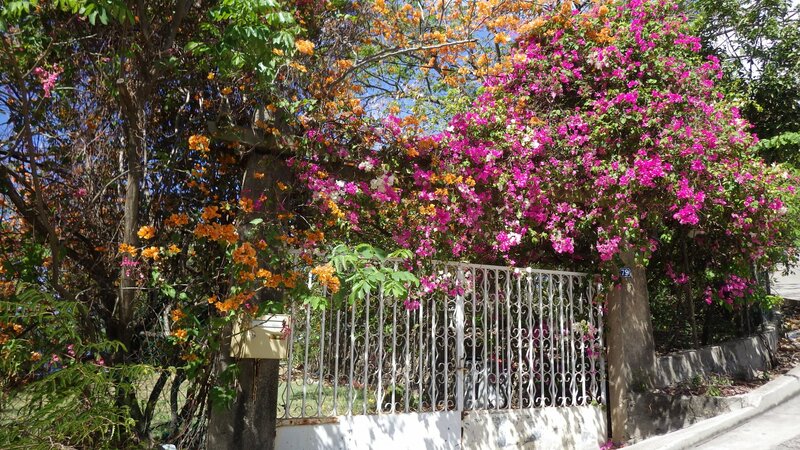 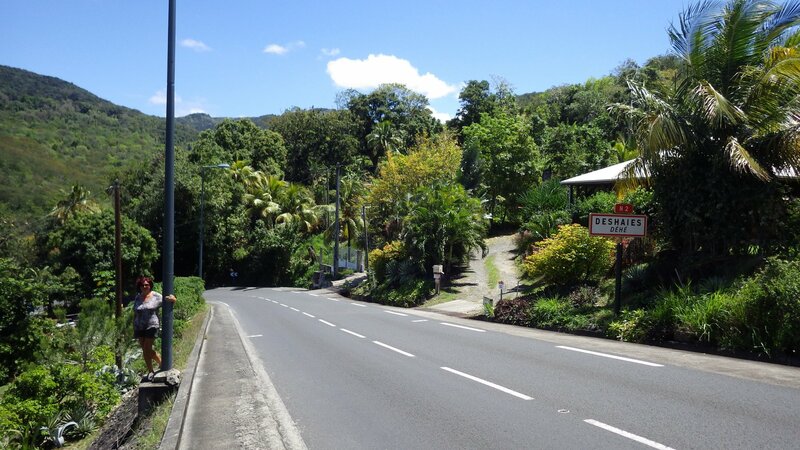 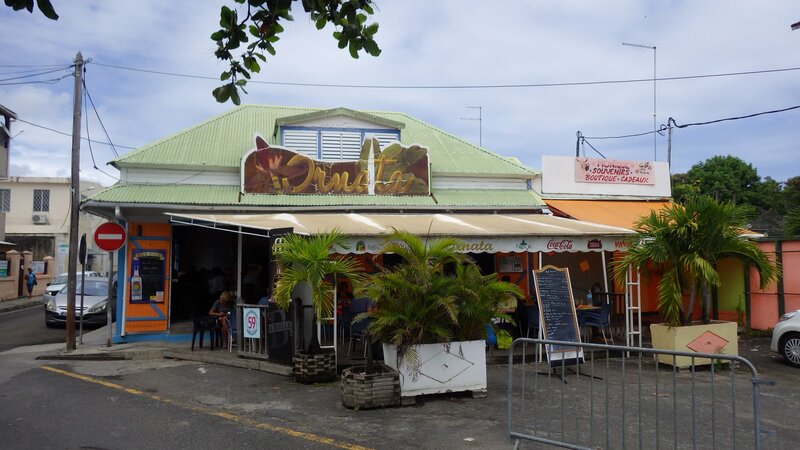 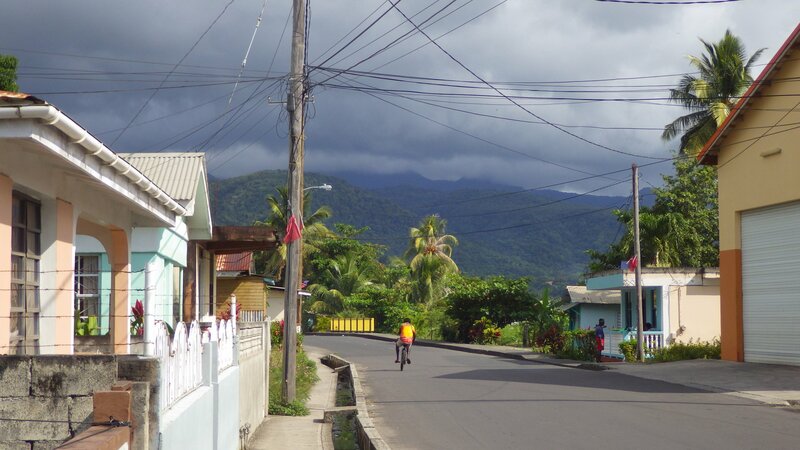 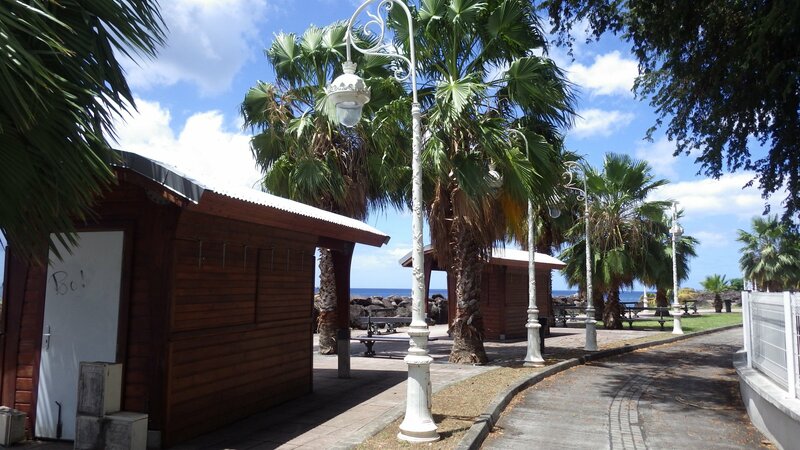 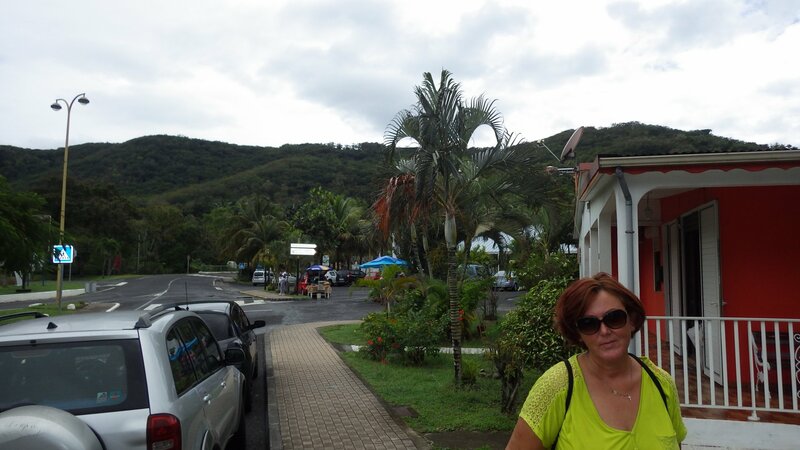 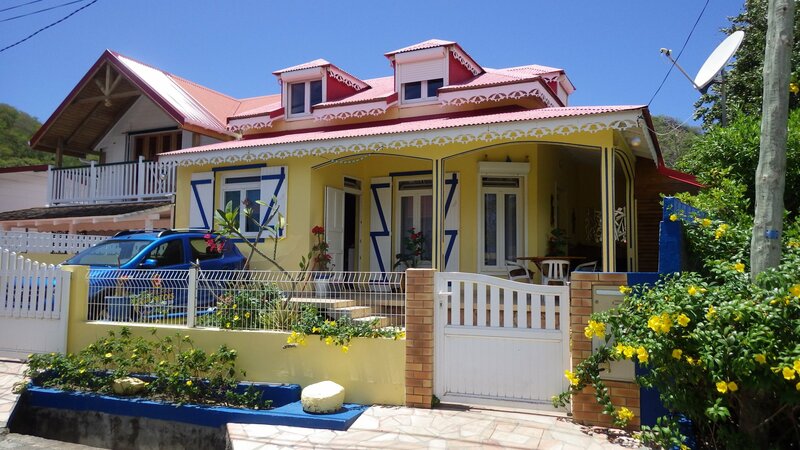 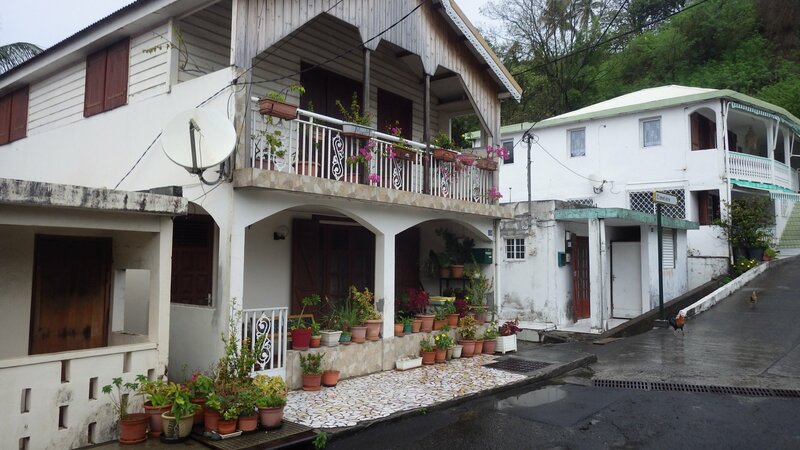 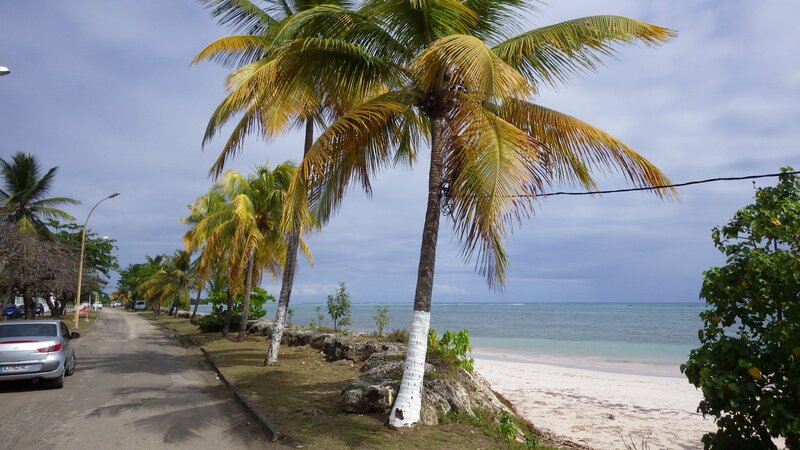 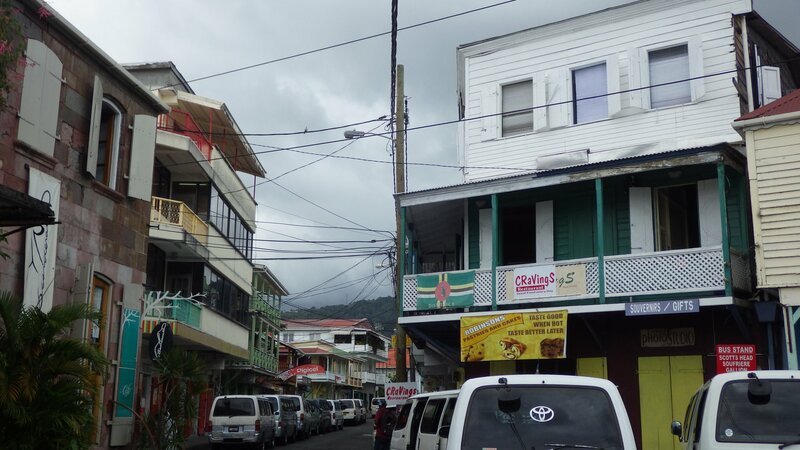 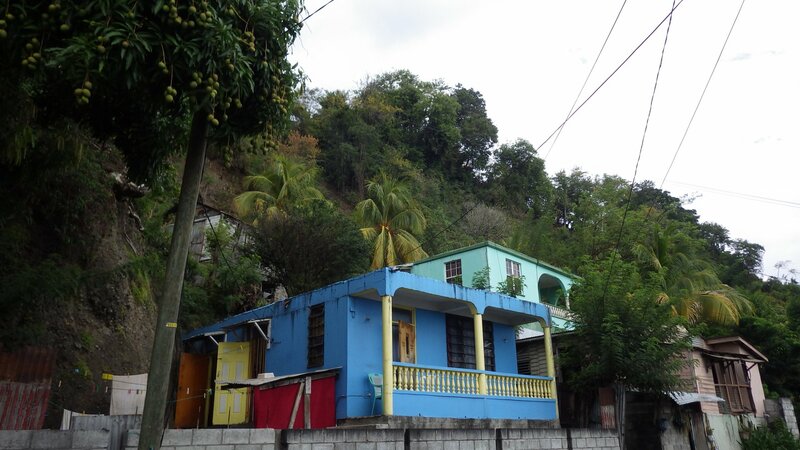 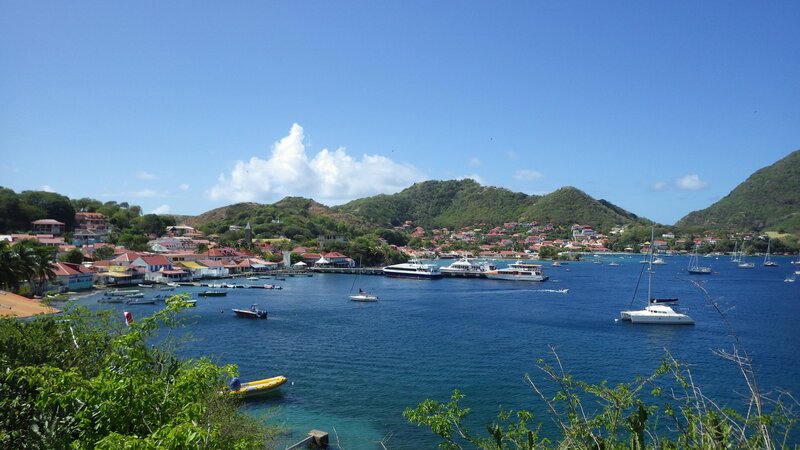 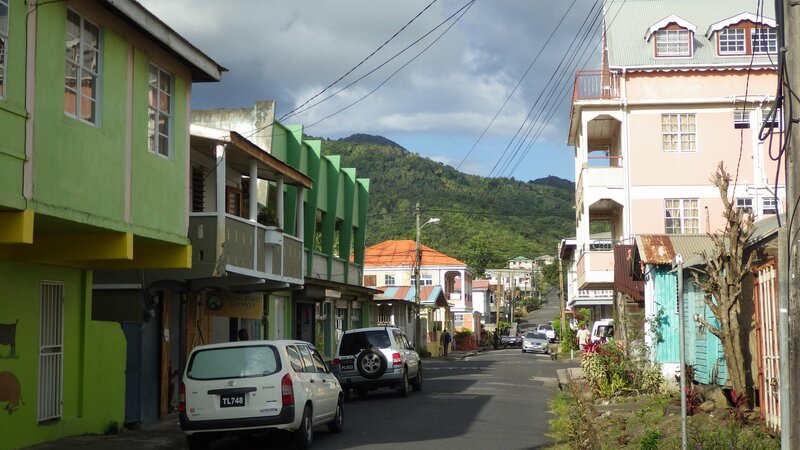 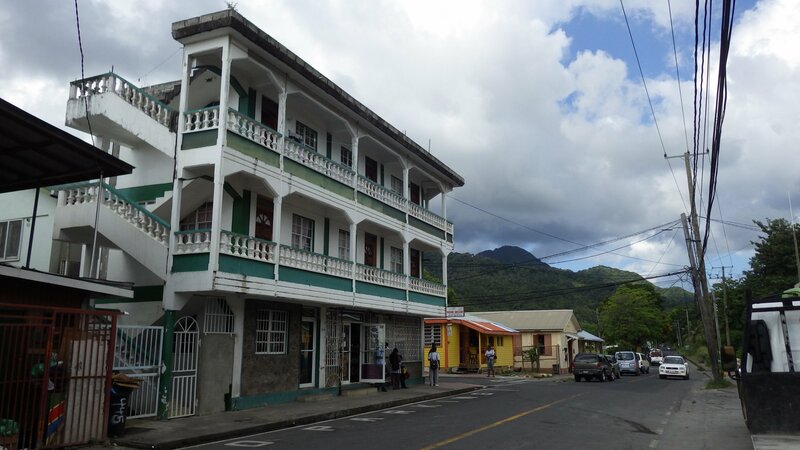 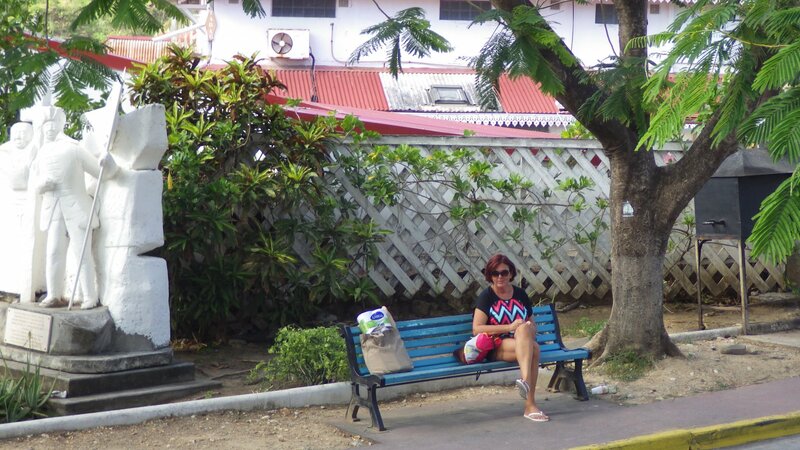 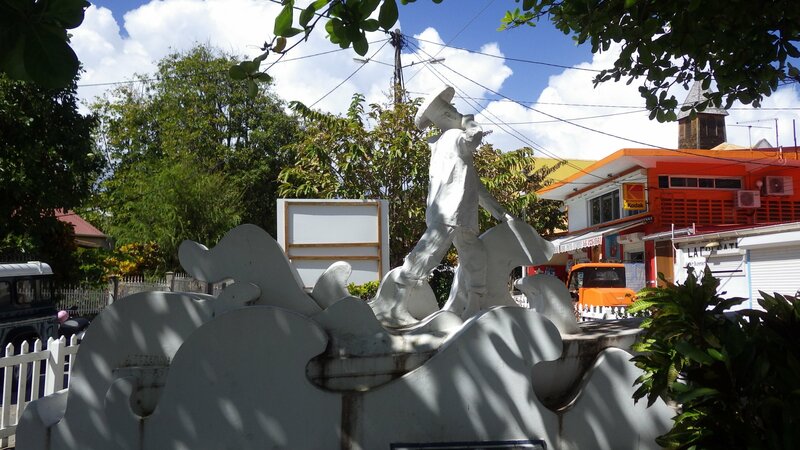 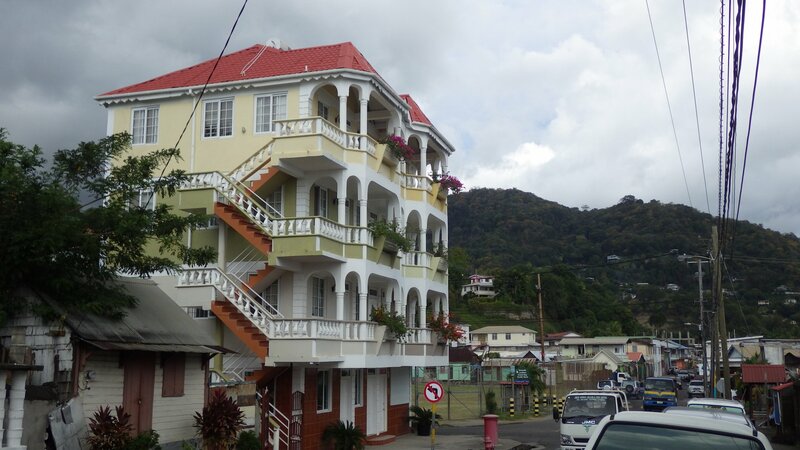 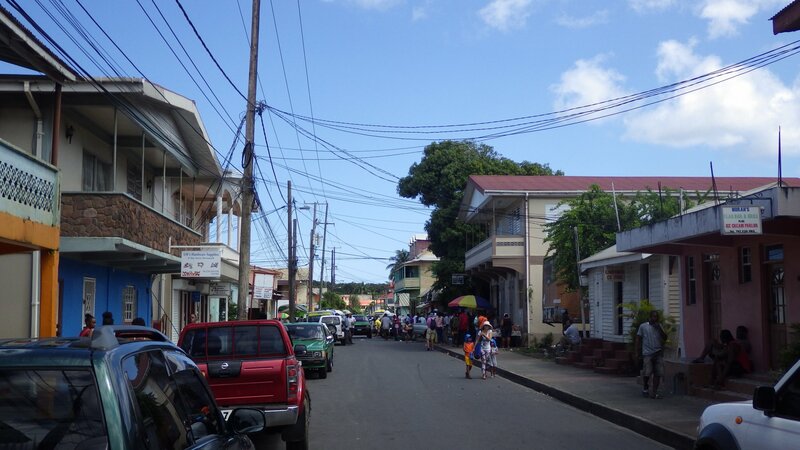 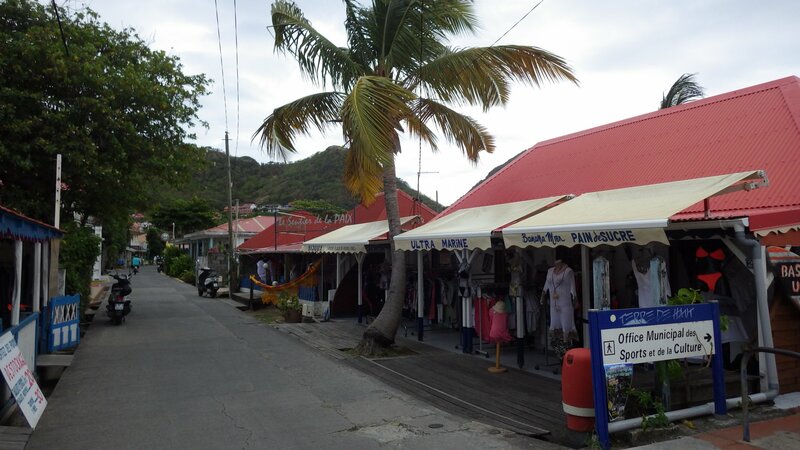 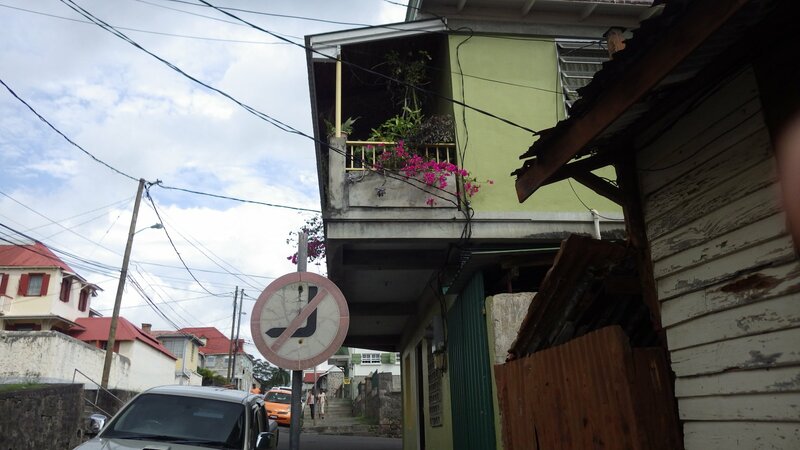 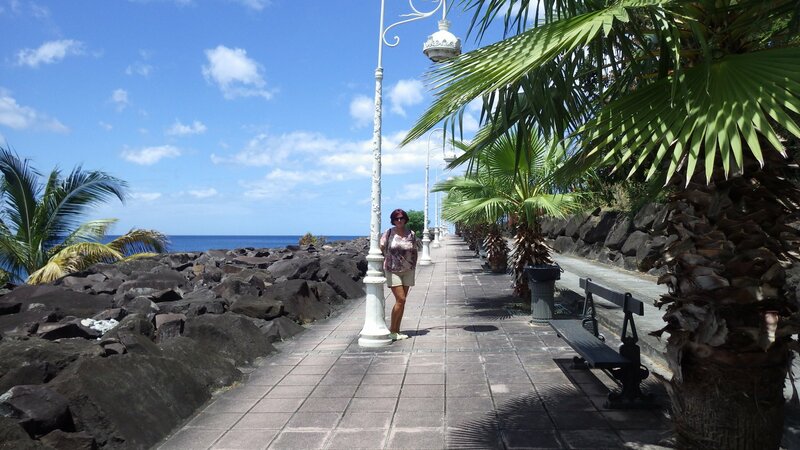 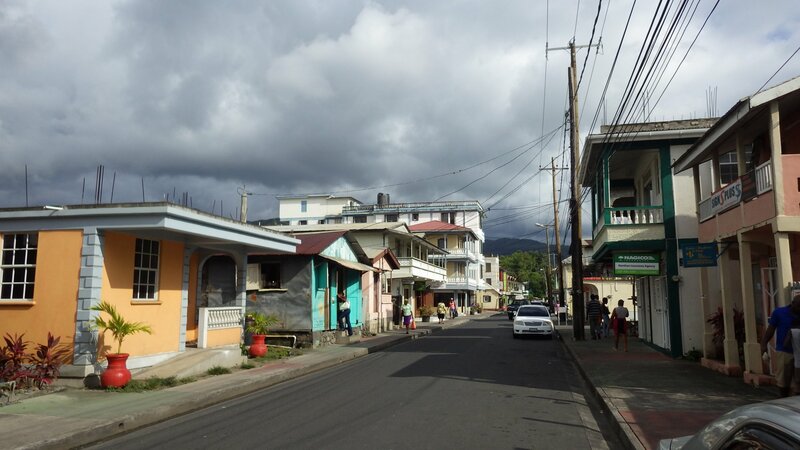 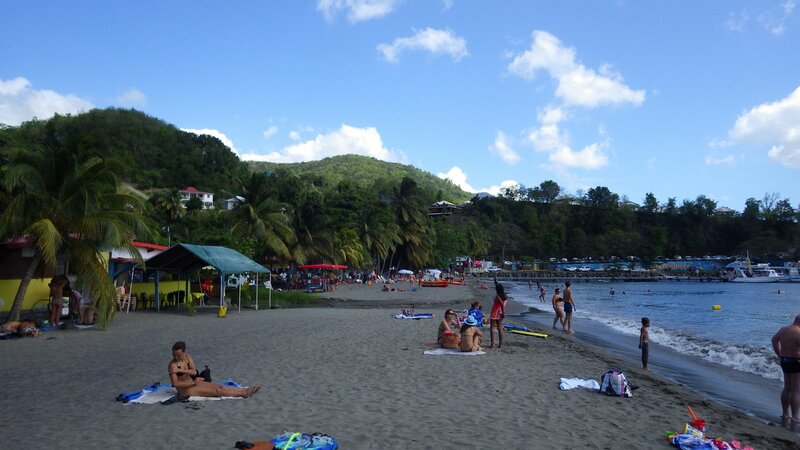 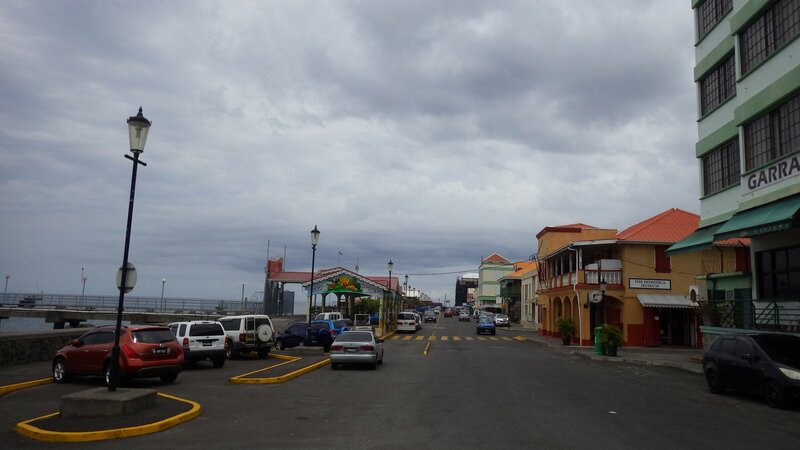 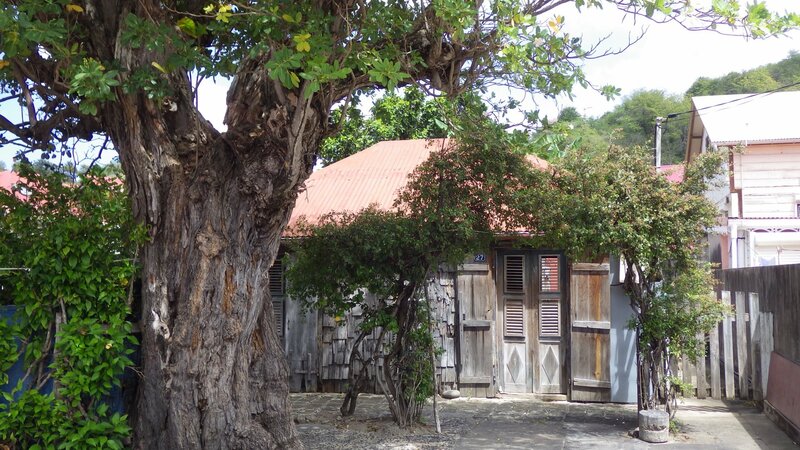 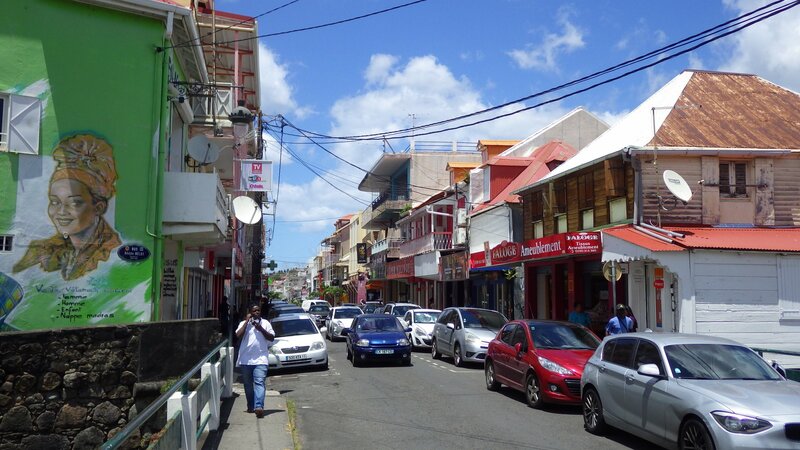 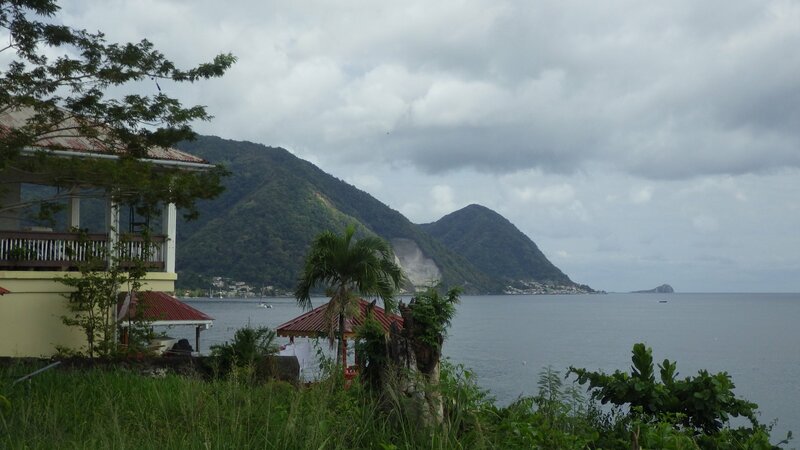 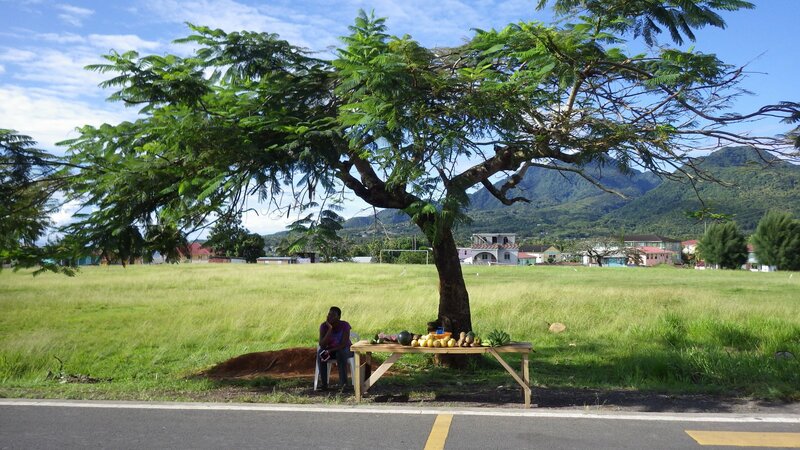 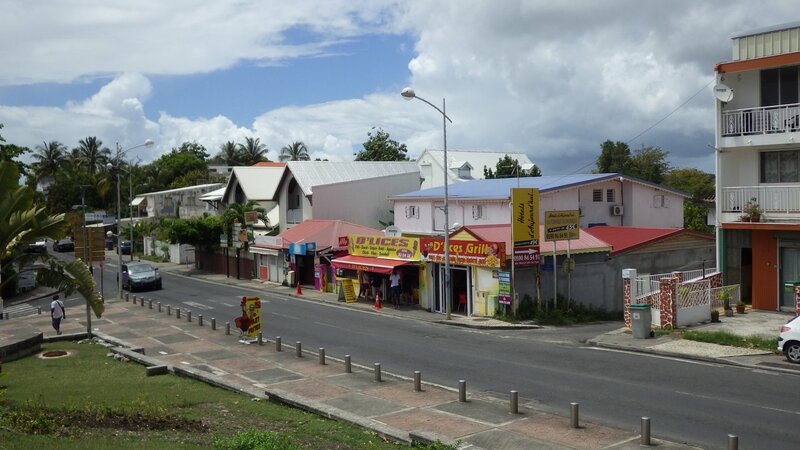 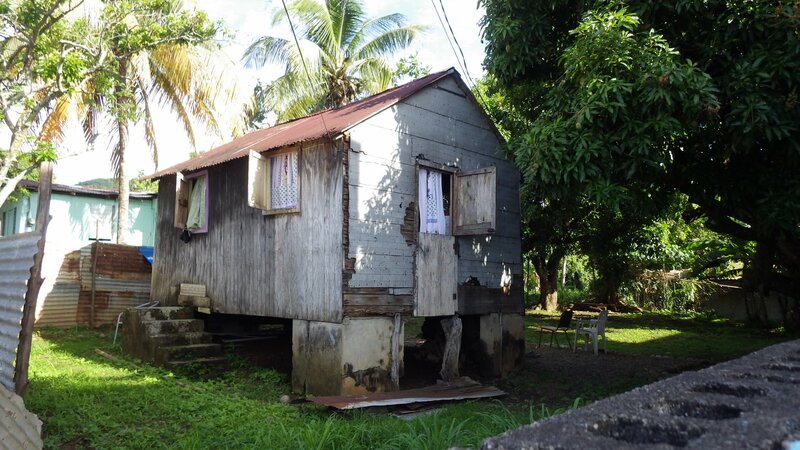 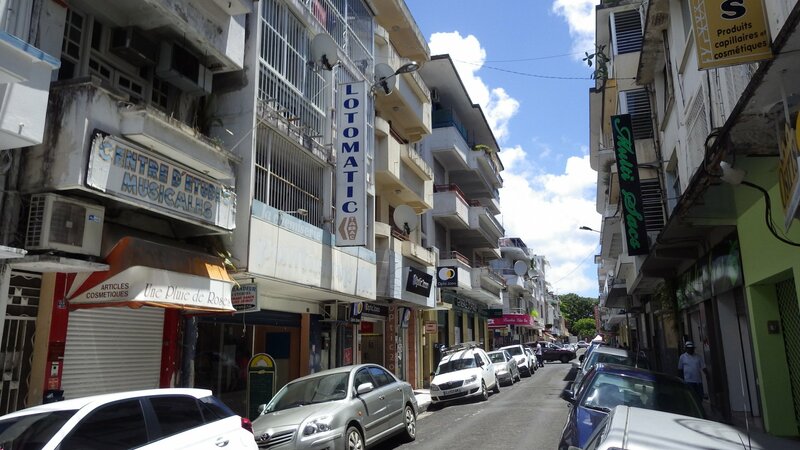 We walked to the nearby town of Basse-Terre. 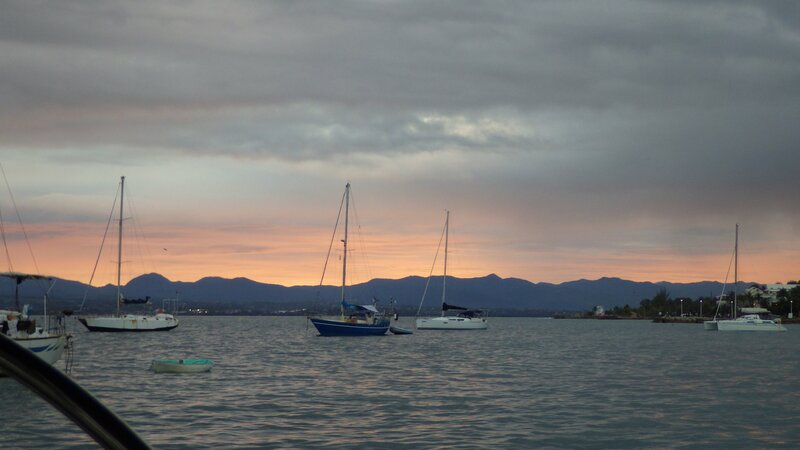 It's about a mile from our anchorage, along the well done shoreline walkway. 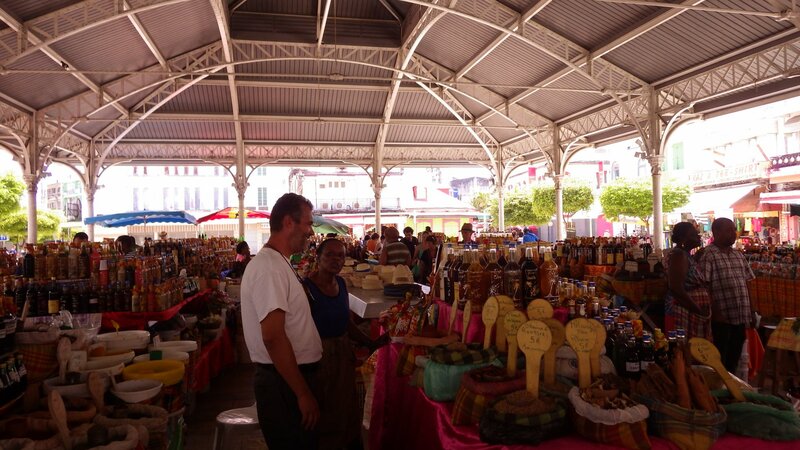 The town's marketplace there is quite interesting, as well as its downtown. 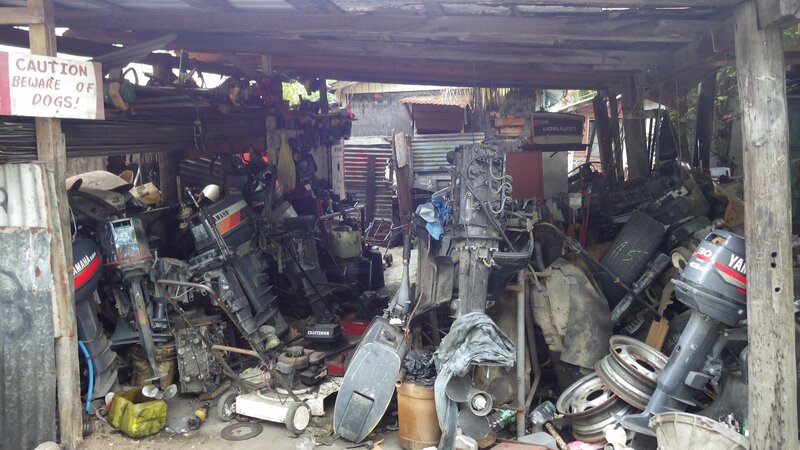 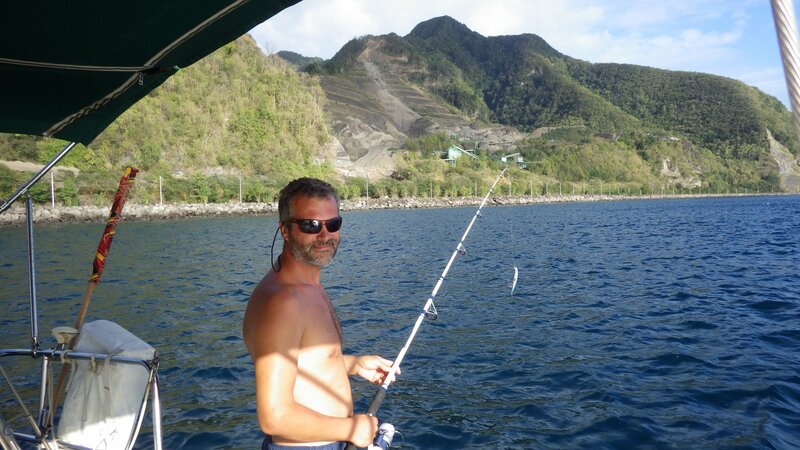 We were also staying there waiting for the broken Lewmar winch part to arrive. 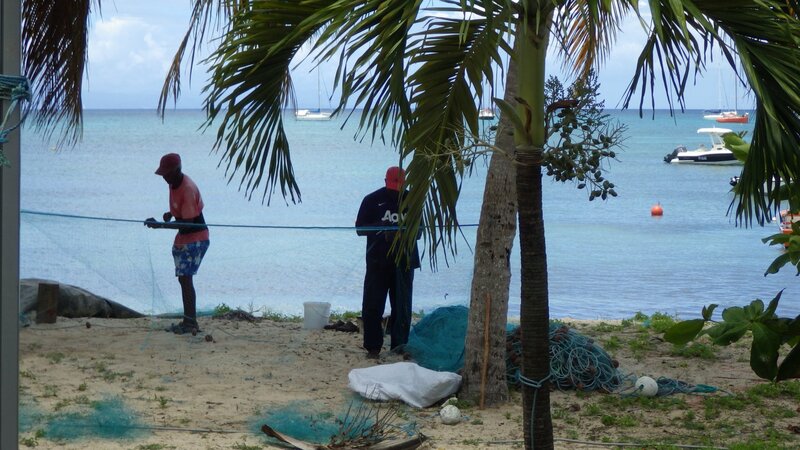 Meanwhile, did some fishing, boat hull bottom cleaning, etc. 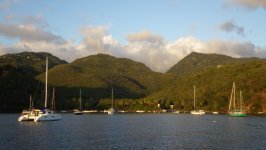 Unfortunately, as it turns out, the whole west coast of Guadeloupe is quite rolly, and there are no good anchorages to hide. 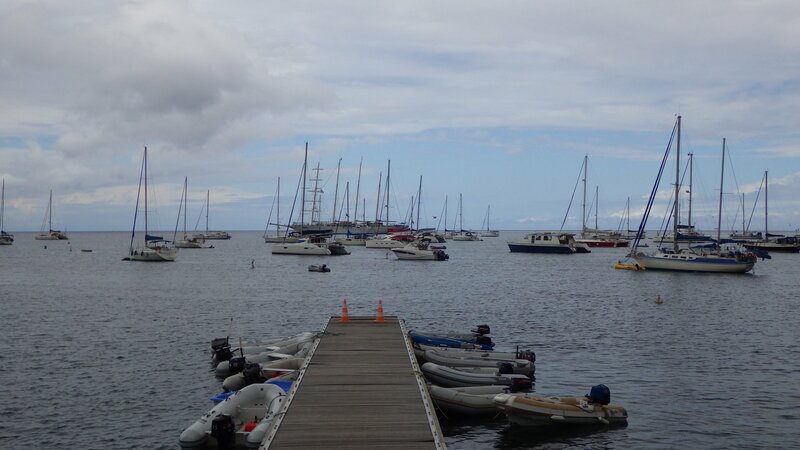 Also, the only place to get water into the boat's tanks is at the Marina Riviere Sens - and with small med-moor only docks that was not easy. 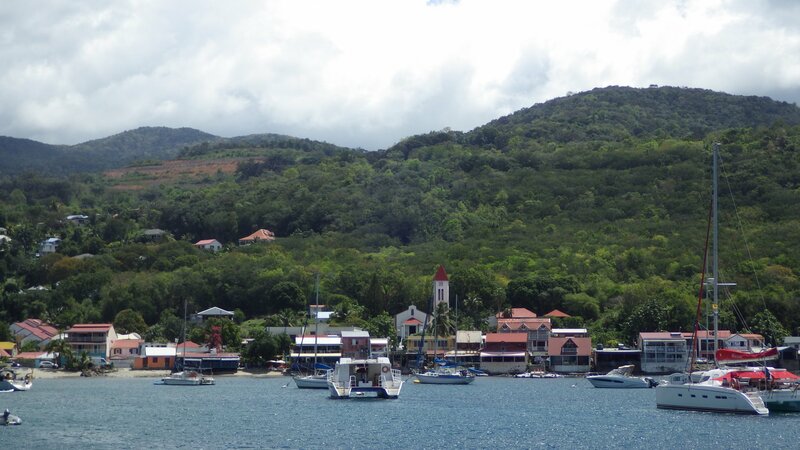 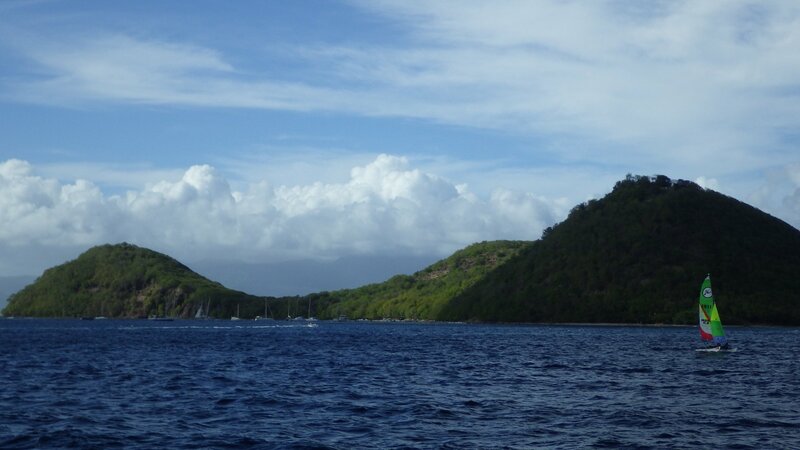 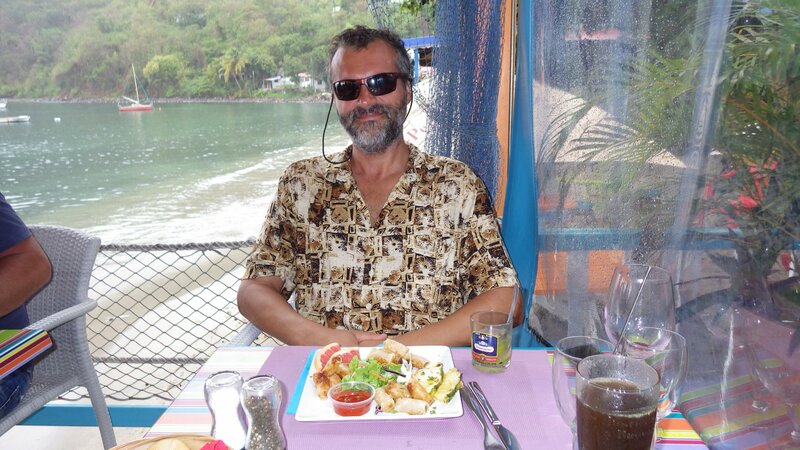 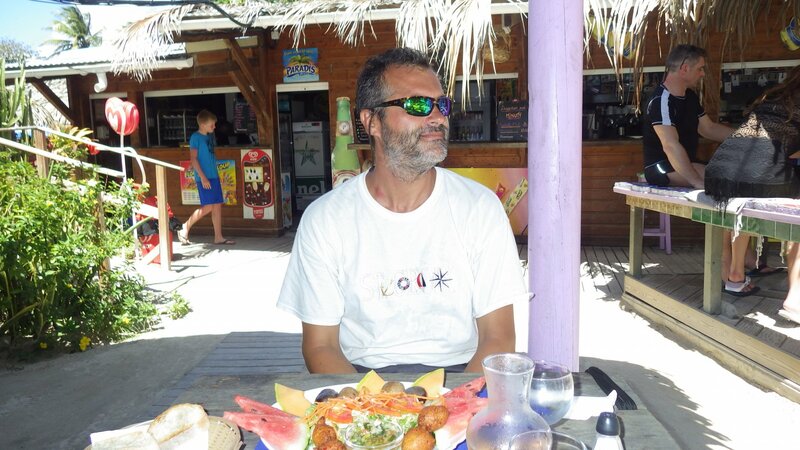 After a windy but short passage from Guadeloupe, we arrived at The Saintes Islands. 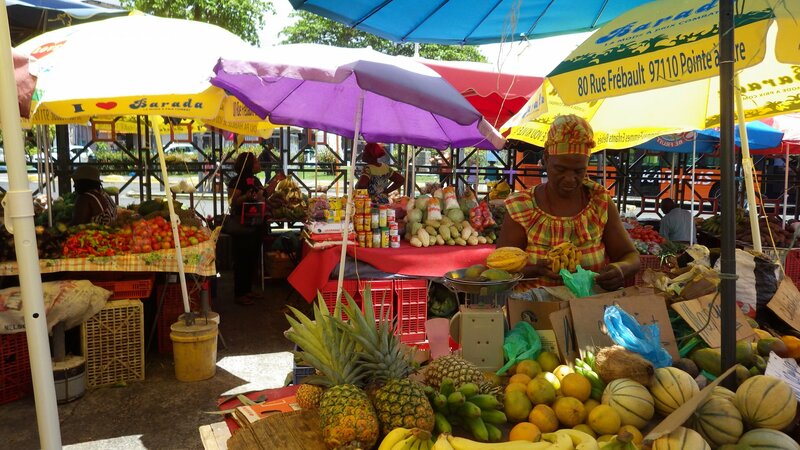 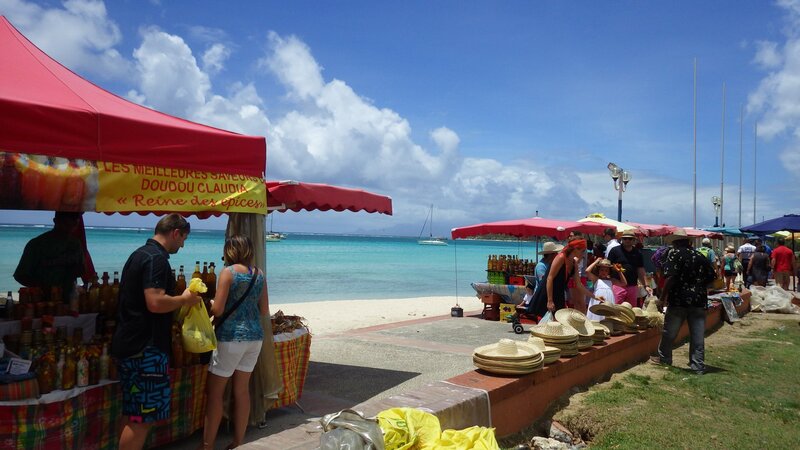 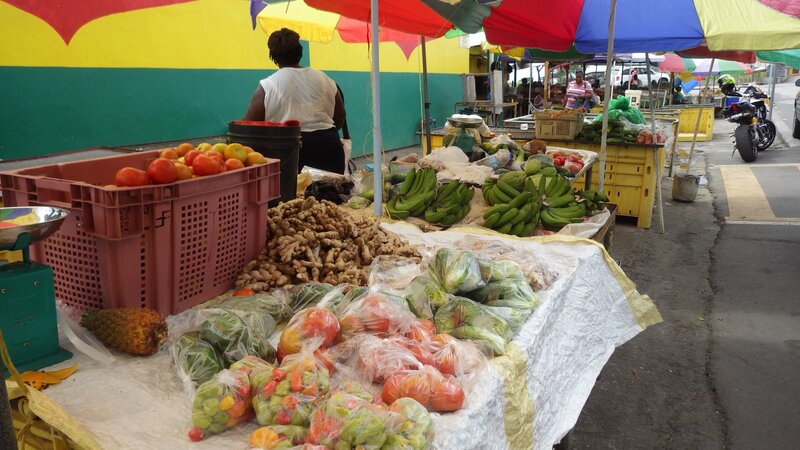 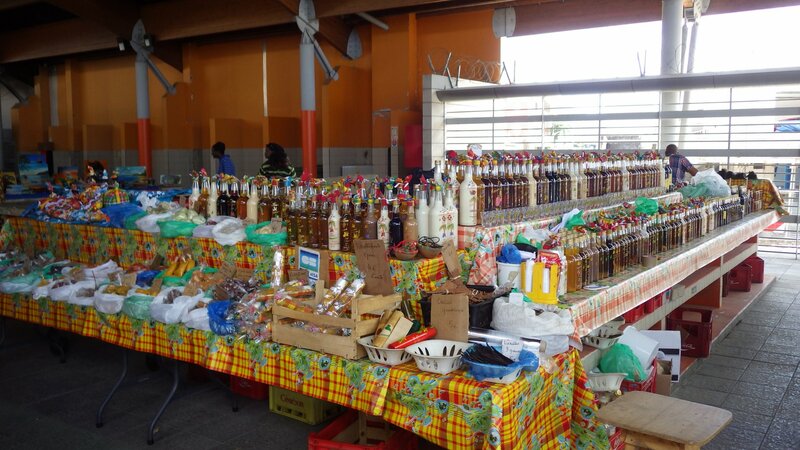 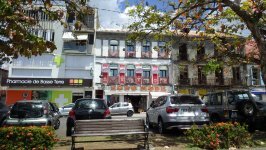 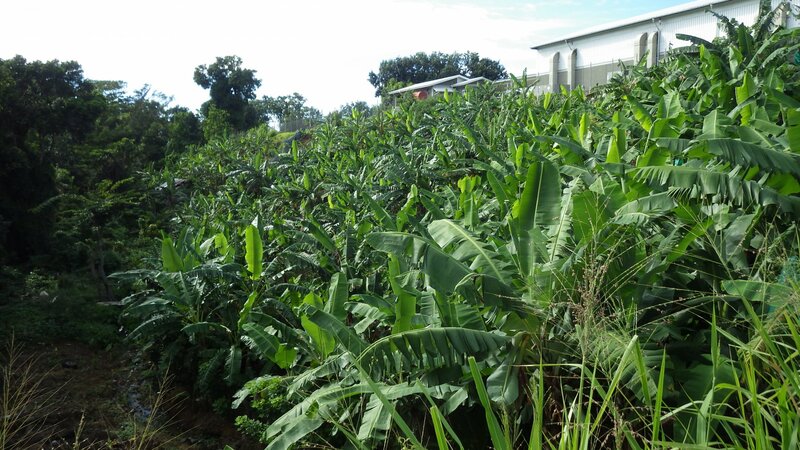 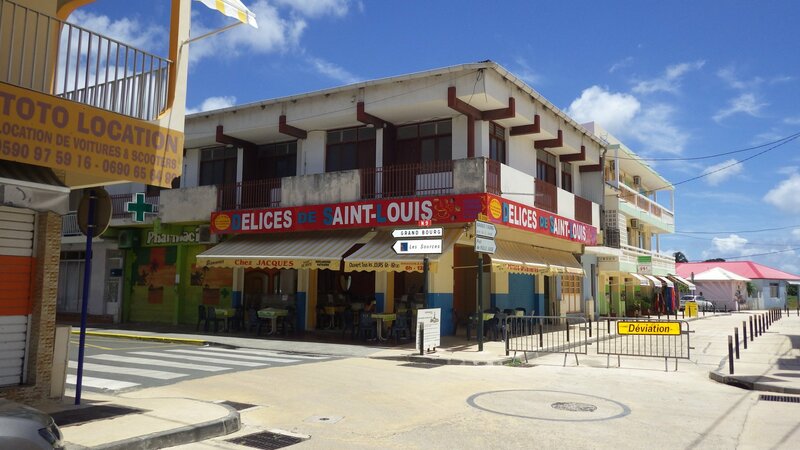 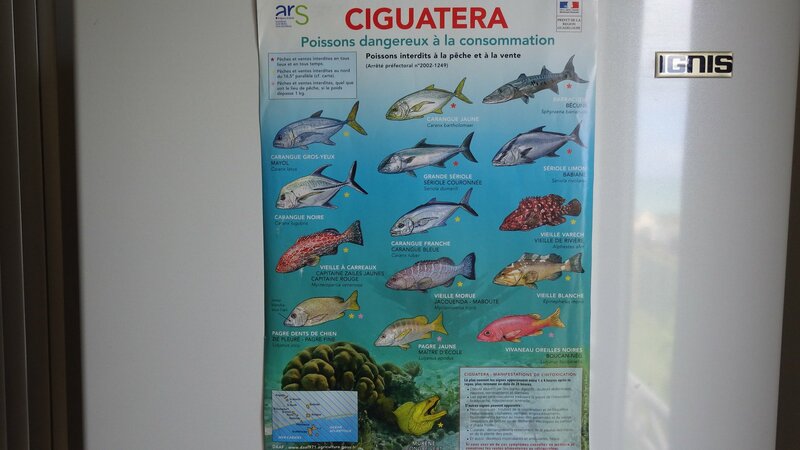 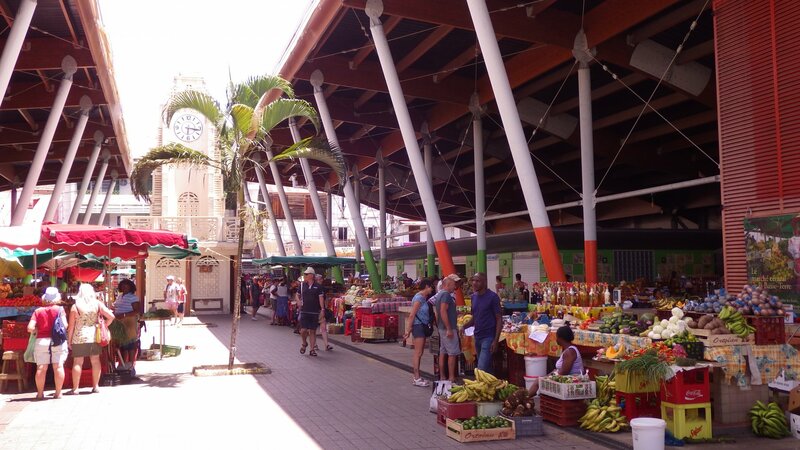 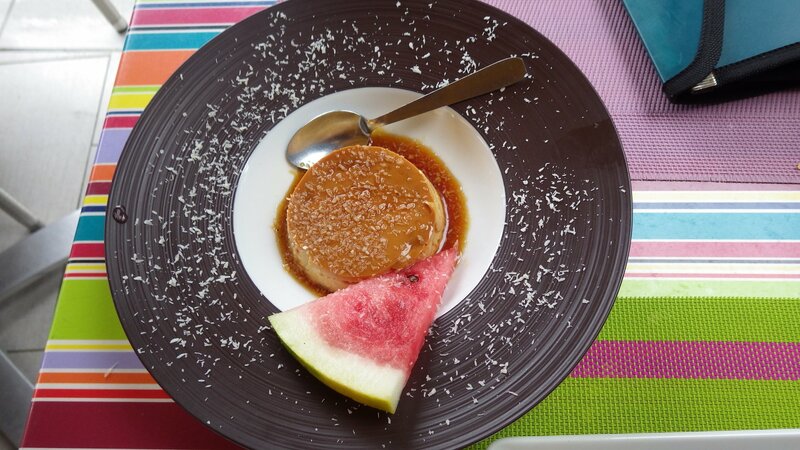 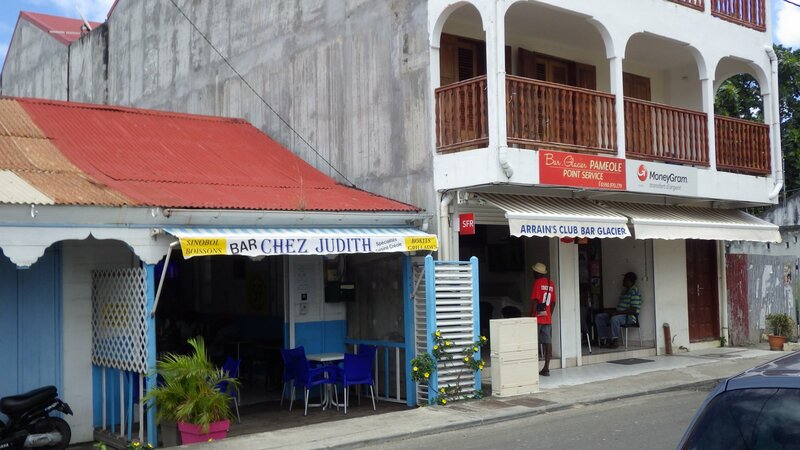 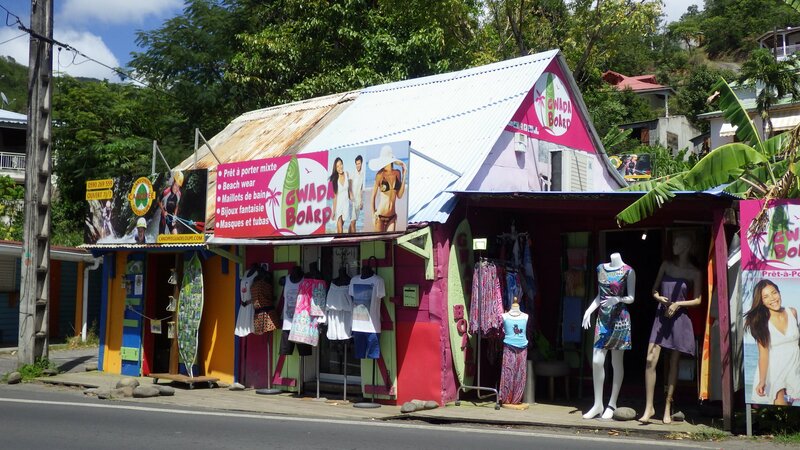 The Sainties are Guadeloupe's dependency, therefore also part of French territories � French language and cuisine, European products in stores, etc. 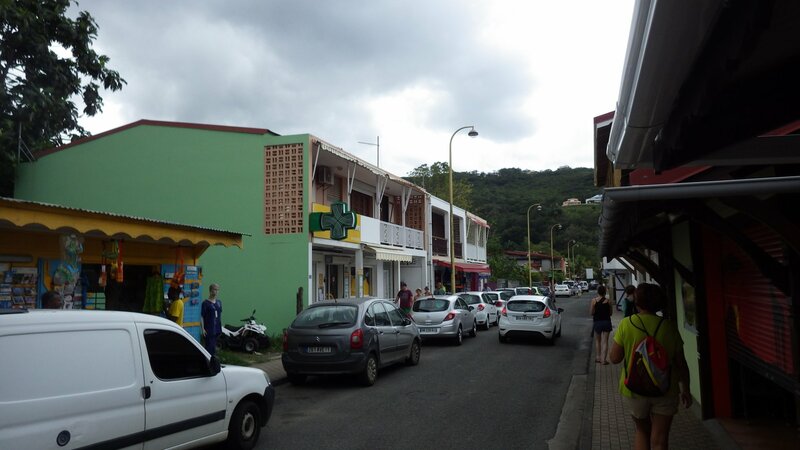 Bourg de Saintes is a small and inviting town with a Gallic charm. 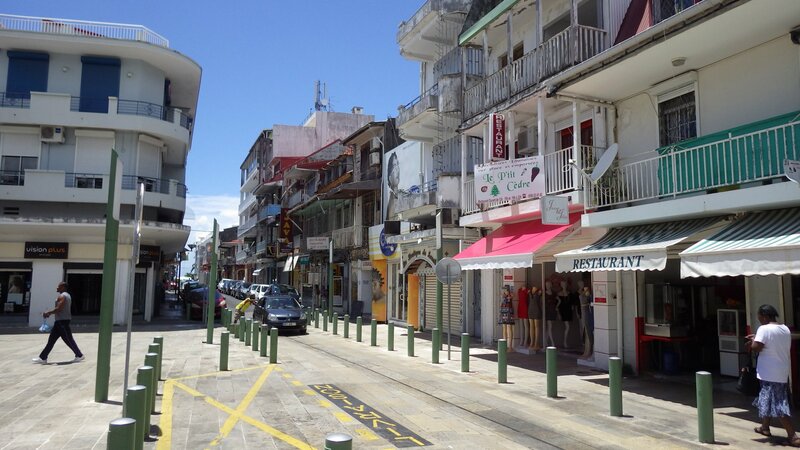 There are many stores, restaurants and some basic services. 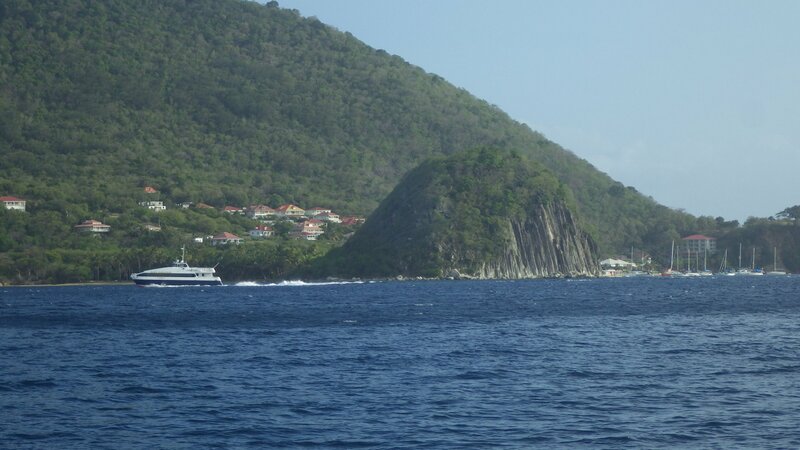 Quite few tourists arrive by ferry daily. 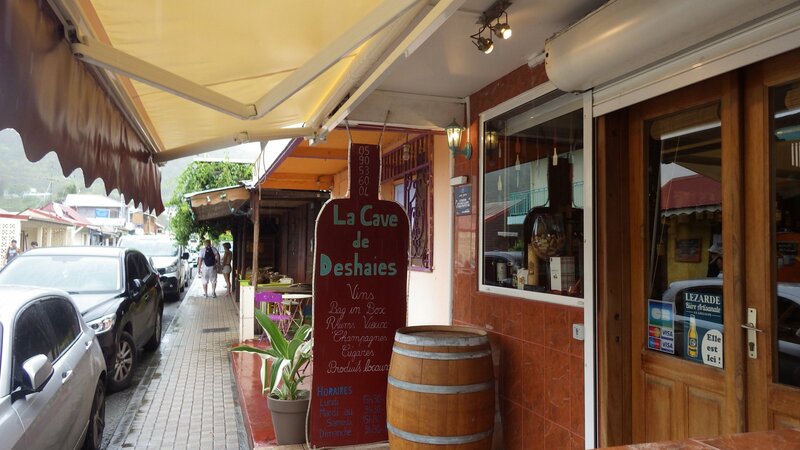 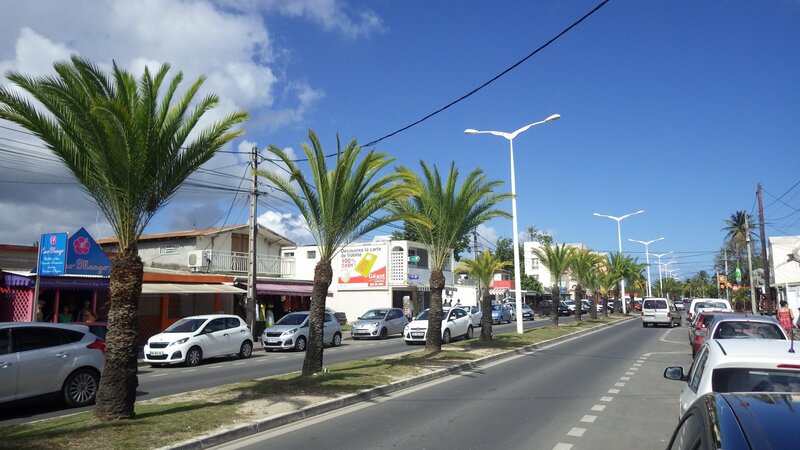 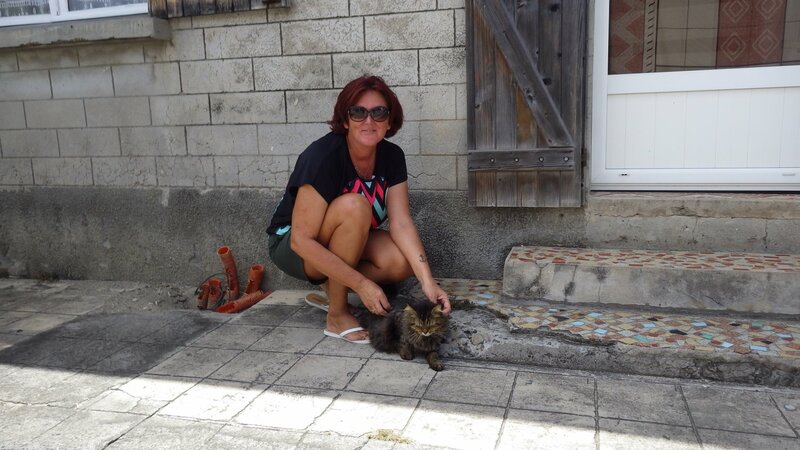 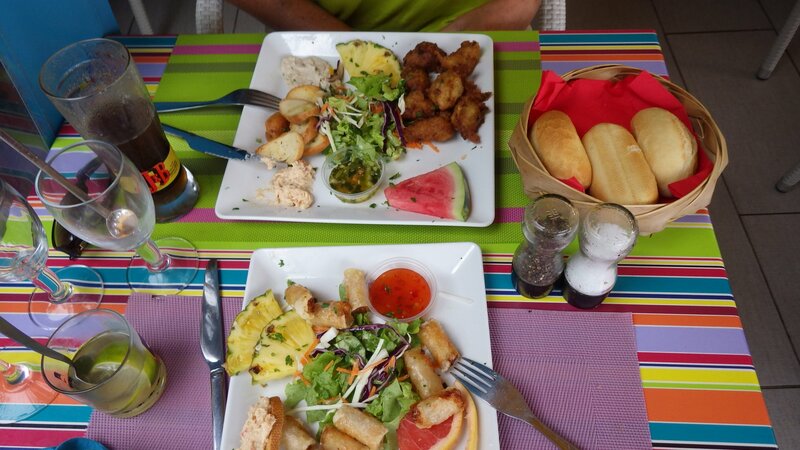 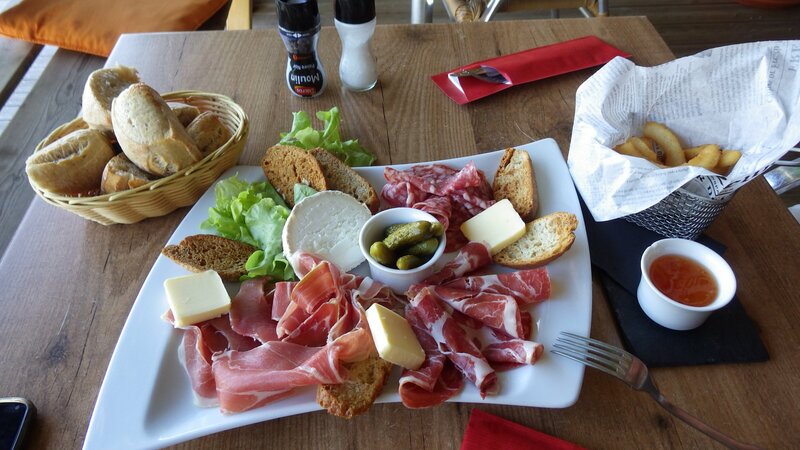 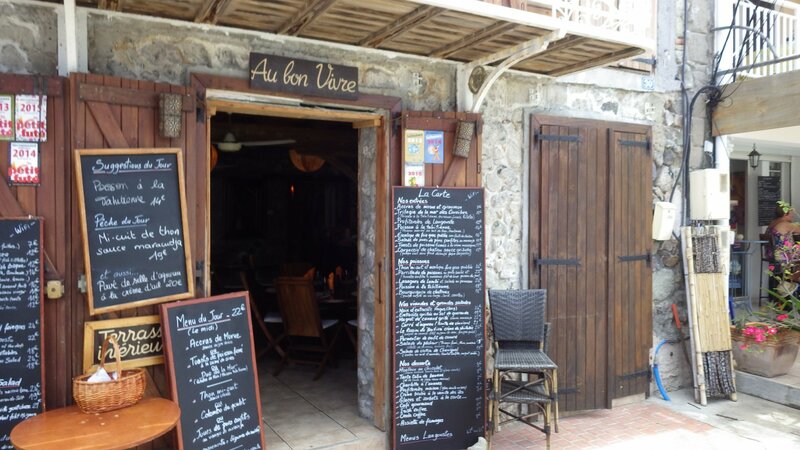 We wondered along town streets, tasted couple restaurants, relaxed on the beach, browsed shops, enjoyed baguettes, pates, tasty fresh vegetables and inexpensive good French vine. 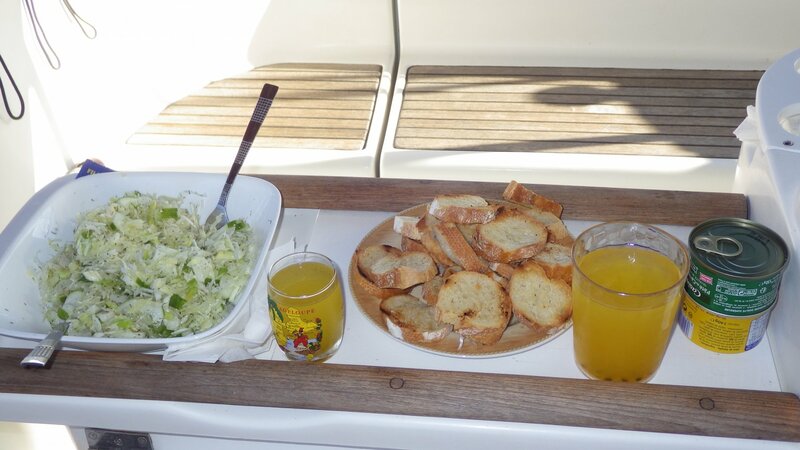 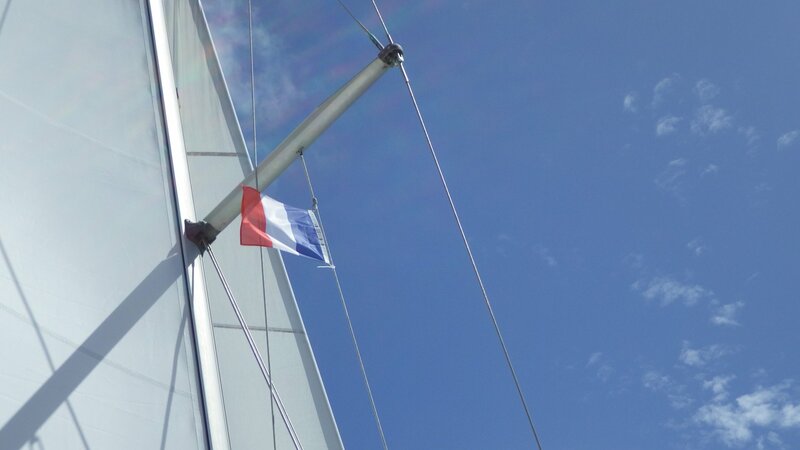 Here it also comes to my mind � our yacht, Beneteau, is also of French design. 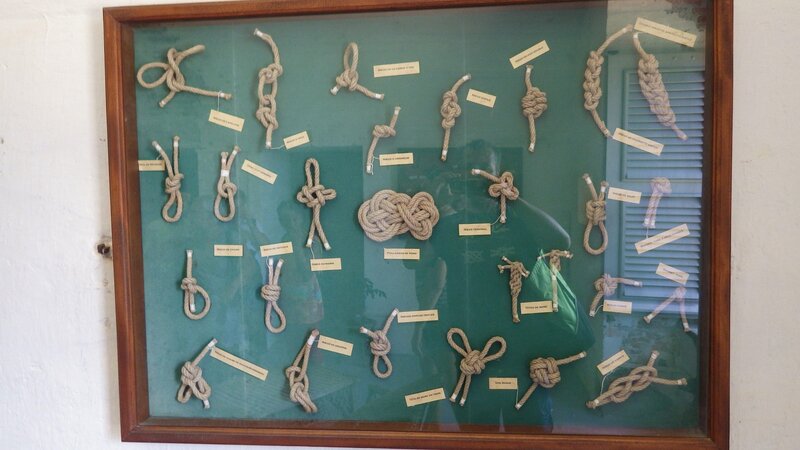 Everything fits nicely here. 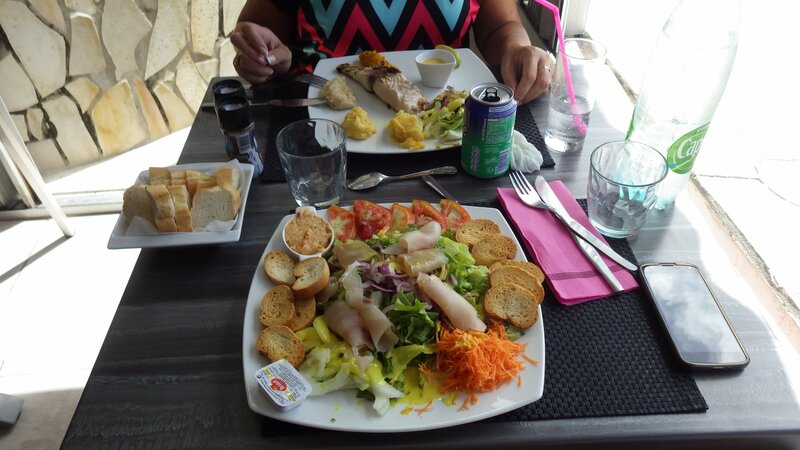 I only wish I could speak some French. 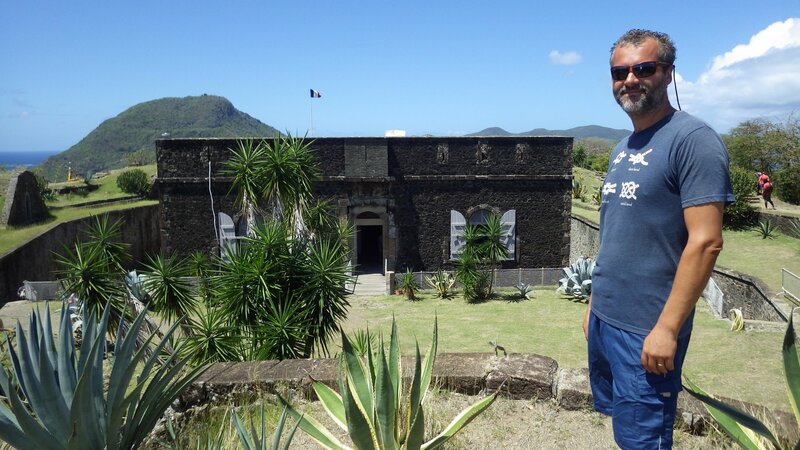 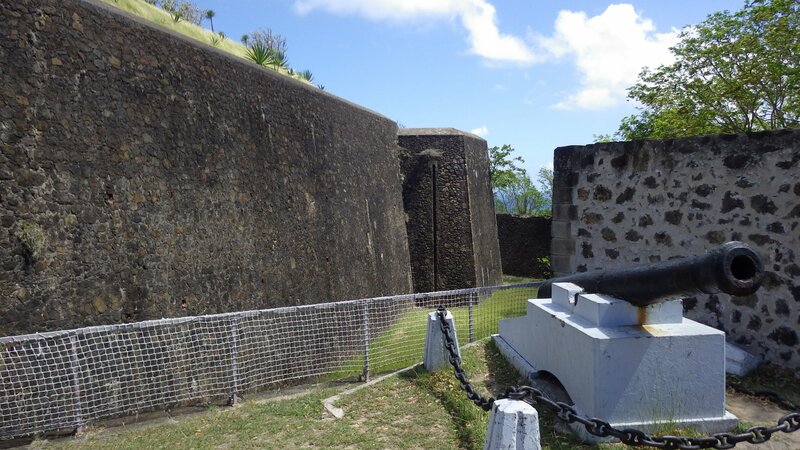 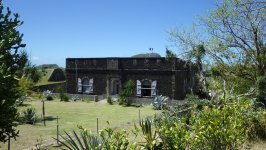 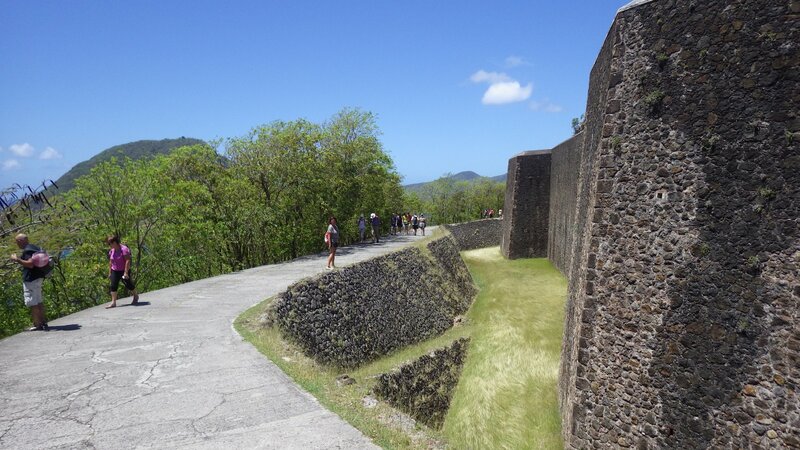 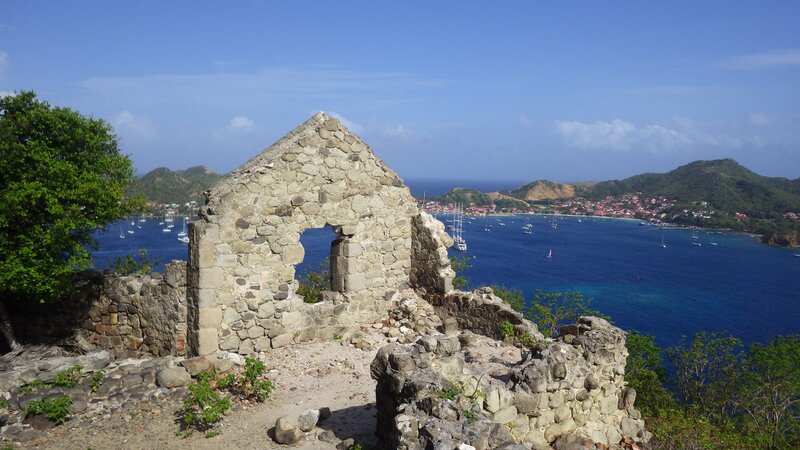 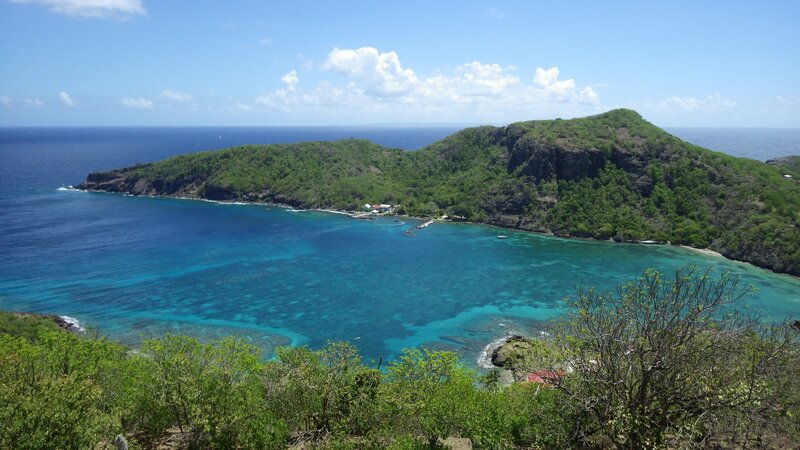 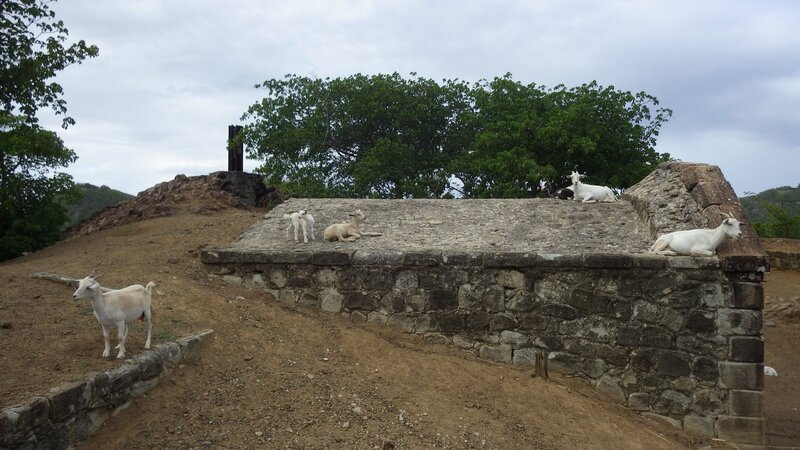 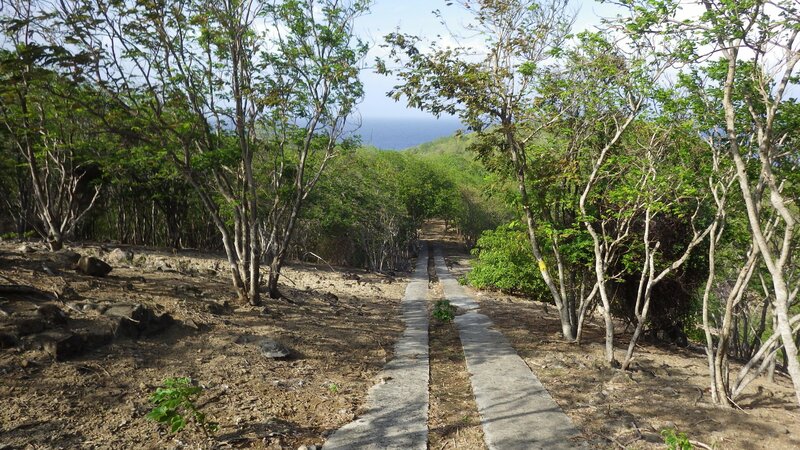 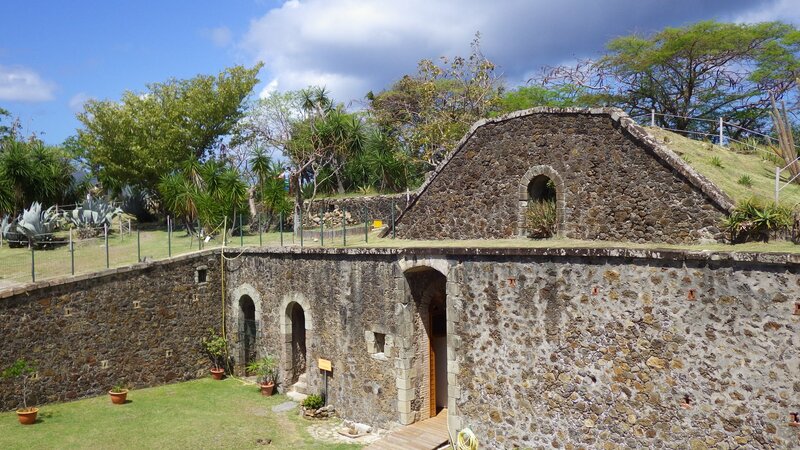 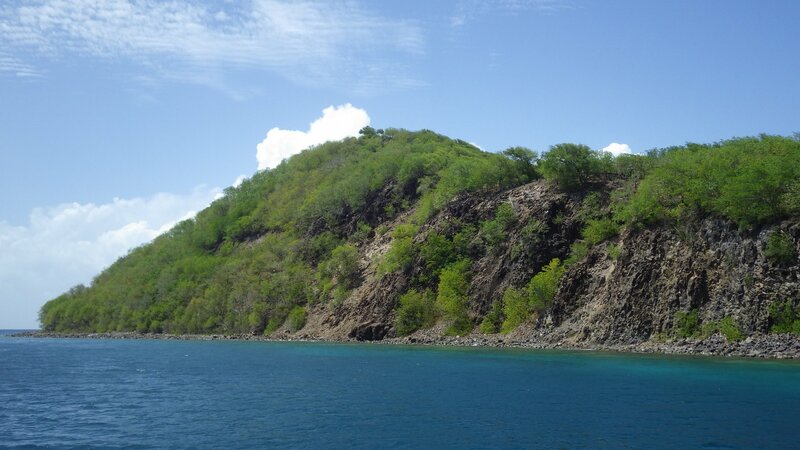 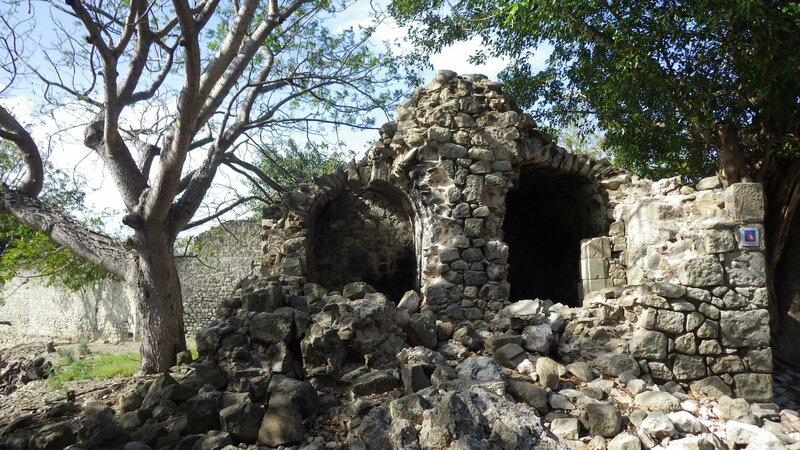 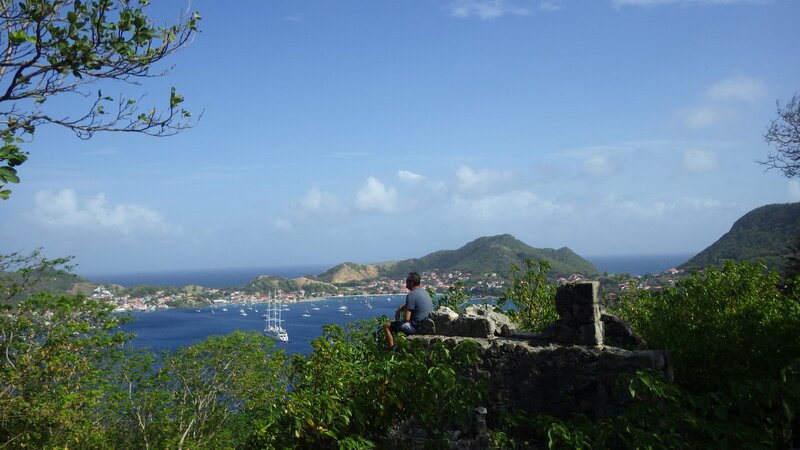 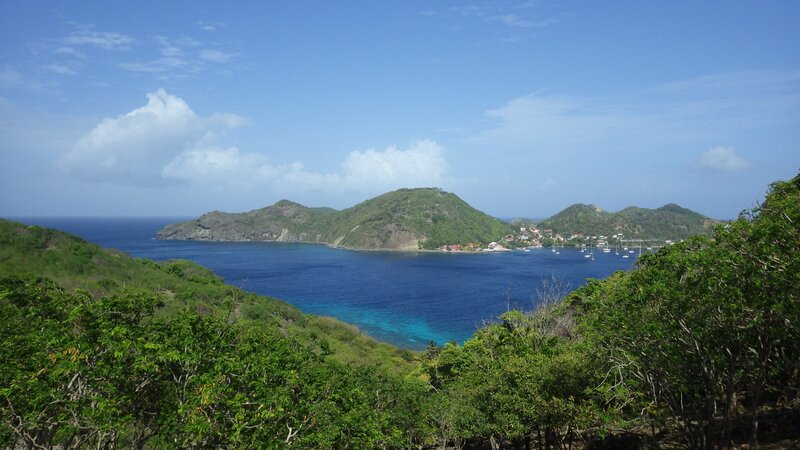 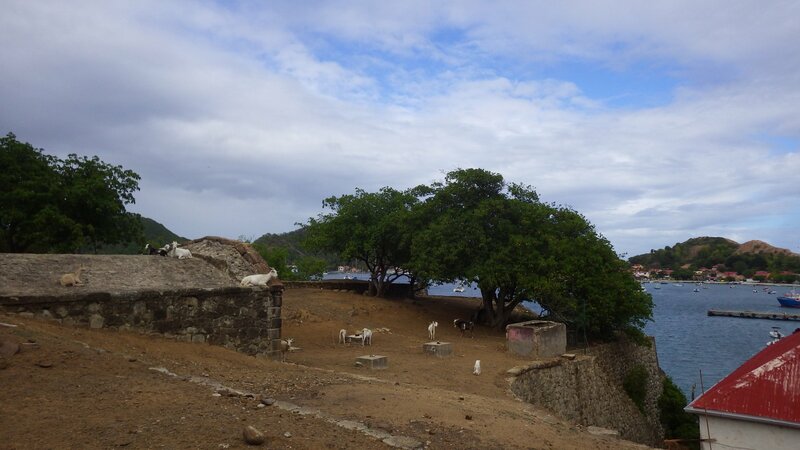 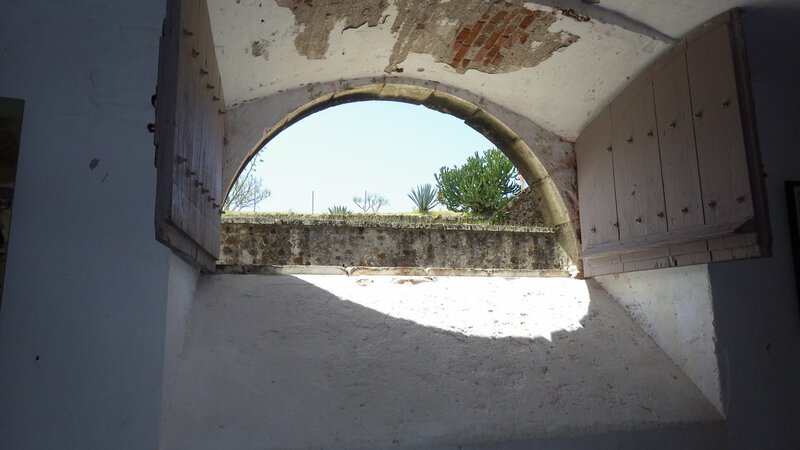 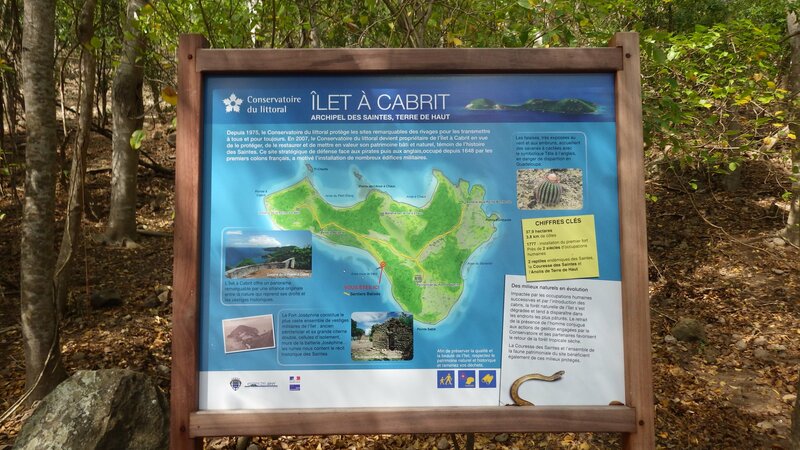 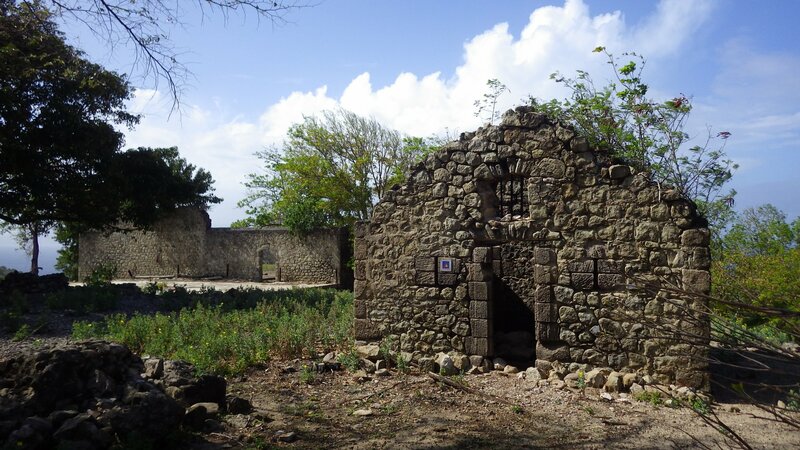 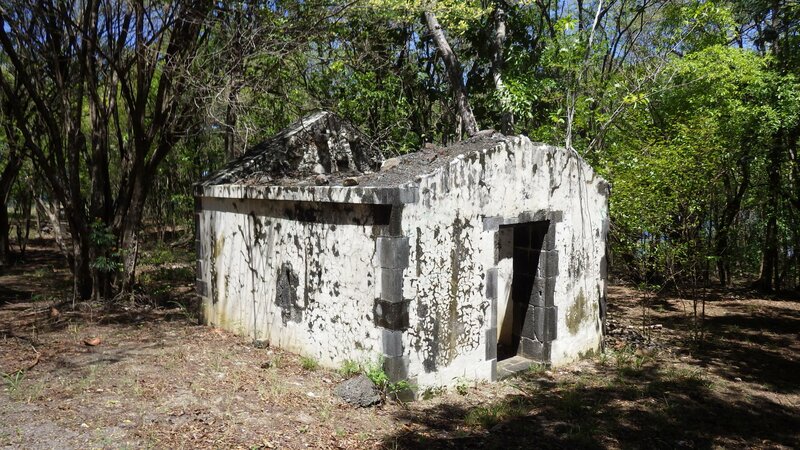 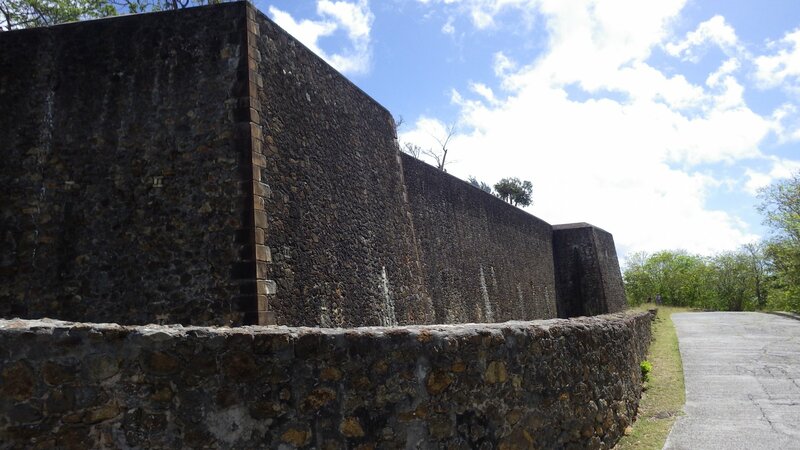 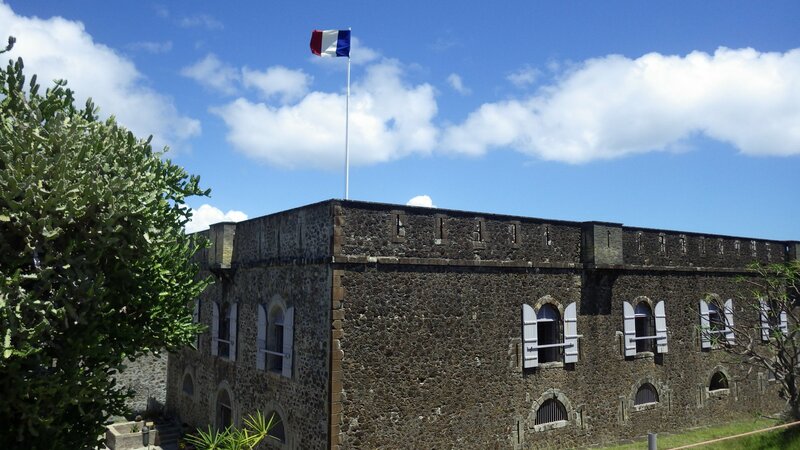 Fort Mapoleon is a moderate uphill hill hike from the Bourg des Saintes town. 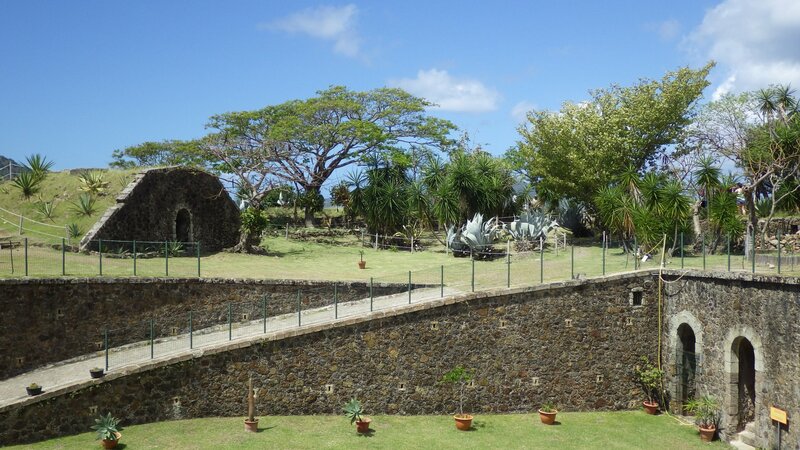 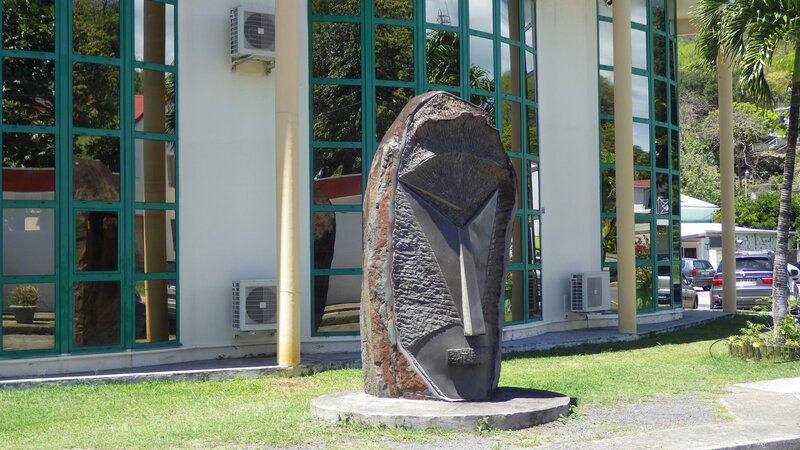 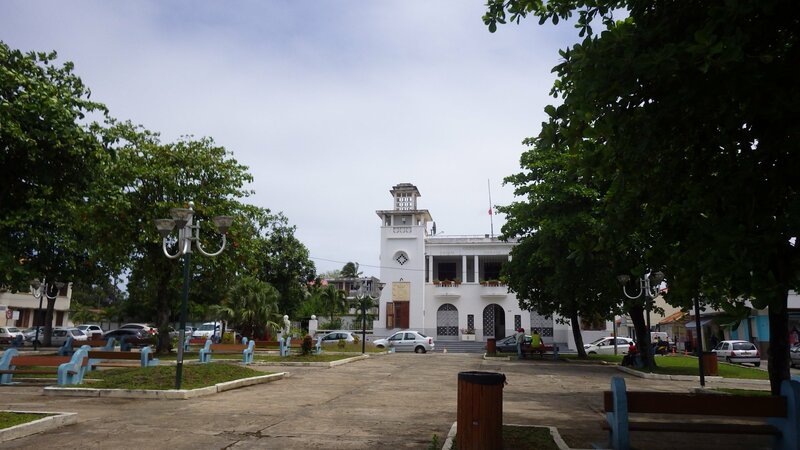 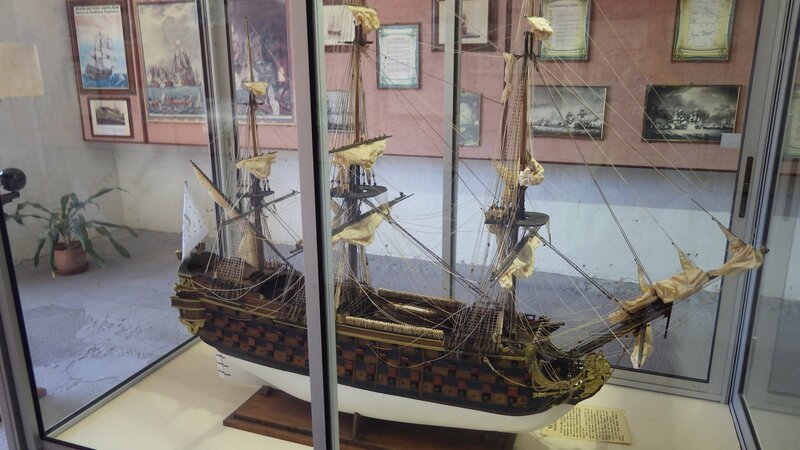 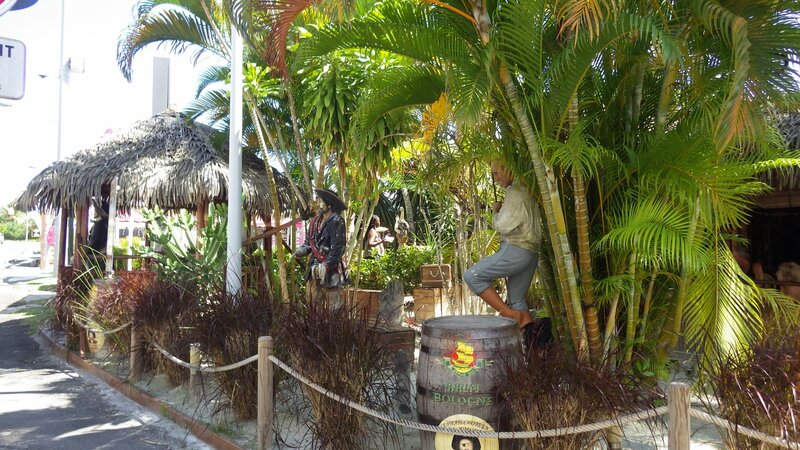 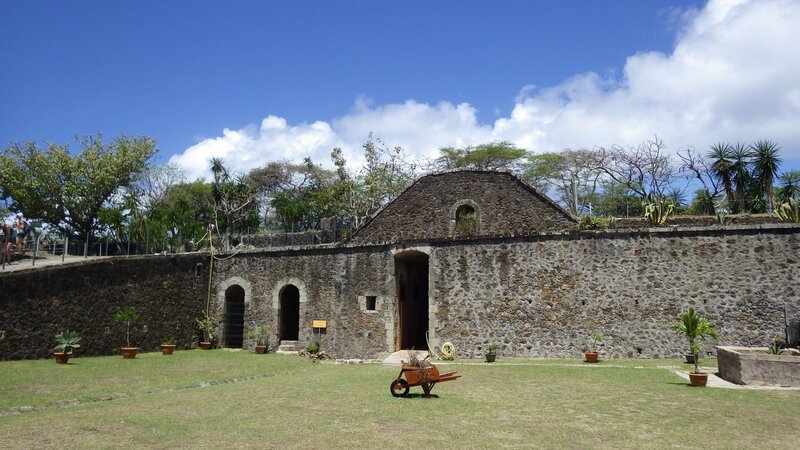 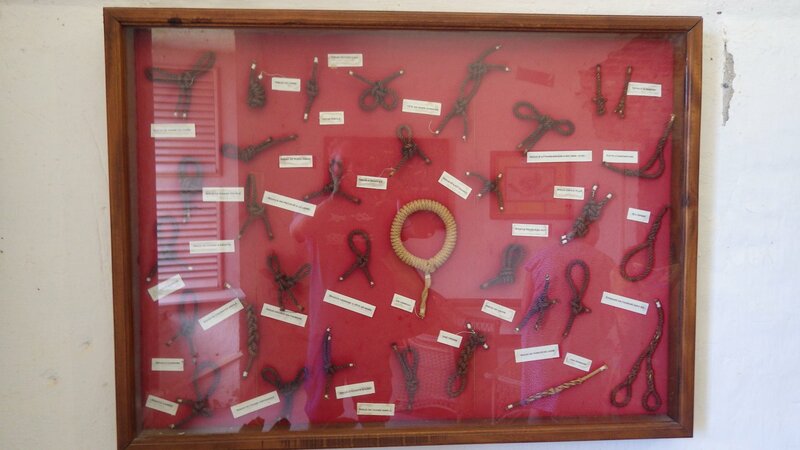 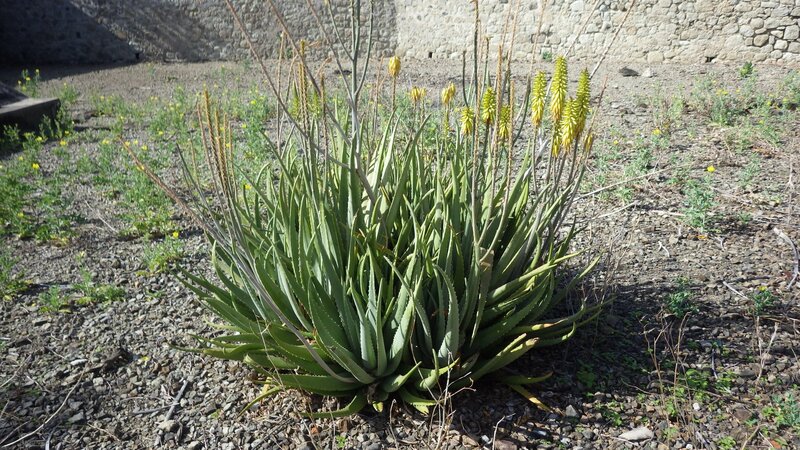 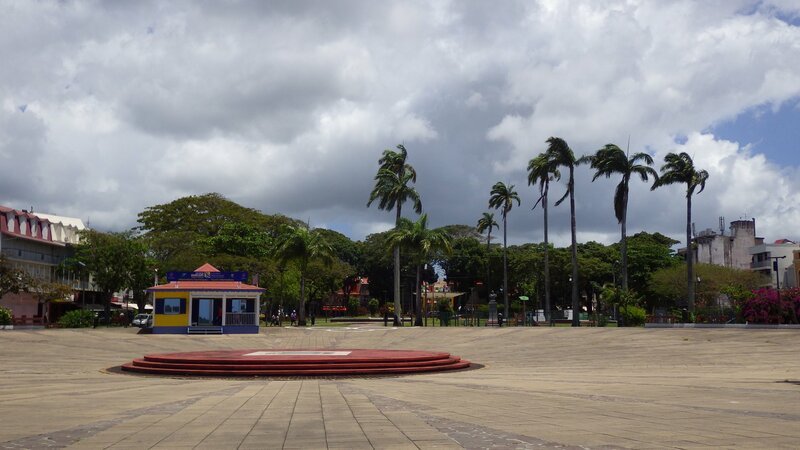 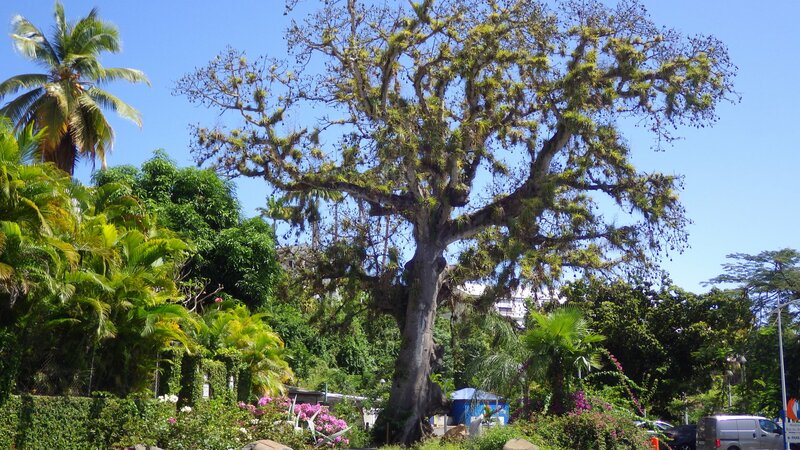 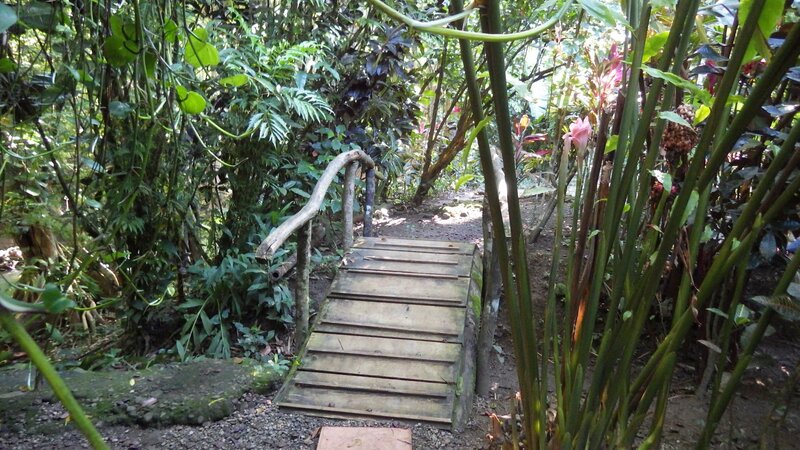 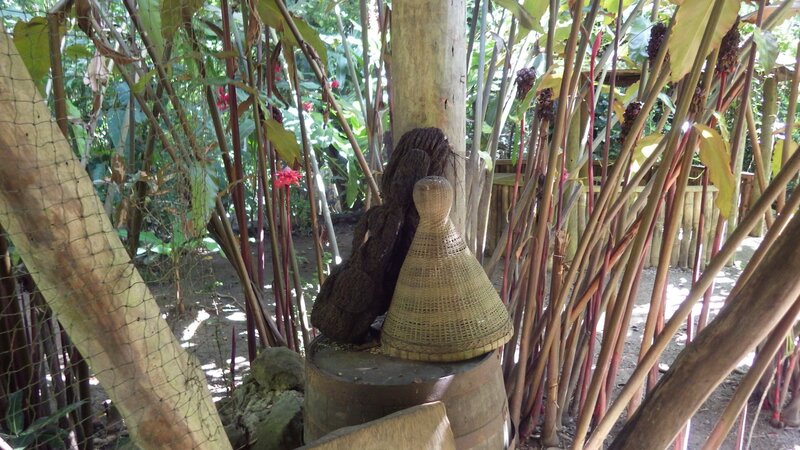 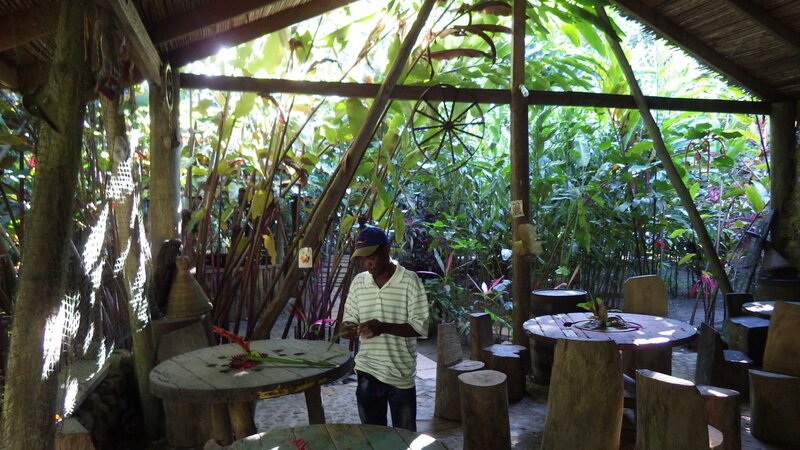 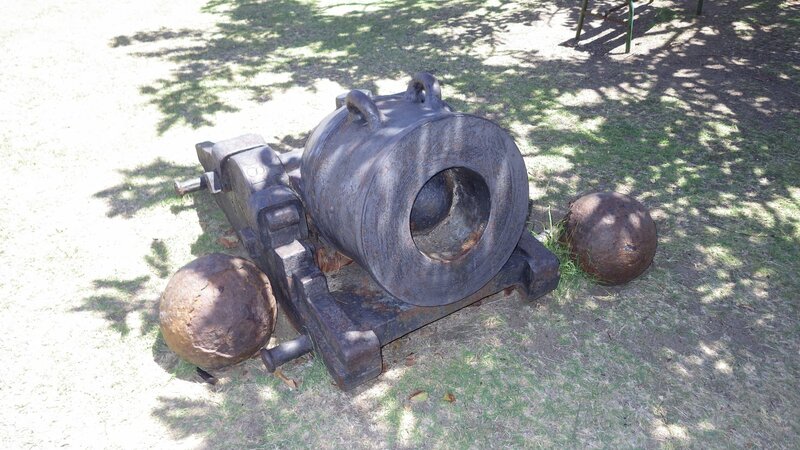 It is a well restored historical site, with very interesting and informative museum and a botanical garden. 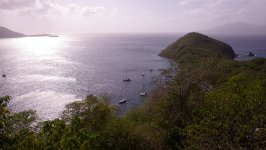 Great views from the hill top. 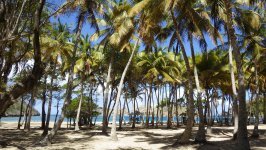 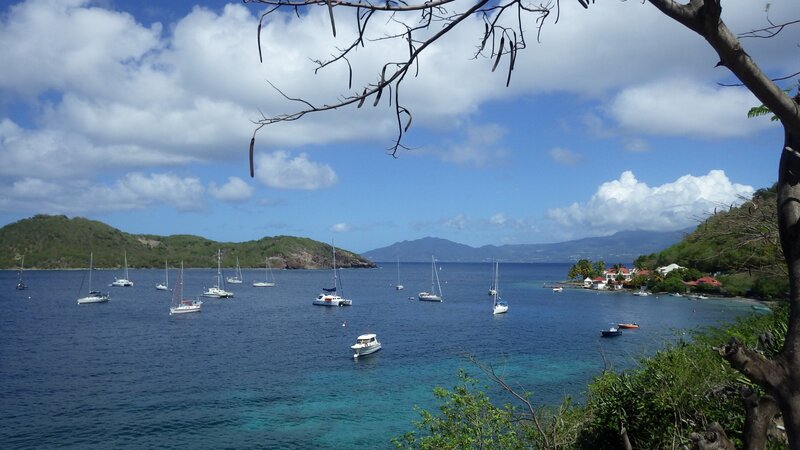 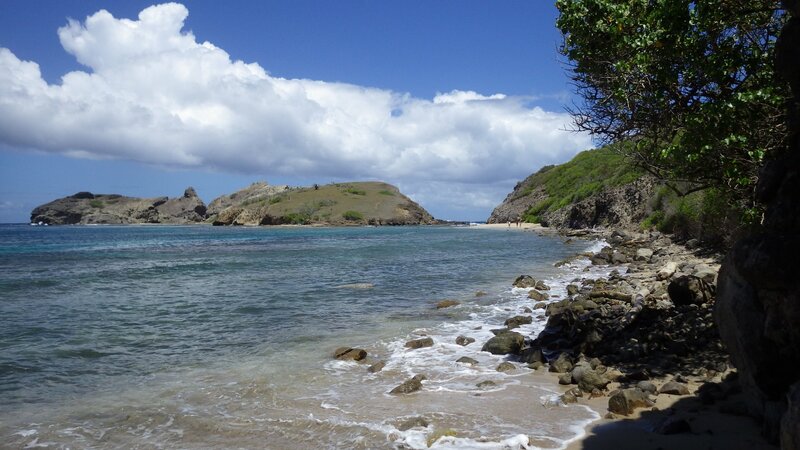 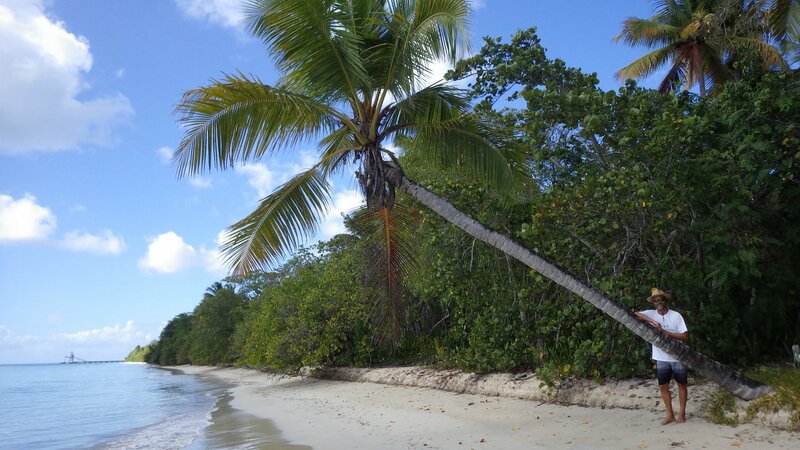 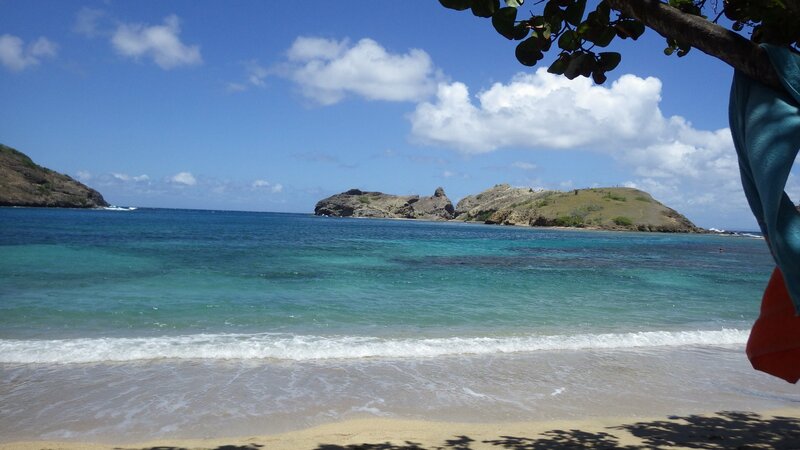 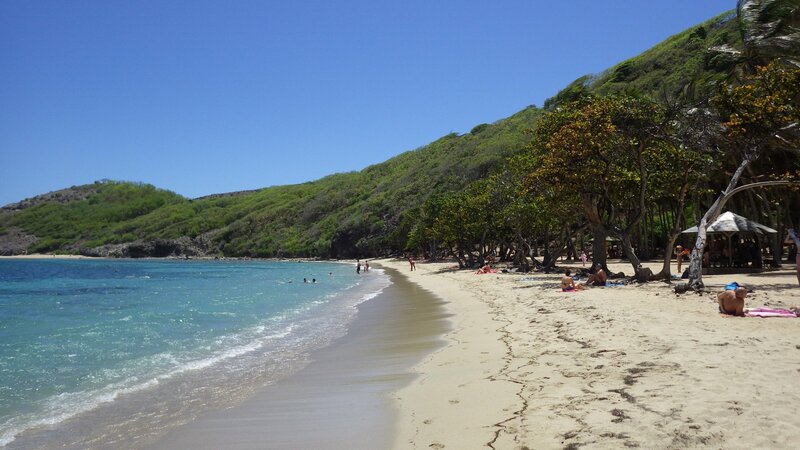 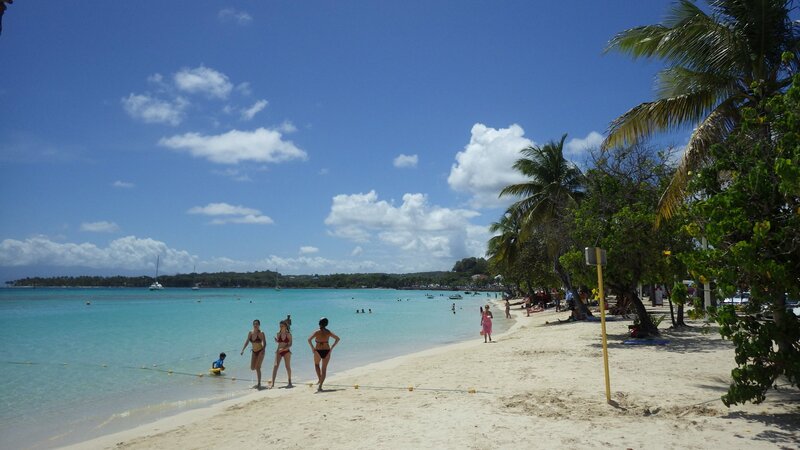 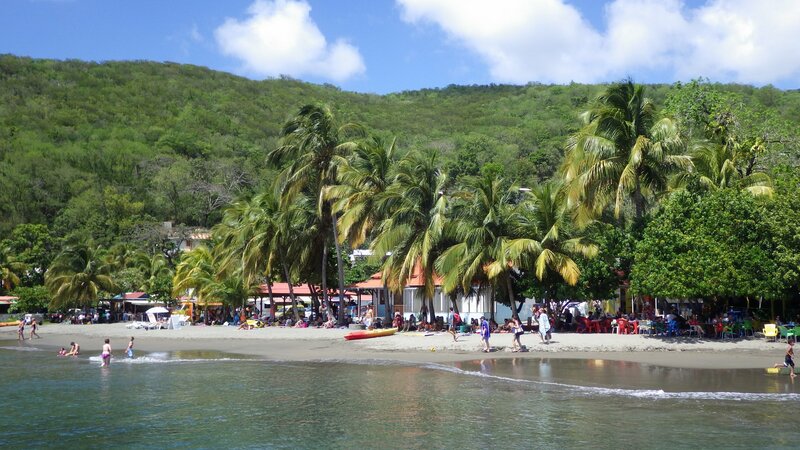 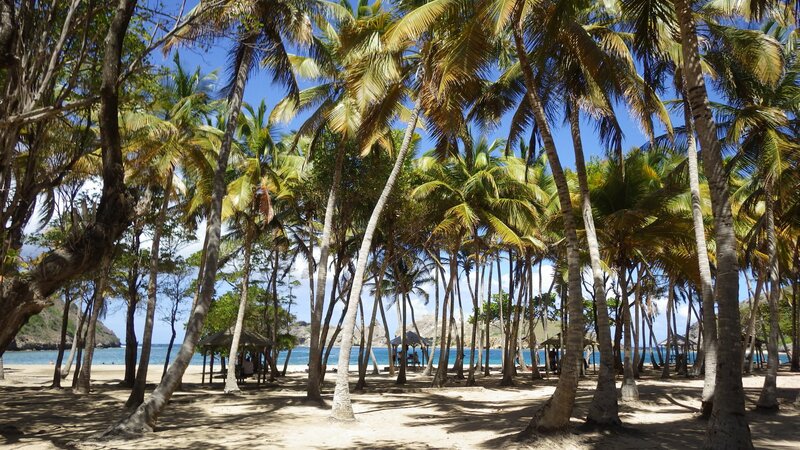 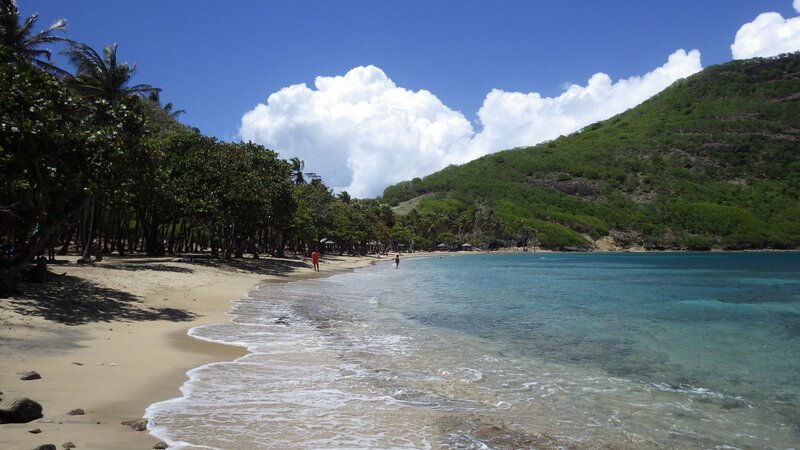 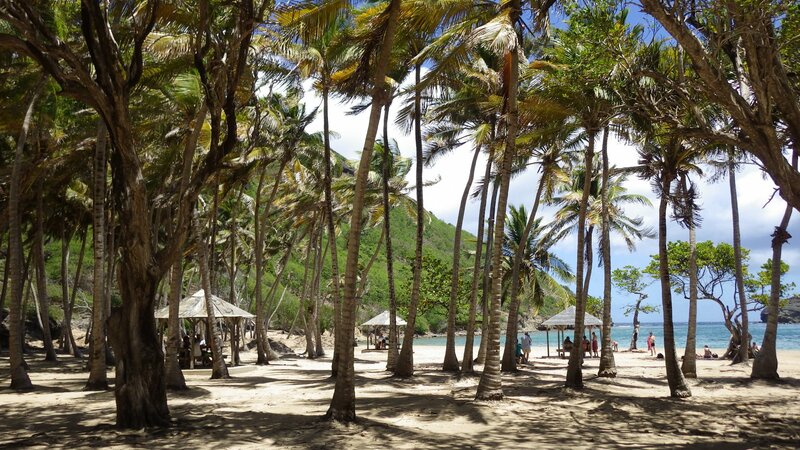 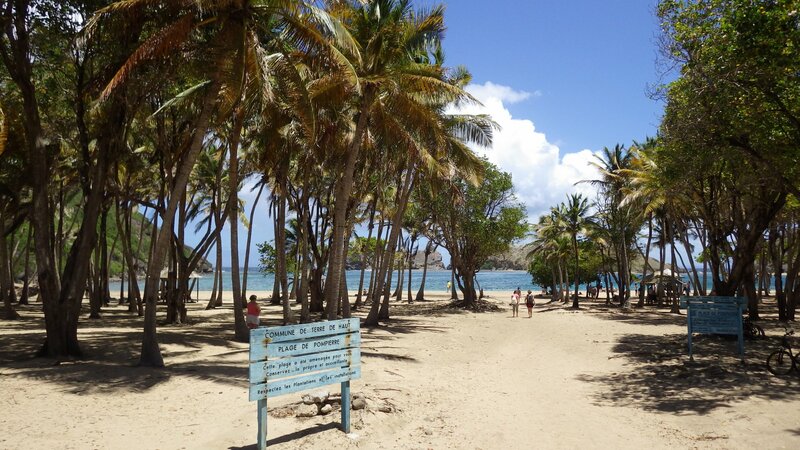 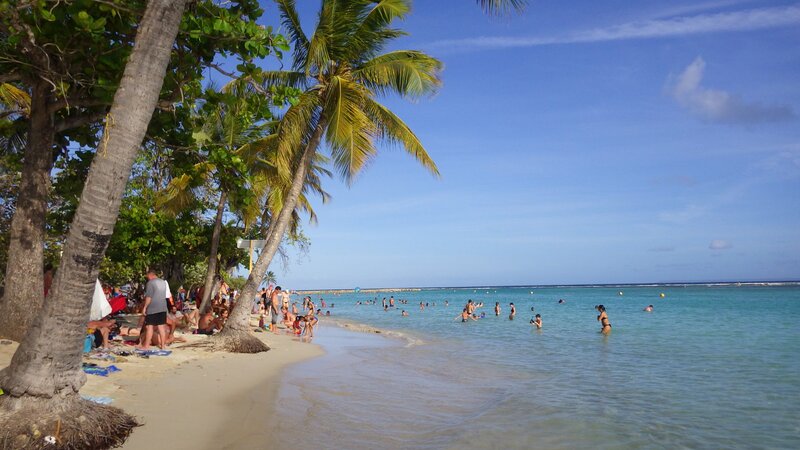 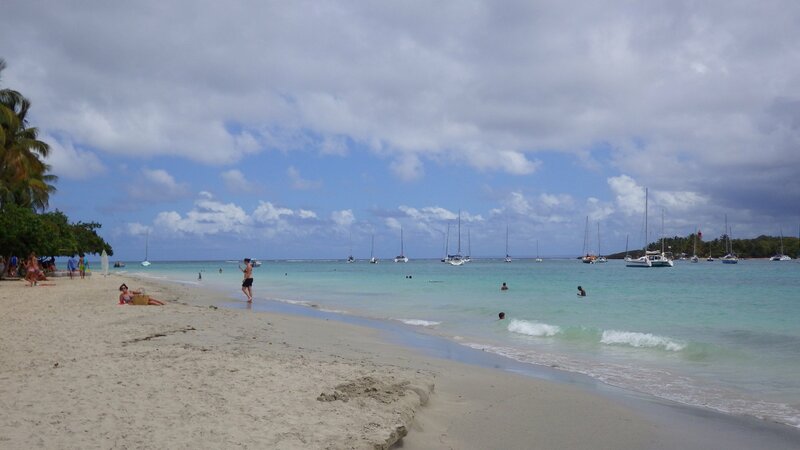 Baie de Pompierre is one of the prettiest palm beaches we have visited. 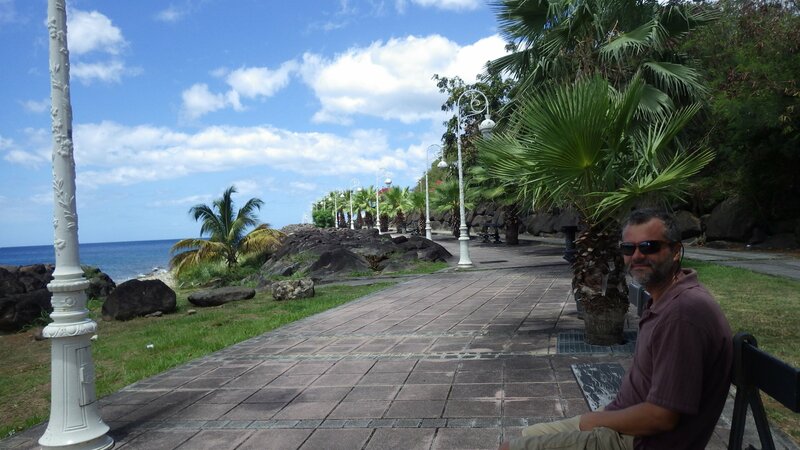 Although it was a little windy that day, we had a good relaxing afternoon there. 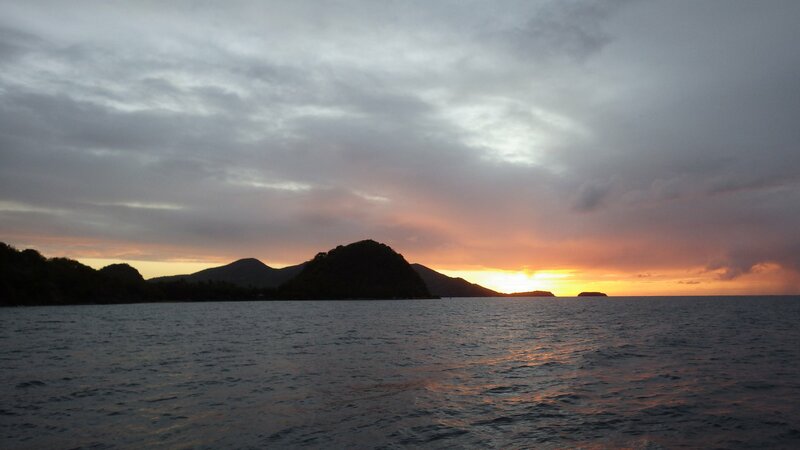 To change scenery and for more wind protection, we have moved from our anchorage to the nearby small island, Ilet a Cabrit. 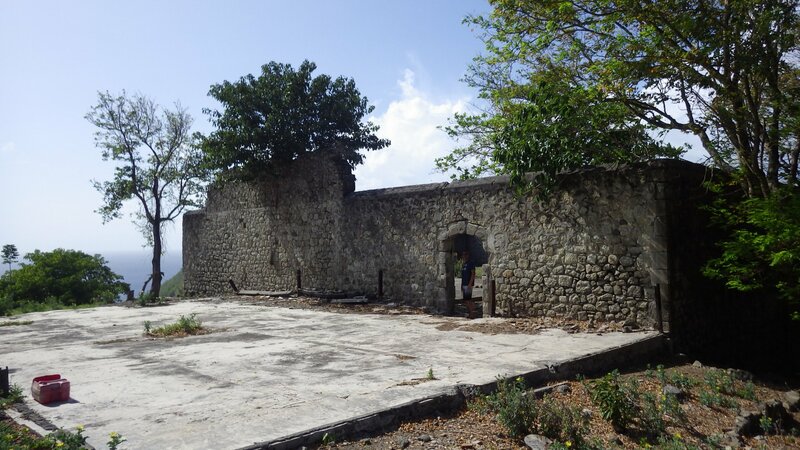 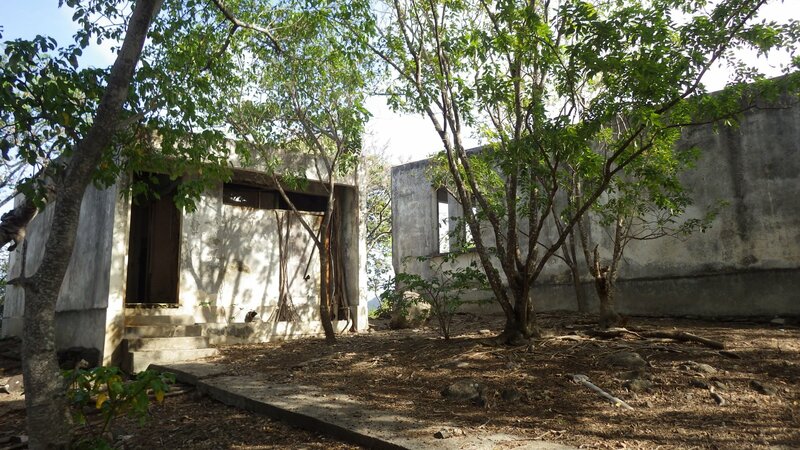 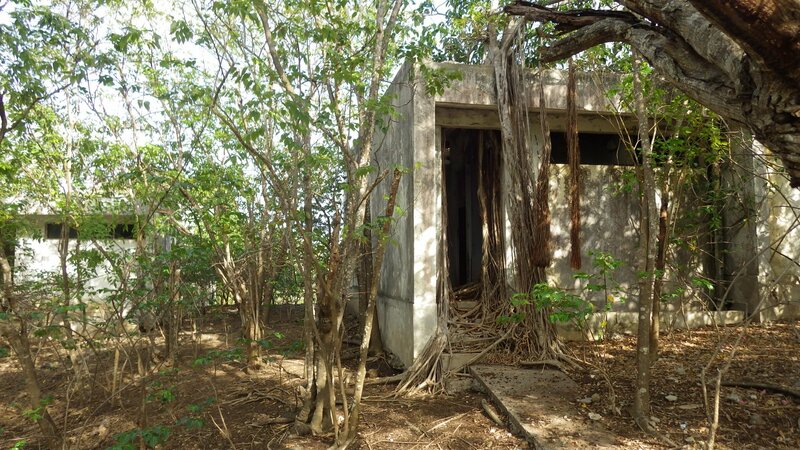 We had a cooling swim on its beach, hiked uphill to see ruins of Fort Josephine and some abandoned hotel which didn't work out. 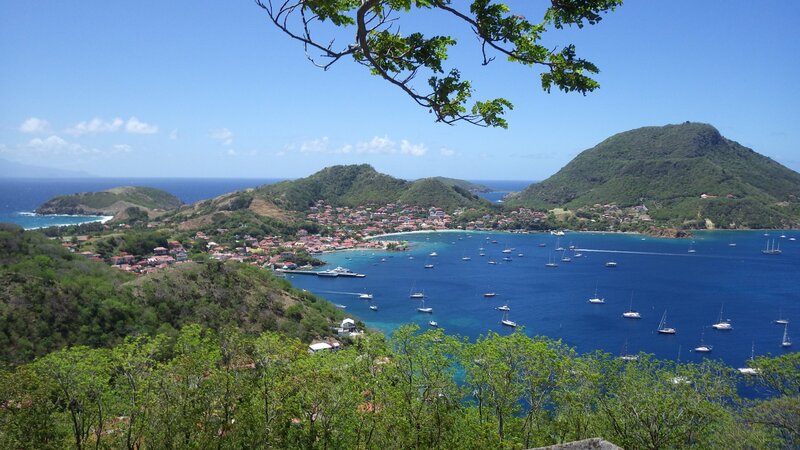 Looking from the top of the hill overlooking these waters, can't stop thinking about the great naval Battle of the Saintes which took place here in 1792, decisively changing the balance of power at that time. 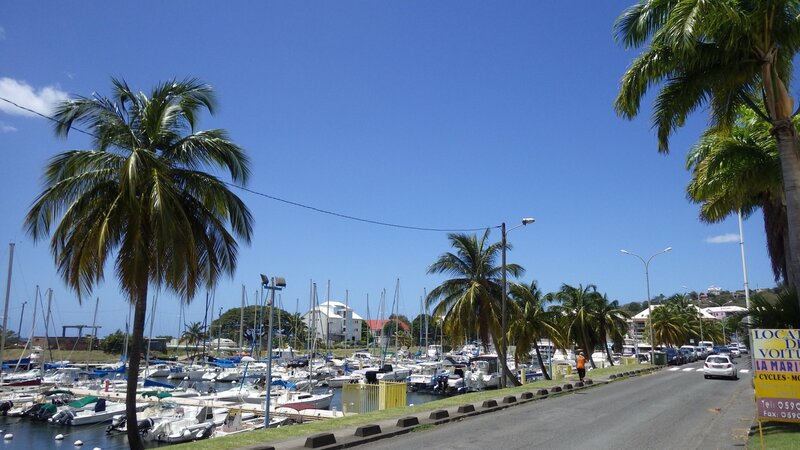 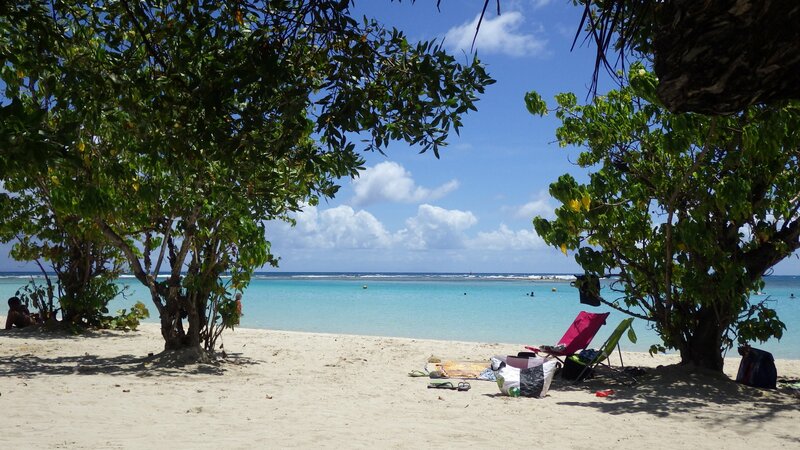 We had some time, and weatherman promised that good calm days are ahead, so we decided to make a detour and tack back to Guadeloupe to explore its southeast coast. 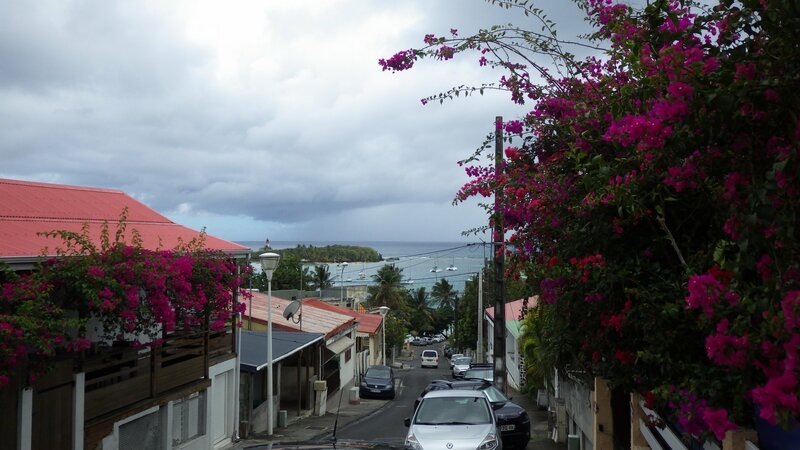 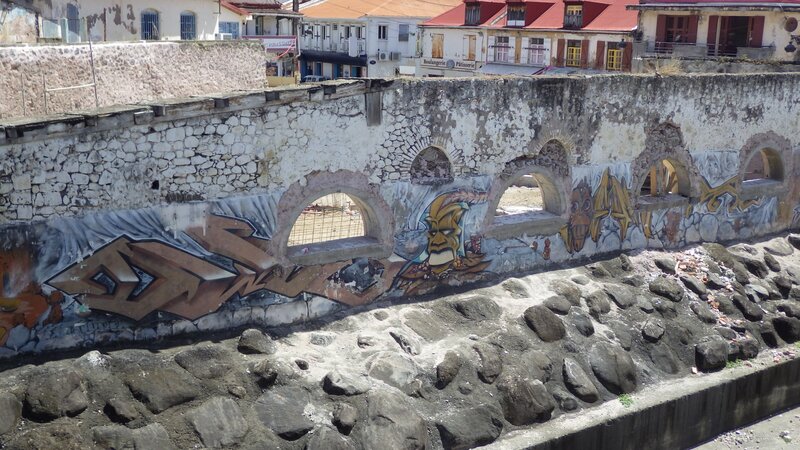 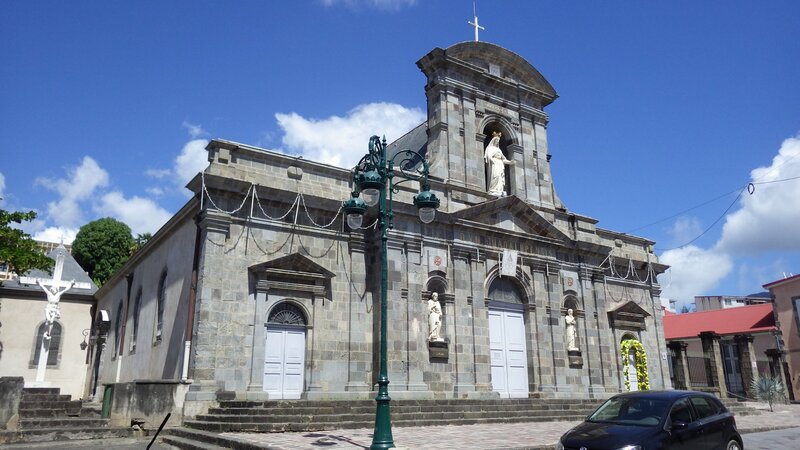 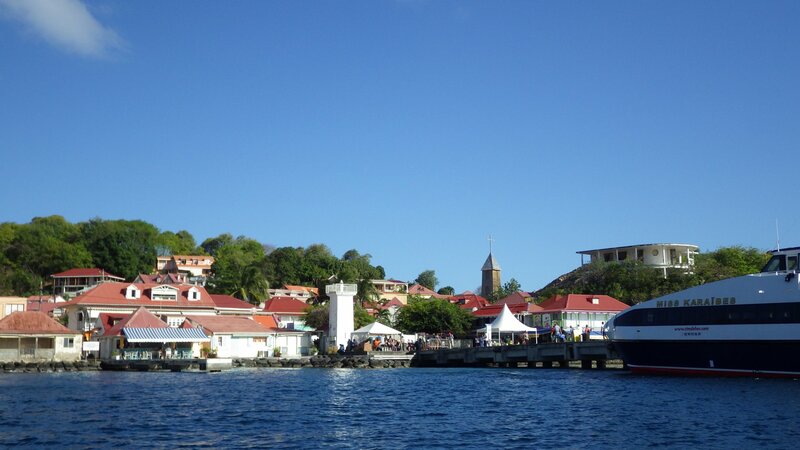 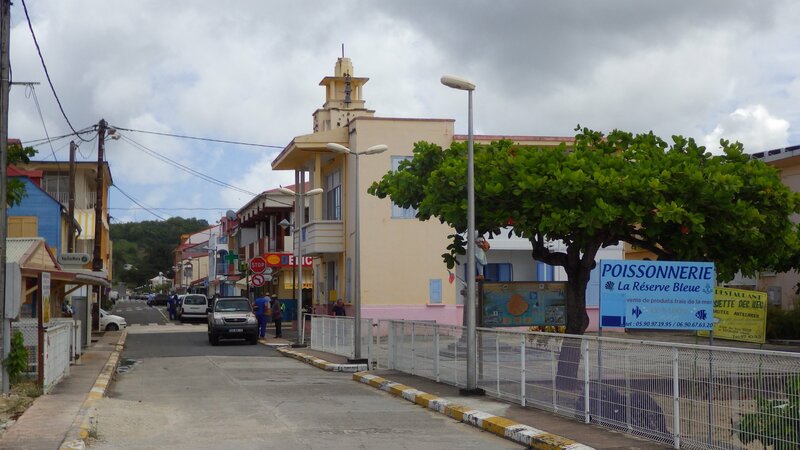 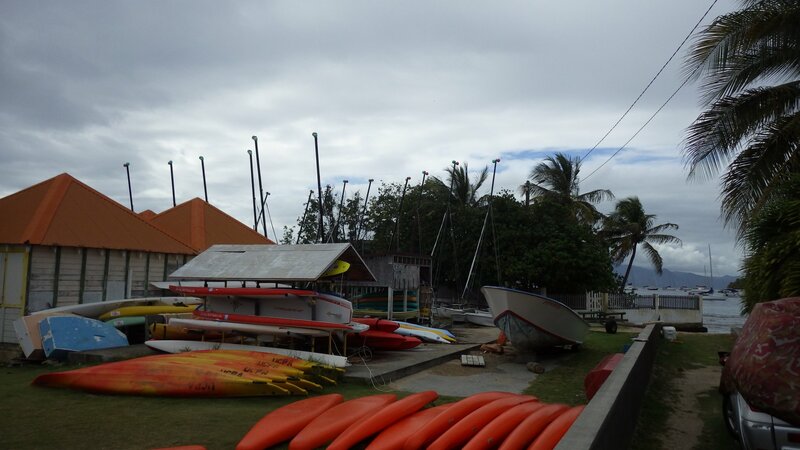 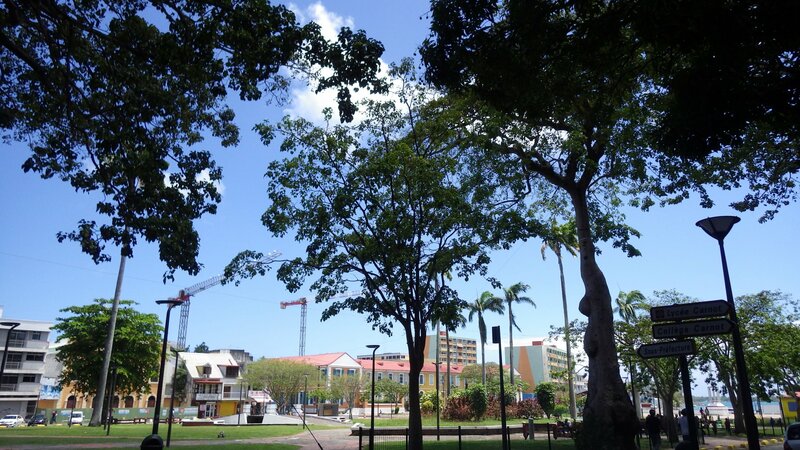 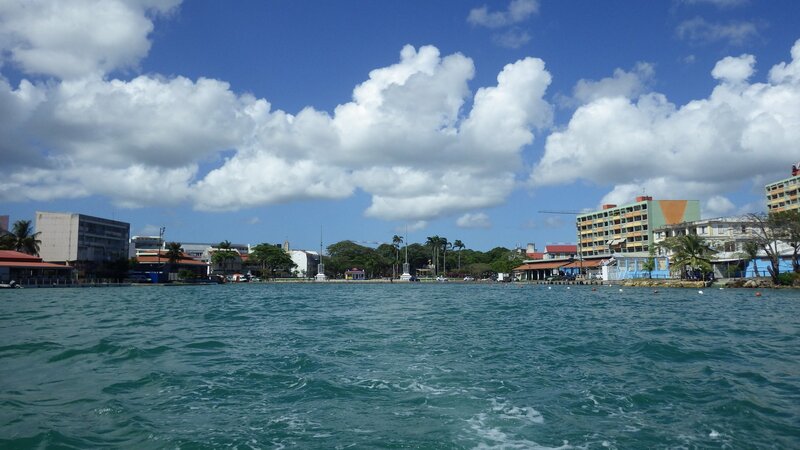 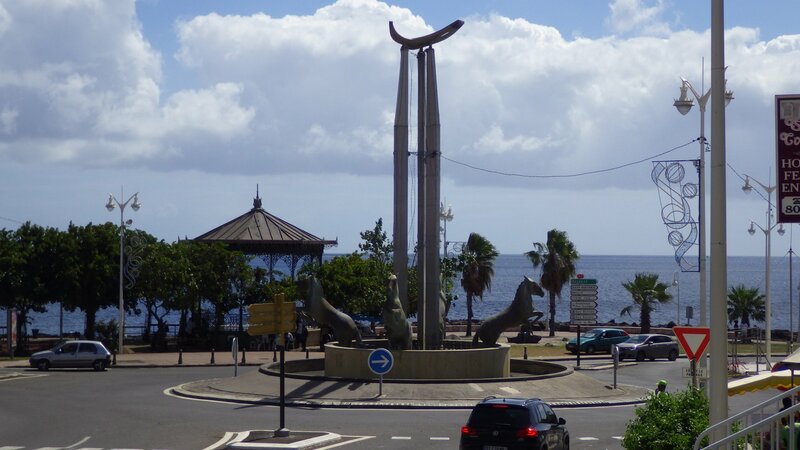 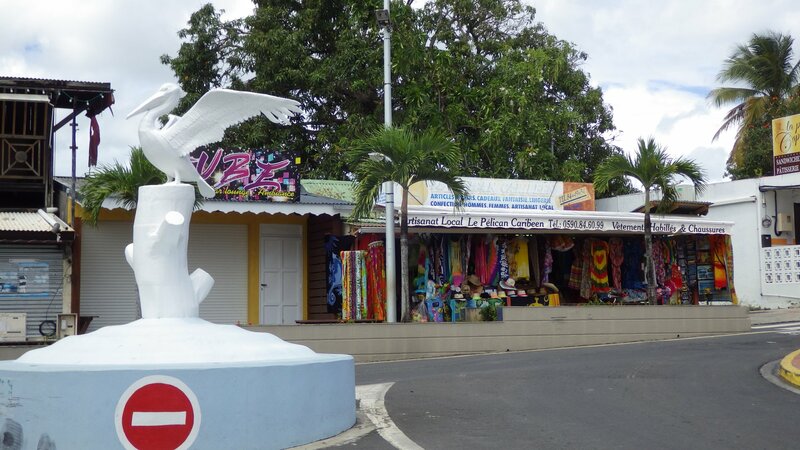 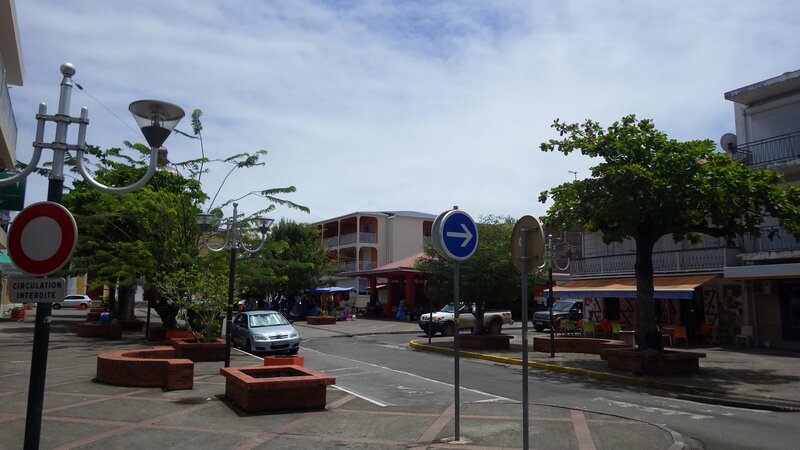 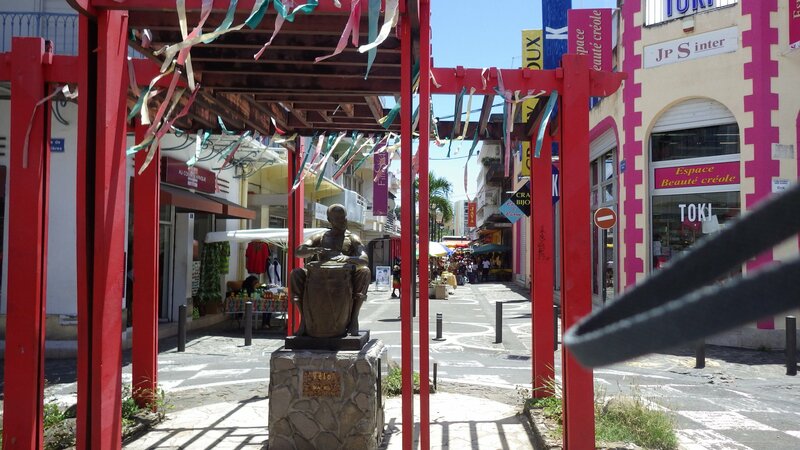 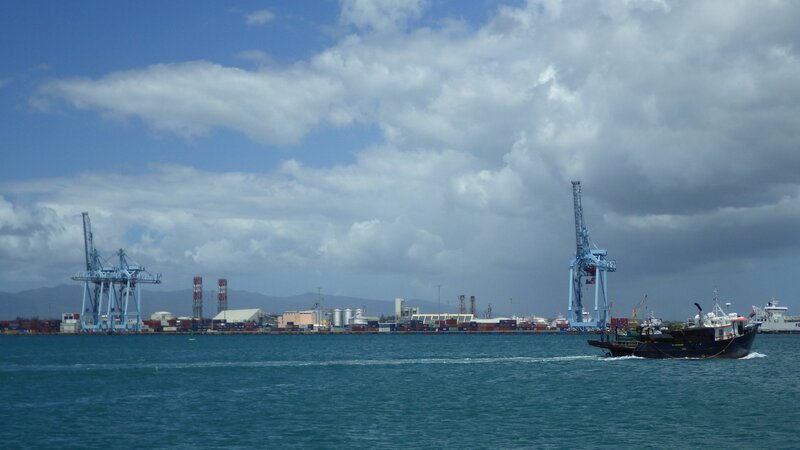 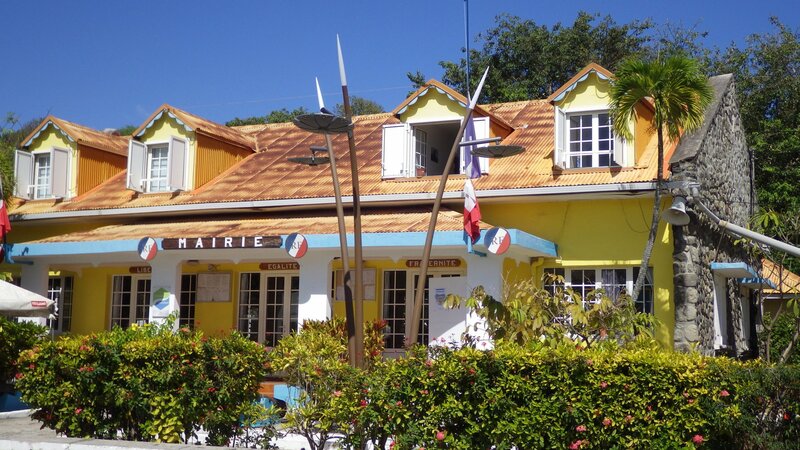 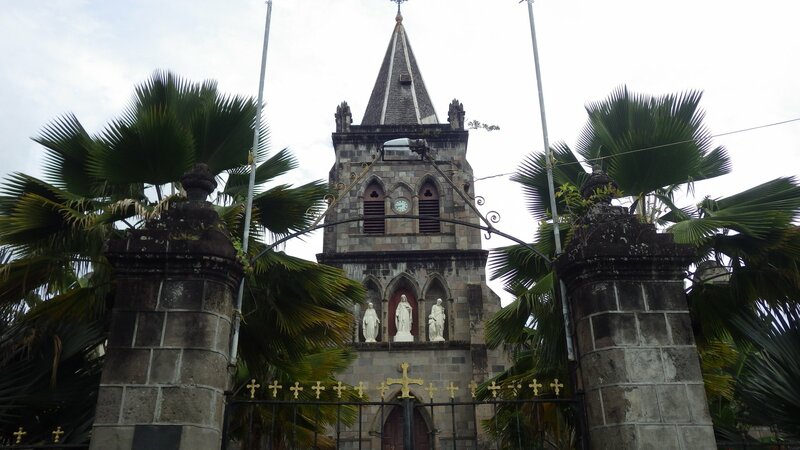 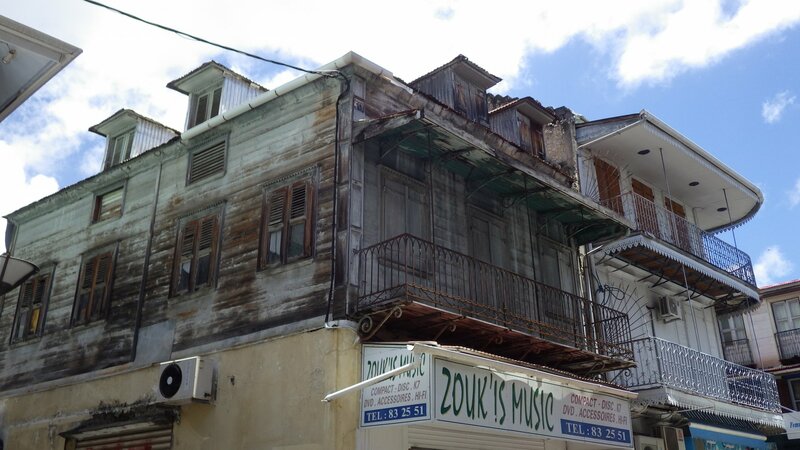 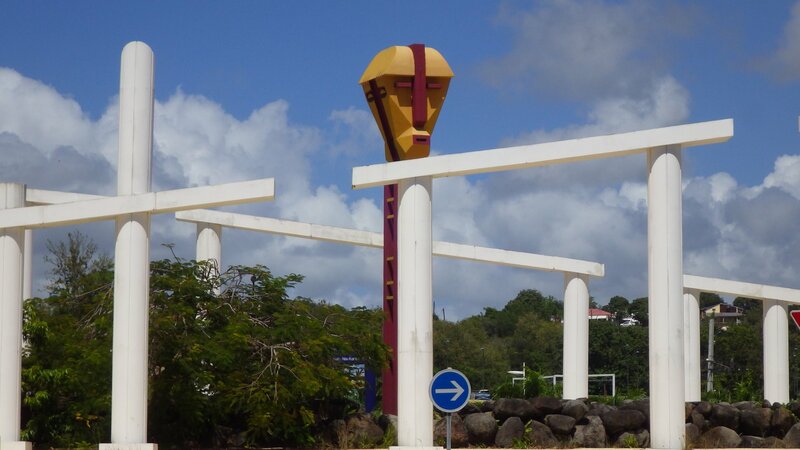 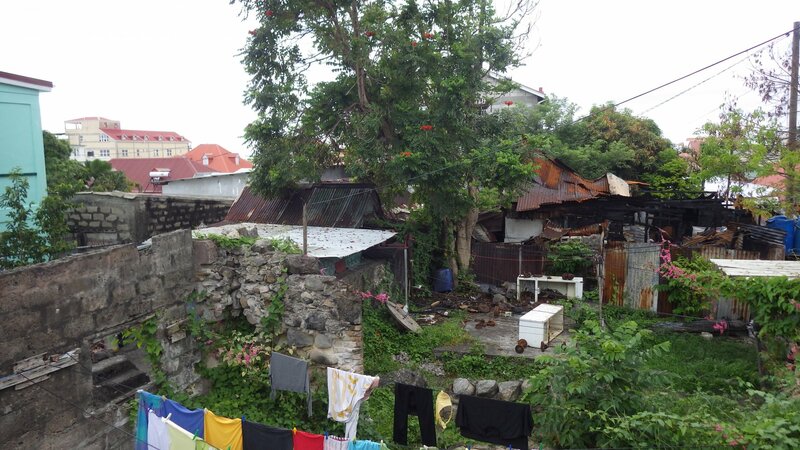 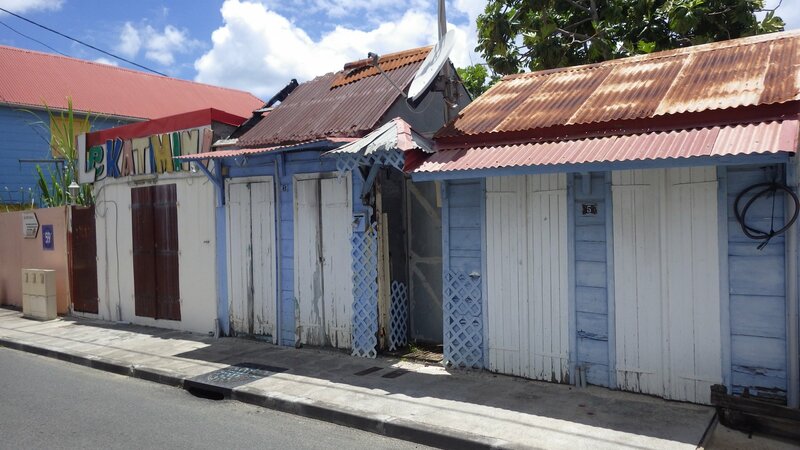 Our first stop there was Poine-a-Pitre, Guadeloupe's largest and most important city. 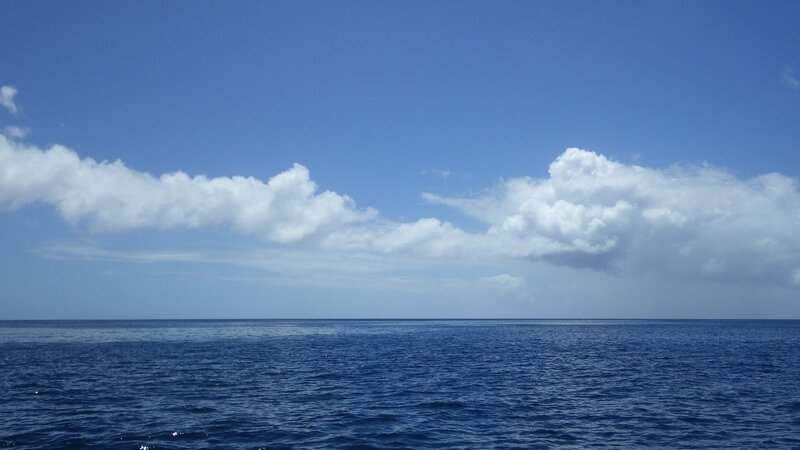 Although we dinghied and visited only its central part. 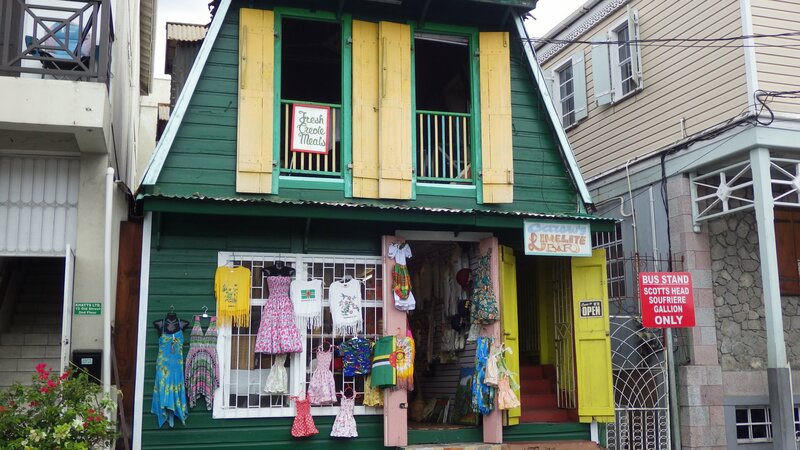 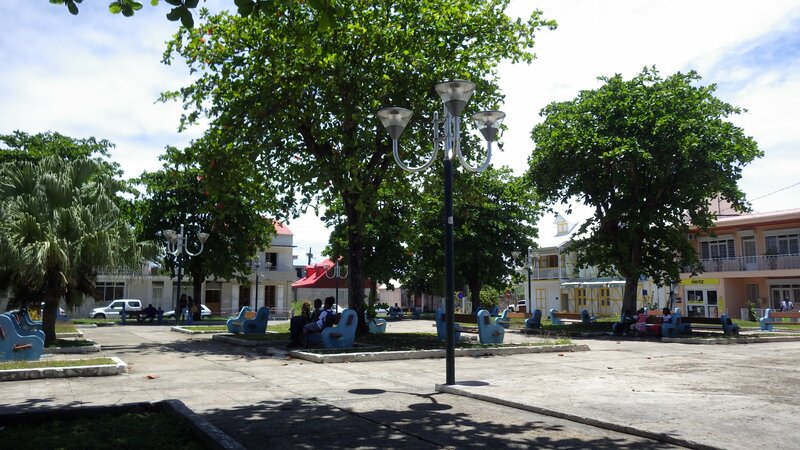 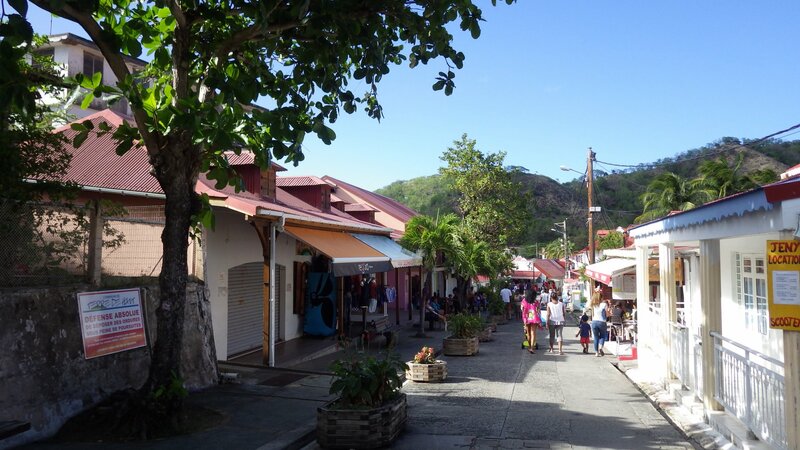 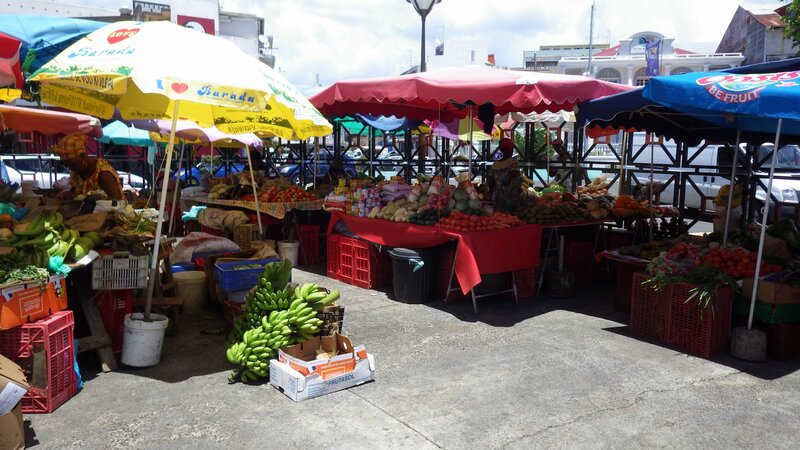 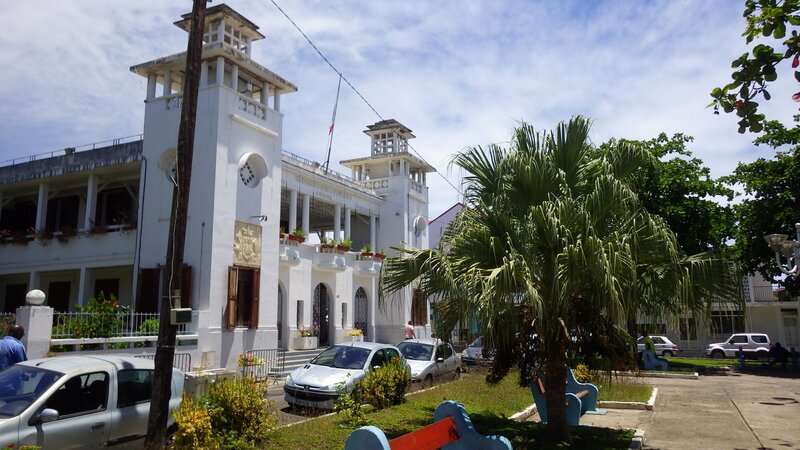 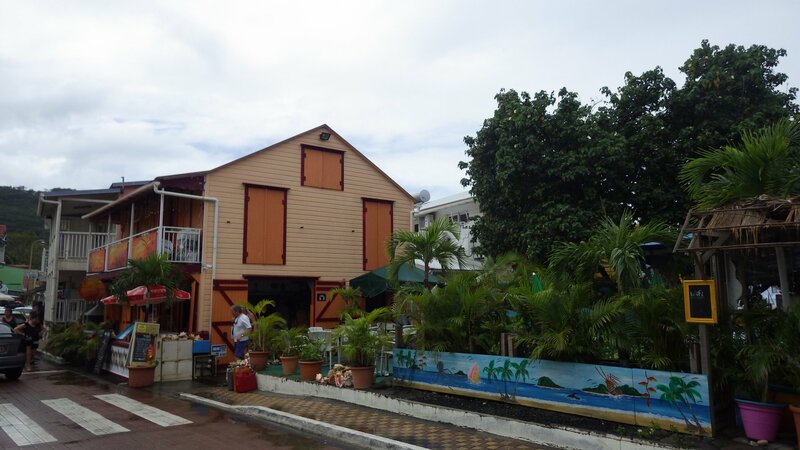 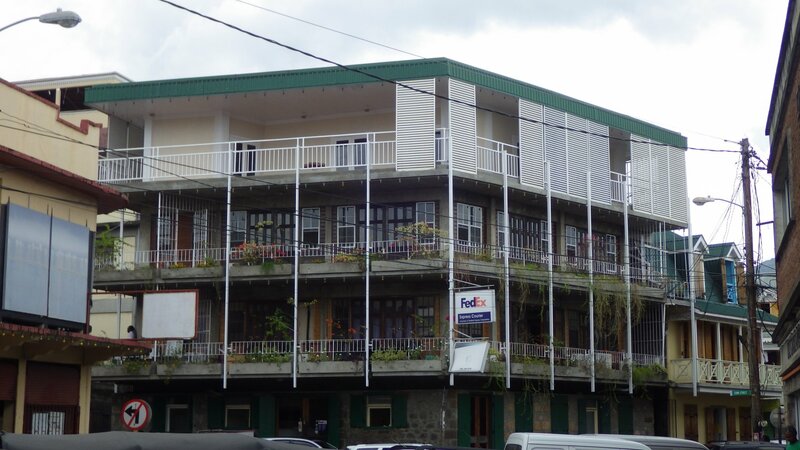 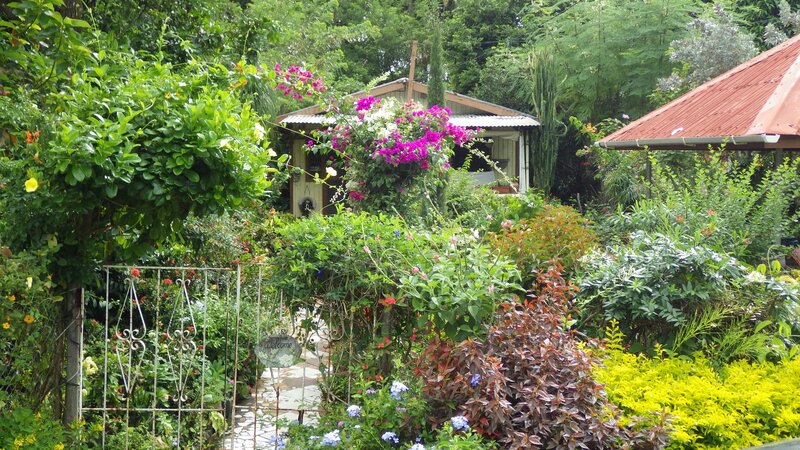 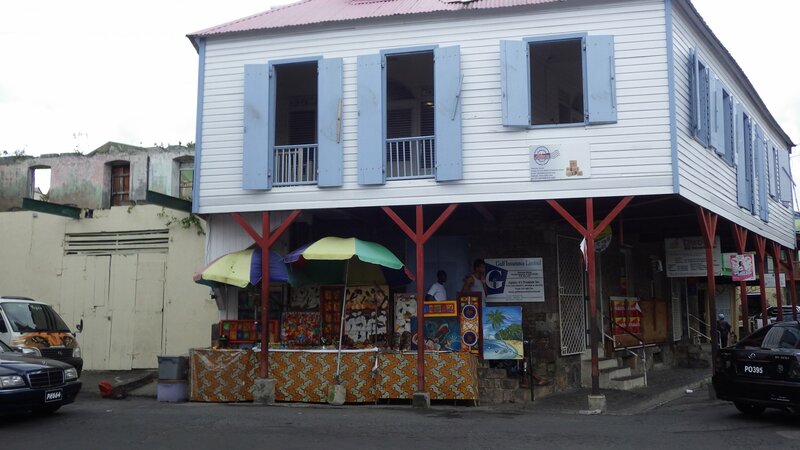 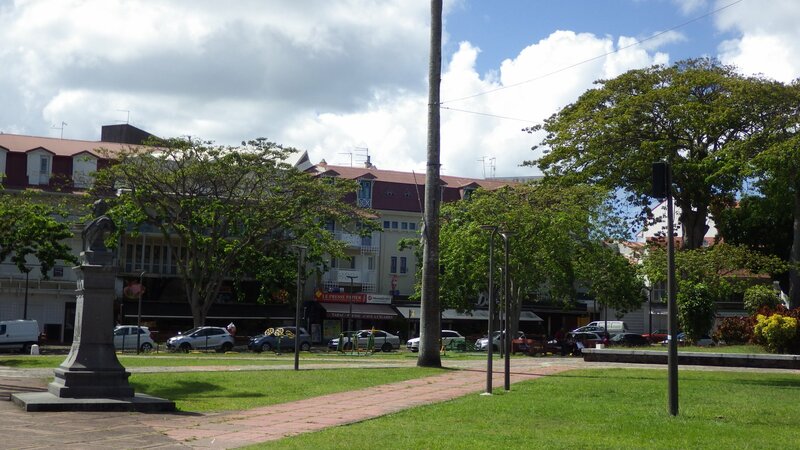 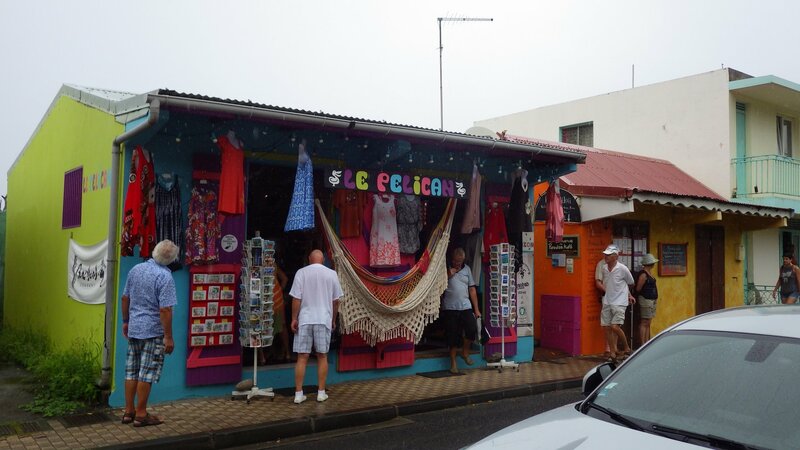 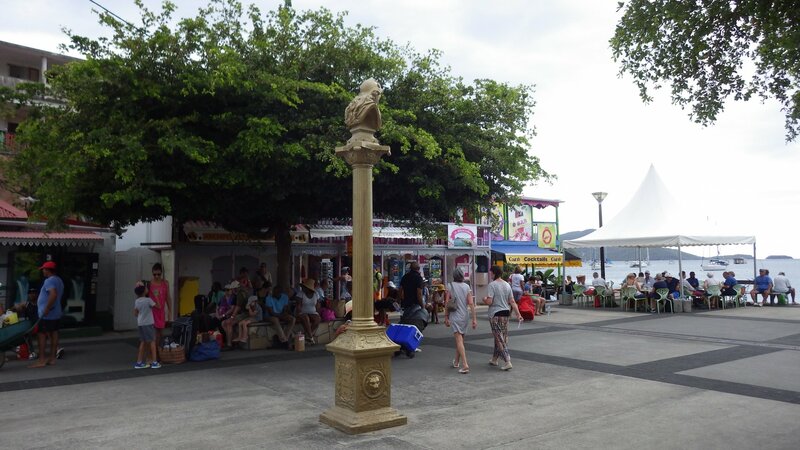 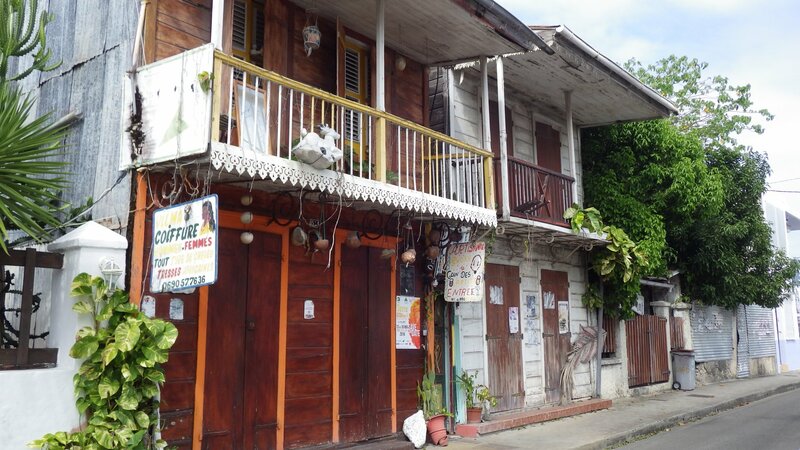 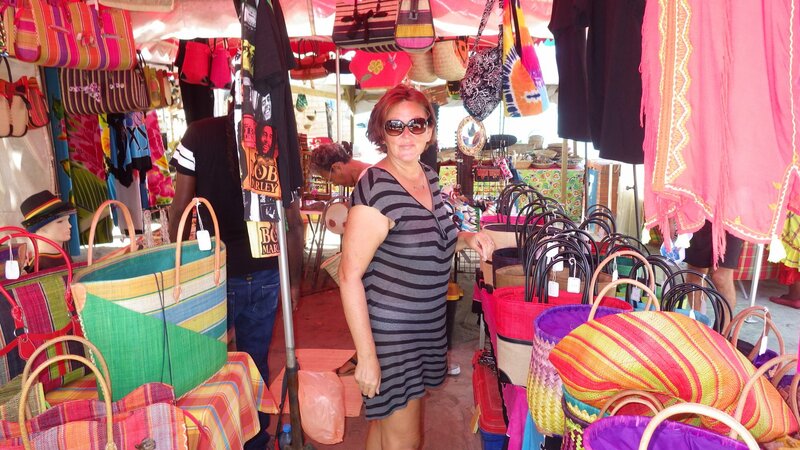 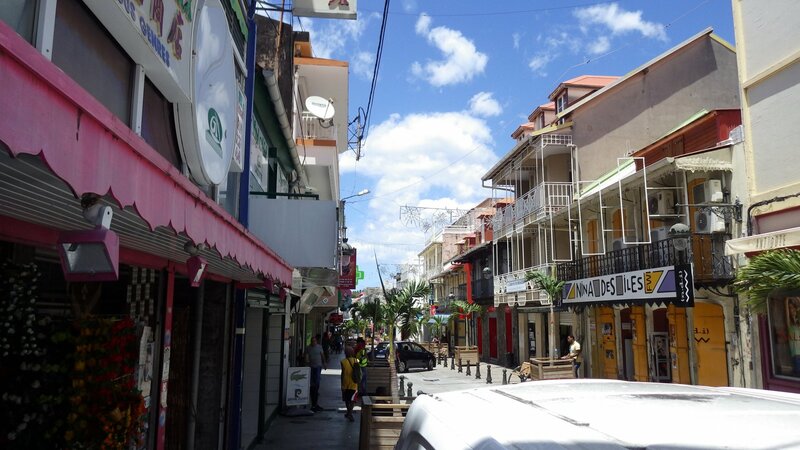 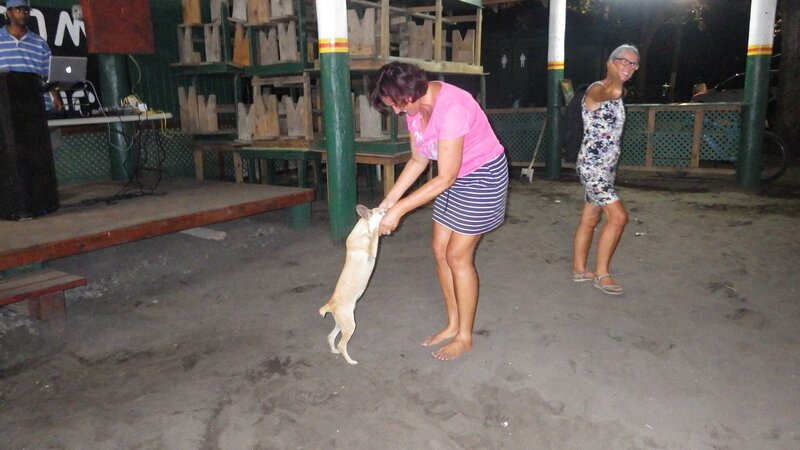 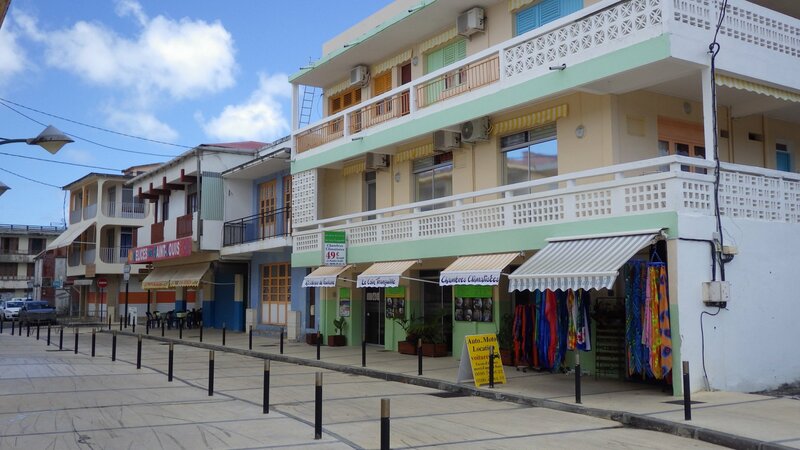 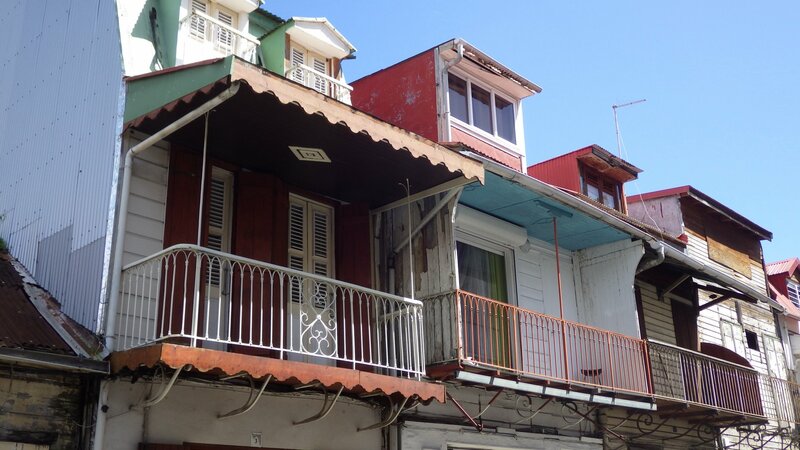 It is a pretty decorative creole town, with lively markets. 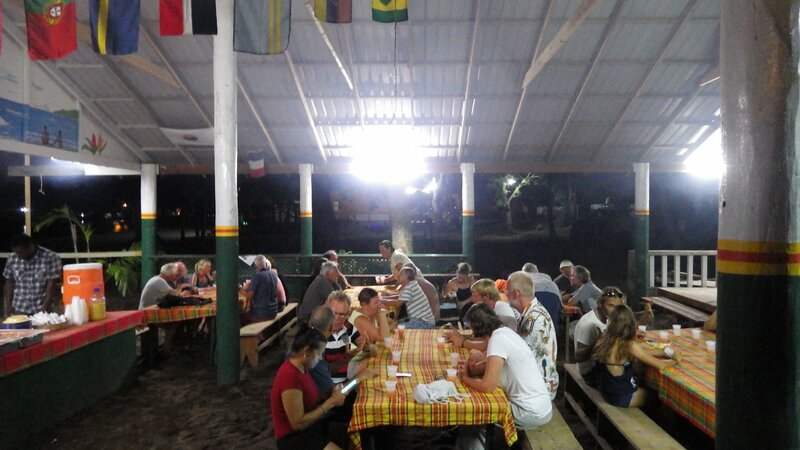 We had a good day there, ended with a nice meal overlooking park with old large trees. 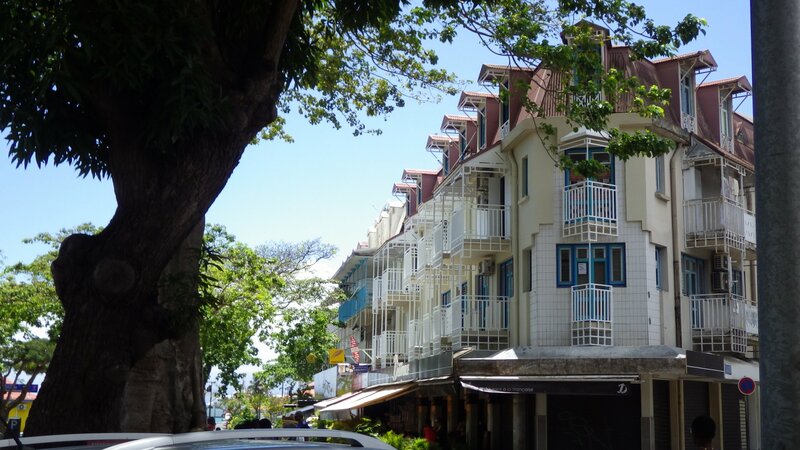 Buildings just few blocks outside the central area seemed quite worn. 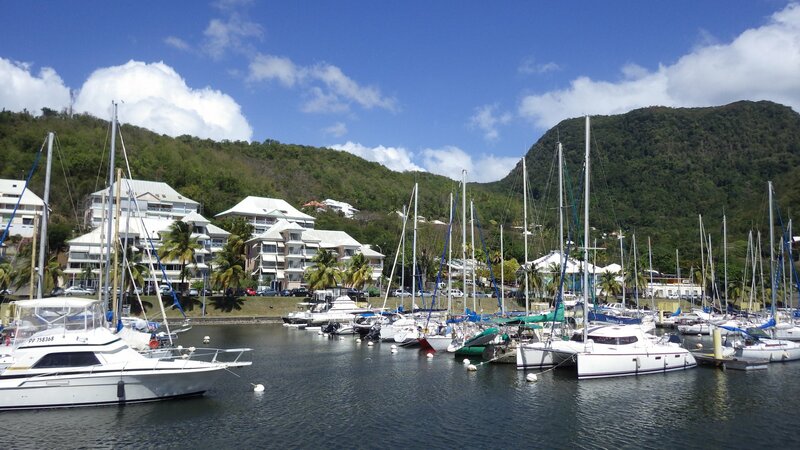 Most of our stay here we spent anchored near marina Bas-du-Fort. 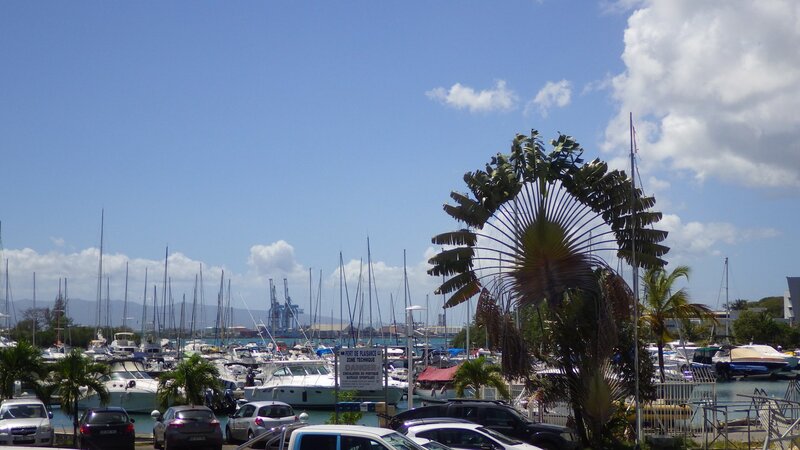 The area around marina is pleasant, with marine services, chandlery, aquarium, good European grocery store and fine restaurants. 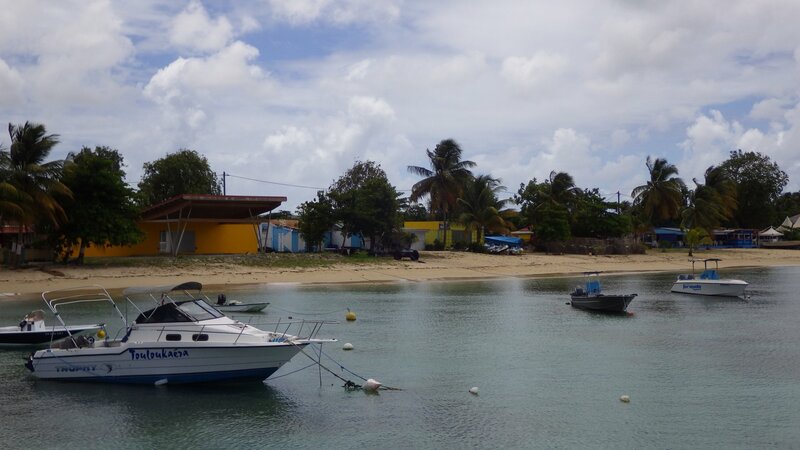 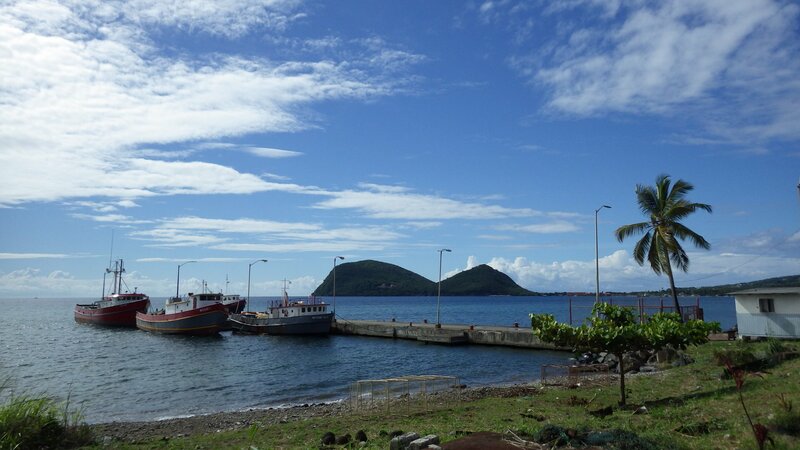 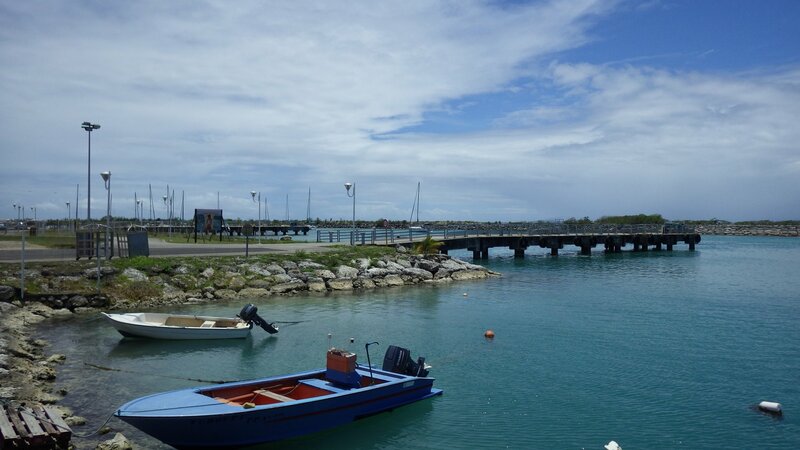 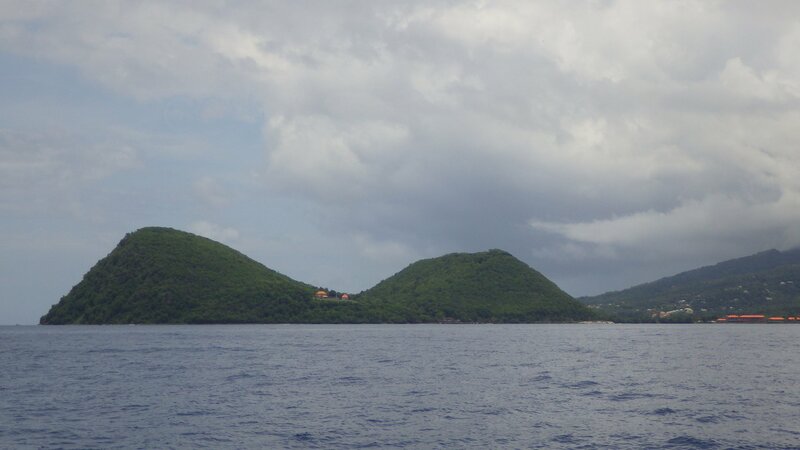 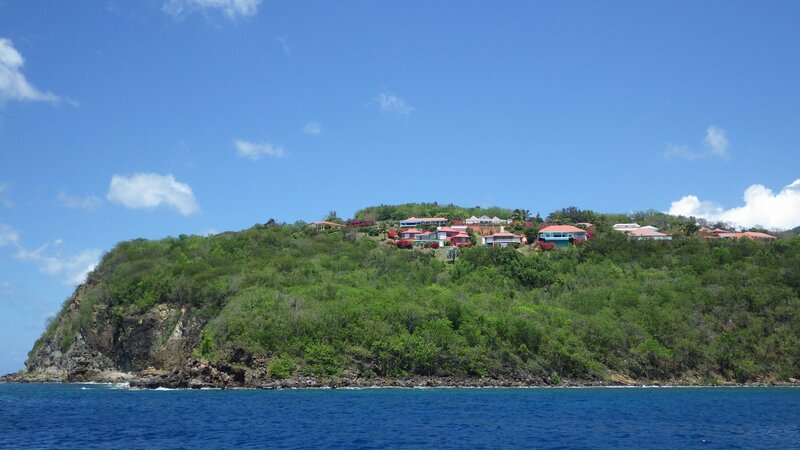 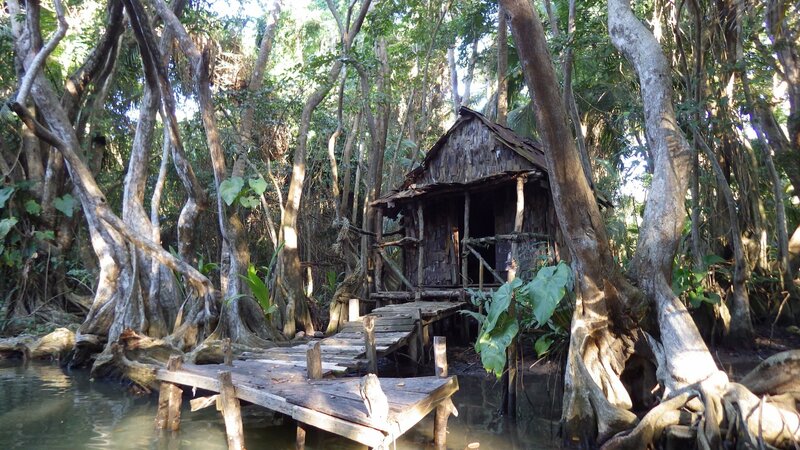 The town of Le Gosier and the nearby island Ilet du Gosier are only 3 miles east from Pointe a Pitre. 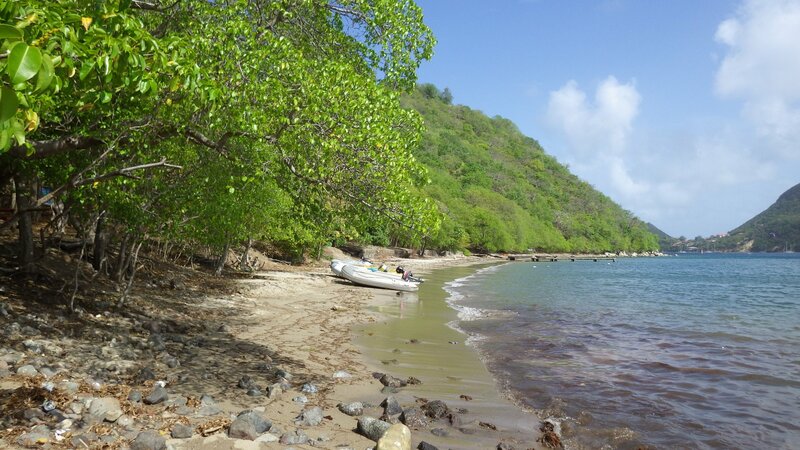 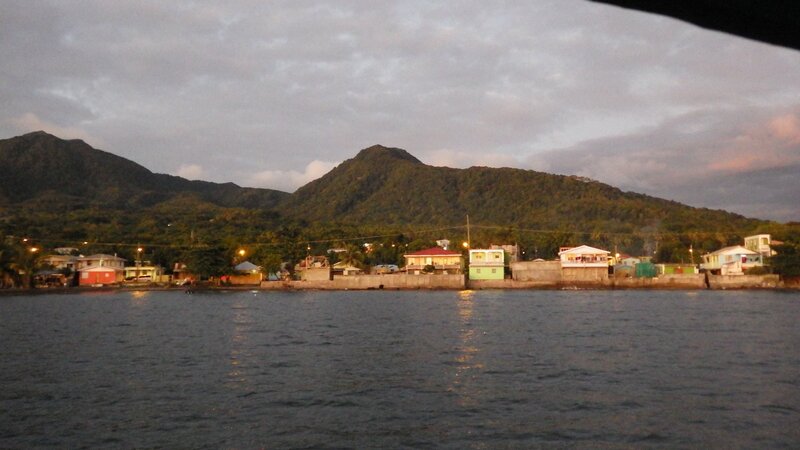 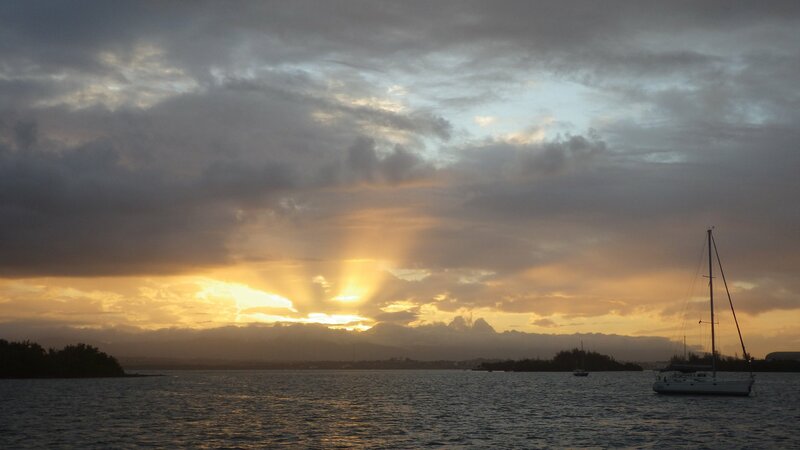 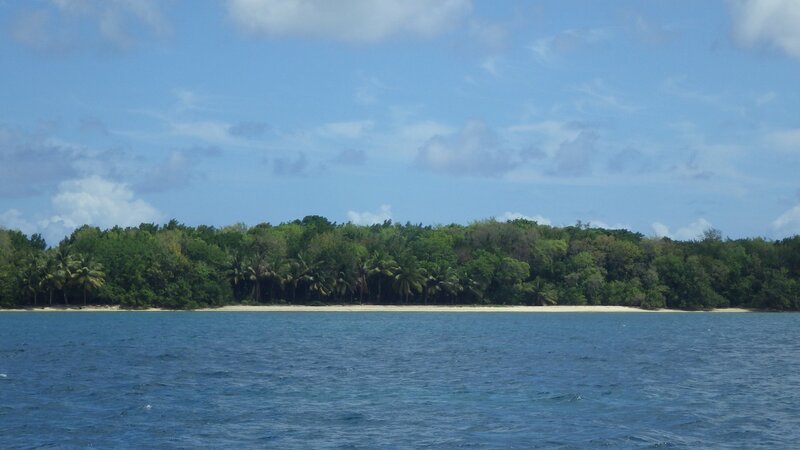 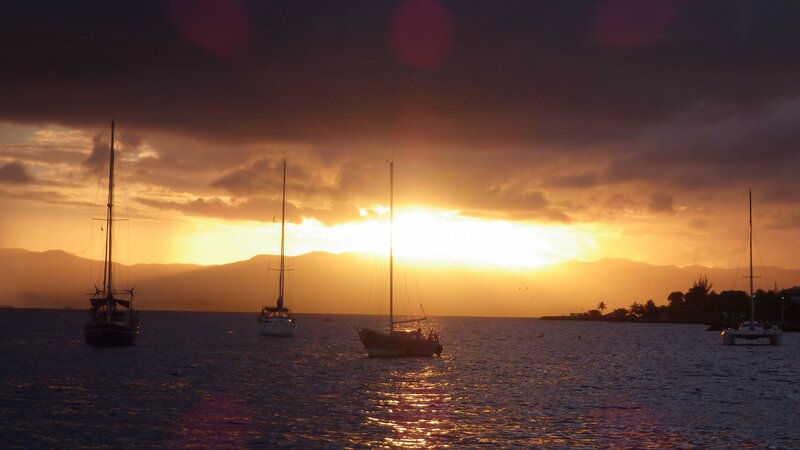 The anchorage between island and town is picturesque, with nice beaches. 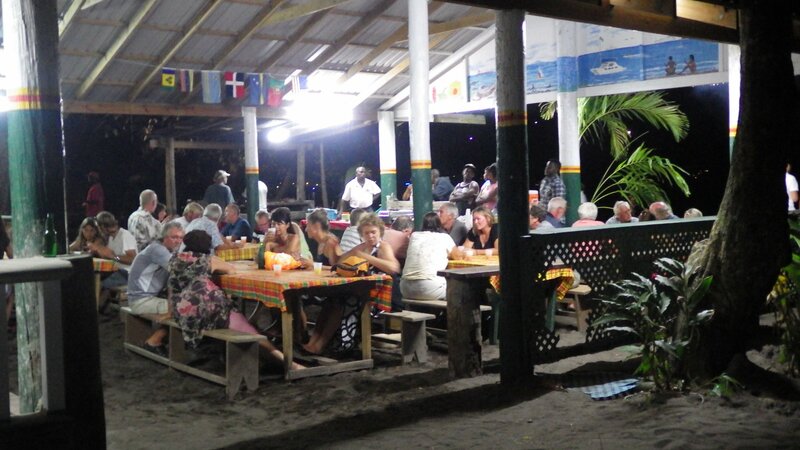 The place is fairly popular with locals and vacationers. 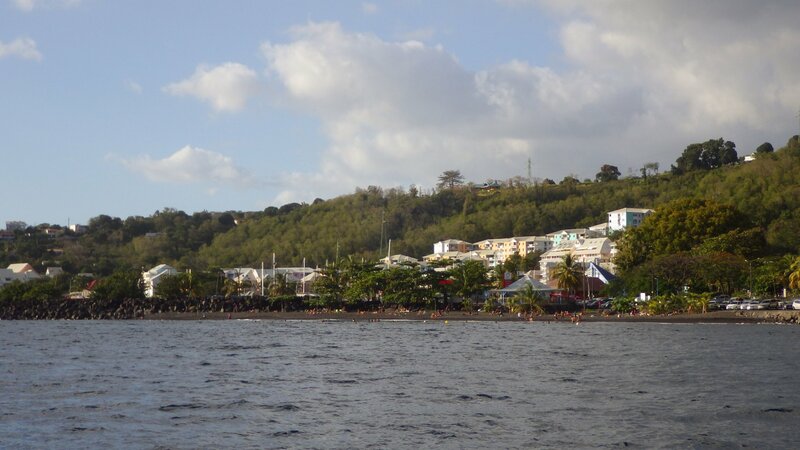 There are lots of swimmers around the bay, swimming between the beach and the island. 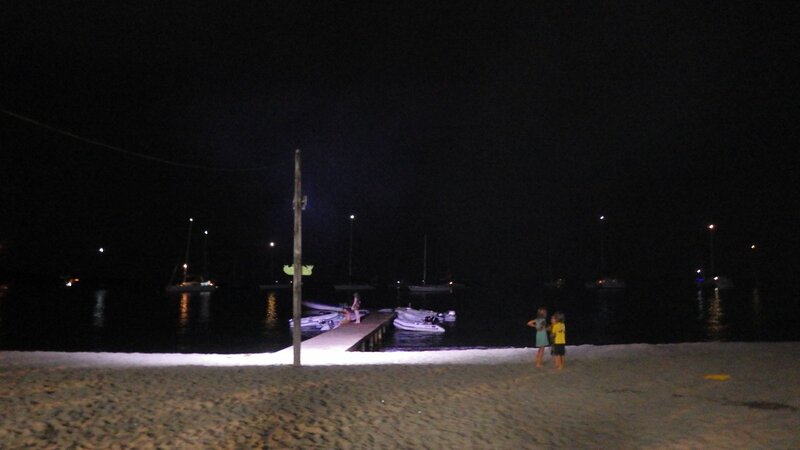 It seems there is some sort of serious swimming culture here - swimming activities start at 5 AM, ending well after dark. 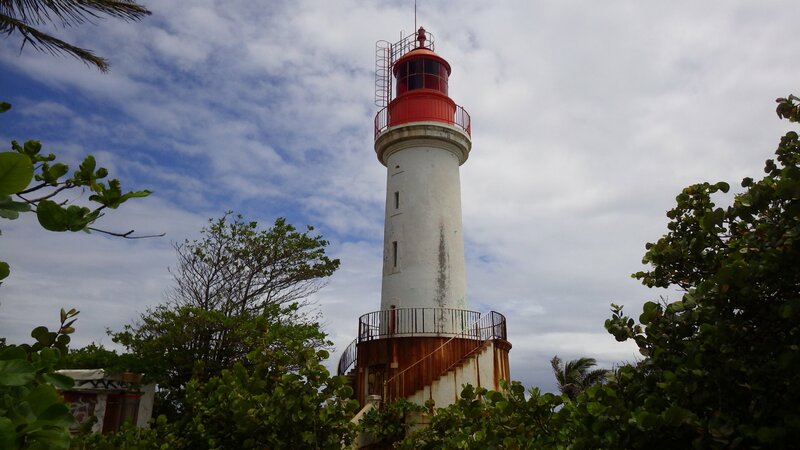 The small wooded island is partially surrounded by reefs, with an old-fashioned but still functional lighthouse. 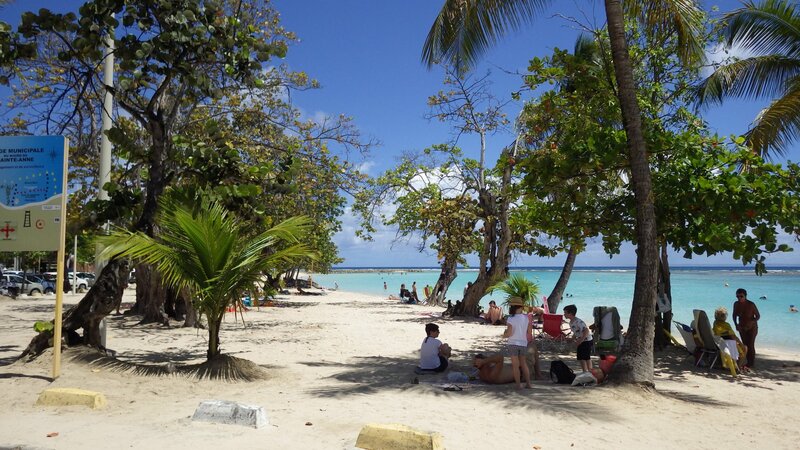 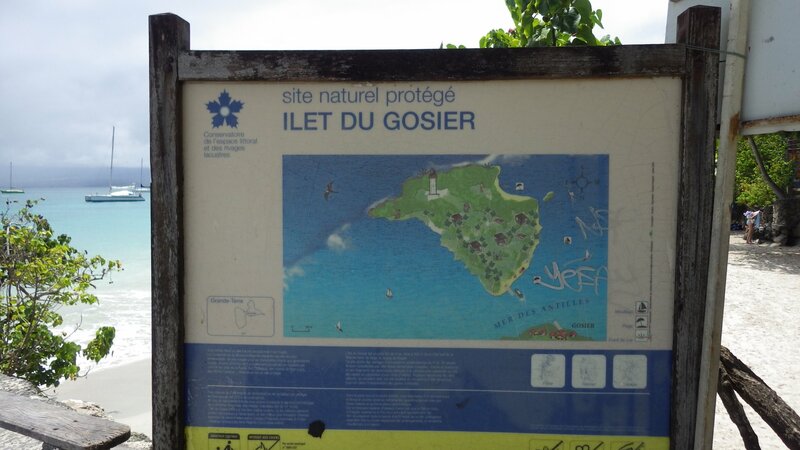 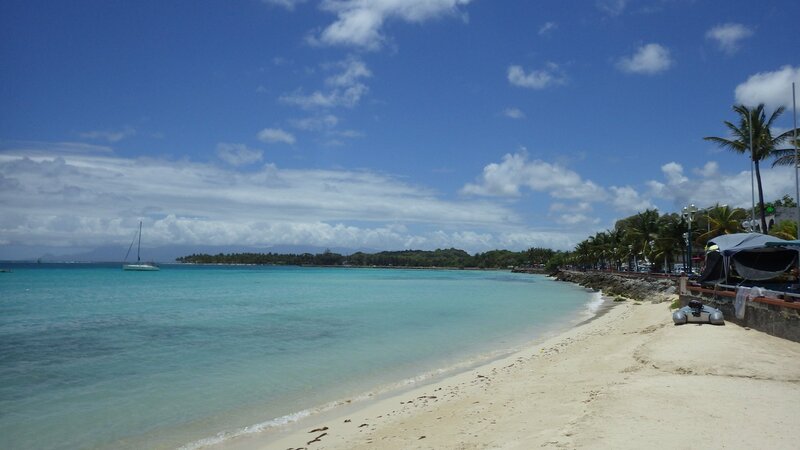 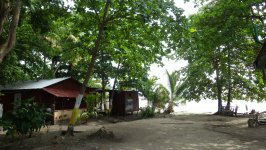 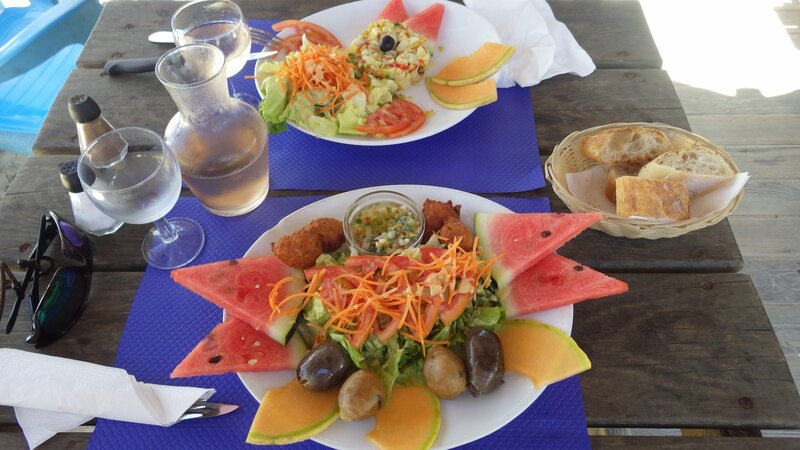 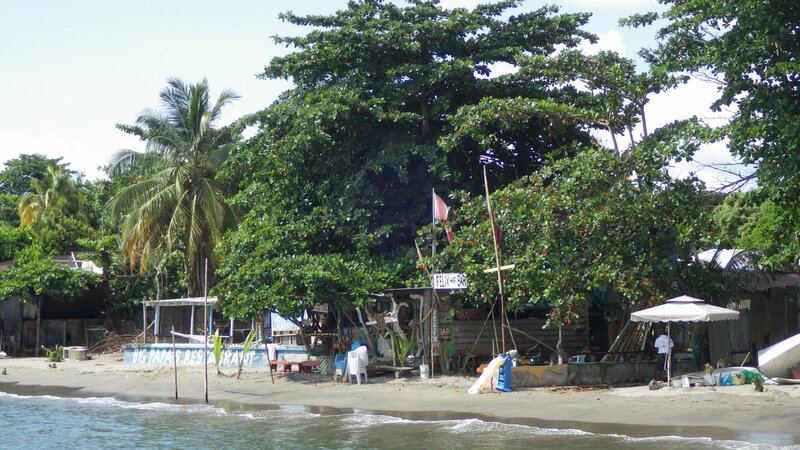 We stayed couple days here - visited the town, beach and spend a nice picnic day on the Ilet du Gosier. 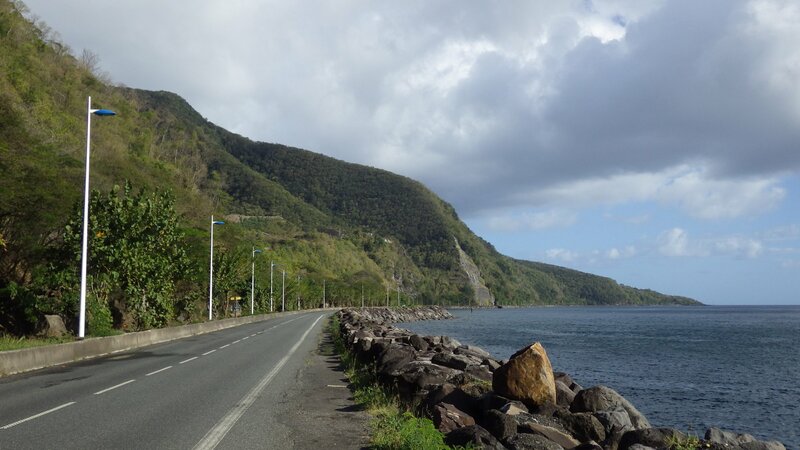 Moving further east along the southeast coast of Guadeloupe. Just wanted to have a secluded spot for a day, and Petit Havre seemed like such place. 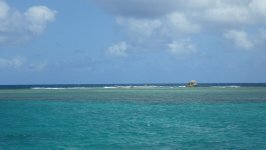 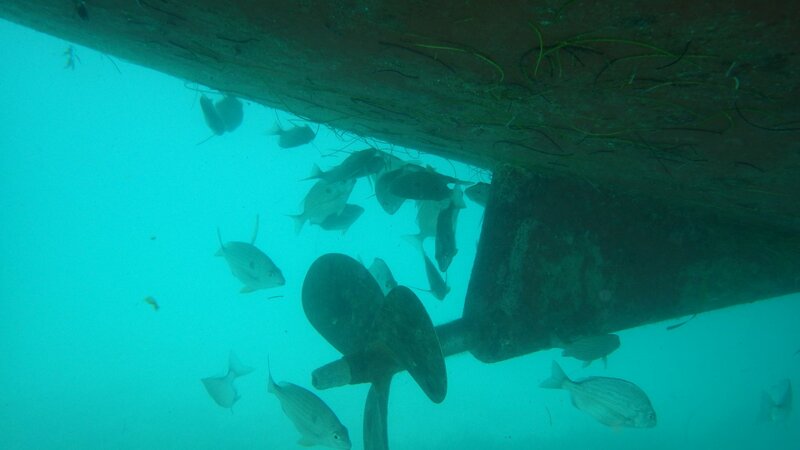 Reef protects the small anchorage, with waves barely passing through. 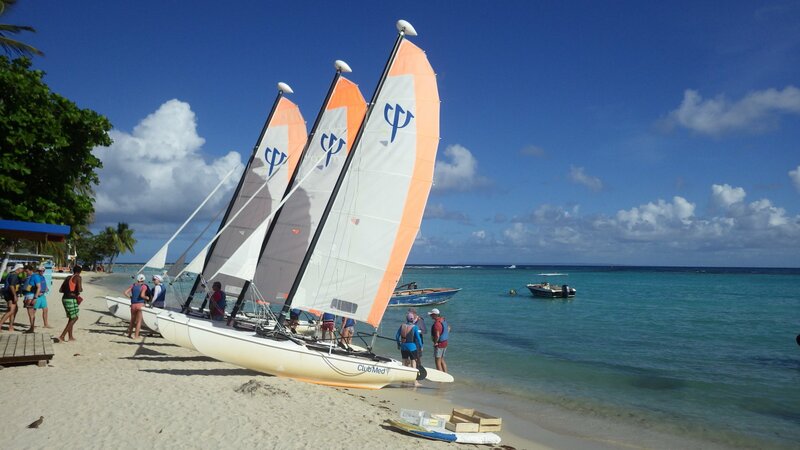 We were the only boat here, with occasional windsurfers zooming by. 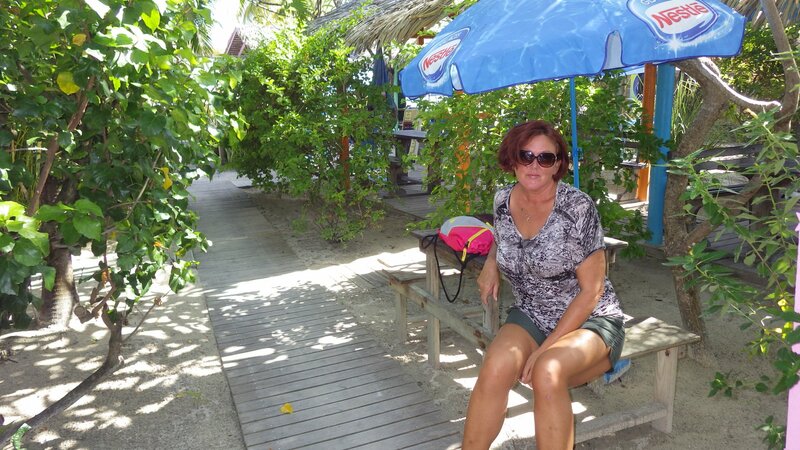 Had lots of sun tanning and just feeling lazy. 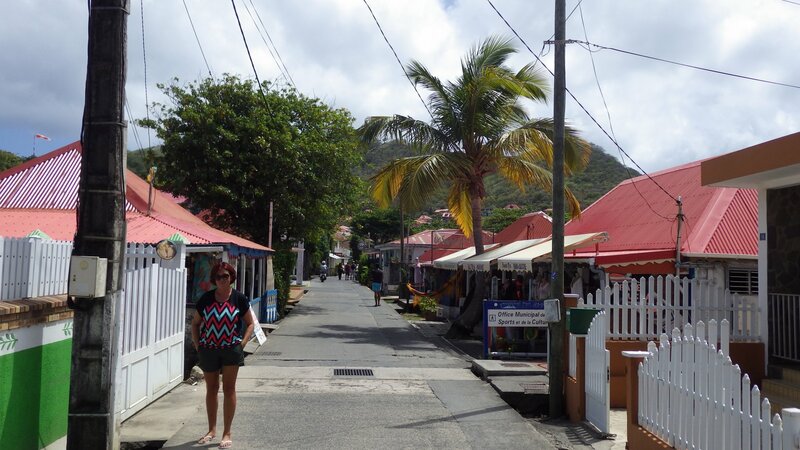 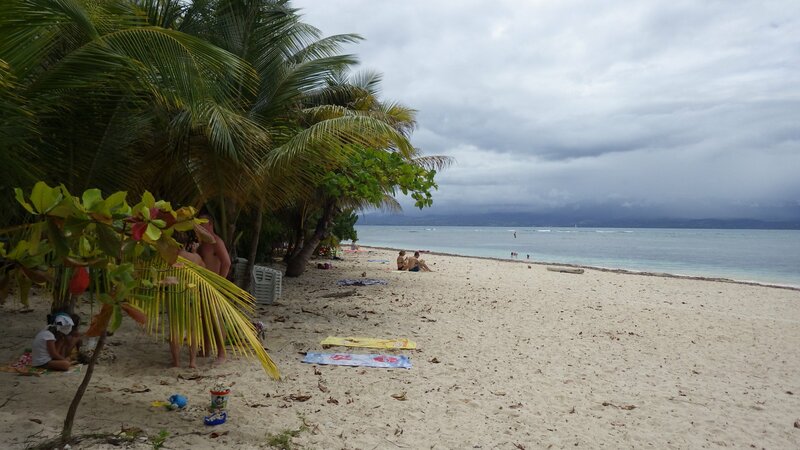 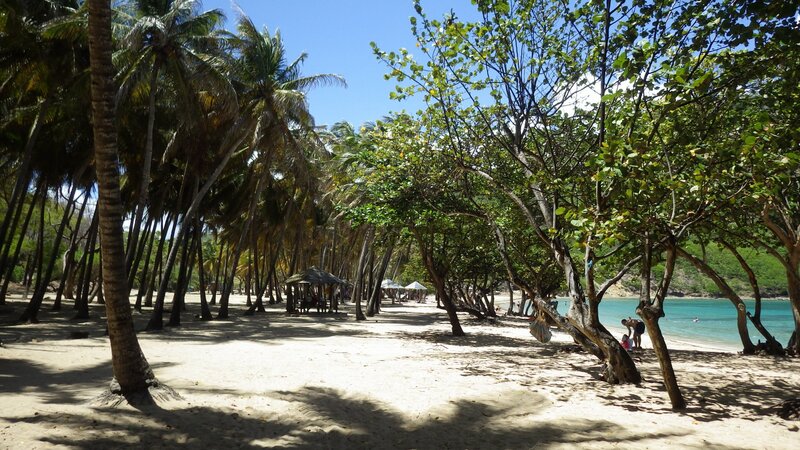 We really liked Sainte Anne. 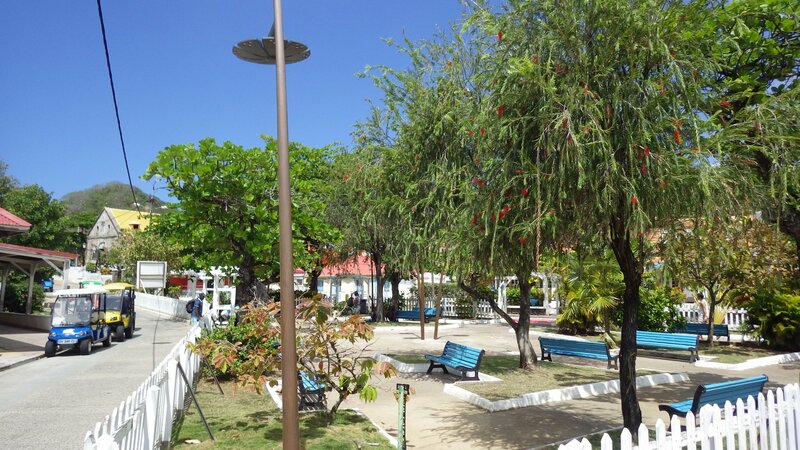 It's a very pleasant resort town. 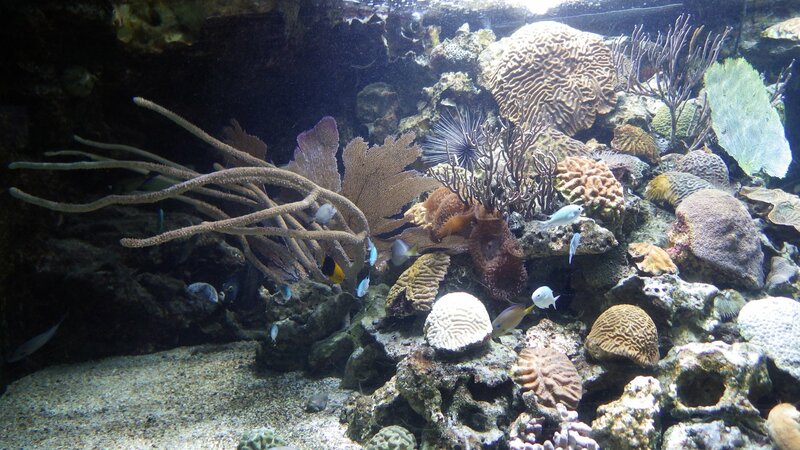 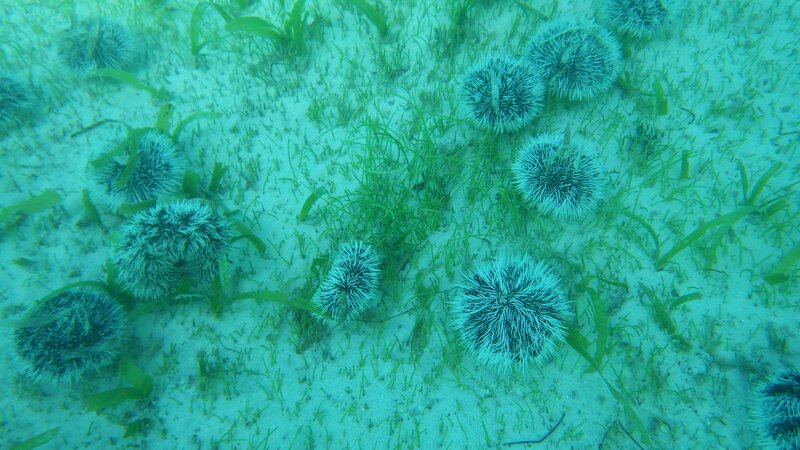 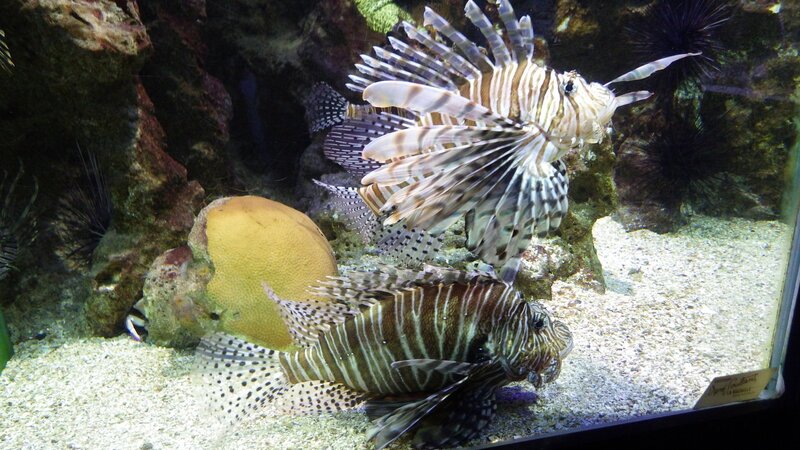 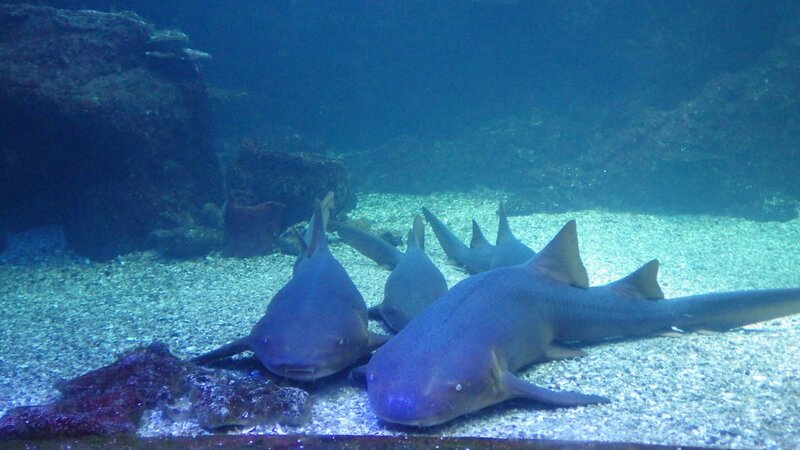 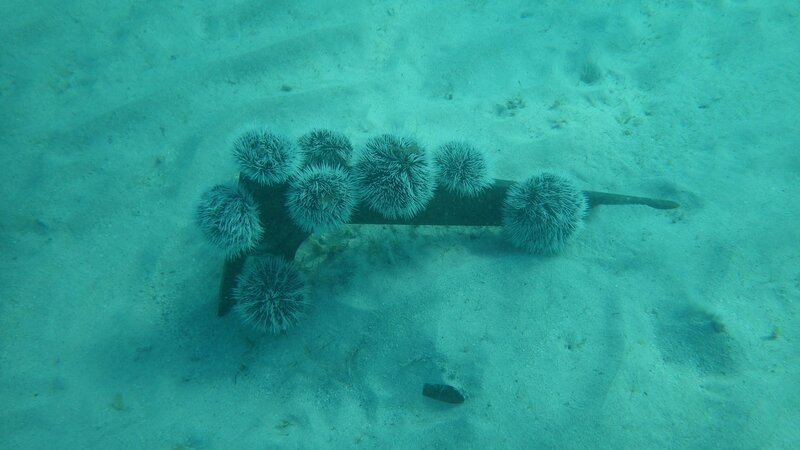 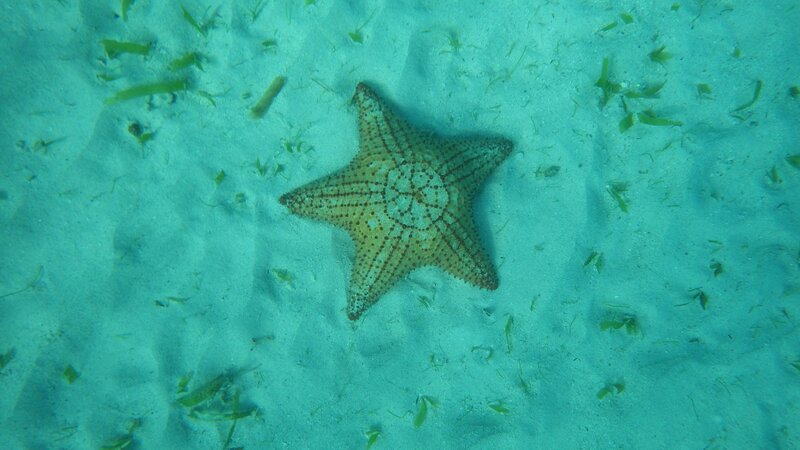 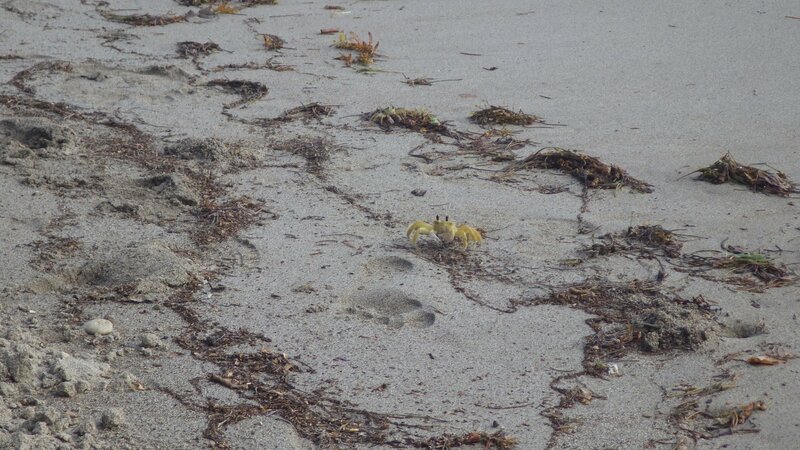 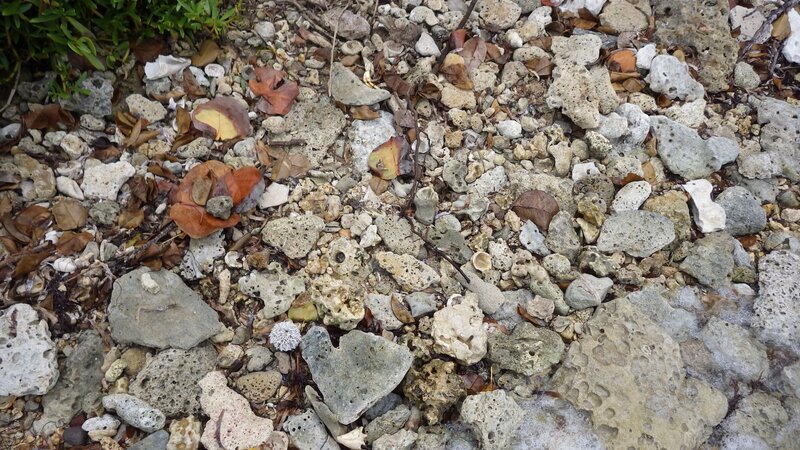 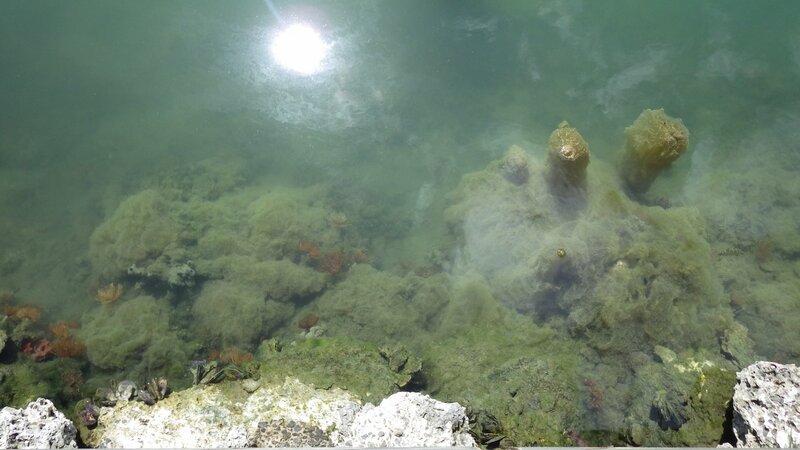 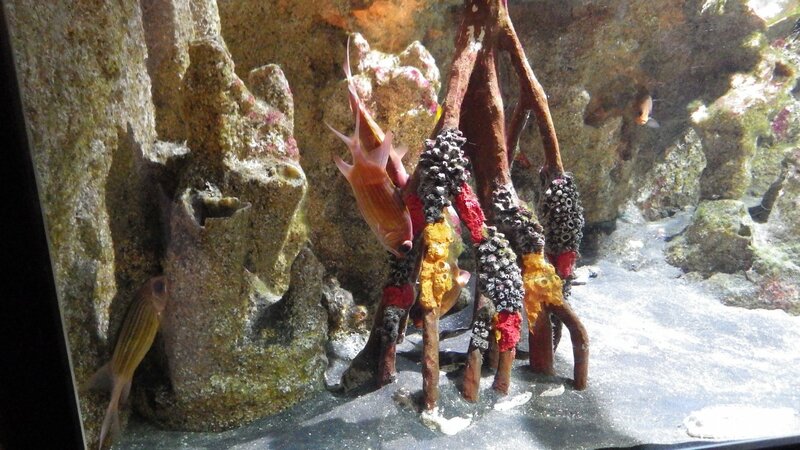 The beaches are great, protected by reef, although a bit crowded for our taste. 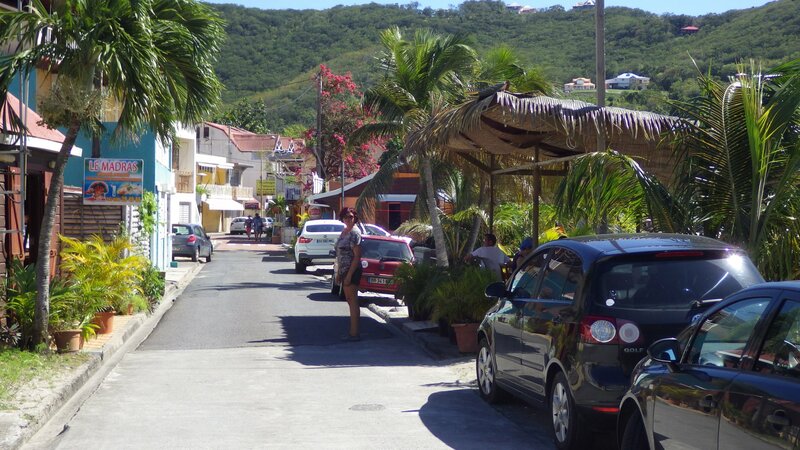 The atmosphere is holiday central. 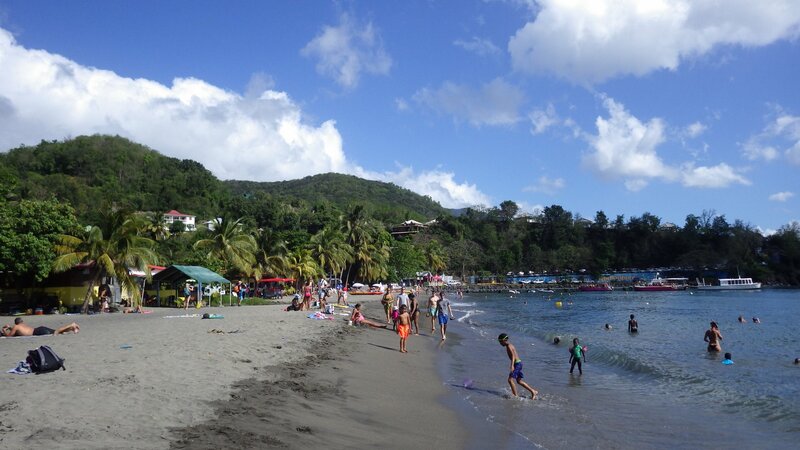 There are lots of people, including kids, all having fun. 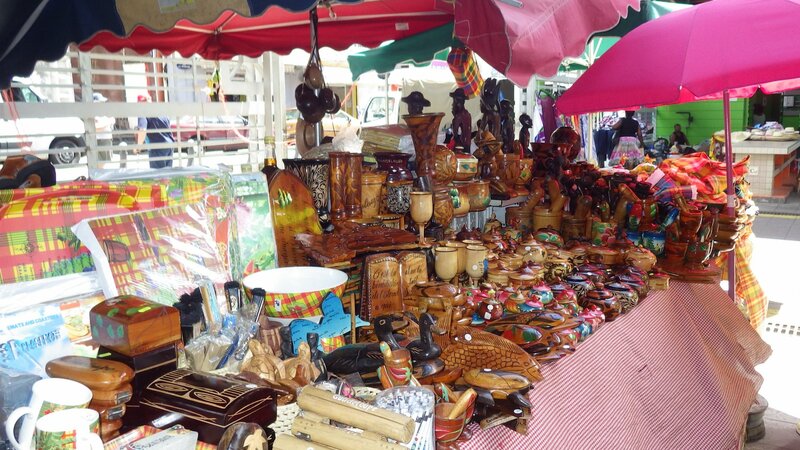 There are many artisan souvenir markets, fresh fruits and vegetable stands, restaurants, good grocery stores, several bakeries making tasty French baguettes. 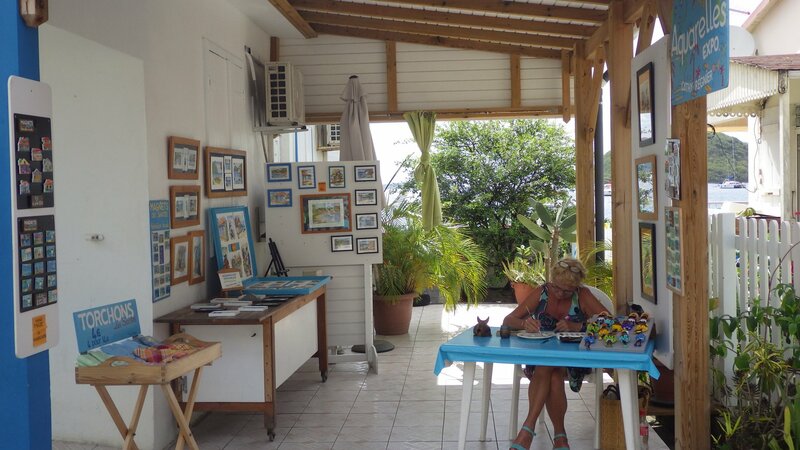 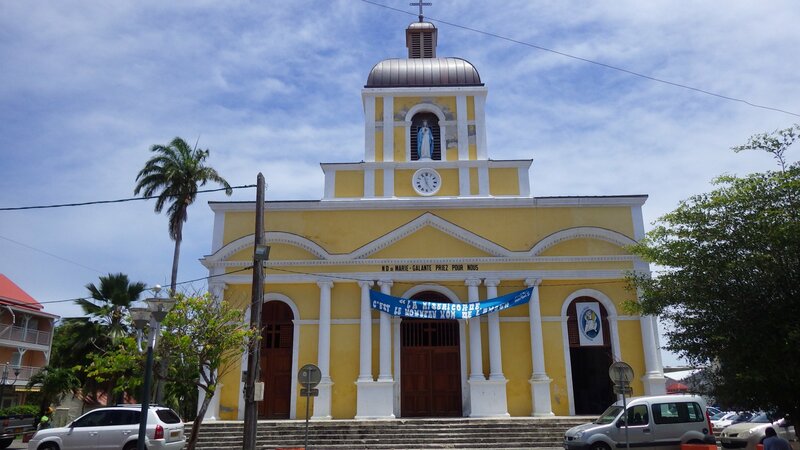 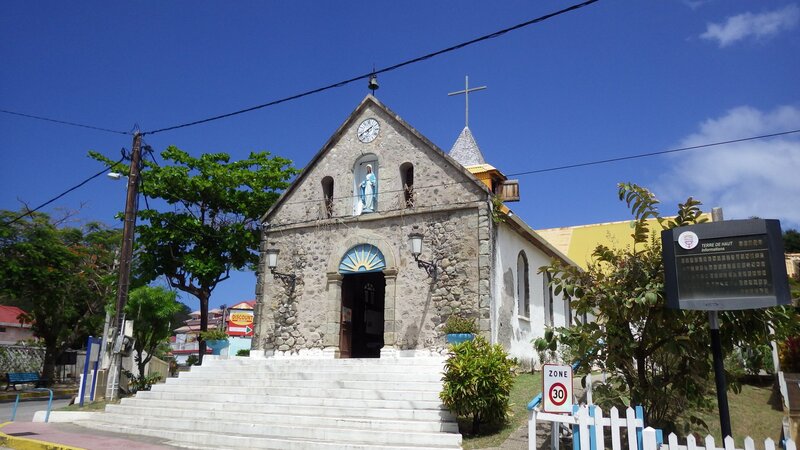 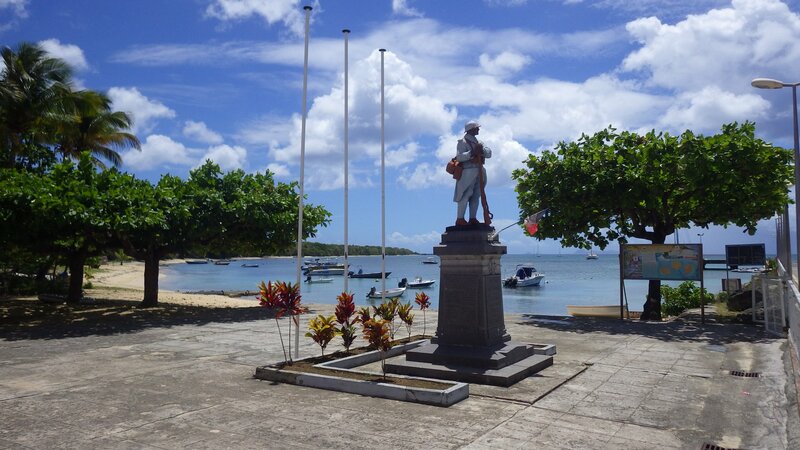 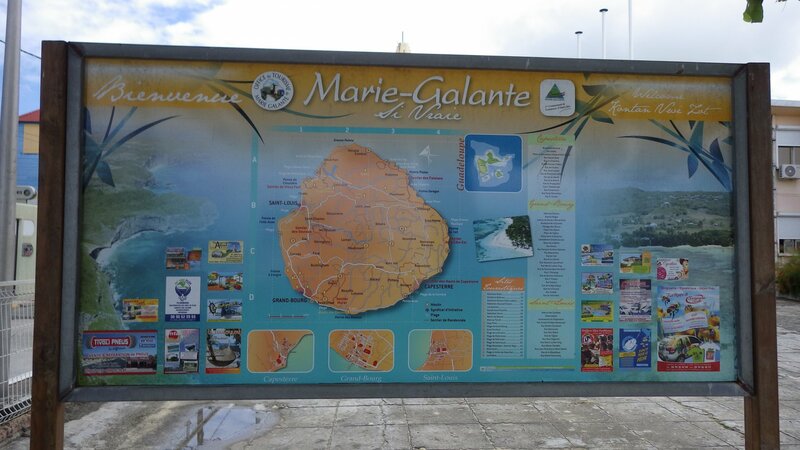 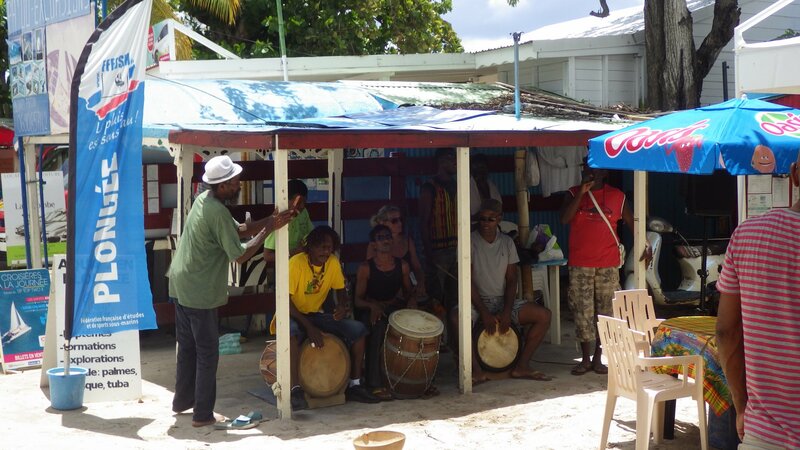 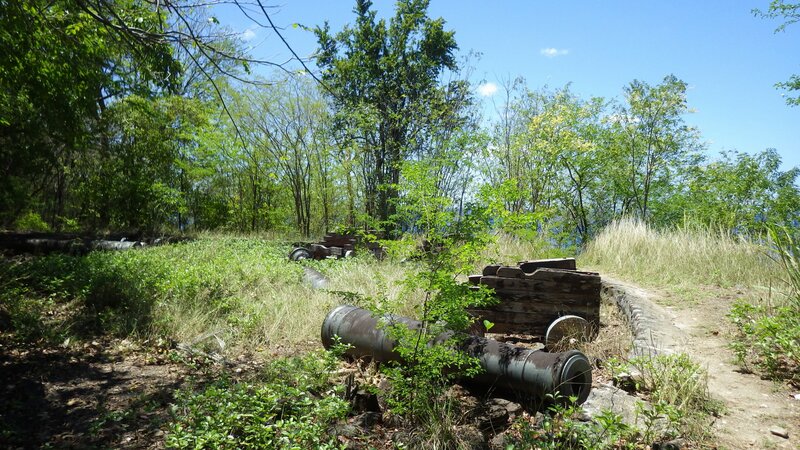 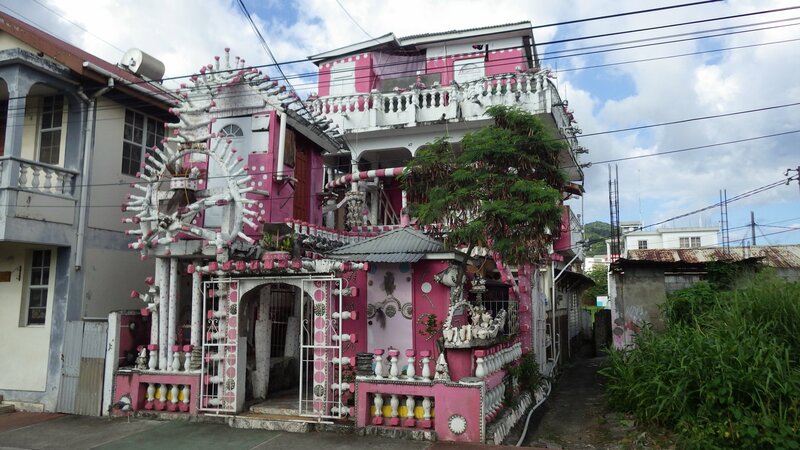 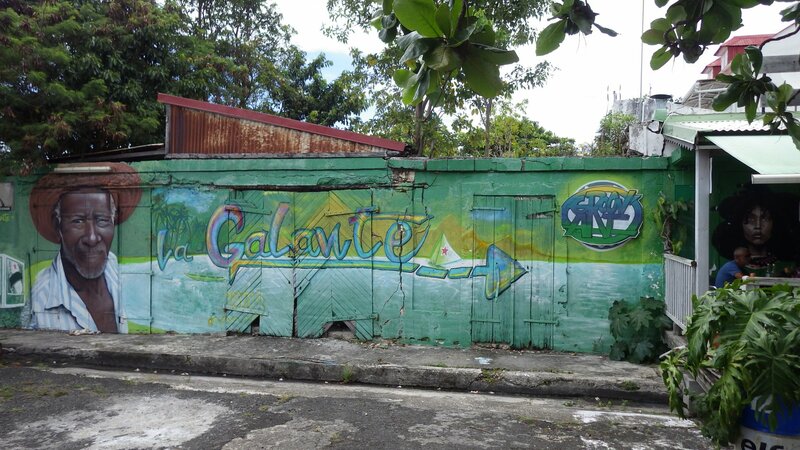 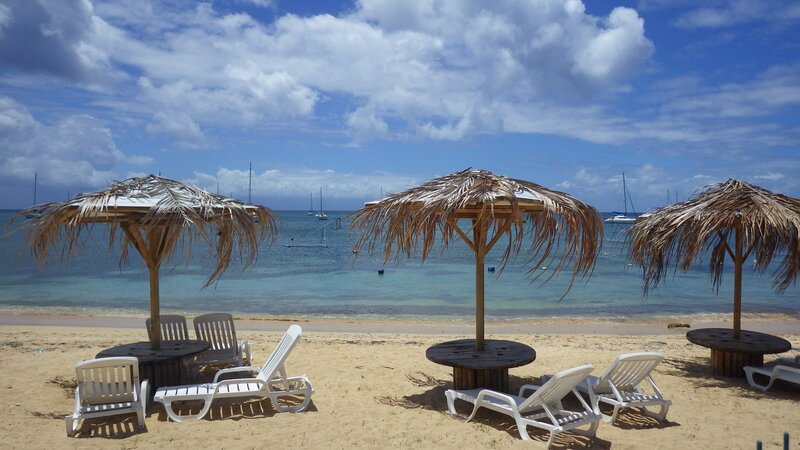 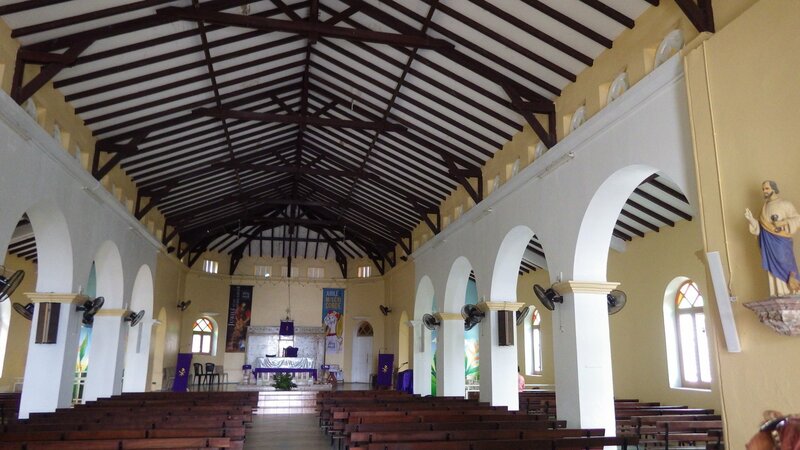 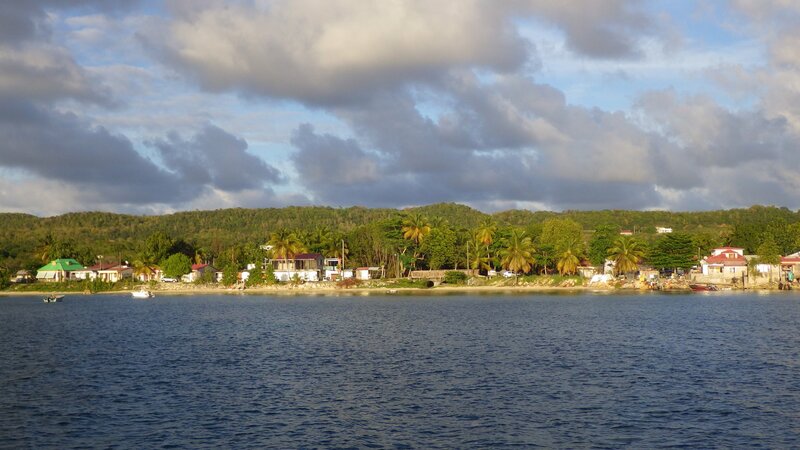 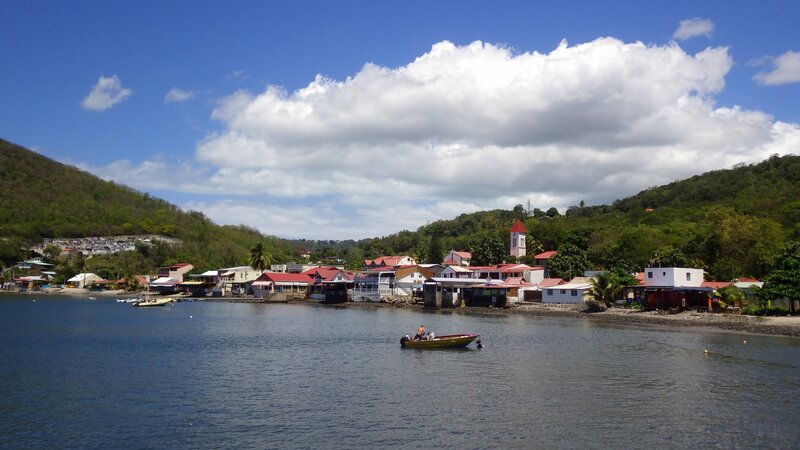 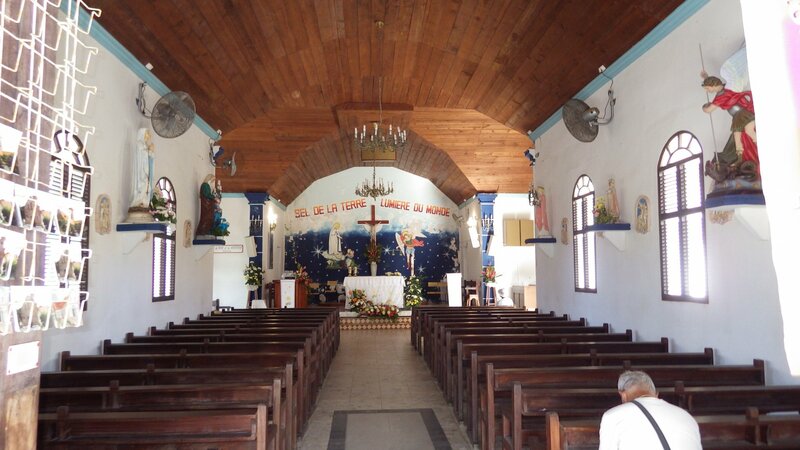 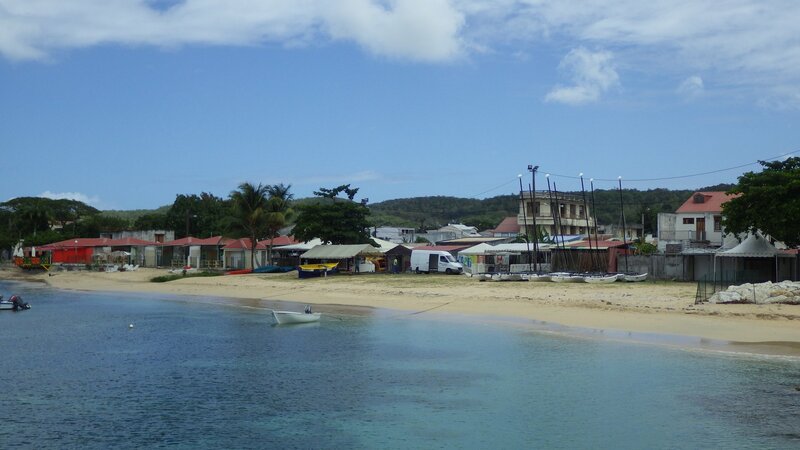 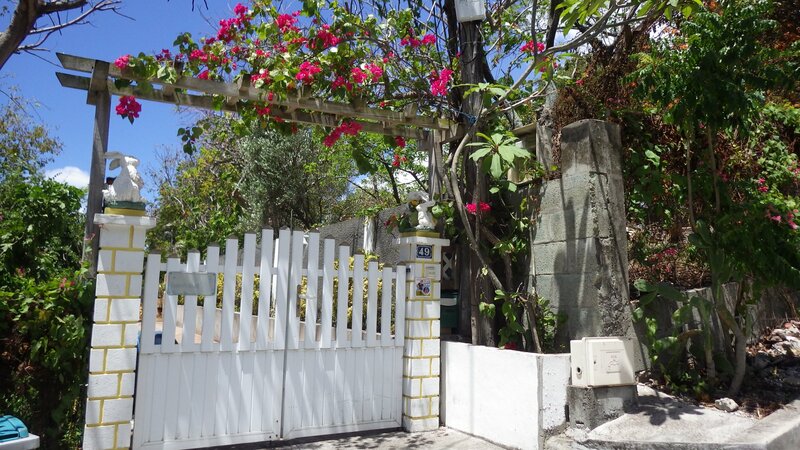 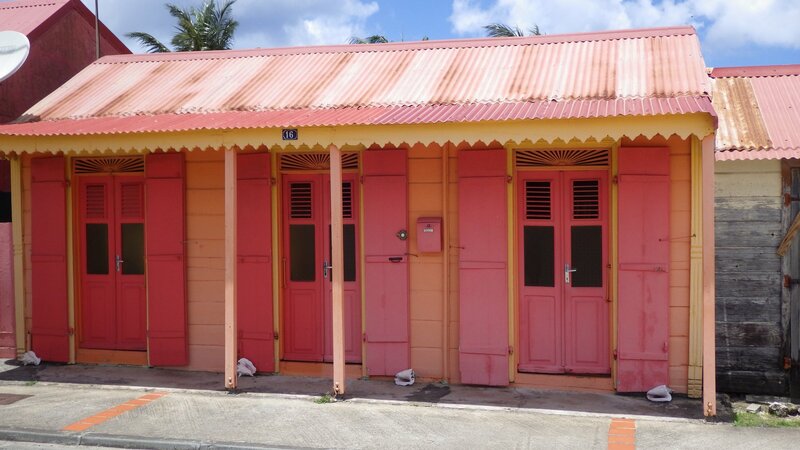 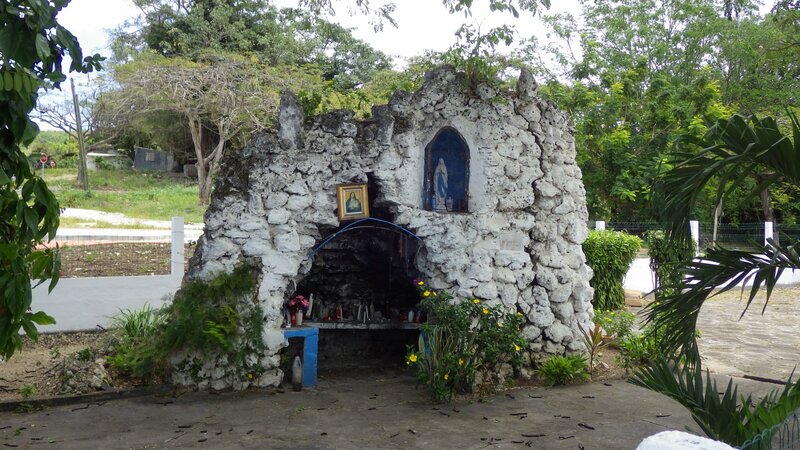 St. Louis is a small, quiet and unassuming town on the island of Maria Galante. 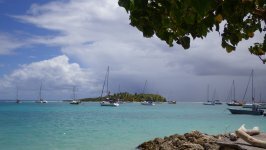 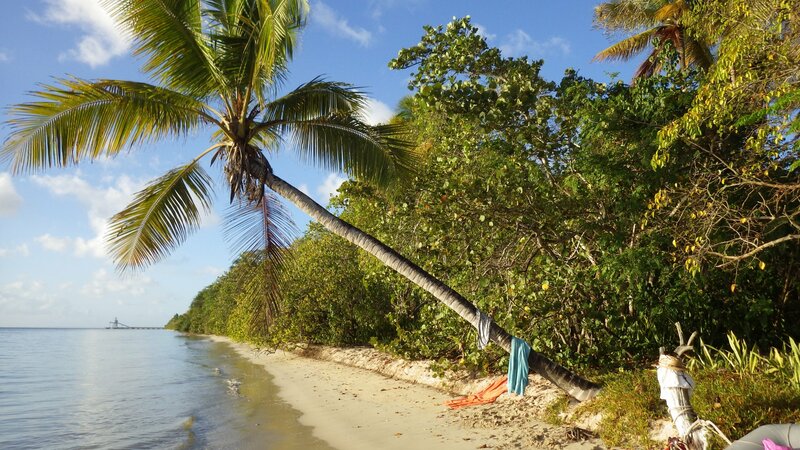 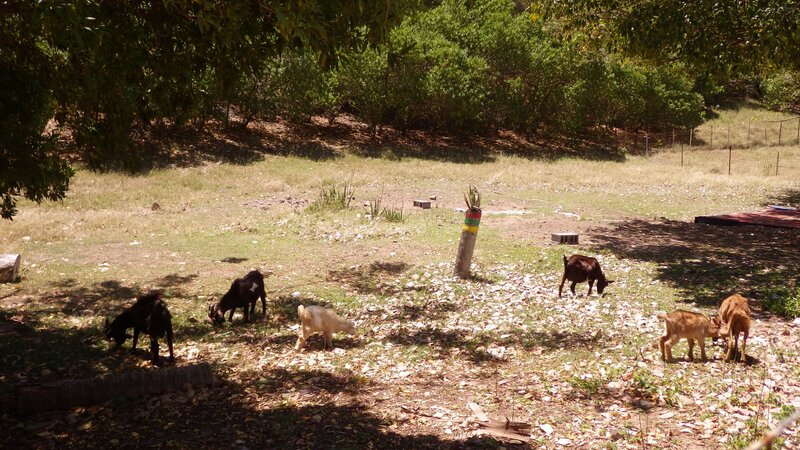 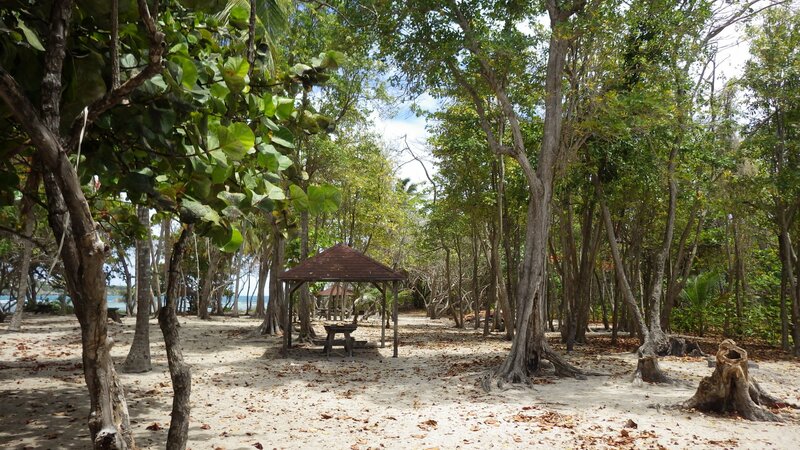 Off the beaten track, there are not many tourists on the island. 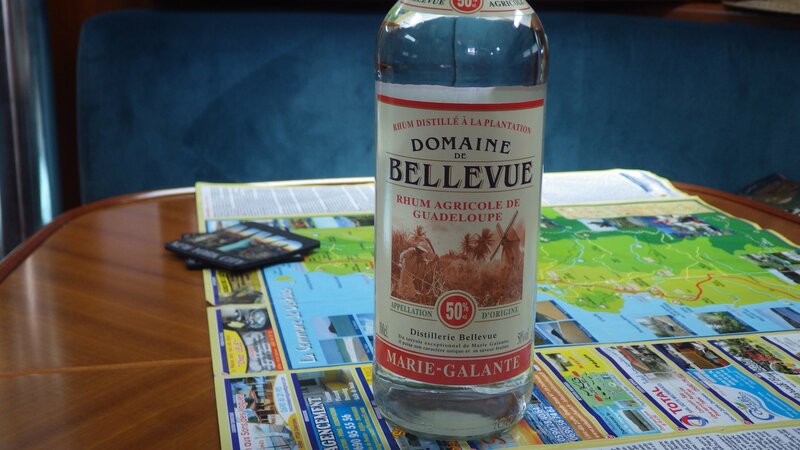 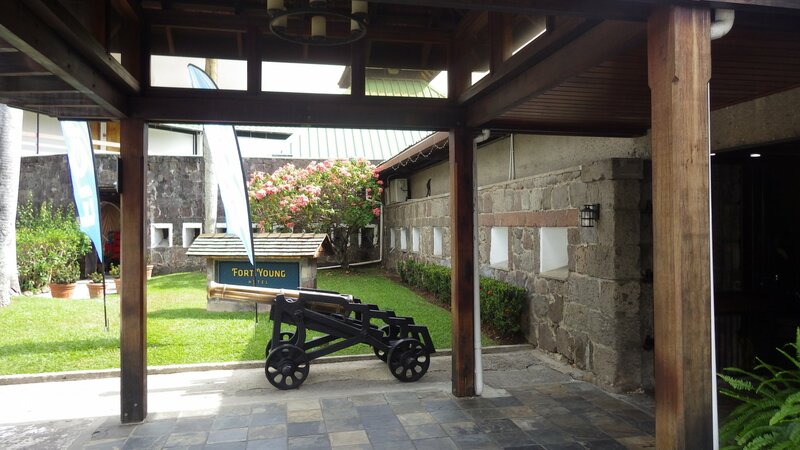 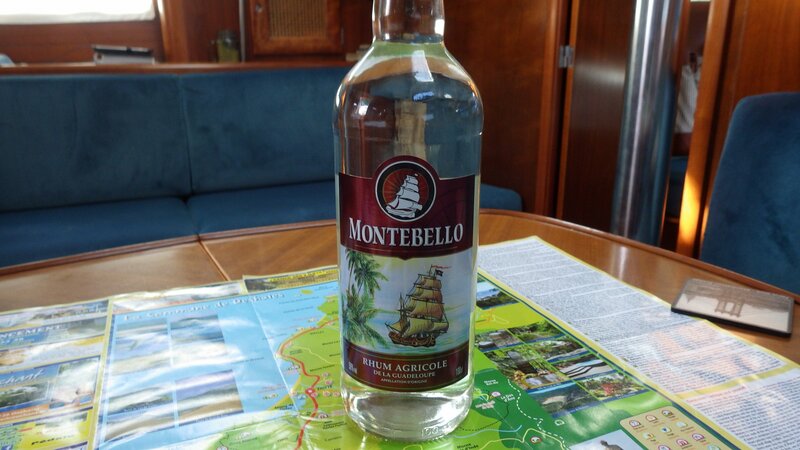 There are some still running sugar cane plantations and mills, and you can taste one of the finest rums here. 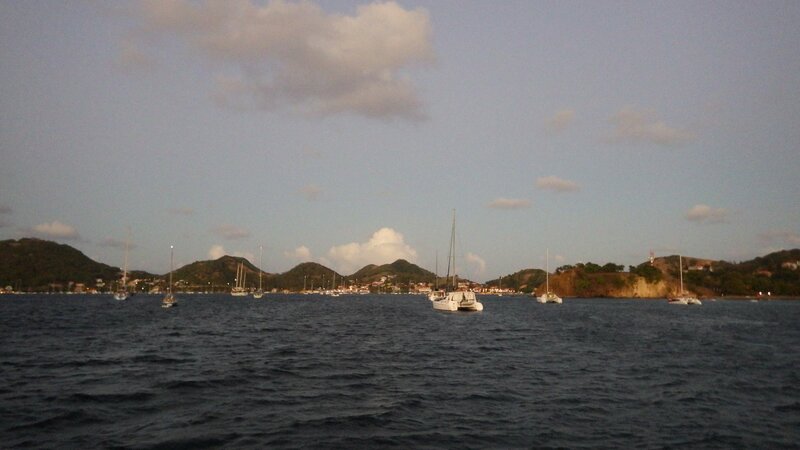 Good swimming, evening picnic ashore... We were the only yacht here. 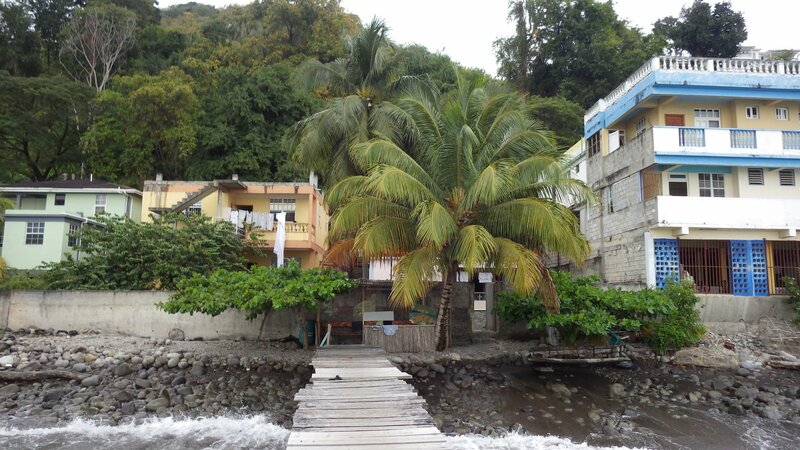 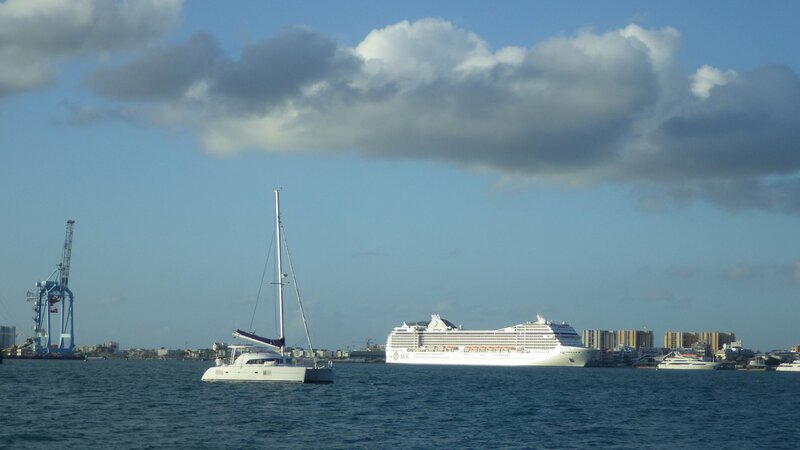 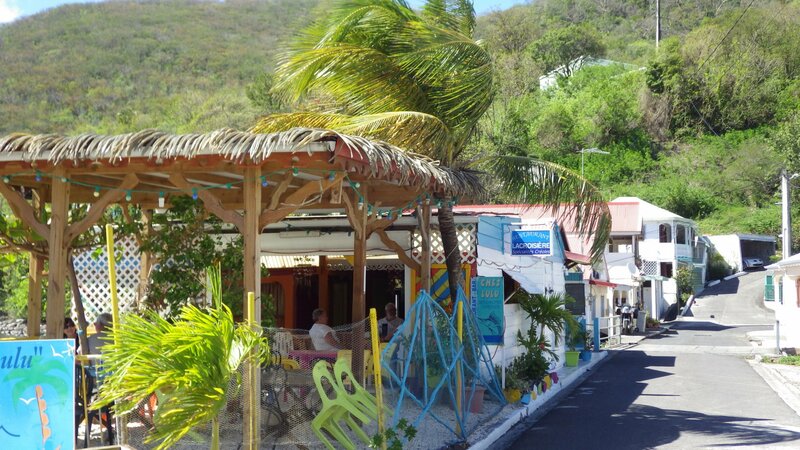 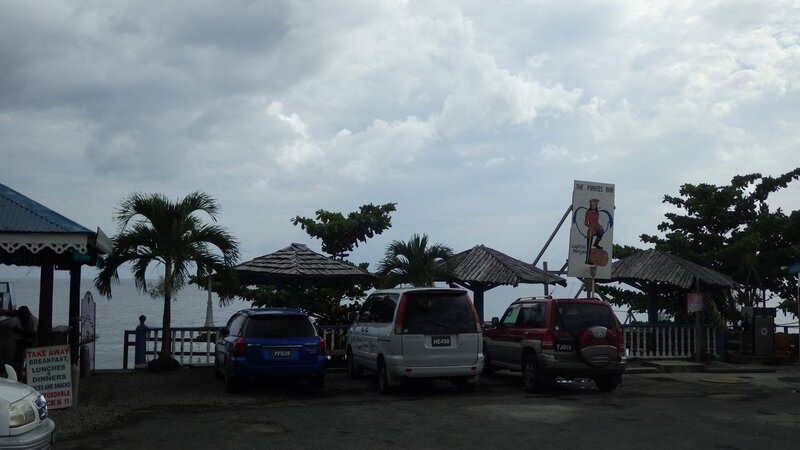 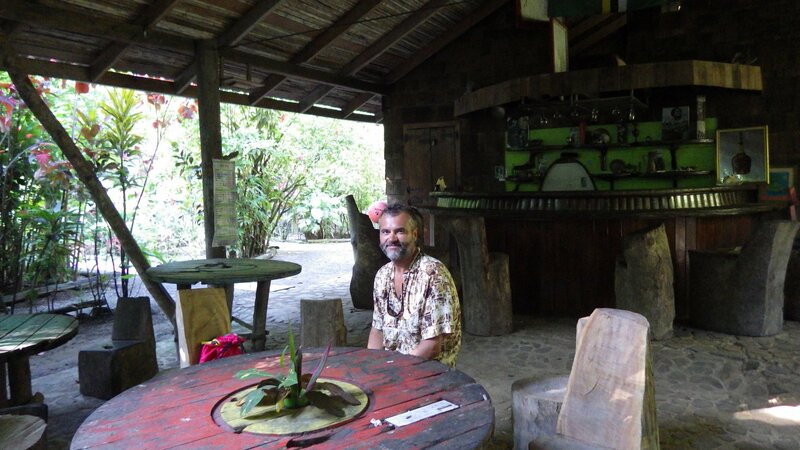 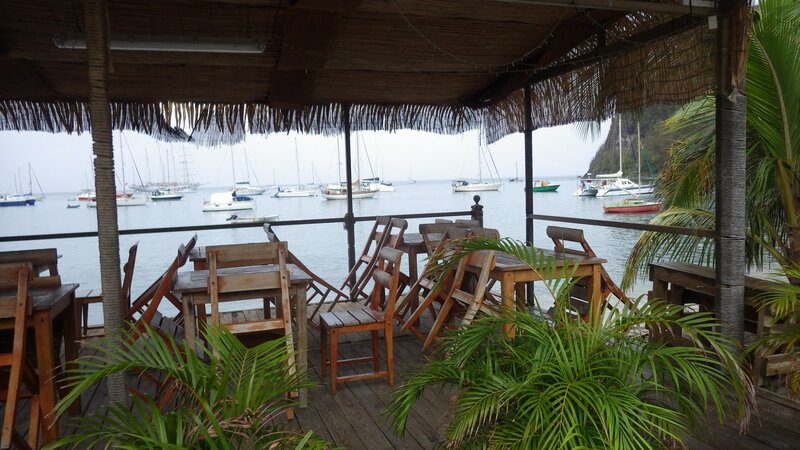 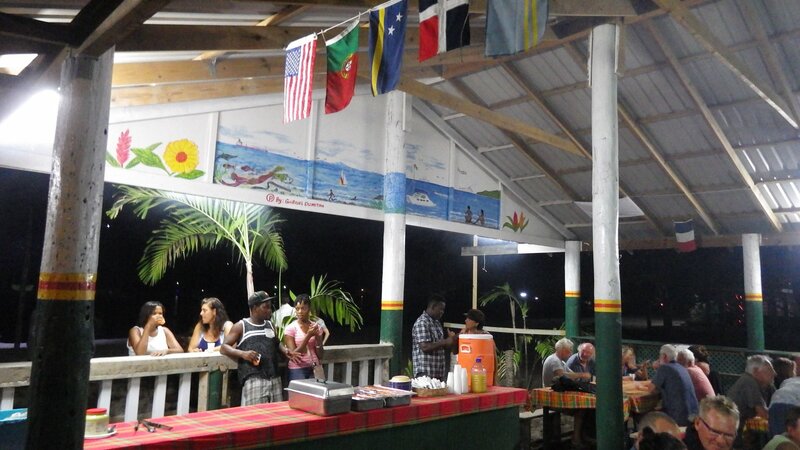 This was a quick one day stay, checking out with customs before leaving for Dominica. 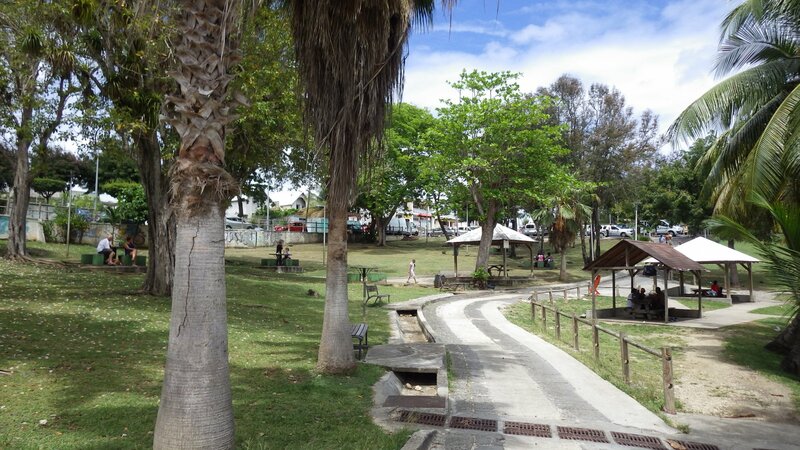 Did some street walking, sitting in the park, minor provisioning, lunch at the restaurant, looking for wi-fi. 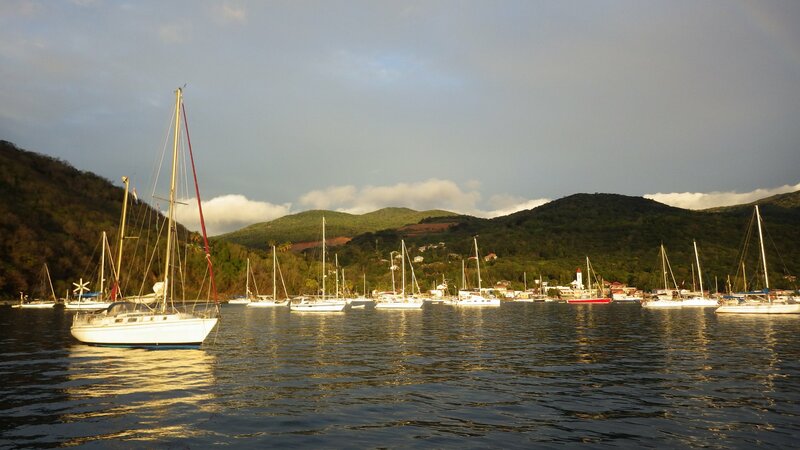 We first anchored inside of the wall-protected harbour, but it turned out to be too small - we were in the turning place of large ferries, so we re-anchored outside for the night. 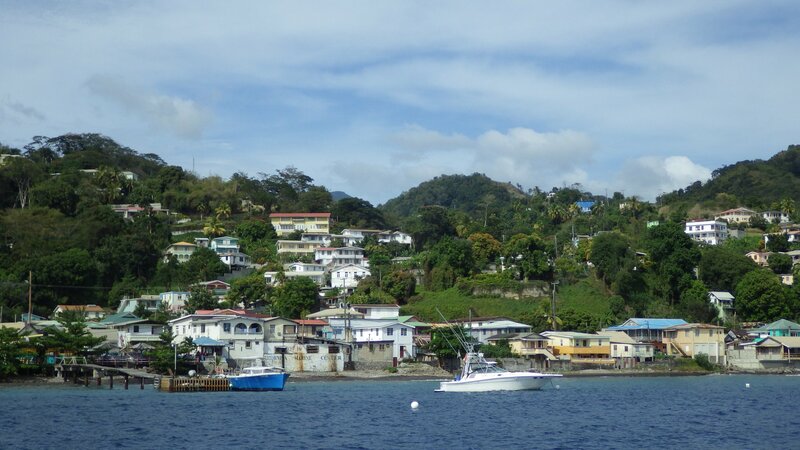 So we sailed to Dominica Island, arriving at Prince Rupert Bay and the town of Portsmouth, where we stayed several days. 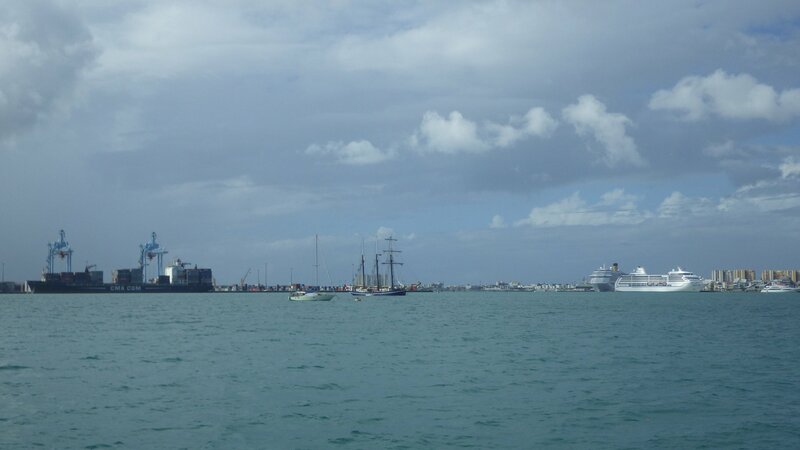 There is a tightly connected group of local guides here - Portsmouth Association of Yacht Services (PAYS). 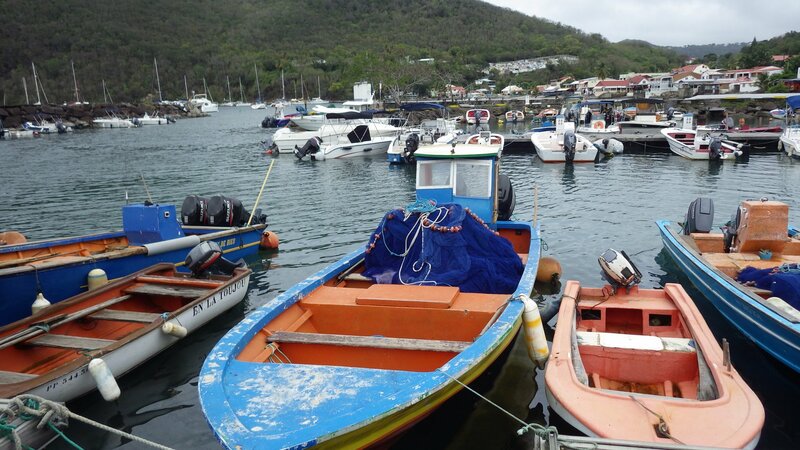 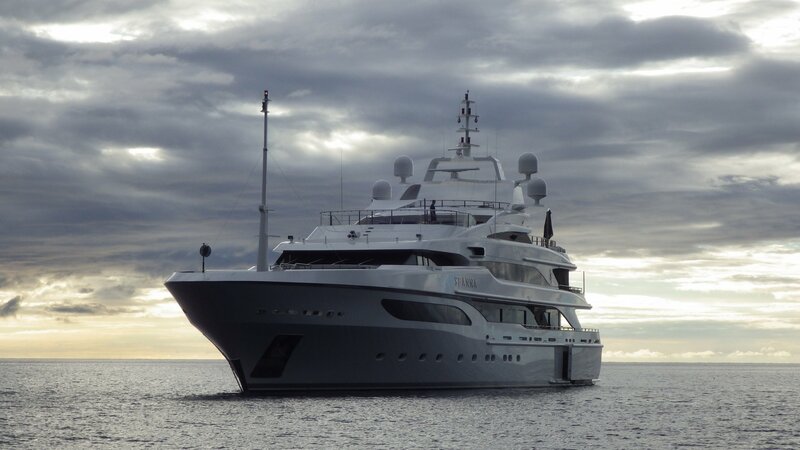 One of their members would meet you on their boat as soon as you approach the bay, offering their services. 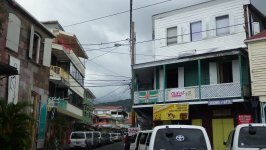 They provide tours, help with repairs, getting water and whatever else you may need, as well as look after security in the area. 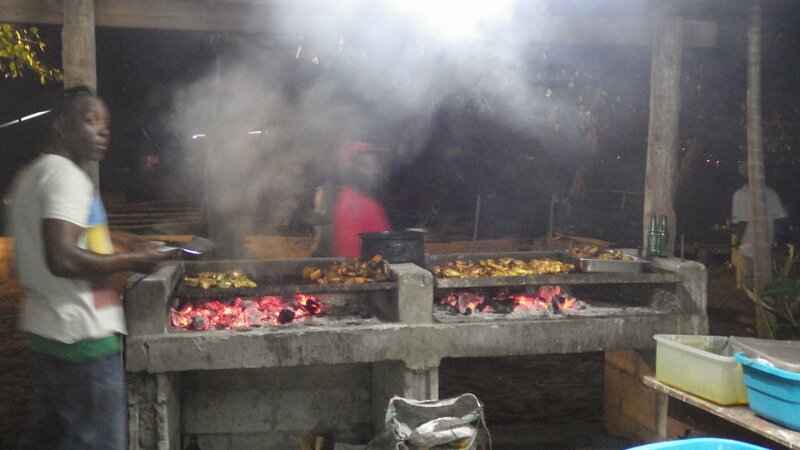 On the last night of our stay here, we went to the Saturday BBQ organized by PAYS. 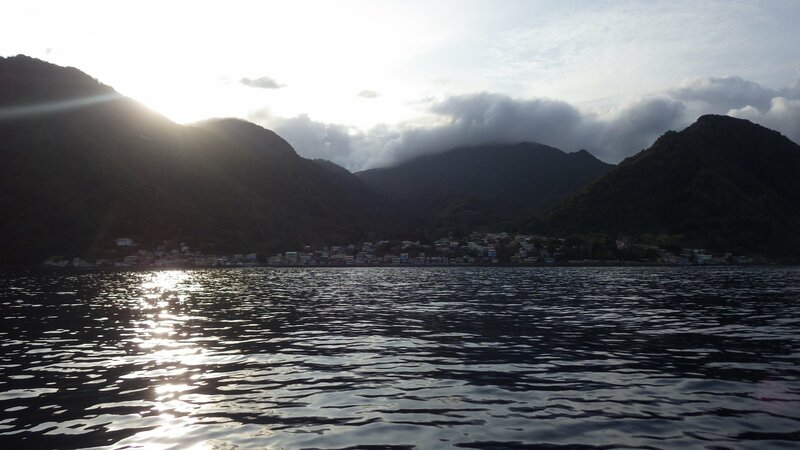 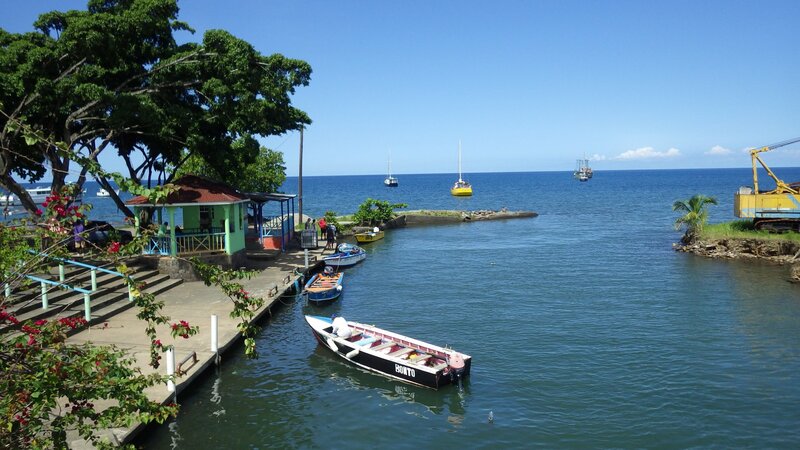 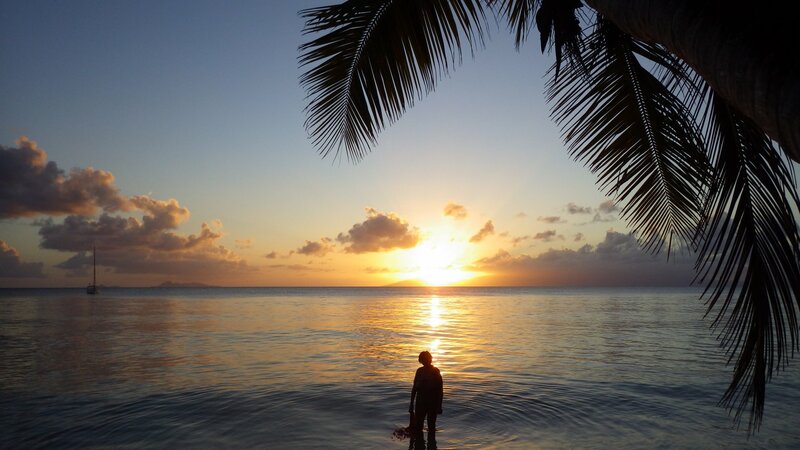 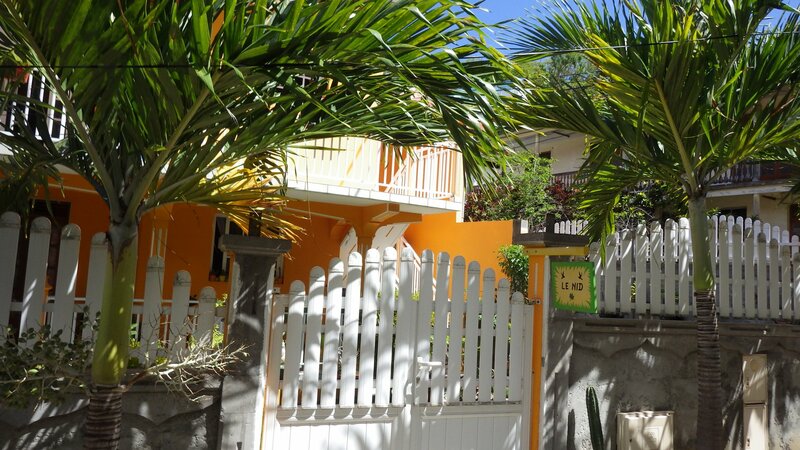 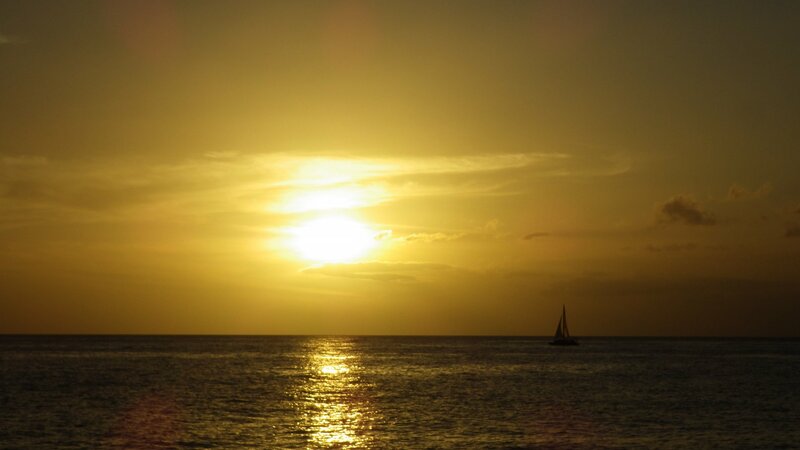 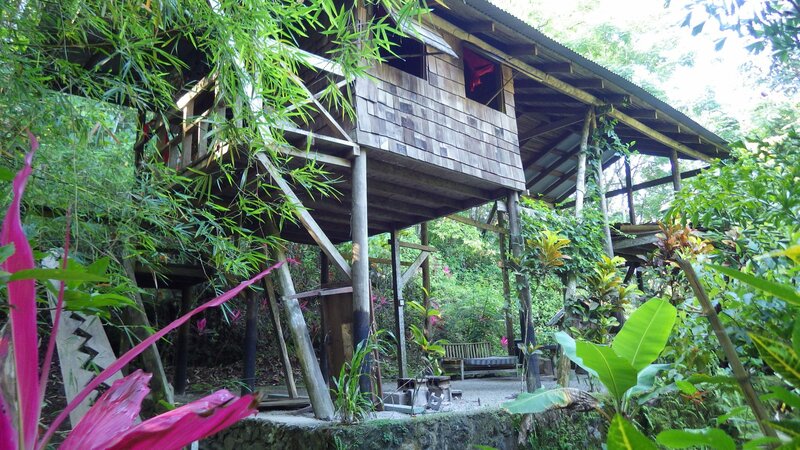 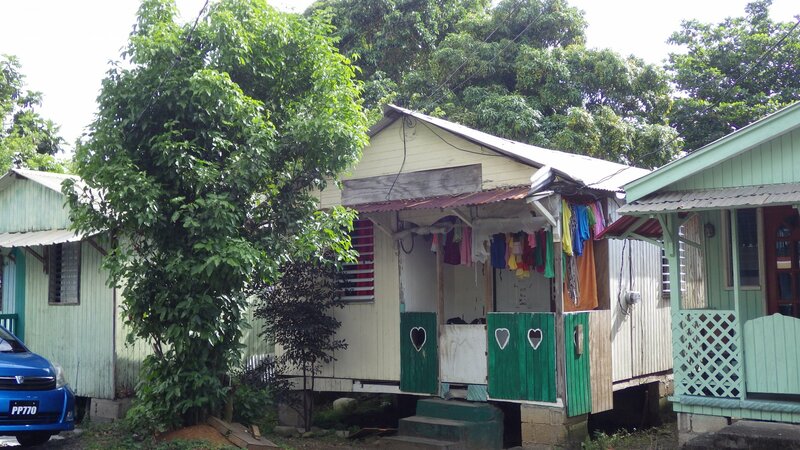 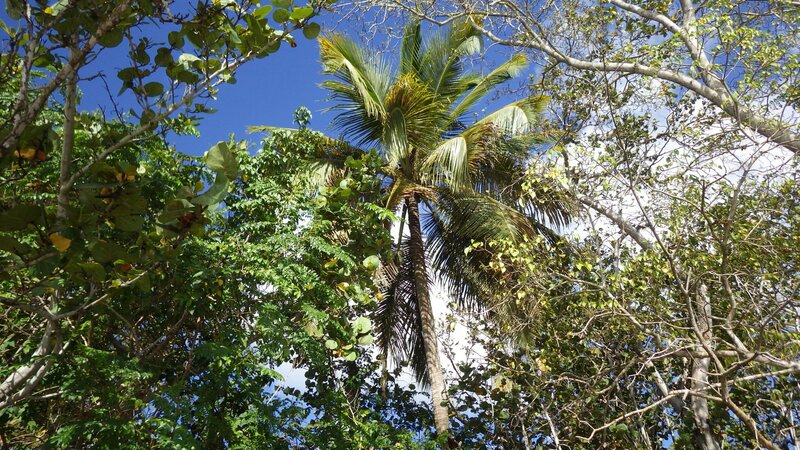 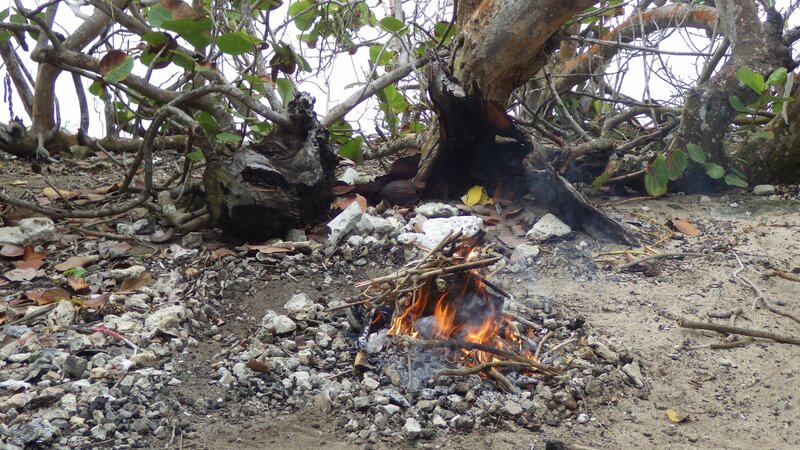 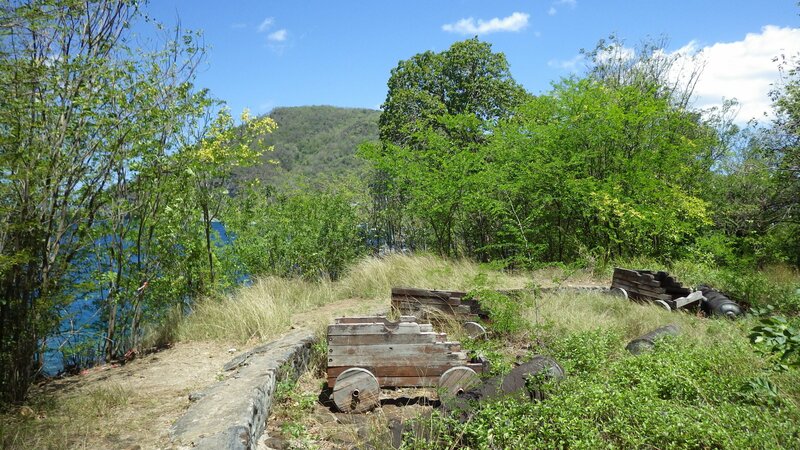 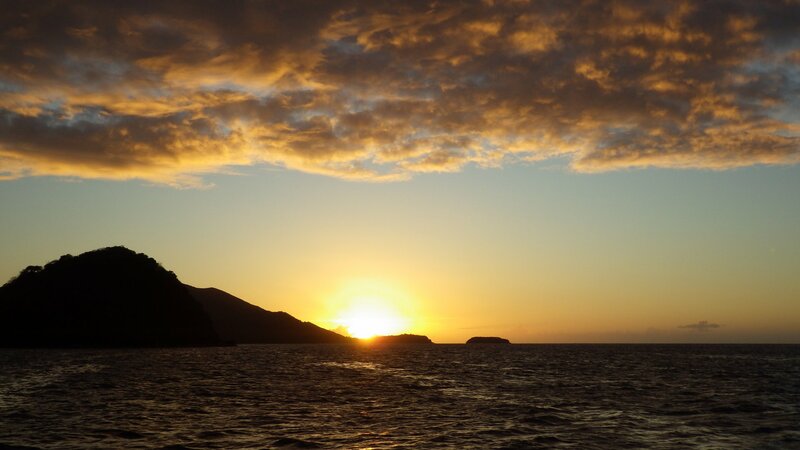 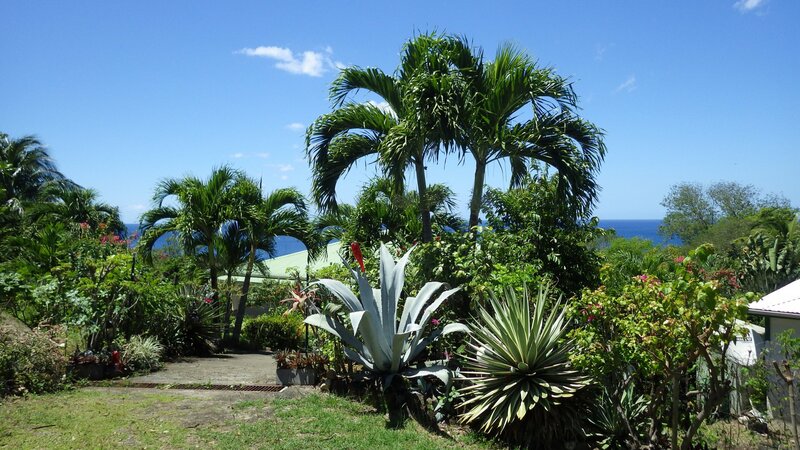 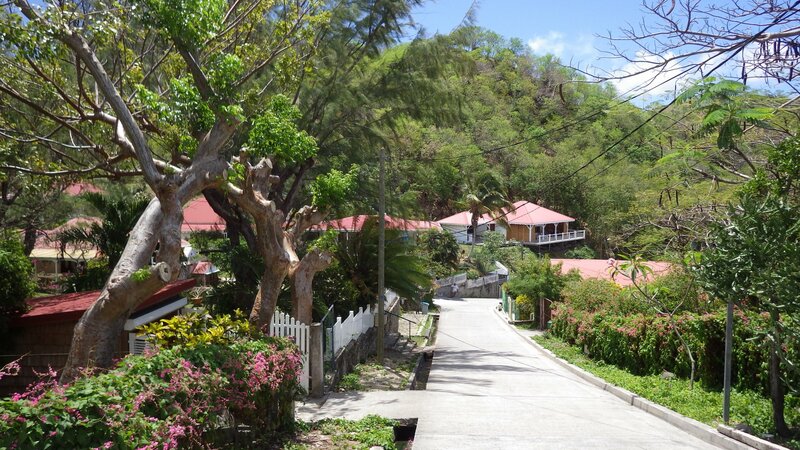 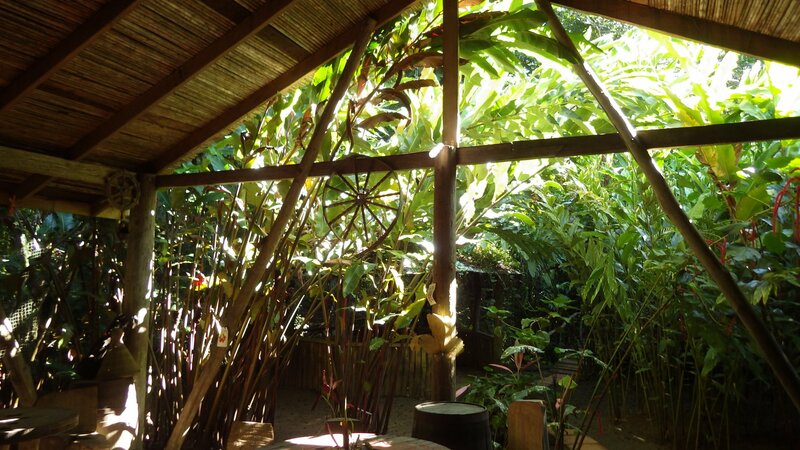 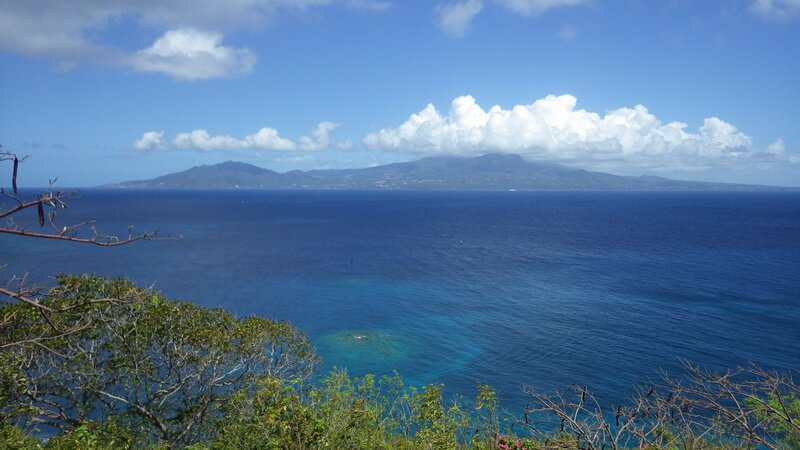 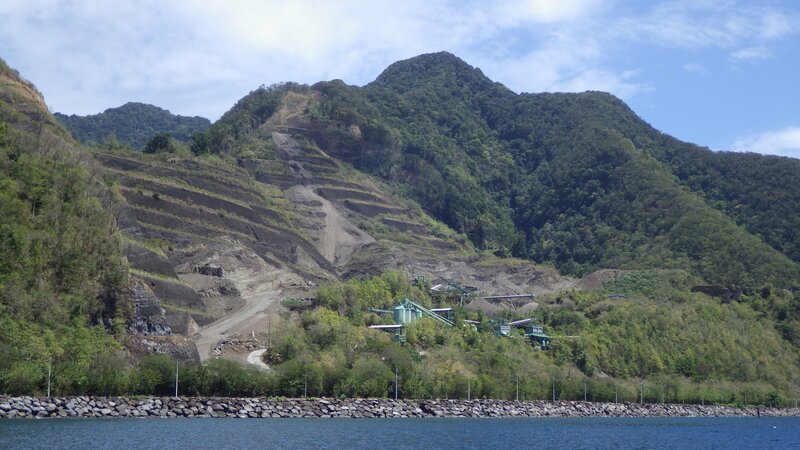 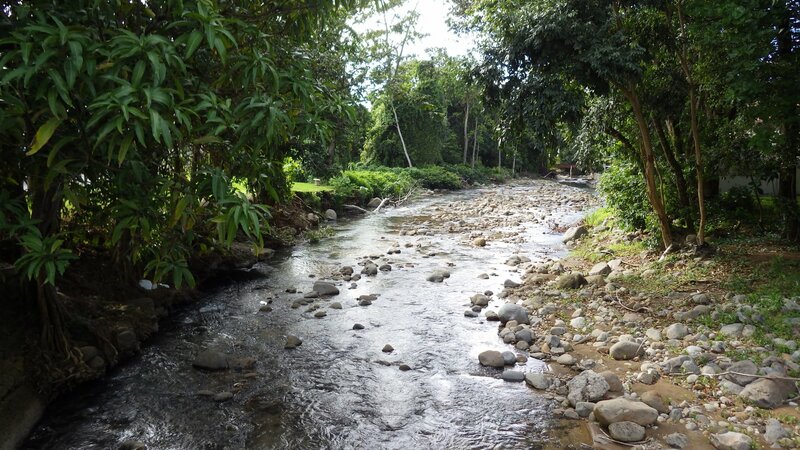 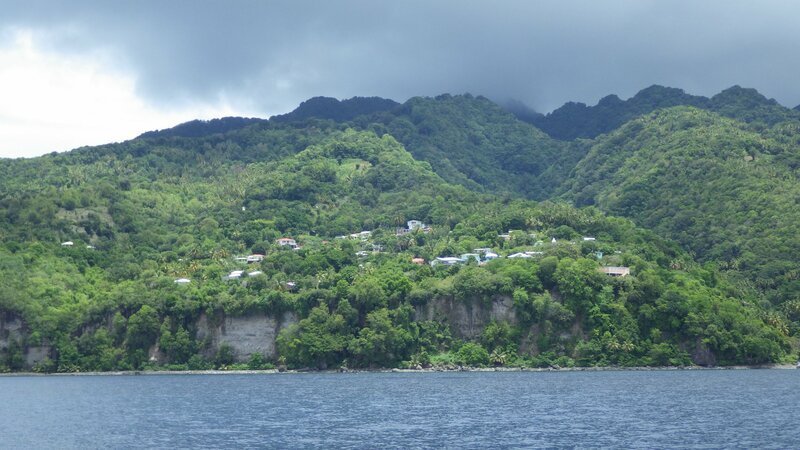 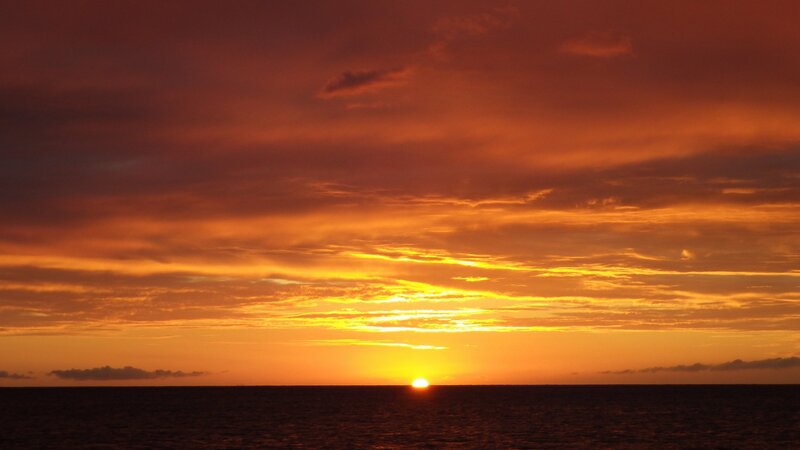 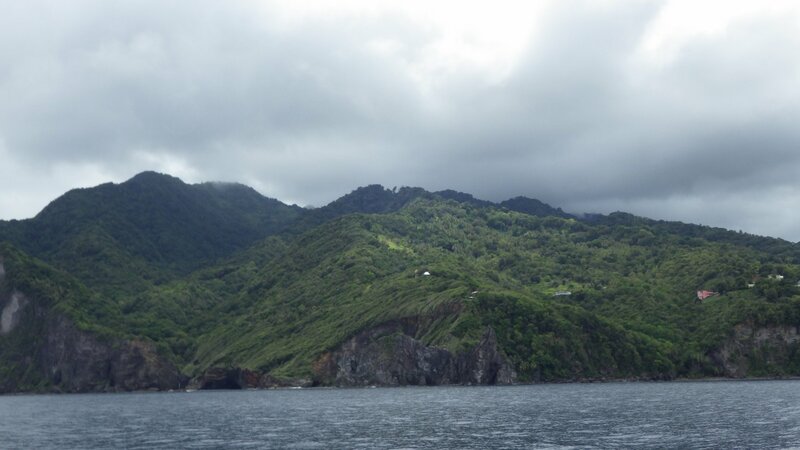 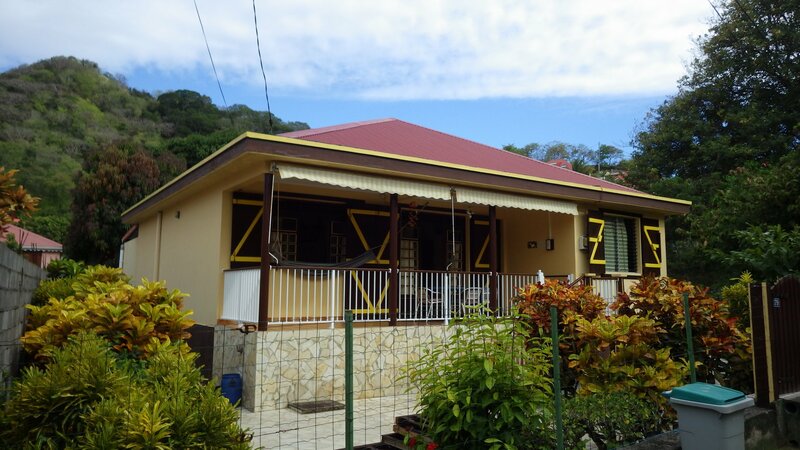 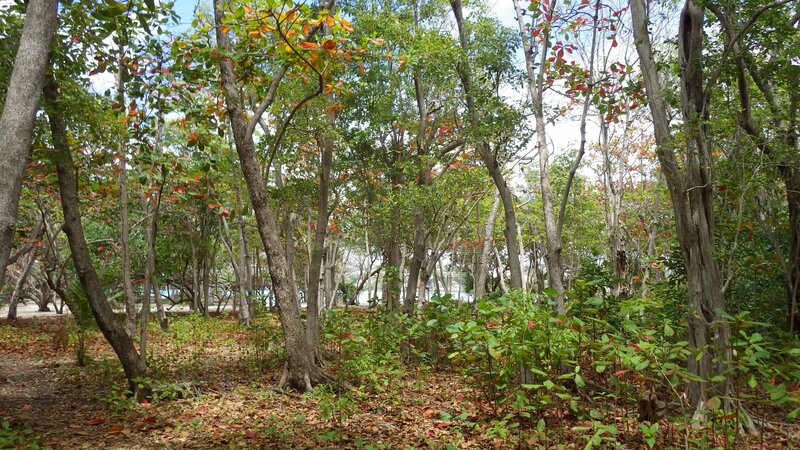 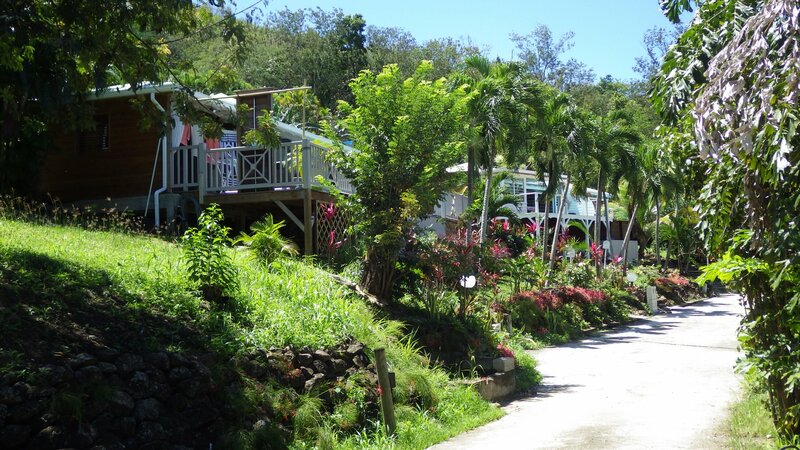 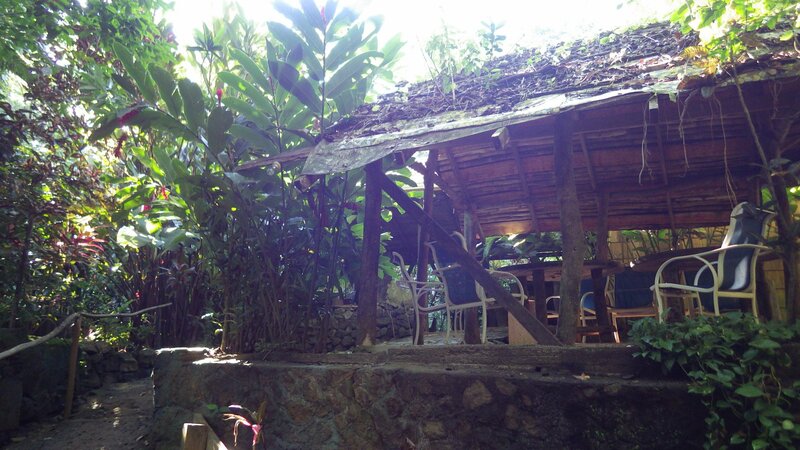 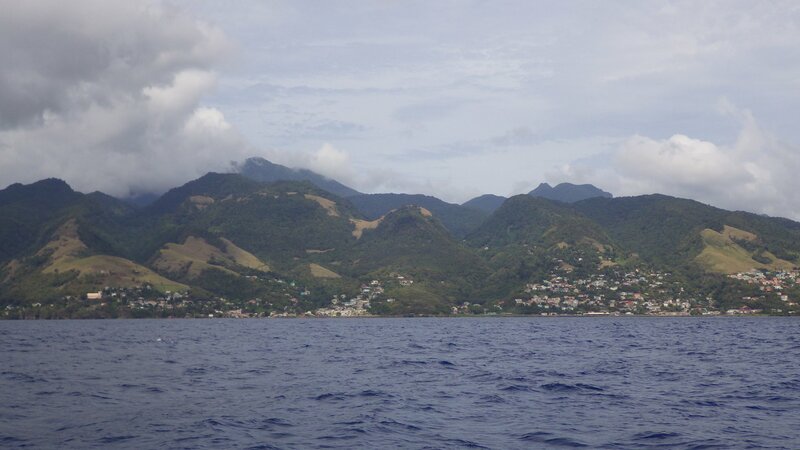 Although being relatively poor, Dominica offers unspoiled and spectacular natural beauty. 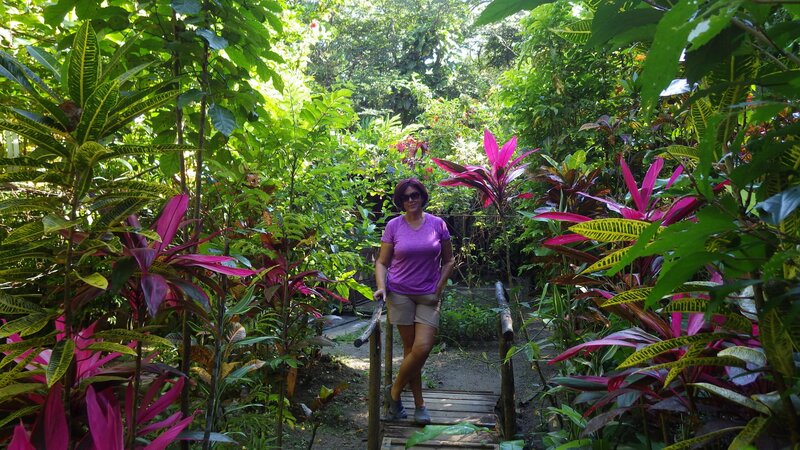 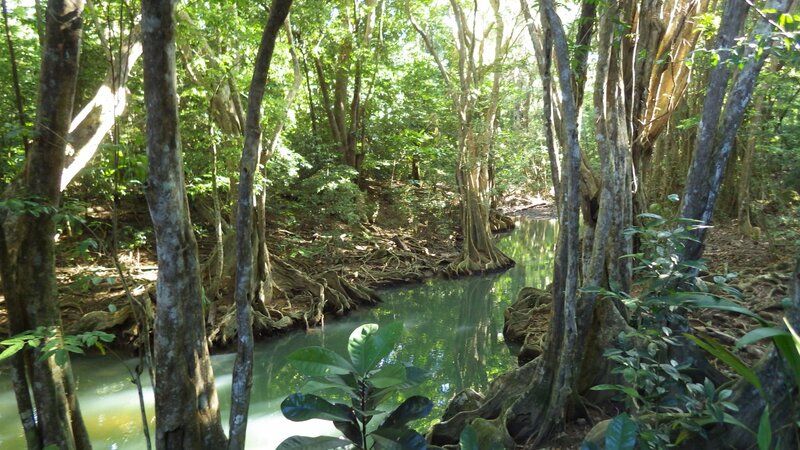 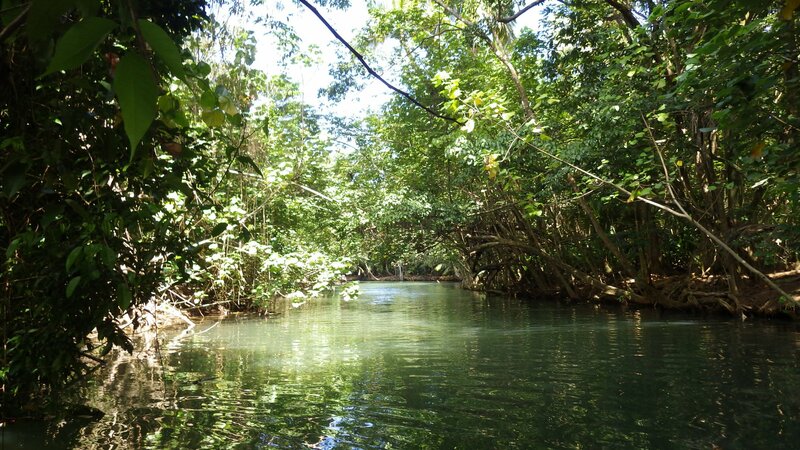 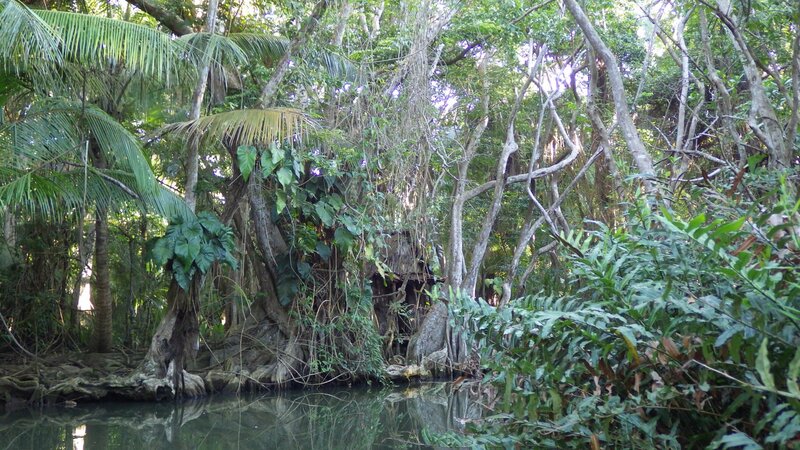 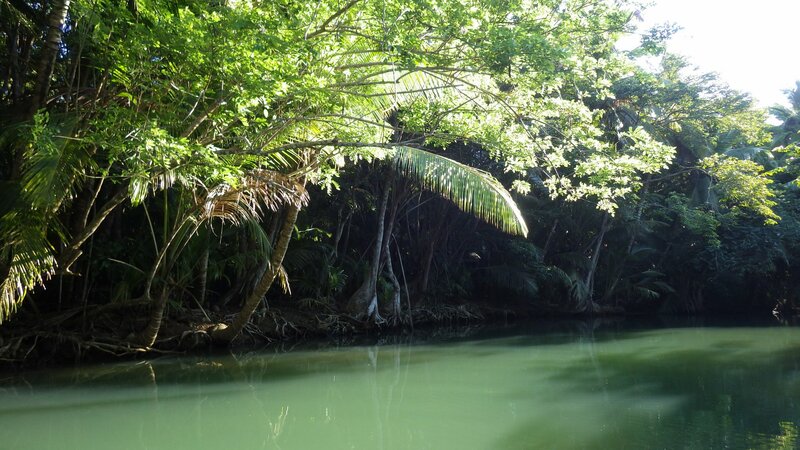 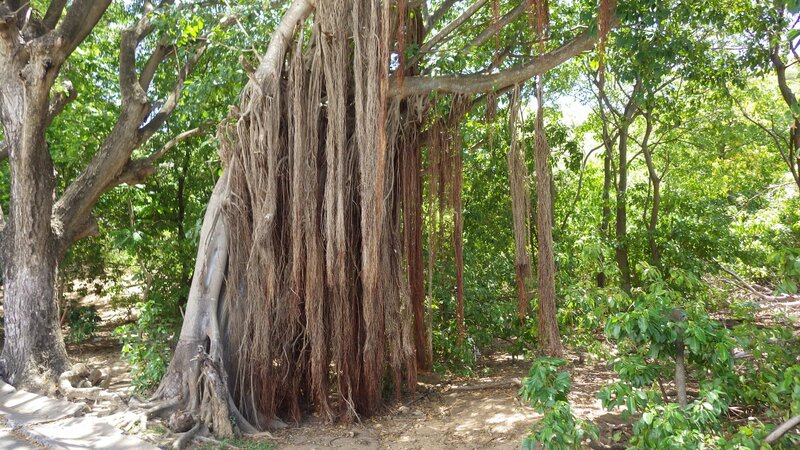 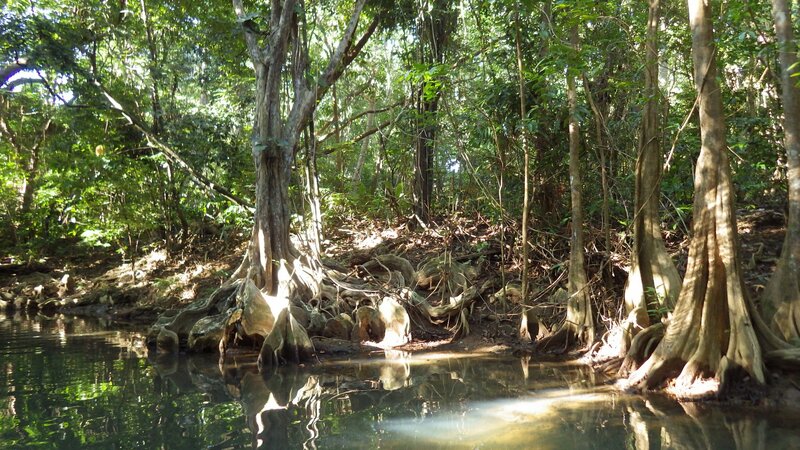 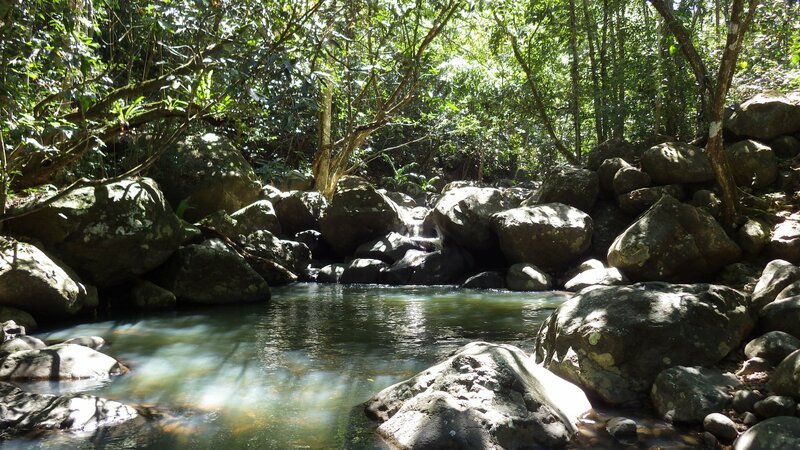 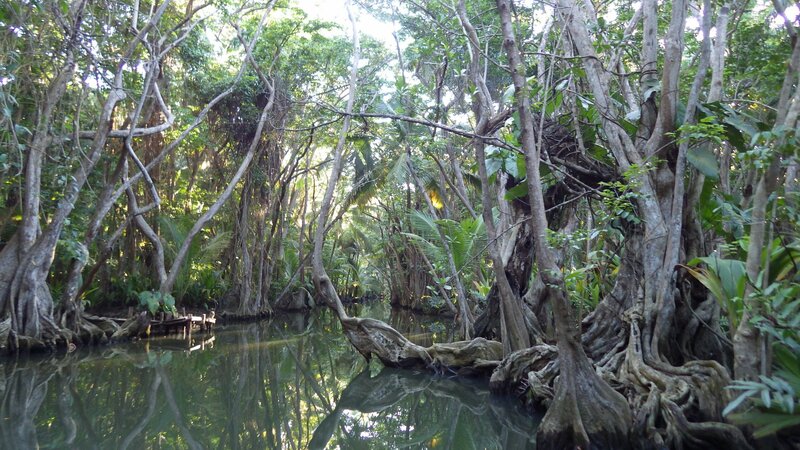 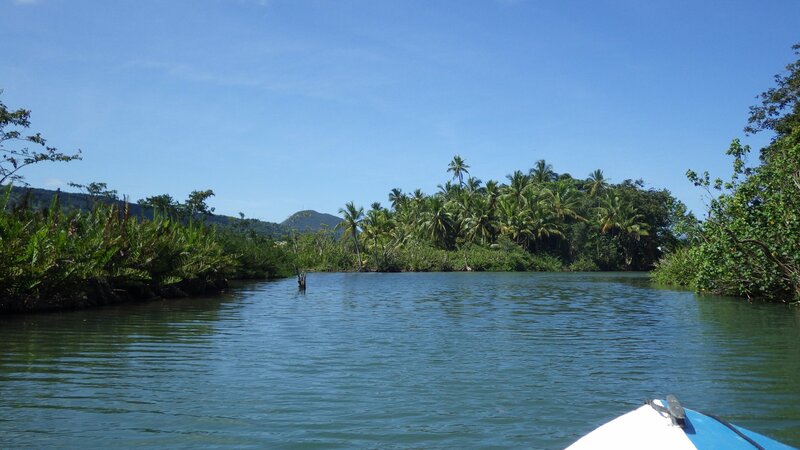 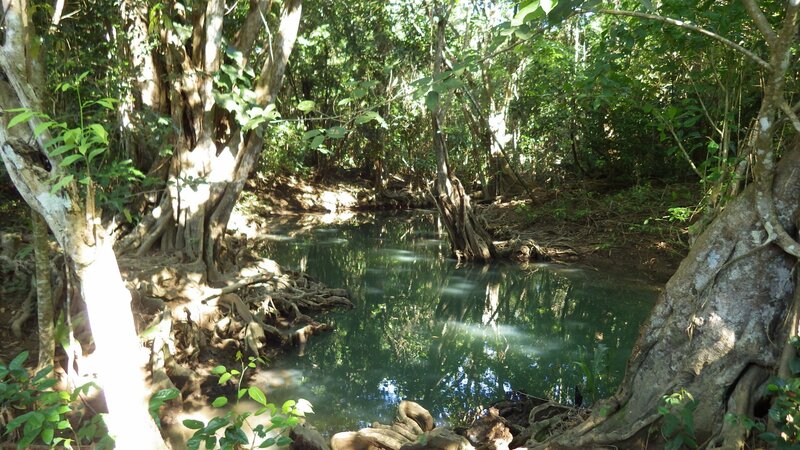 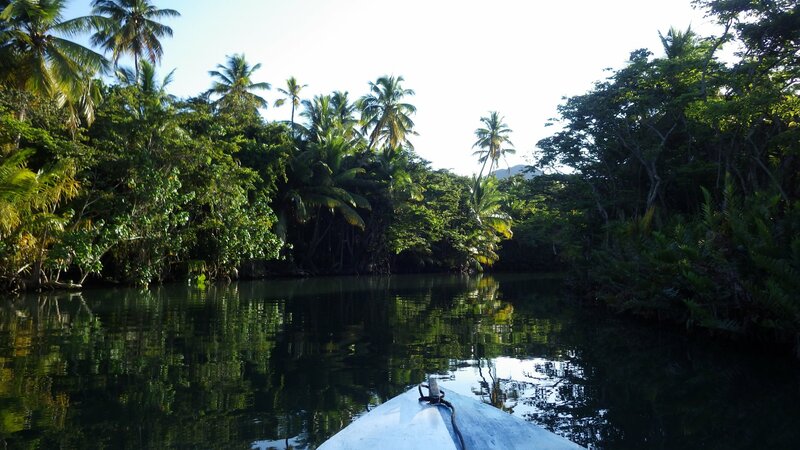 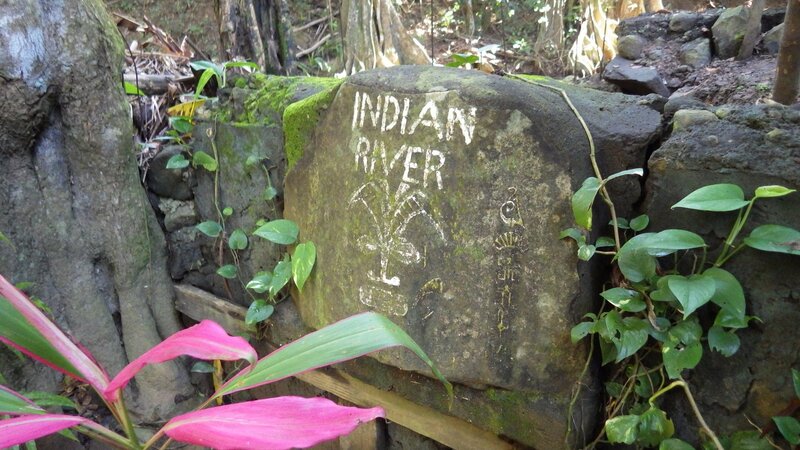 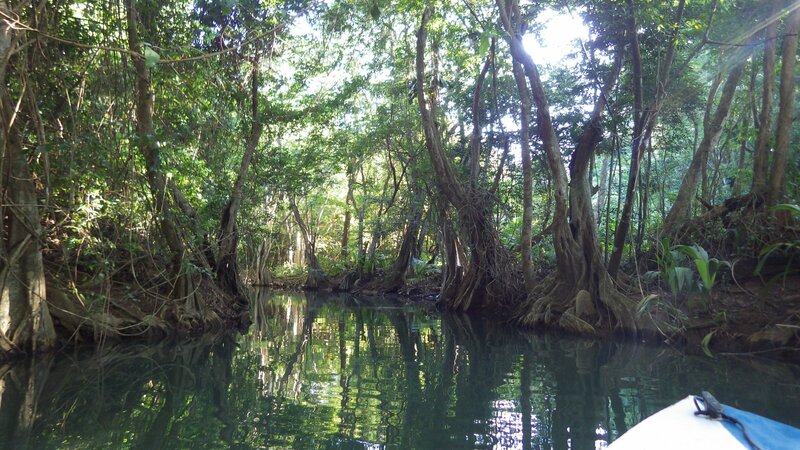 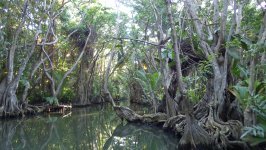 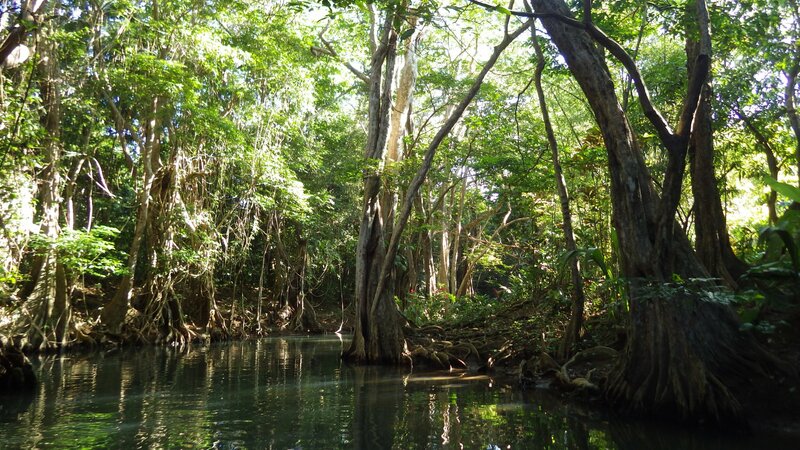 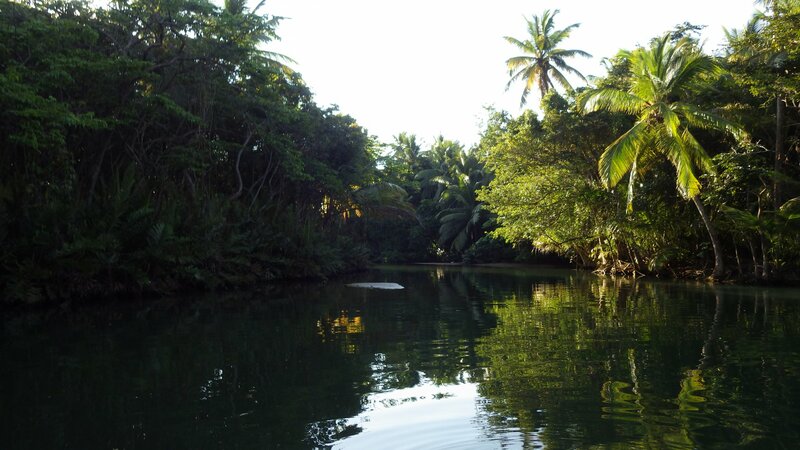 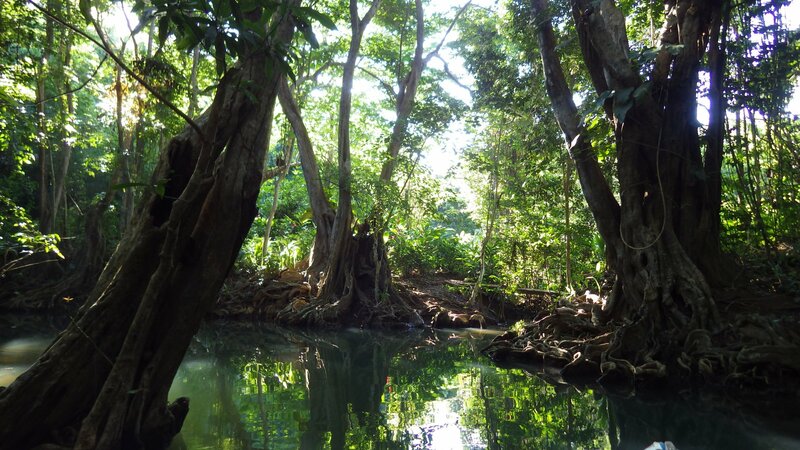 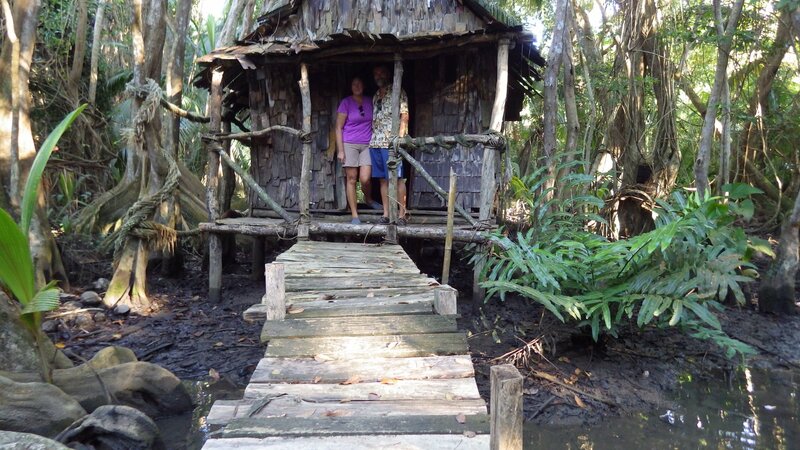 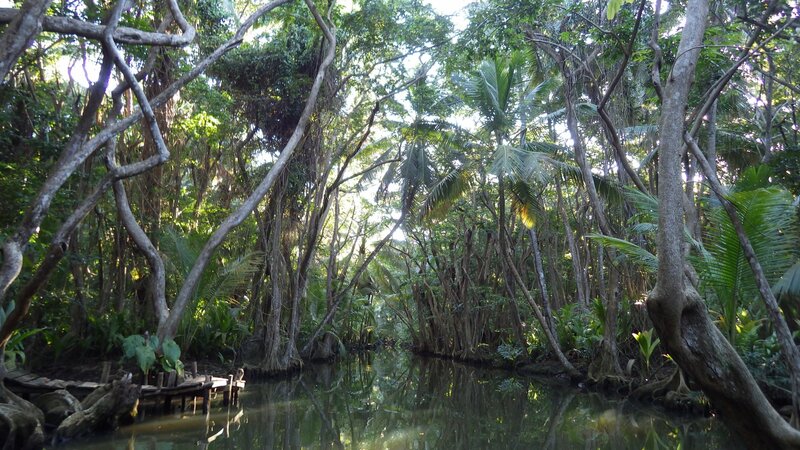 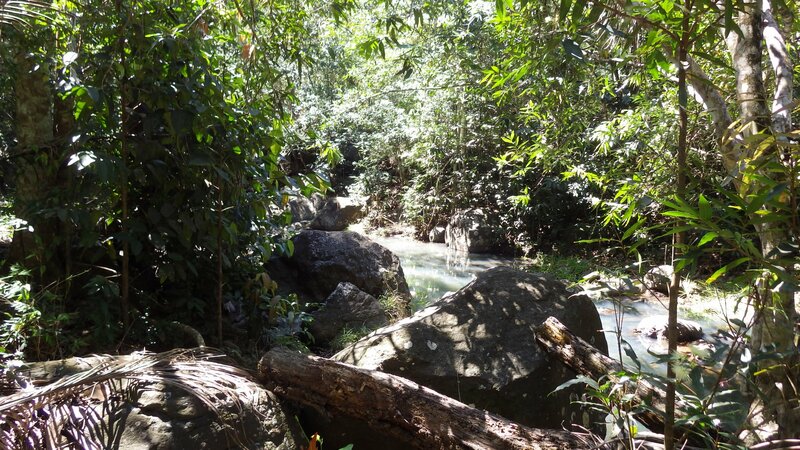 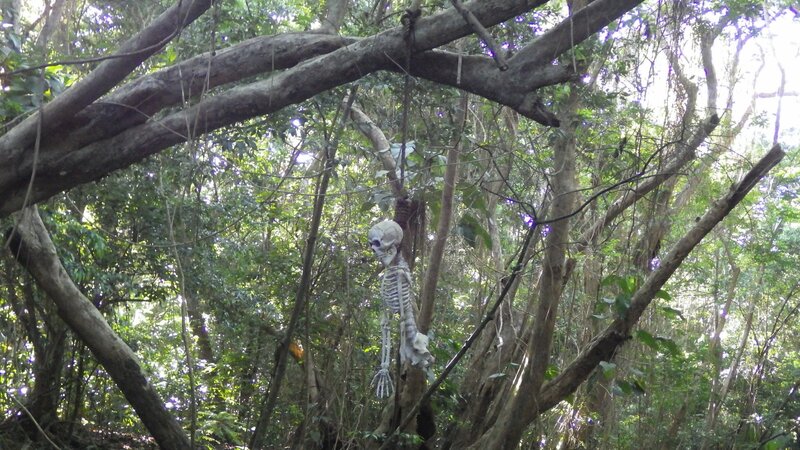 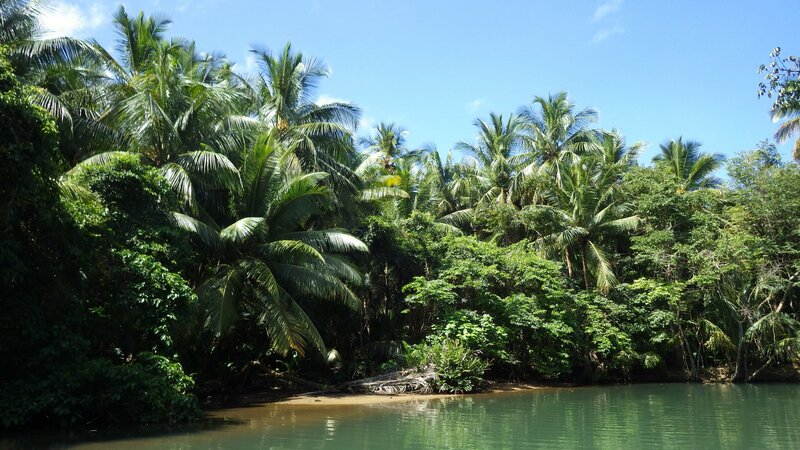 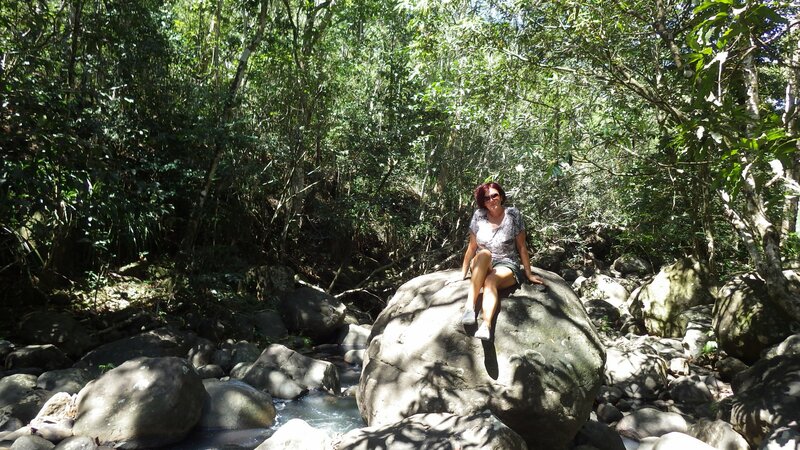 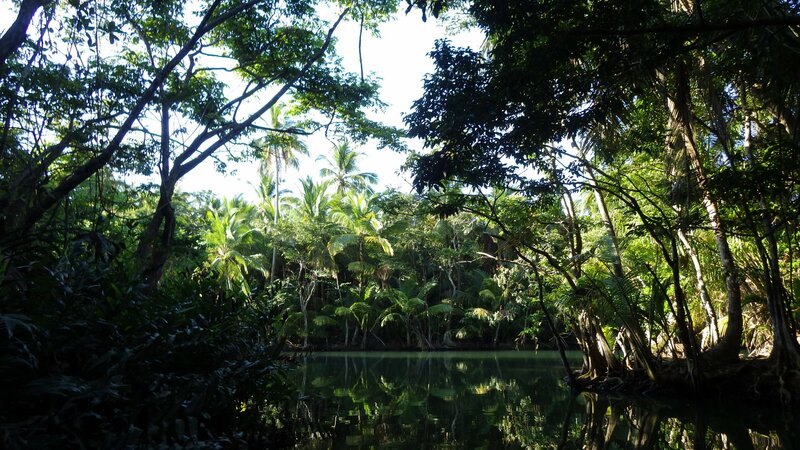 We did not go to the hot waterfalls, boiling lakes, craters and rainforest, but just to get a taste of the Dominica's nature, we took a guided tour into the Indian River. 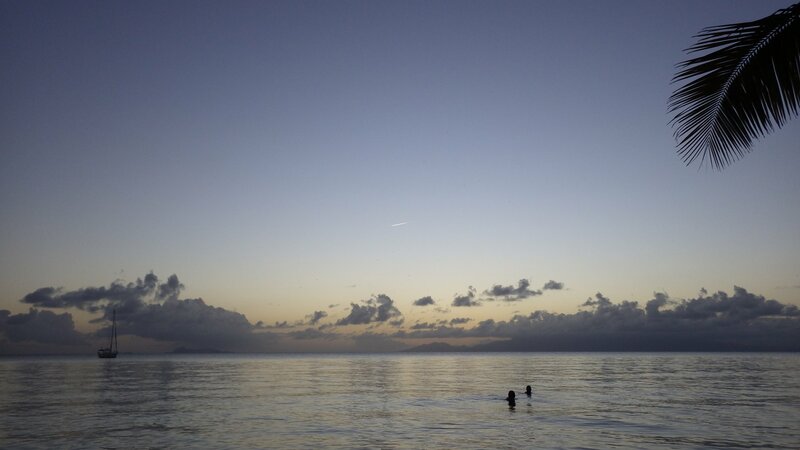 It was well worth it. 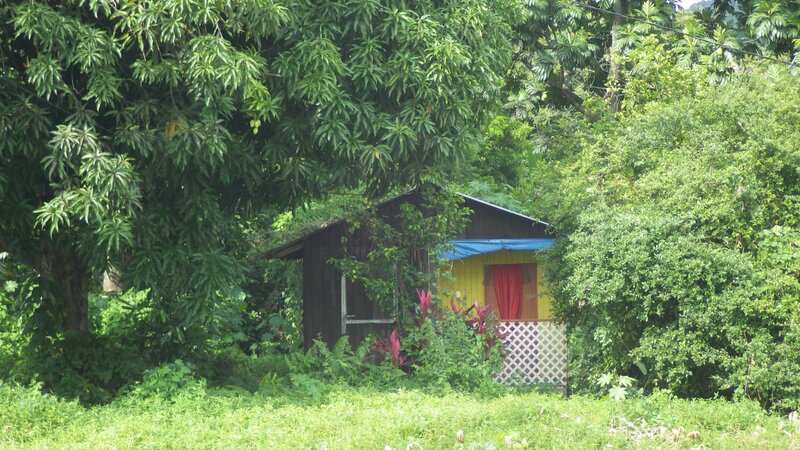 Pictures describe it better than I can write. 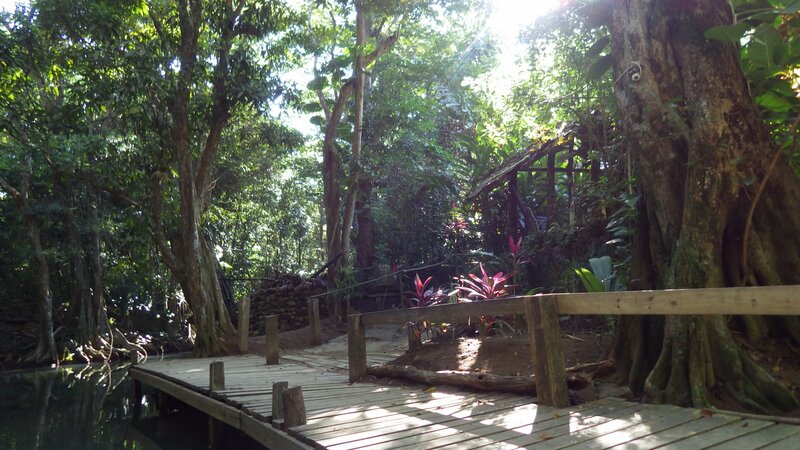 At the end of the river, there is a unique jungle bar were we really enjoyed its special rum punches. 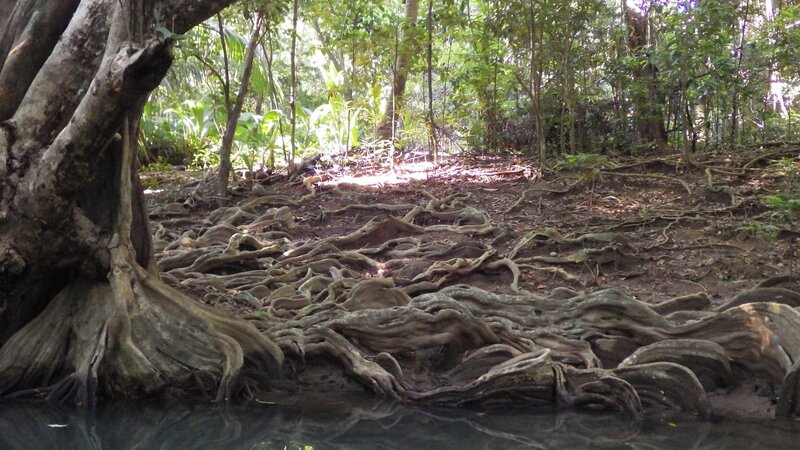 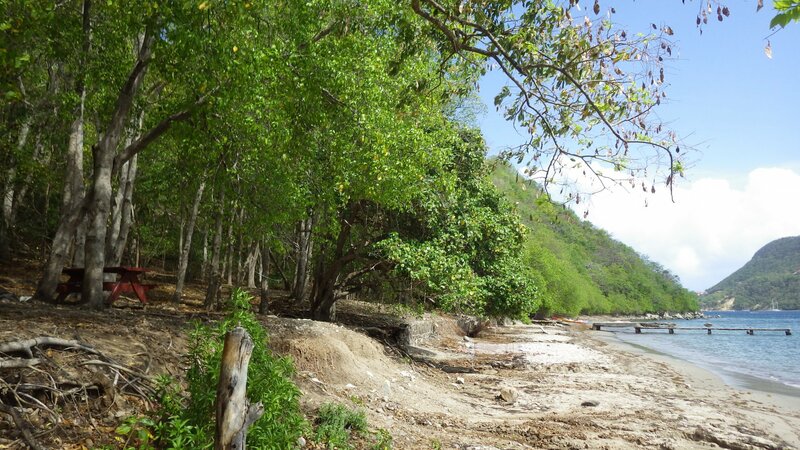 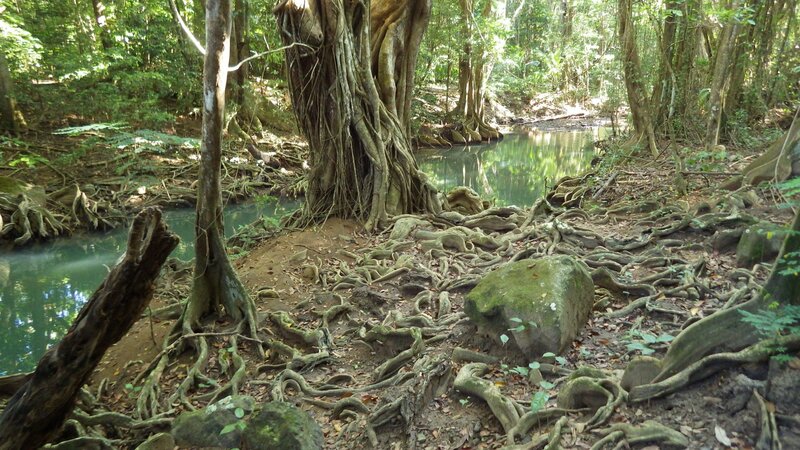 This river is the place where some scenes of the Pirates of the Caribbean movie were shot. 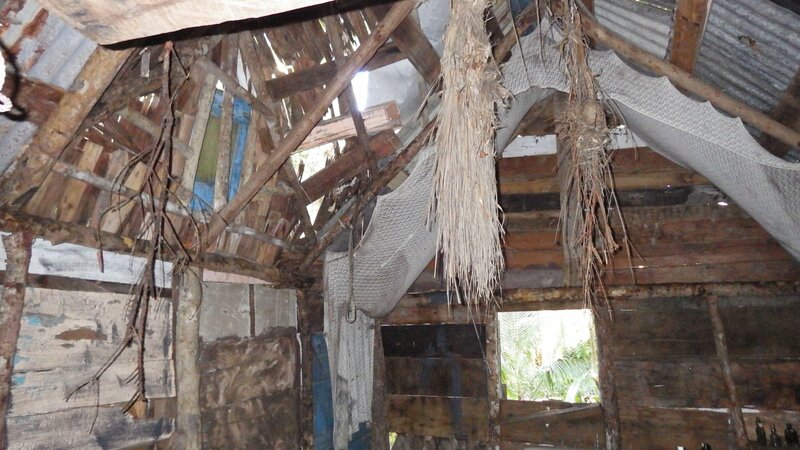 You may recognize the witch's hut and hanging skeleton. 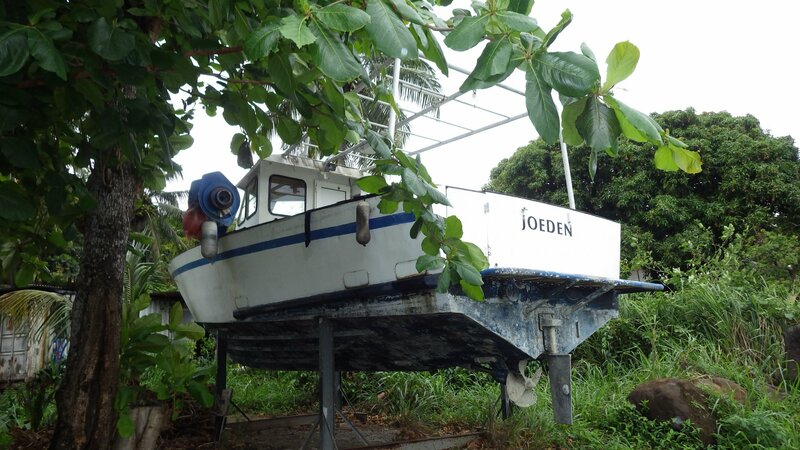 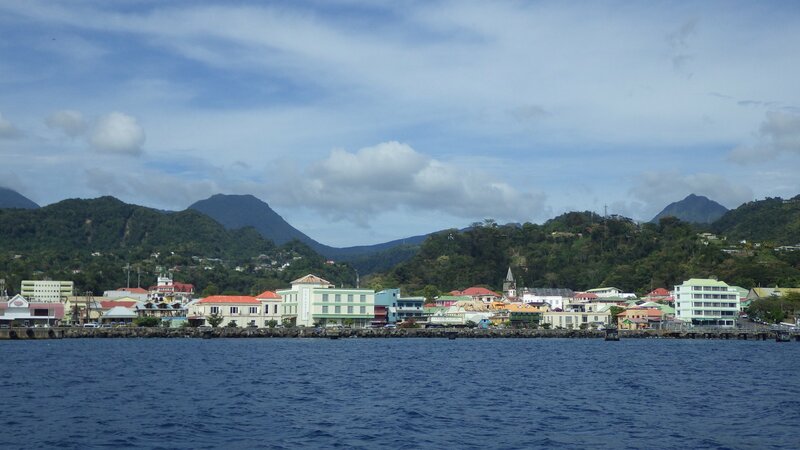 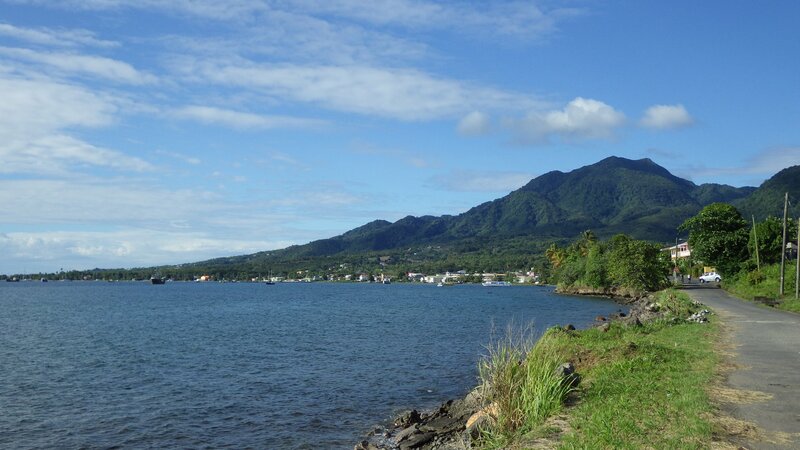 We came to Roseau mainly because it is the most southern place of Dominica when going further south, where you can anchor or moor. 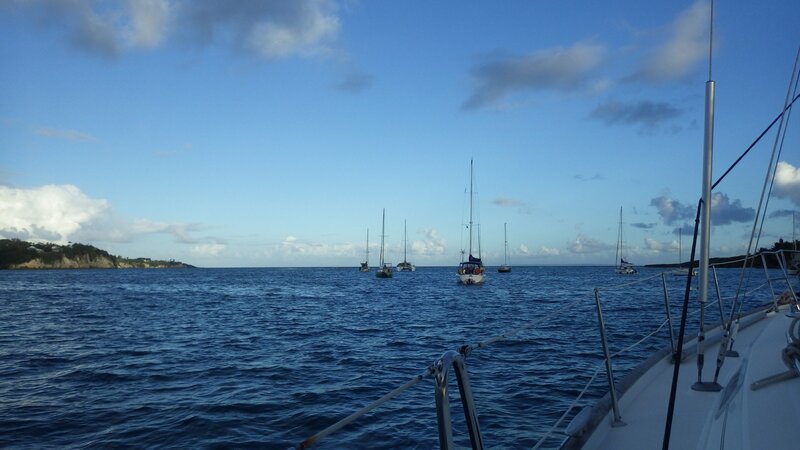 There is no suitable anchorage in the area - couple so-so spots were taken and we have to pay for the mooring couple miles south of town. 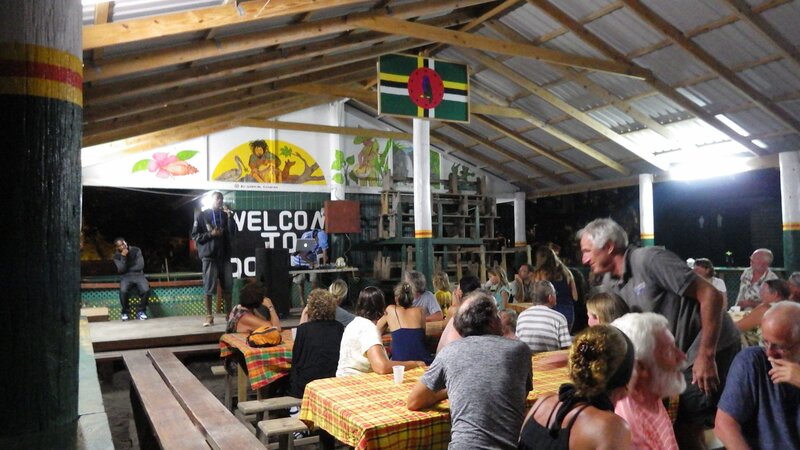 We had two very rolly nights. 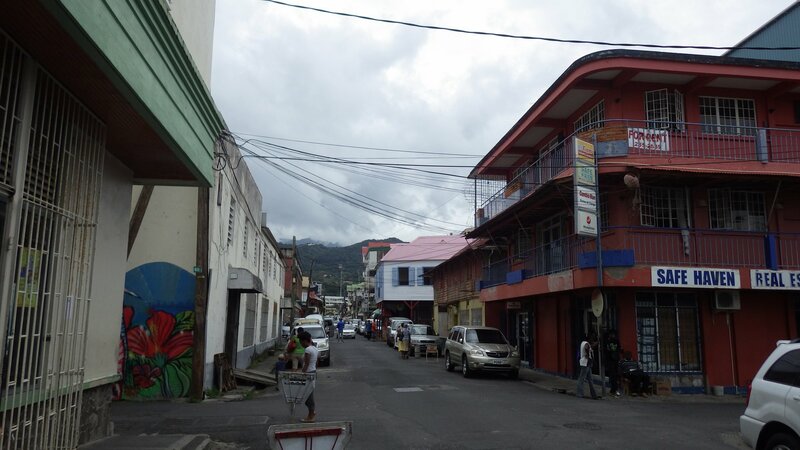 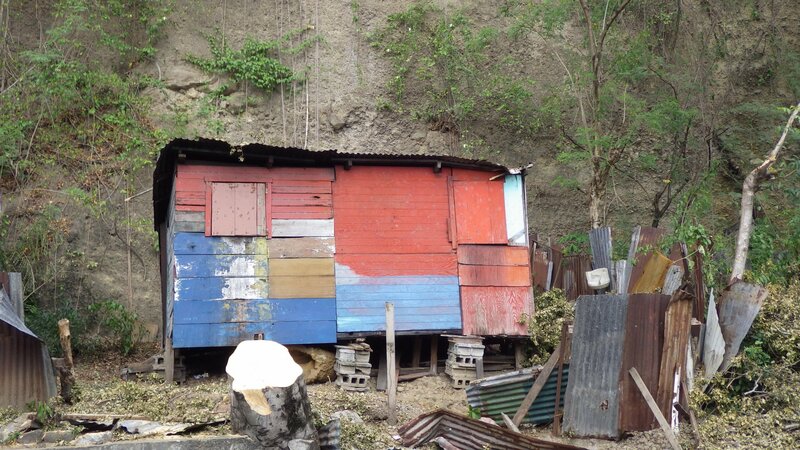 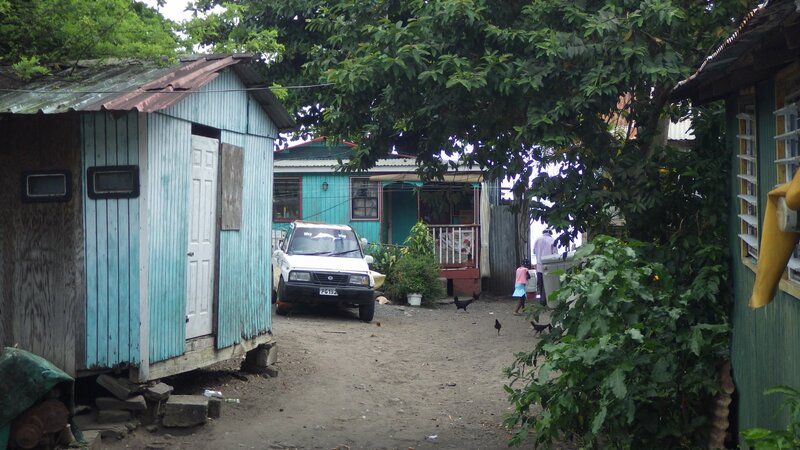 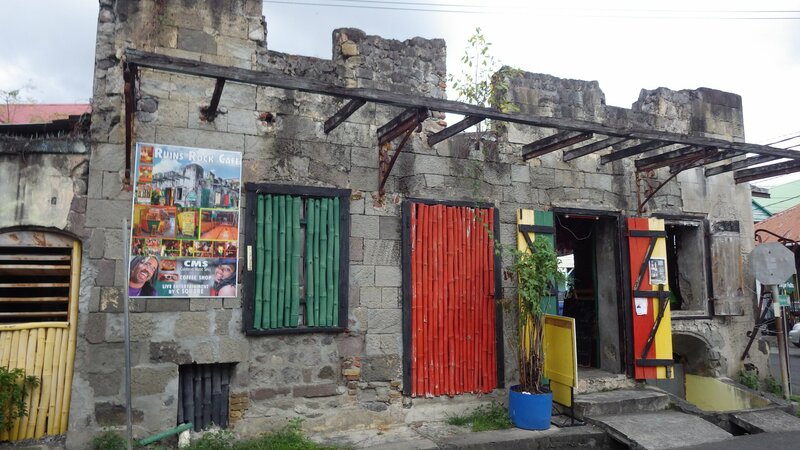 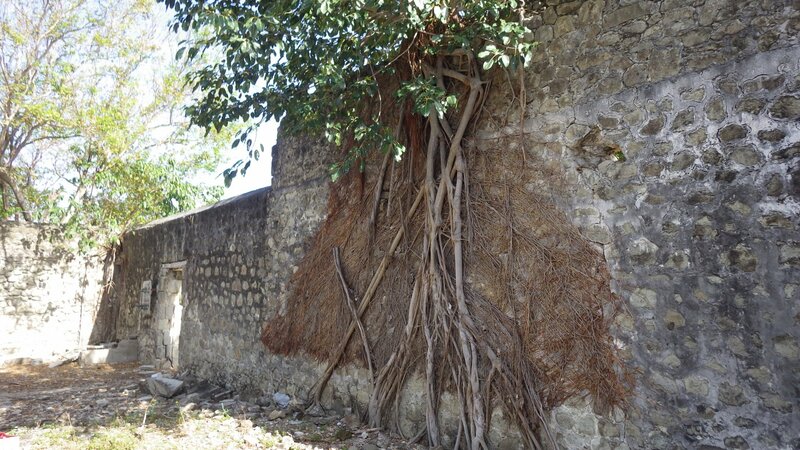 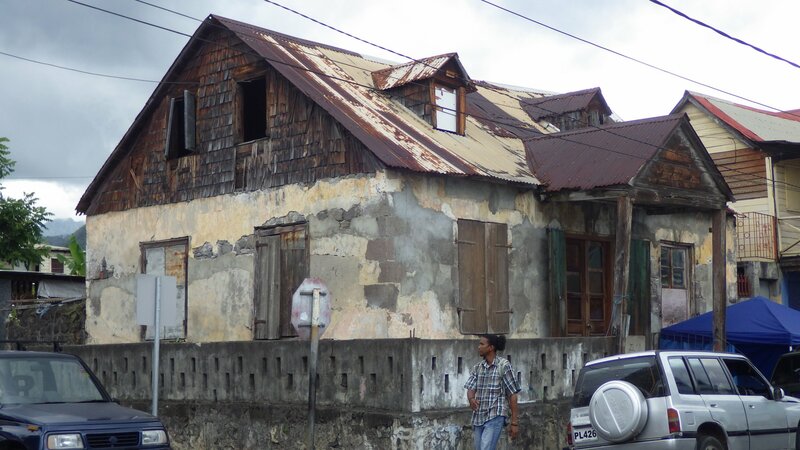 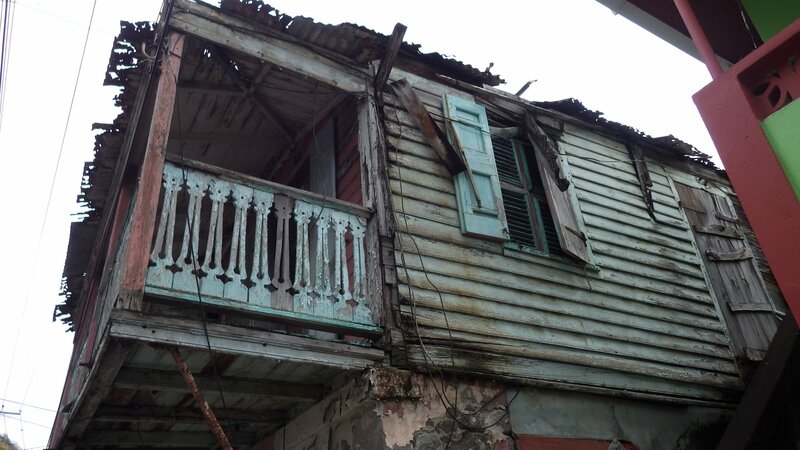 I cannot say we liked the town of Roseau � it seemed quite dilapidated and rough.